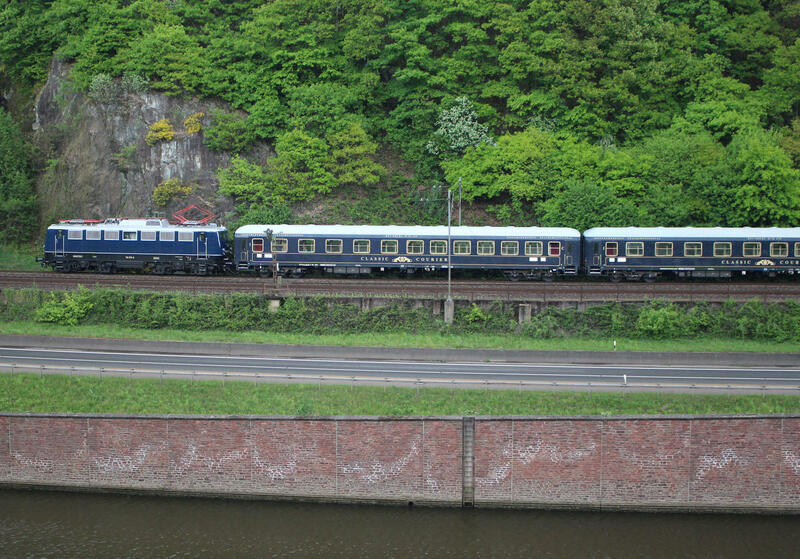 Our base for the Dampfspektakel in Trier gave us plenty of opportunity to take a look around the sights of the city, as well as some of the other sights easily reached by rail. 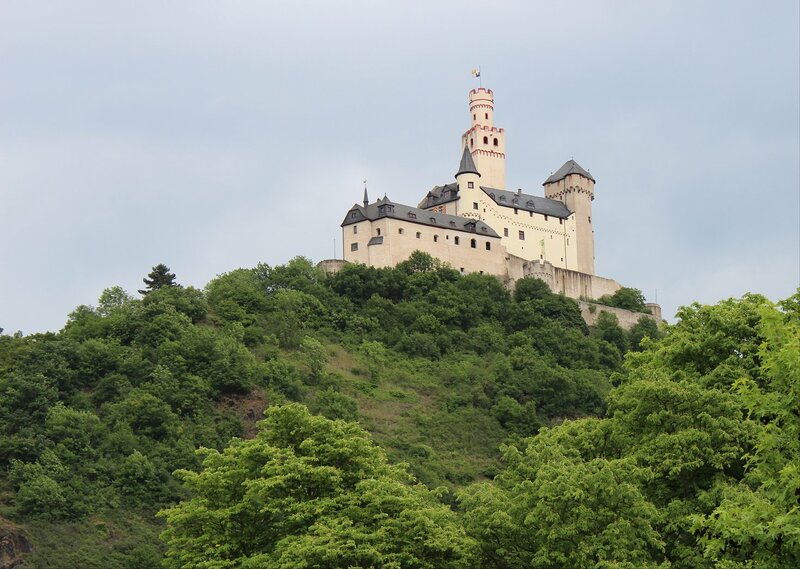 Our forays beyond Trier took us south to Saarburg, a fascinating town with an incredible waterfall at its centre, and east to Schloss Stolzenfels, near Koblenz. 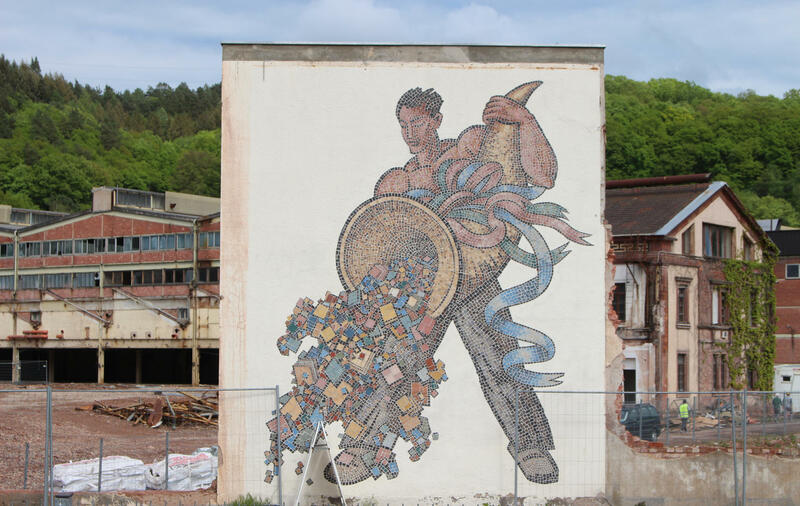 One of the most wonderful, but utterly random, finds was a mosaic standing in situ at a factory that was being demolished next to the station at Mettlach. 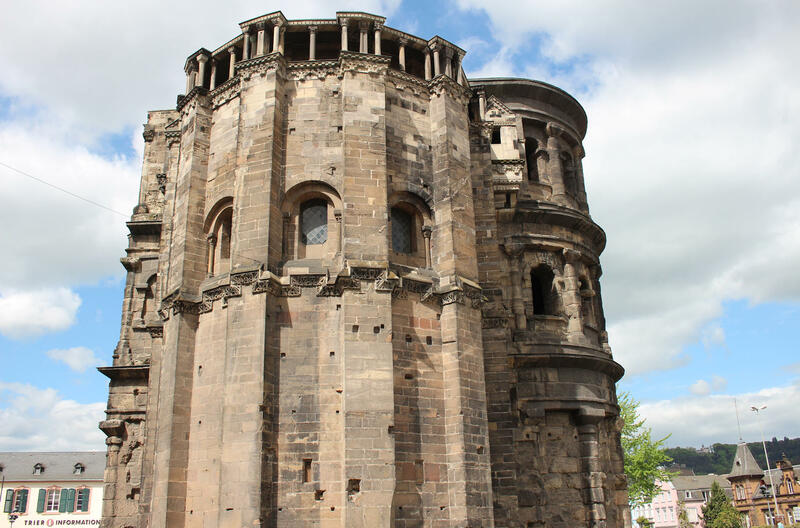 I thoroughly enjoyed my stay in Trier. 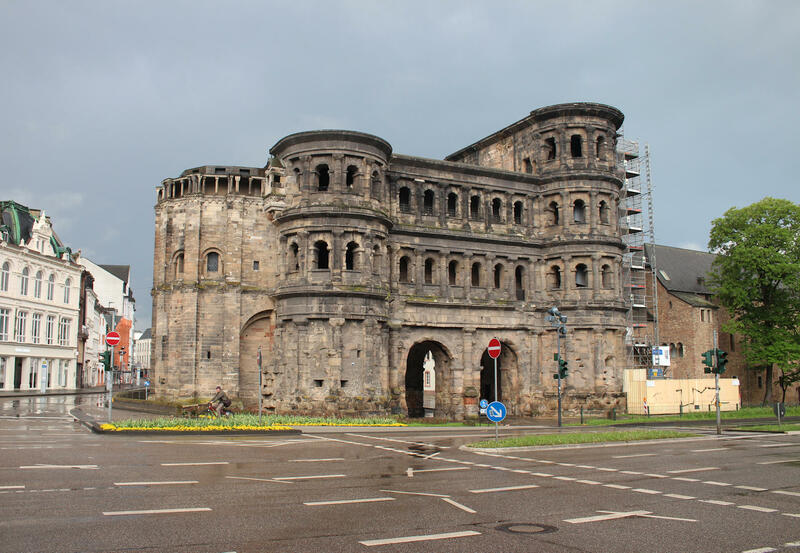 I have to admit that I knew absolutely nothing about the city before my visit and probably would never have made a visit were it not for the Dampfspektakel bringing me to this part of Germany. I would never have known how much I was missing. 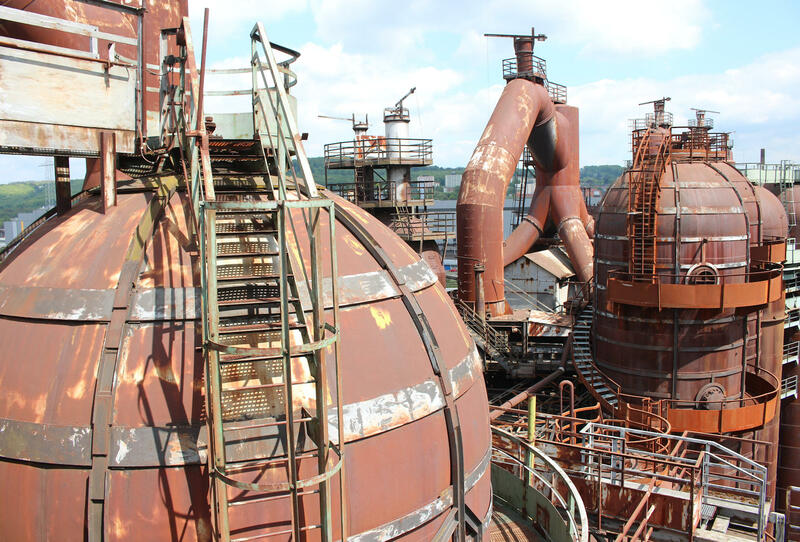 The town of Völklingen in Saarland is home to one of Europe’s most unusual tourist attractions – a preserved iron works which serves as an art gallery, museum and science centre. 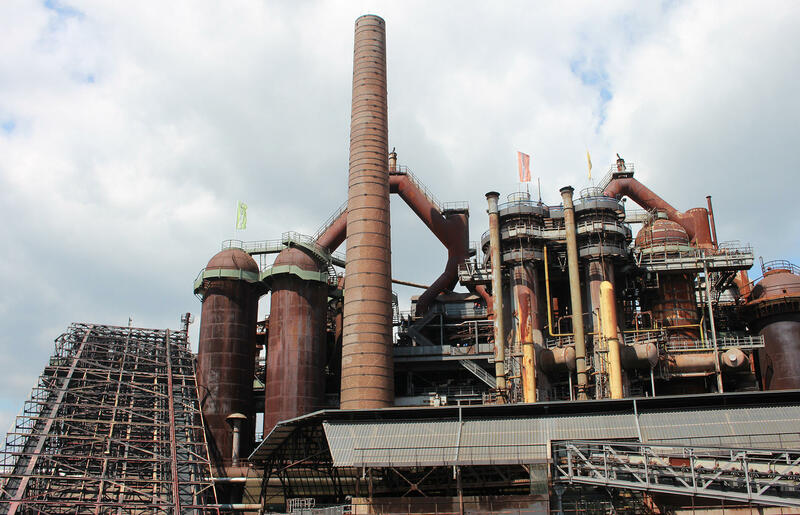 It’s an important historic monument, recognised as a UNESCO World Cultural Heritage site in 1994 on account of its being the only intact example of an integrated ironworks in Europe and North America and the place where many technological innovations were first developed. 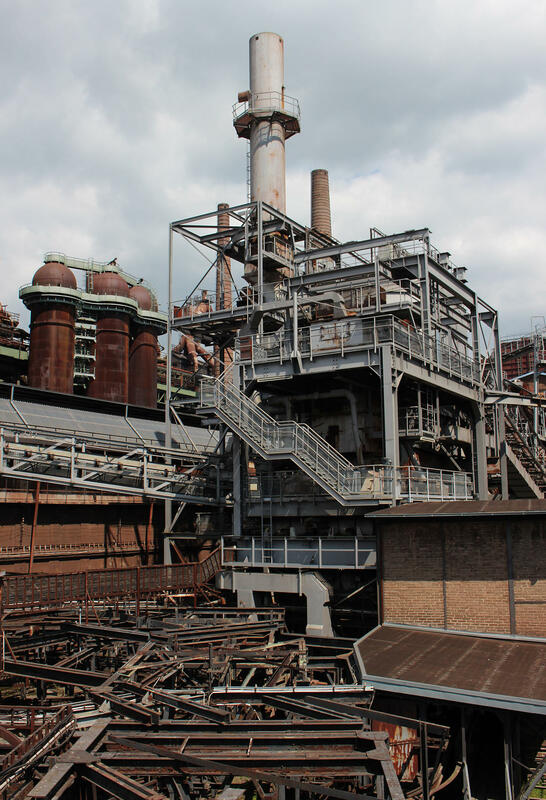 The origins of the complex can be traced back to the establishment of the first ironworks in 1873, though it was the entrepreneurial spirit and improvements introduced by the Röchling family from the 1880s that really established the long term success of the operation. 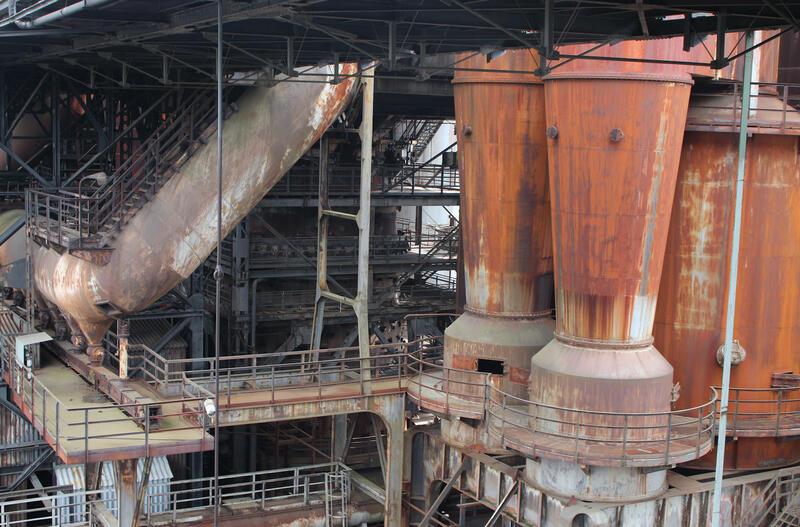 Remarkably, enough remains from each stage of the site’s development to present a physical chronology of the evolution of pig-iron production. 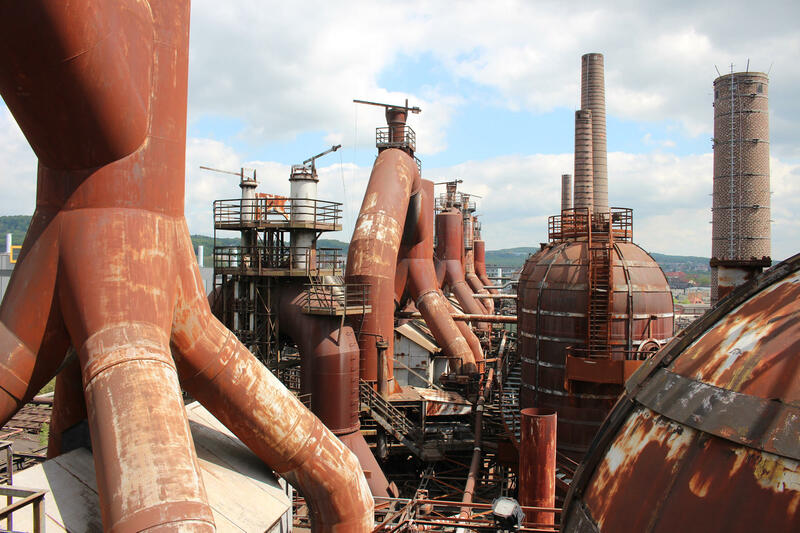 The site has been left as it appeared in 1986, when the blast furnaces were shut down, though the overall appearance is of an ironworks of the 1930s. 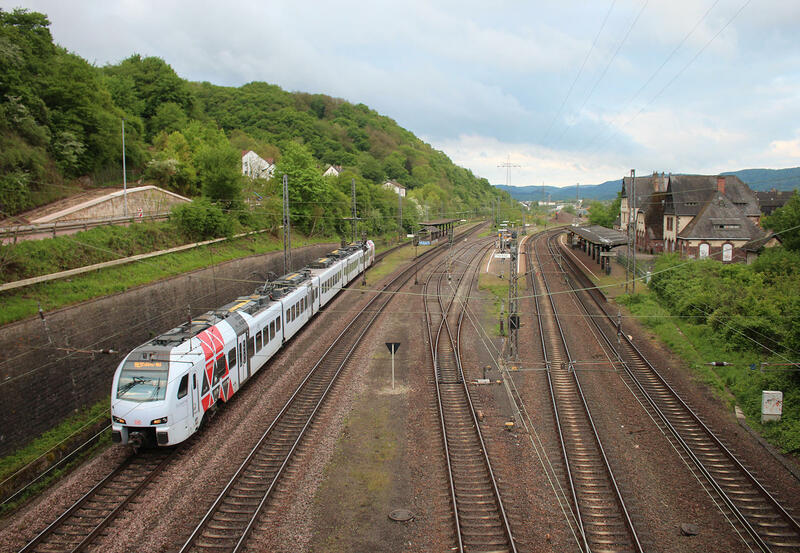 The complex is easily reached by public transport from Trier with regional express trains taking around an hour to make the journey south and local services taking an extra twenty minutes on top of that. 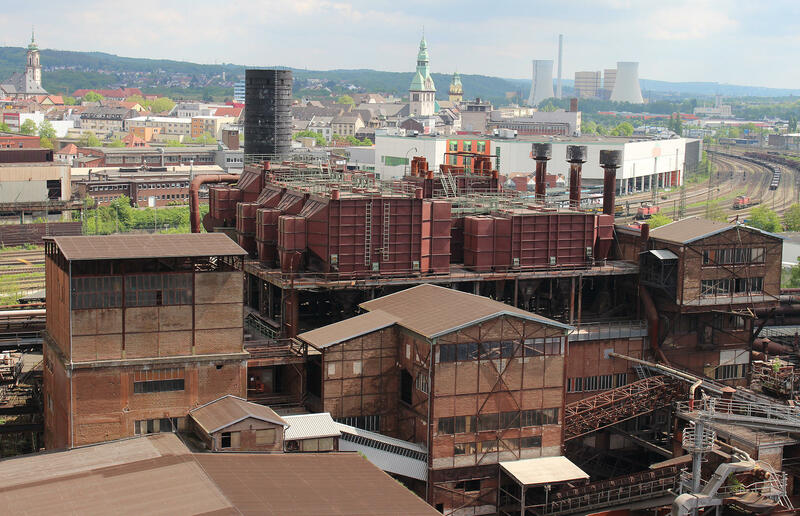 I caught my first sight of the iron works from the platform and marveled at the monstrous tangle of chimneys, pipes and blast furnaces that filled the skyline. 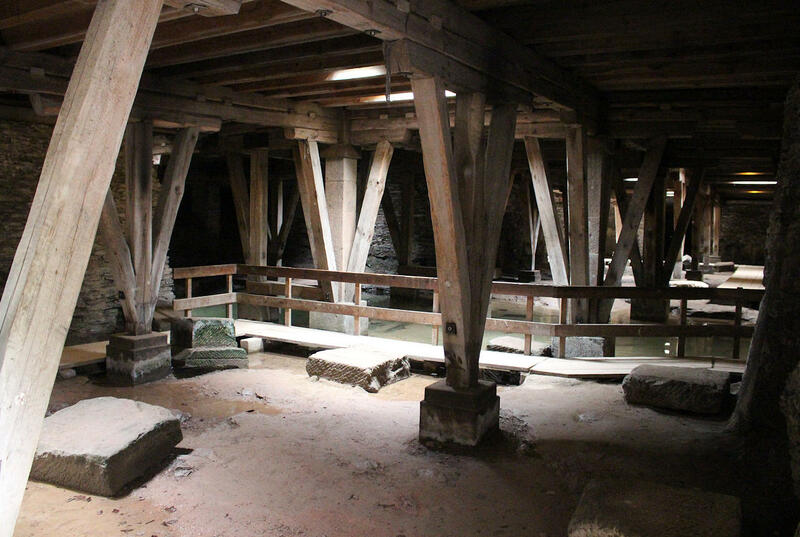 The photographs I had seen really did not do justice to the scale of the place and made it even harder to fathom how anyone could have had the foresight to preserve the entire complex, let alone open it up to visitors! 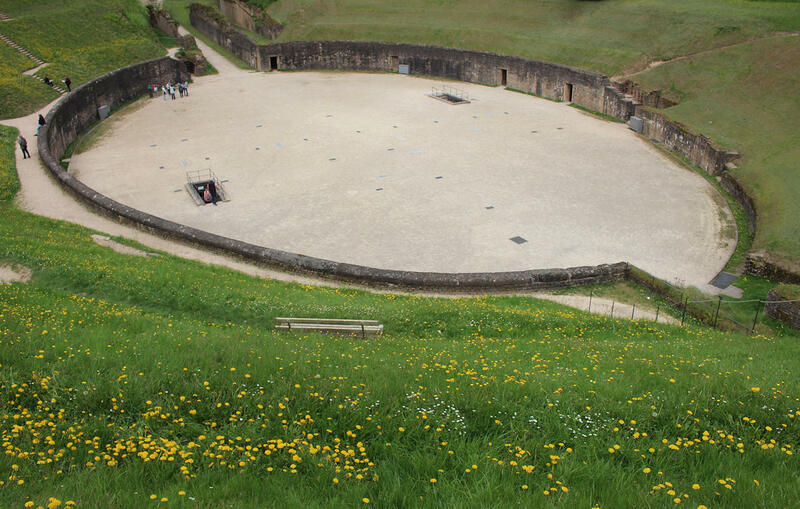 The extent of the visitor route through the site is really impressive – it’s a good 7km from start to finish. 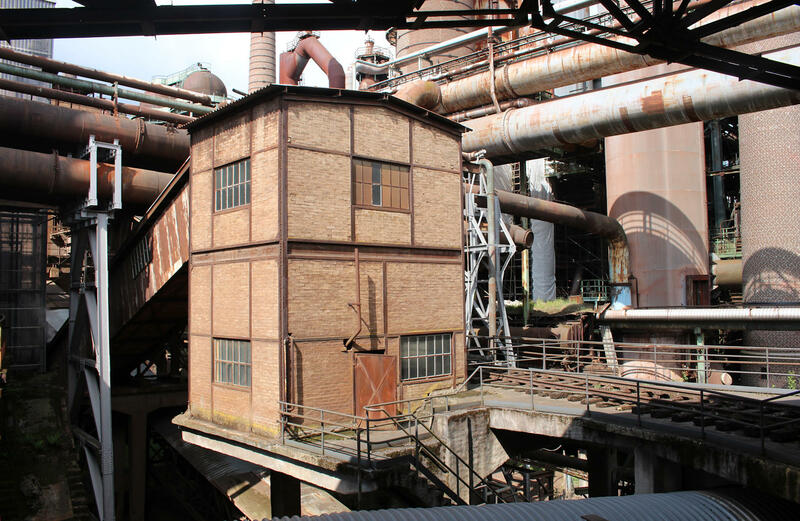 Along the way this takes you 27 metres above group to a 200m long platform where monorail cars once ran along the platform to supply the six blast furnaces with raw materials (each monorail car held approximately one tonne of coke or two and half tonnes of ore, sinter or scrap, operating at a speed of 3mph on the flat). 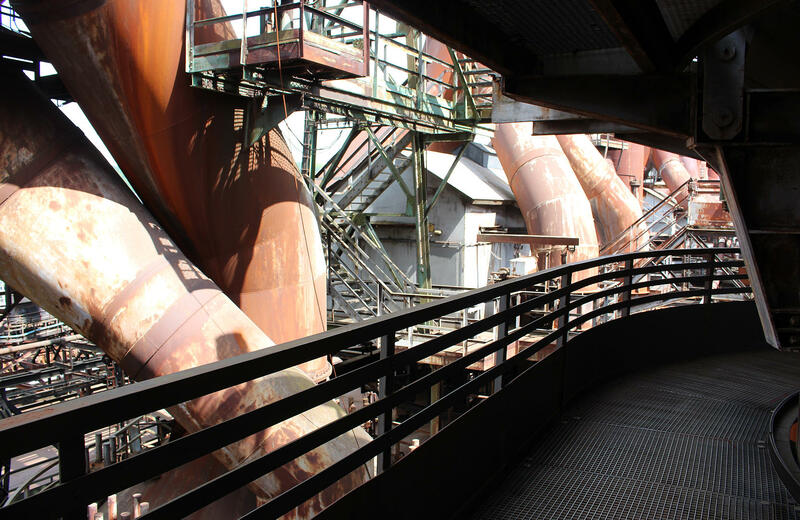 To reach the platform involved climbing plenty of metal staircases, wearing hard-hats, but the effort is amply rewarded. 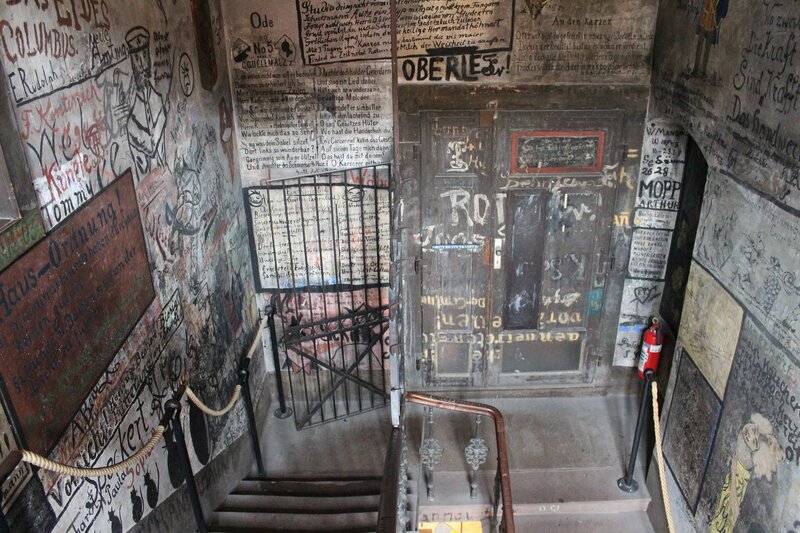 Once we had climbed the heights we headed back down to ground level and on to ‘The paradise‘. 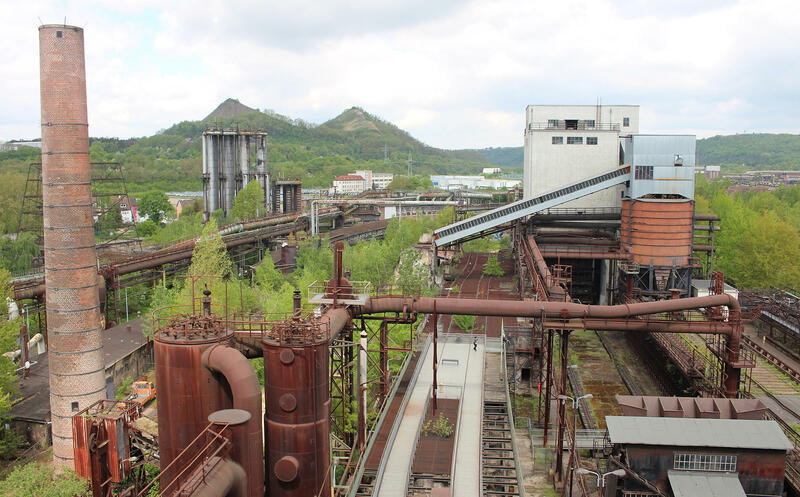 As you might already have guessed, the name plays on the hellish nature of the coking plant in its active life and the wildlife that has taken over since then. 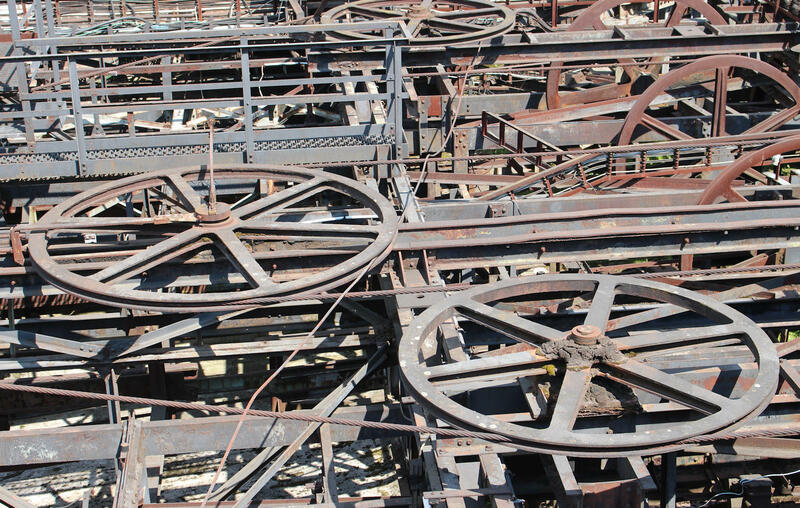 A leisurely walk around the well signposted 1000m trail provides some interesting views of nature’s battle with the ironworks, as well as the gigantic machinery and narrow gauge locomotives that once kept everything moving in and out of the site. 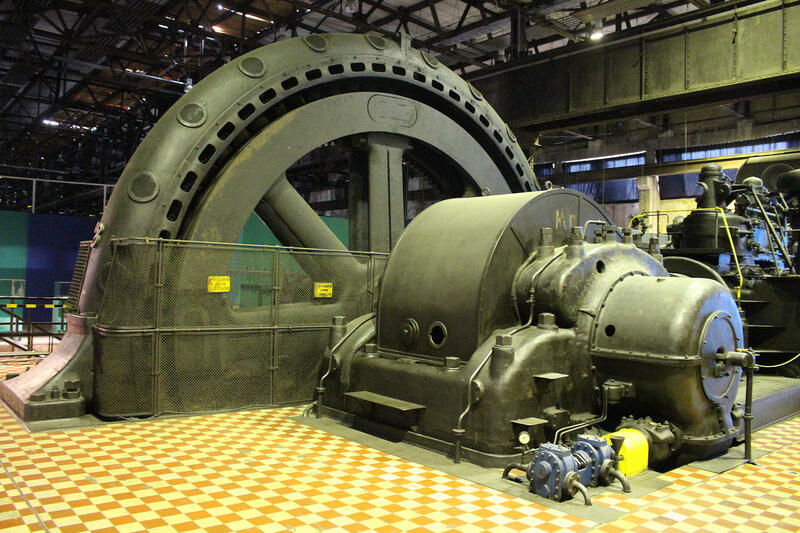 Once we had completed the circuit we returned to the starting point, in the blower hall, admiring the enormous wheel shaped blowers. 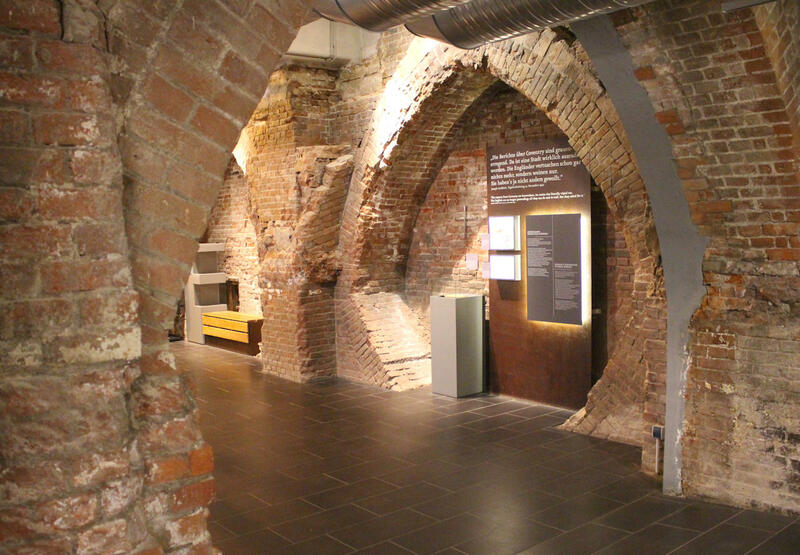 Some of the most poignant exhibits were the smallest and most human items displayed – such as the wooden shelter that the workers built to protect themselves from the dust in the sintering plant and the paper file recording the prisoners forced to work at the plant during the second world war. 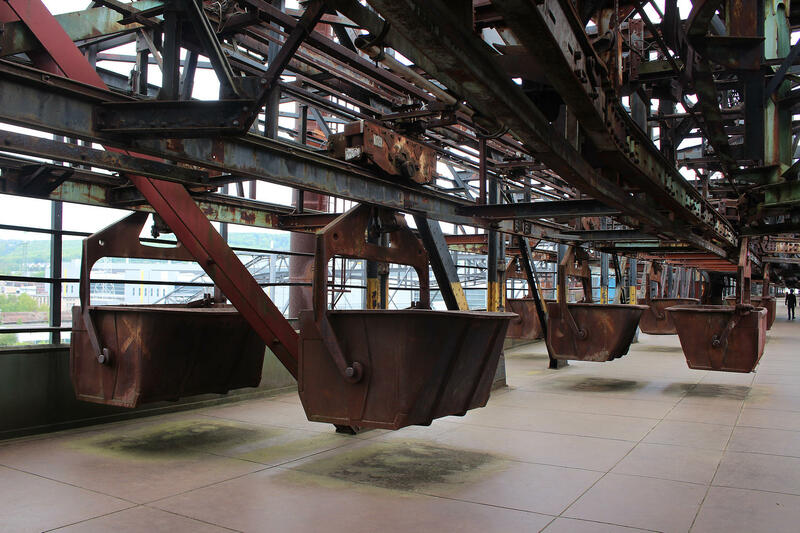 The terrible human cost was highlighted in one of the museum displays – of the 12,276 foreign workers who worked at the Rochling iron works between 1942 and 1944 around 250 died. Forty five were infants that had been born at Völklingen. Overall, the time we spent exploring the site (following the route marked on the handy map they provided) were some of the most rewarding I have spent in any museum. It was an absolute dream for industrial photography and took us a good three hours to explore, despite visiting in between exhibitions in the main space (during our visit we got to see a gallery of photographs from Banksy’s dismaland project and an exhibition of Ottmar Hörl’s mini worker sculptures distributeds across the site, but the next big exhibition about Queen Elizabeth II was not due to open until 19th May 2018). 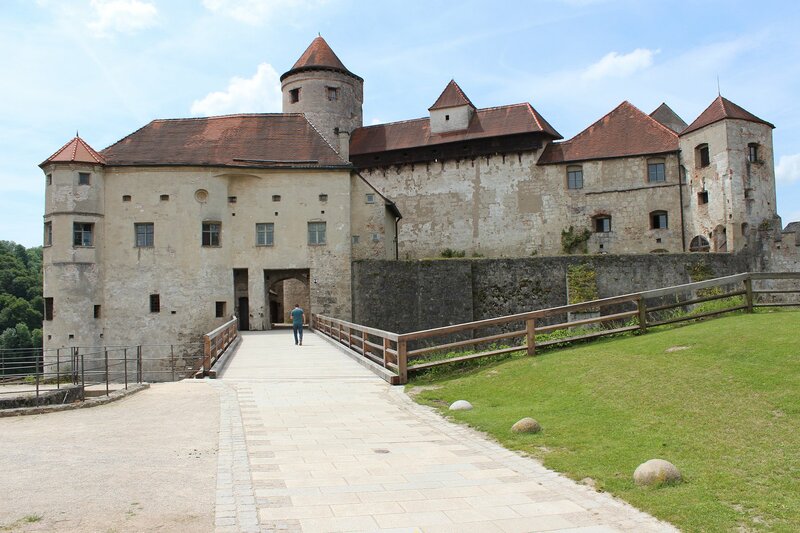 At the time of our visit entry cost 17 euros per person, including all the exhibitions on offer. 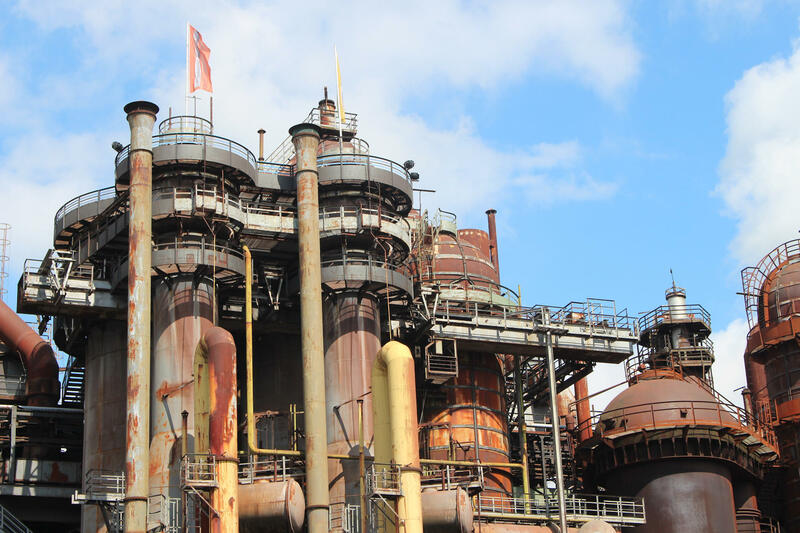 I kept having to pinch myself at the freedom on offer here – I can’t believe that we would ever have opened anything like this in the UK with our very cautious culture of health and safety! 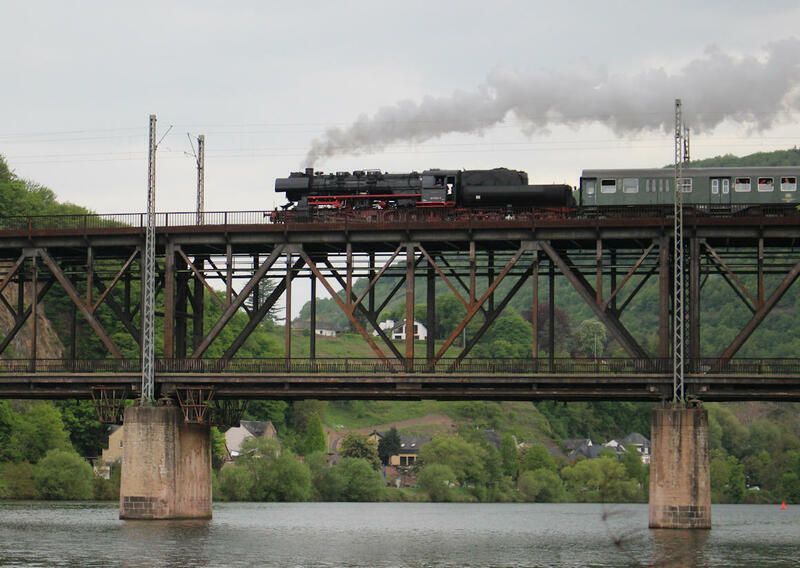 Over the course of four days, between Saturday 28th April and Tuesday 1st May 2018, nine steam locomotives (along with historic electric and diesel locomotives) hauled more than 100 special services over a distance of 8,400 kilometres around Rheinland-Pfalz and into Luxembourg for ‘Dampfspektakel 2018’. 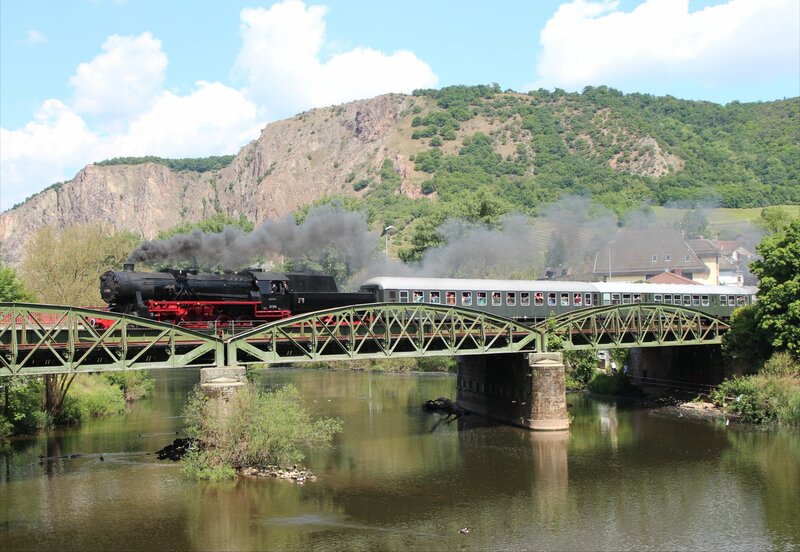 The event, organised by the federal state and its two regional railway operators, more than lived up to its billing as a spectacle. 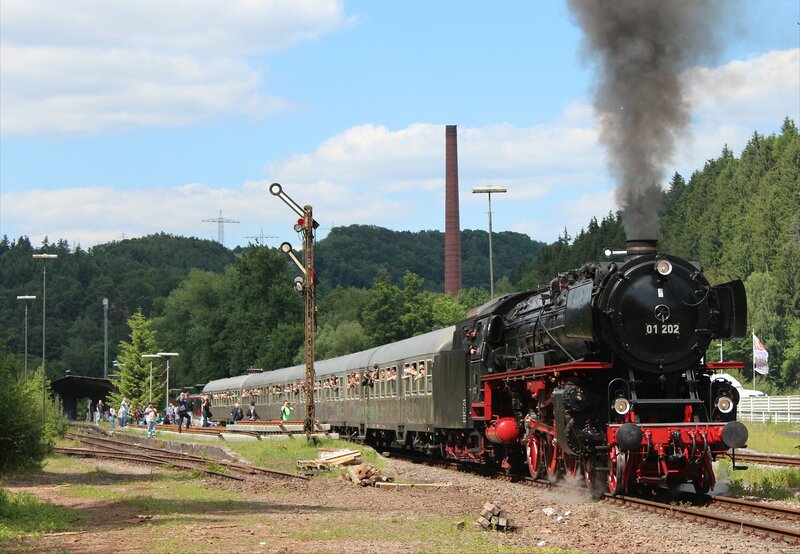 It was a joy to stand on the platforms at Trier Hauptbahnhof and see steam locomotives moving in all directions before getting anywhere near the more scenic stretches of line! An event of this scale, with all the challenges and liabilities involved, could only take place with the patronage of regional government. I am very thankful that they continue to offer such events to help draw in tourists and promote the wonderful sights in their region. 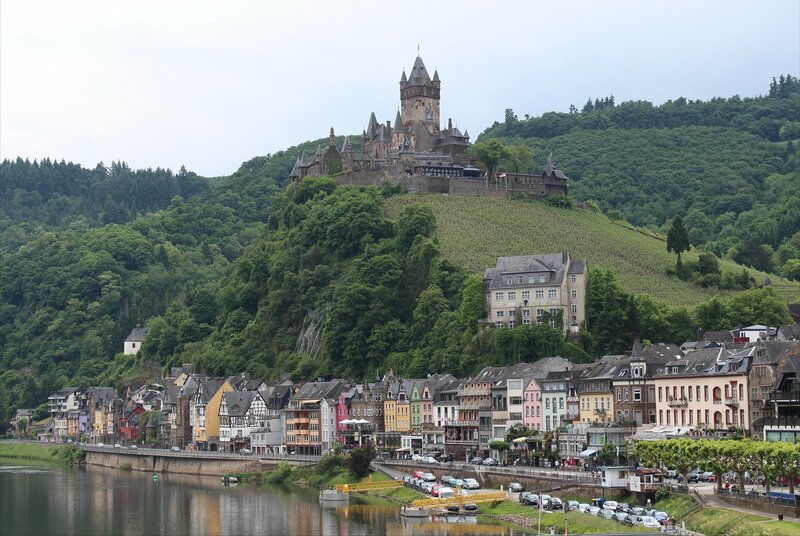 It certainly succeeded on that front as far as I was concerned, introducing me to some lovely restaurants and remarkable sights during a stay in the area. 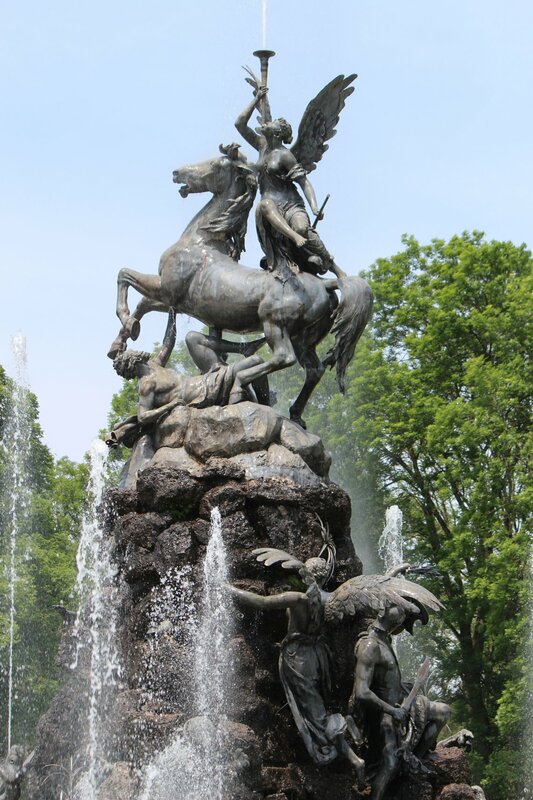 Unlike the two similar events I attended, in 2009 and 2014, I attempted to come up with a blend of spectacle and sightseeing that would keep my better half happy. 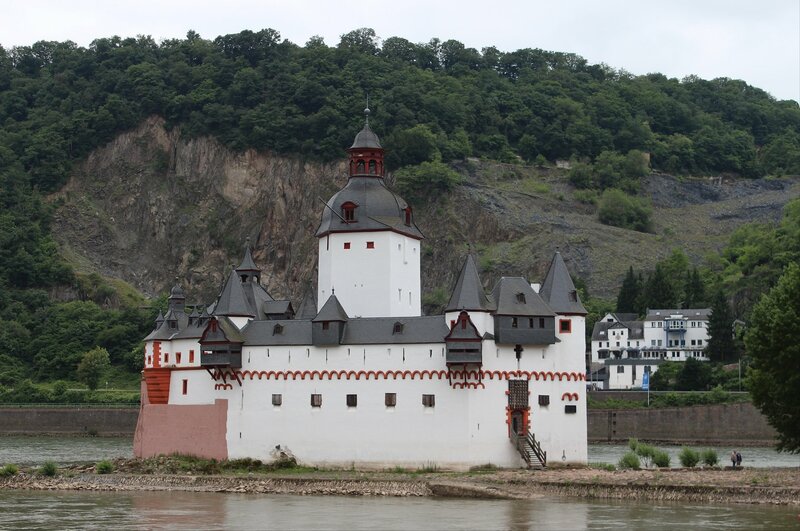 The result was a terrific trip, taking in some well chosen photospots, but also impressive sights such as iron works at Völklingen, the roman remains of Trier and Stolzenfels Castle near Koblenz. 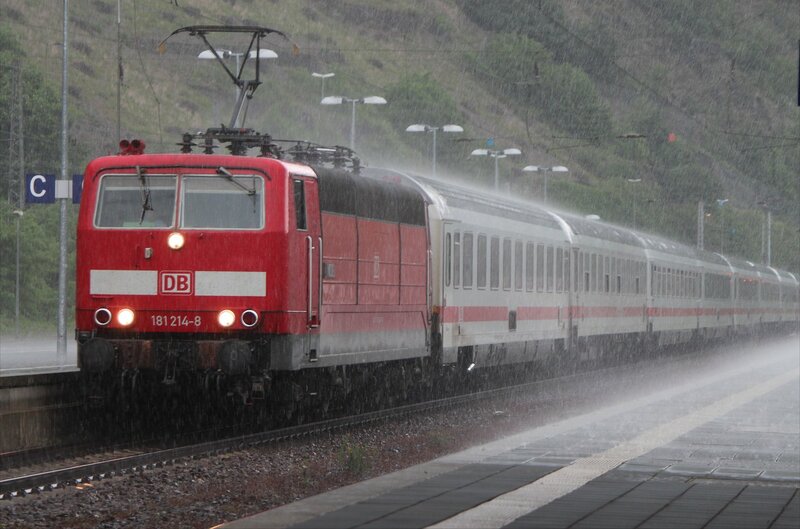 A few early starts were planned but ditched following forecasts for some particularly wet mornings. 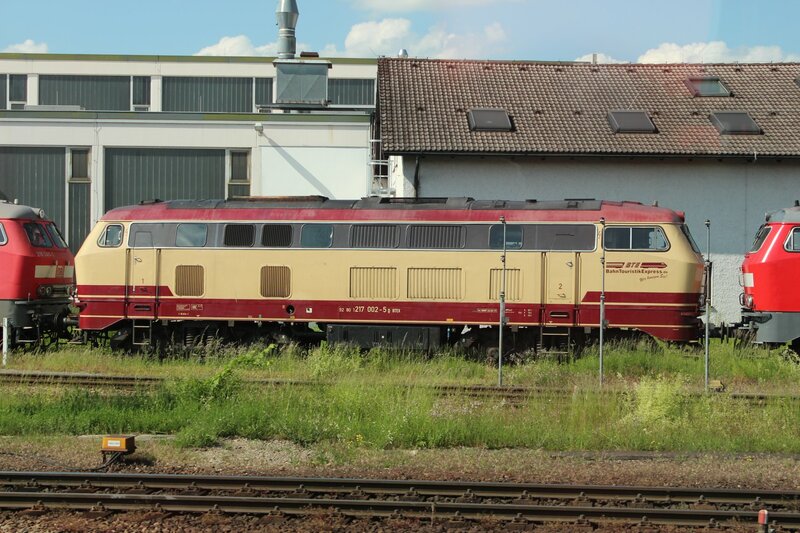 I have a particular fondness for the class 103 electric locomotives that were a common sight on intercity trains as I was growing up, even if I only had one opportunity to see them for real in 1984. 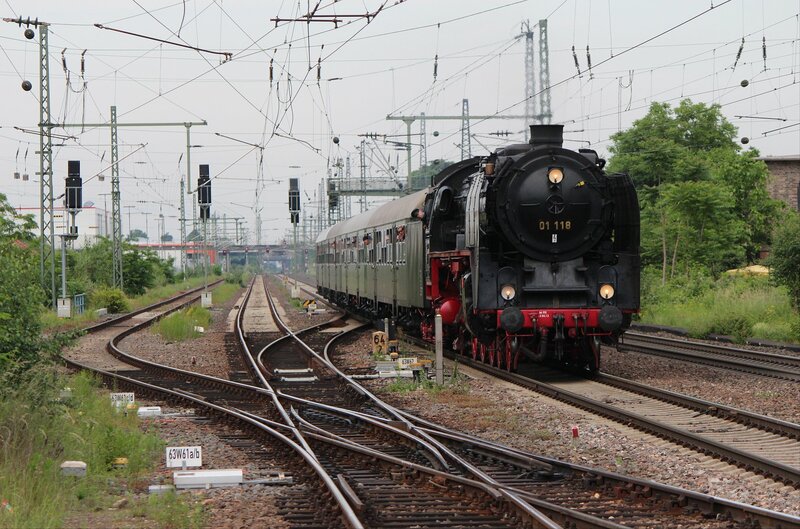 The elegance of a 103 once again hauling a rake of red and cream coaches, recalling the golden era of the Trans Europ Express, was something that I could not miss. Three of the opportunities that I picked out were designed to capture this sight at its best. 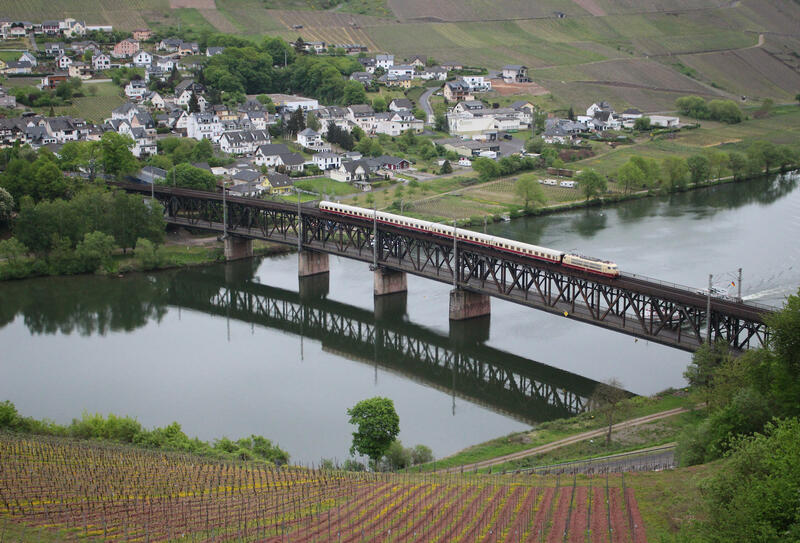 The first opportunity came from the riverside at Bullay, with DB electric 103 113-7 hauling a special across the Moselle using the double deck bridge at Bullay on the saturday morning. 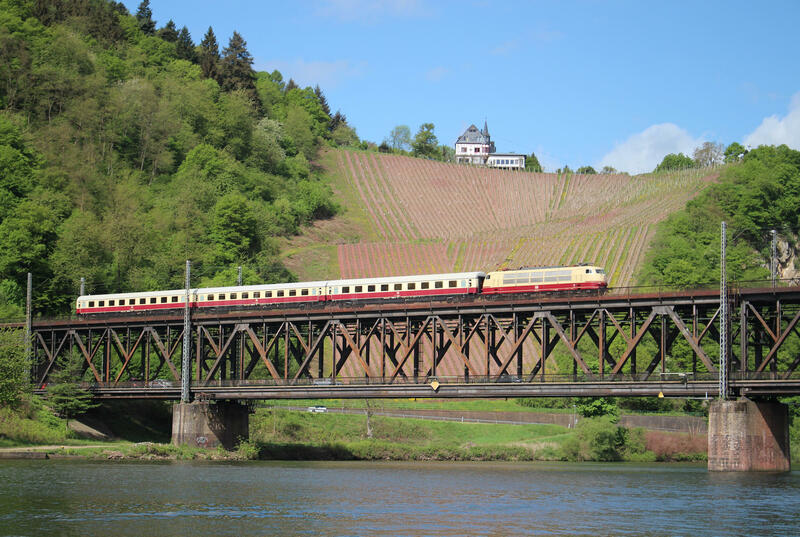 It couldn’t have been a better start – the sun gloriously illuminating the steep hillside vines of the Stein family behind the bridge as the train passed. 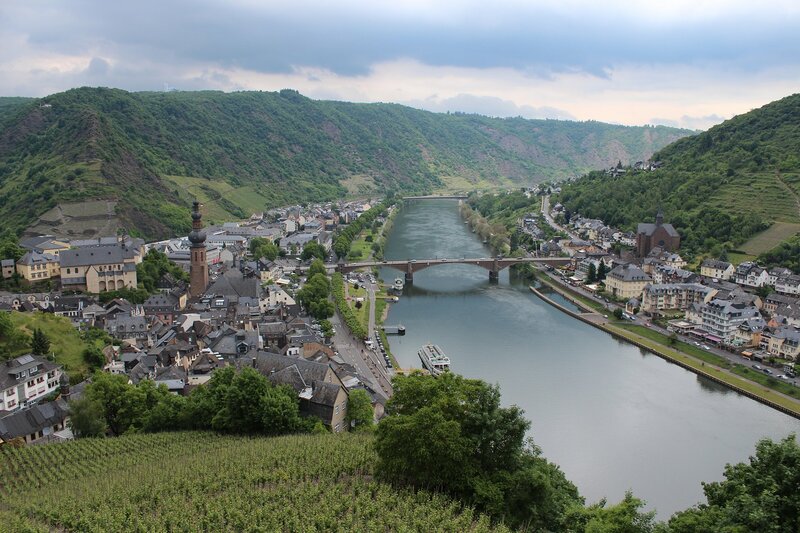 In the evening I returned to the same location, this time taking the zig zag path up the hillside to the top of the vines for a view down on the bridge. By this point the first rain had arrived, necessitating a little shelter amidst the trees as we waited. 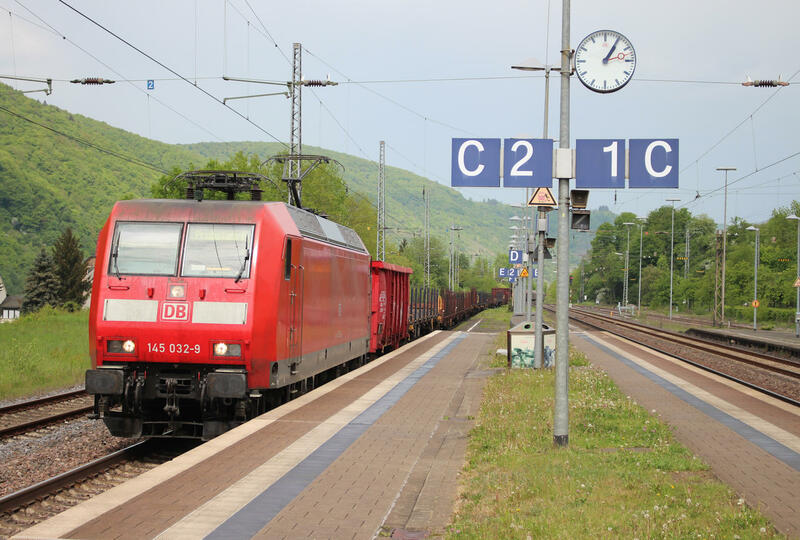 The arrival of the evening train from Koblenz was delayed by around half an hour, but luckily appeared before I had to abandon to catch catch my train back. 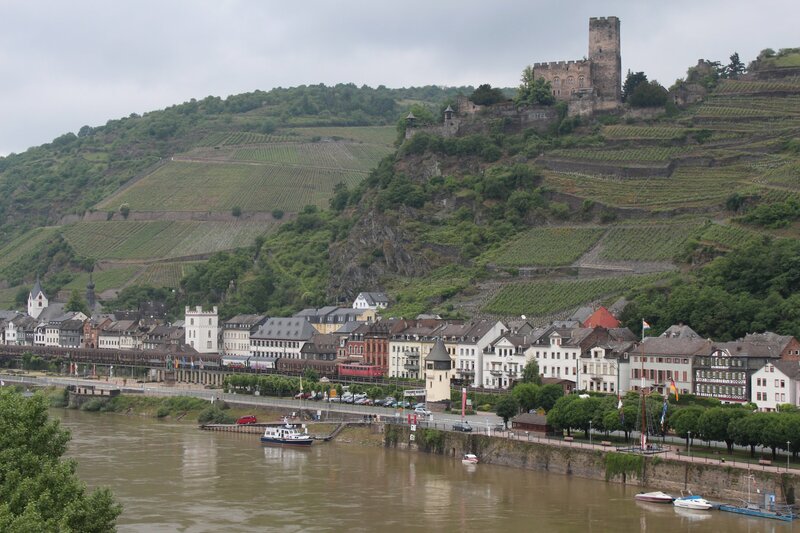 Only later did I hear the sad news that the day’s schedule had been interrupted by a serious spectator injury at Trier. 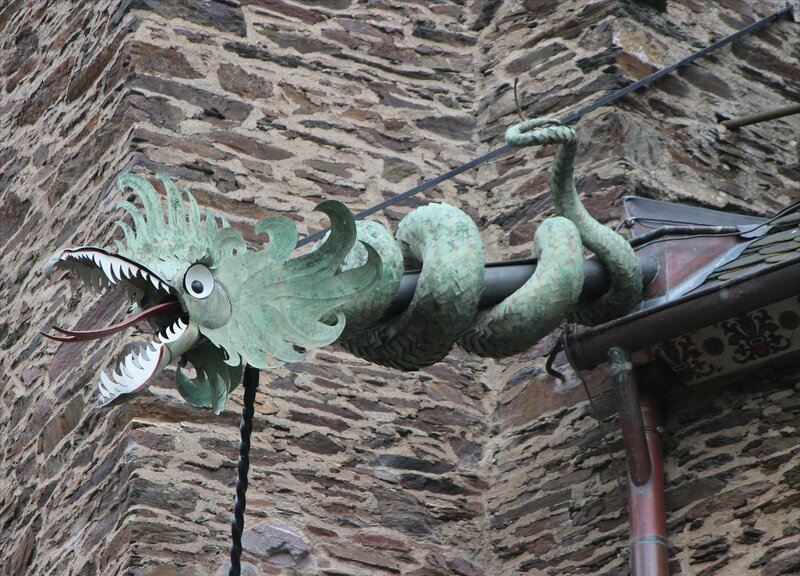 Our next encounter with 103 113-7 came the next day. 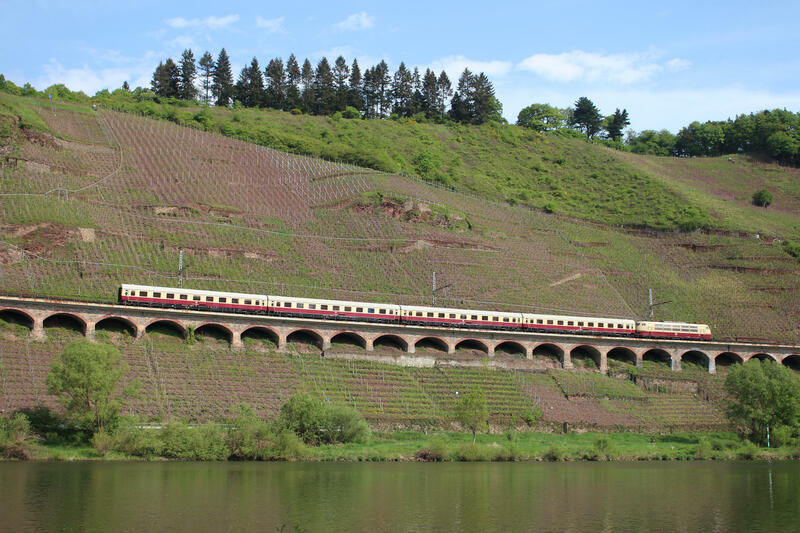 We took the train from Trier to Bullay, then switched to a much smaller shuttle for a six minute hop on the Traben-Trarbach branch line. 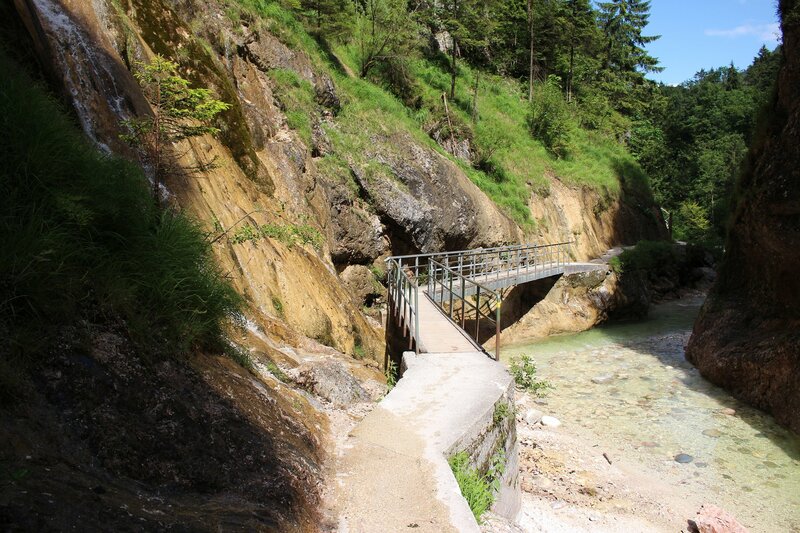 A leisurely 45 minute walk along the cycle path from Reil, the first stop on the branch, brought us to a small stony beach with a terrific view of the 786 metre-long Pünderich Hangviadukt. 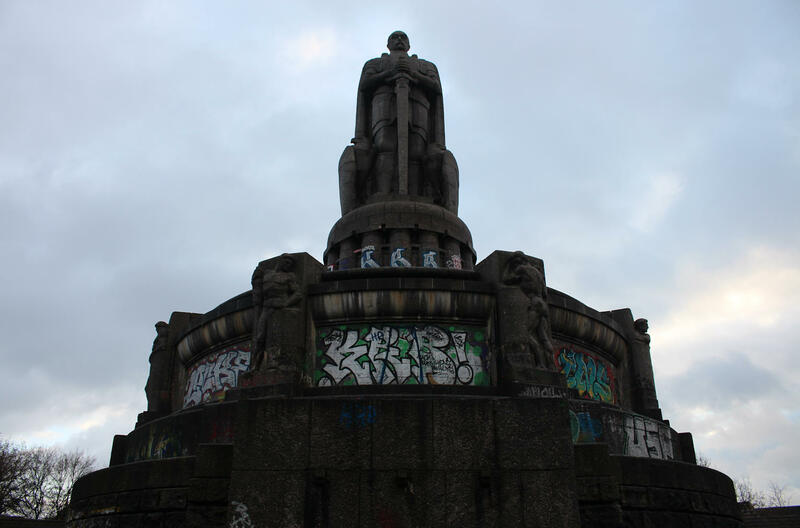 It was the perfect spot for spectating and the sun even deigned to come out for the veteran electric – a vast improvement on the rain and gloom that had greeted us at the start of our walk. 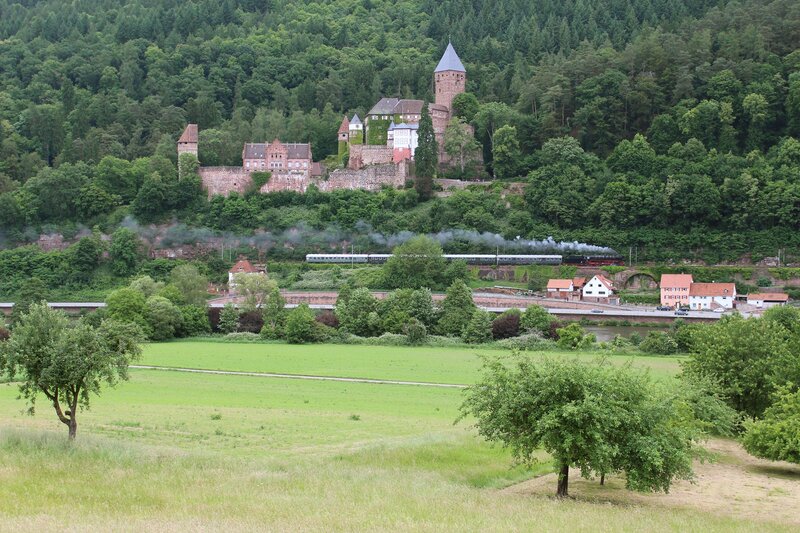 As we left Pünderich behind we could see that all of the little beaches and vantage points had been filled by photographers, ready to snap the steam special due around midday. 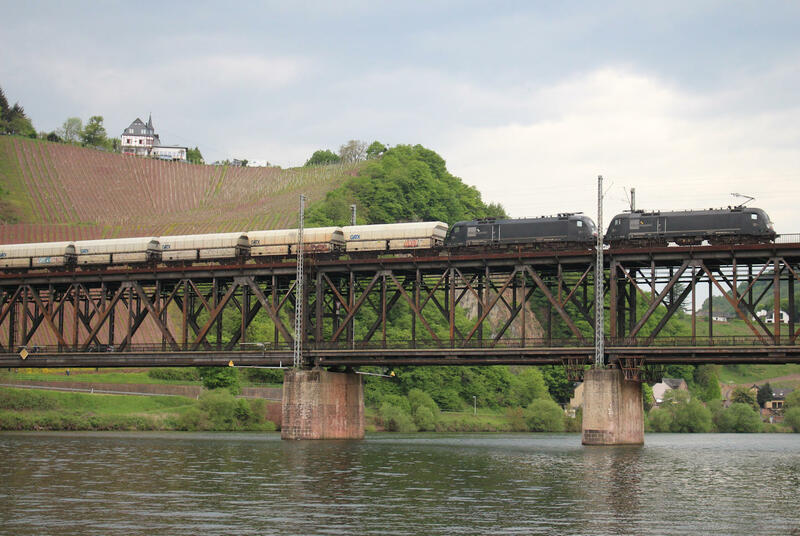 I took my chances with that at Bullay but the sun disappeared moments before the train crossed the bridge. Some you win, some you lose. 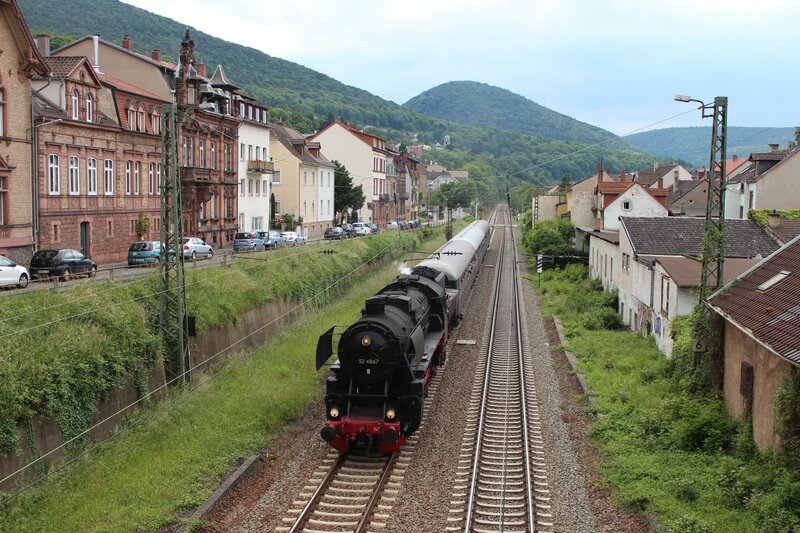 On a handful of occasions during this event I simply enjoyed the spectacle, rather than photographing it, such as with the parallel morning run of trains to Saarbrücken and Nennig run parallel between Trier and Karthaus. At other times, the wisdom of standing on a bridge in a gale or in the pouring rain at a hilltop chapel, camera in hand, seemed suspect but the resulting pictures were usually sufficient reward. I might not have come away from this trip with a stackful of shots but I certainly had one or two that looked alright. 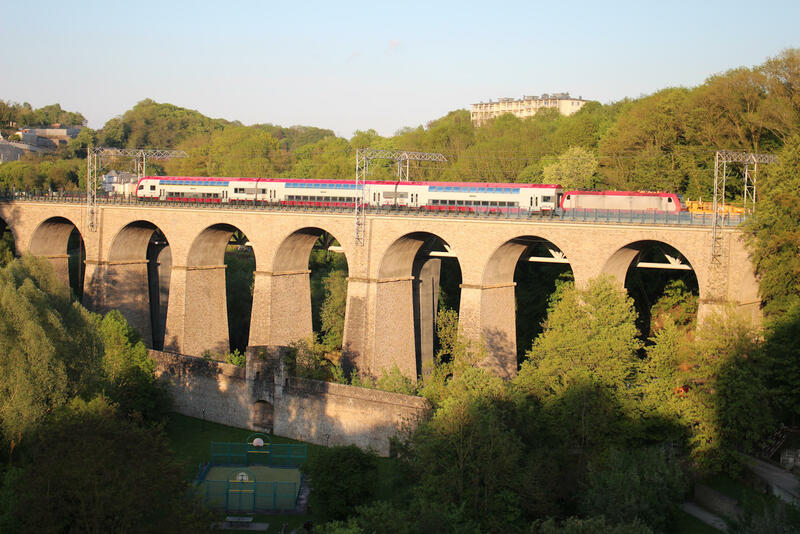 One night stays in Luxembourg City sandwiched our trip to Trier, giving us an opportunity to enjoy the sight of many regular service trains crossing the impressive Pulvermuhl and Pffafenthal viaducts. It seemed like a good way to start and finish the trip. 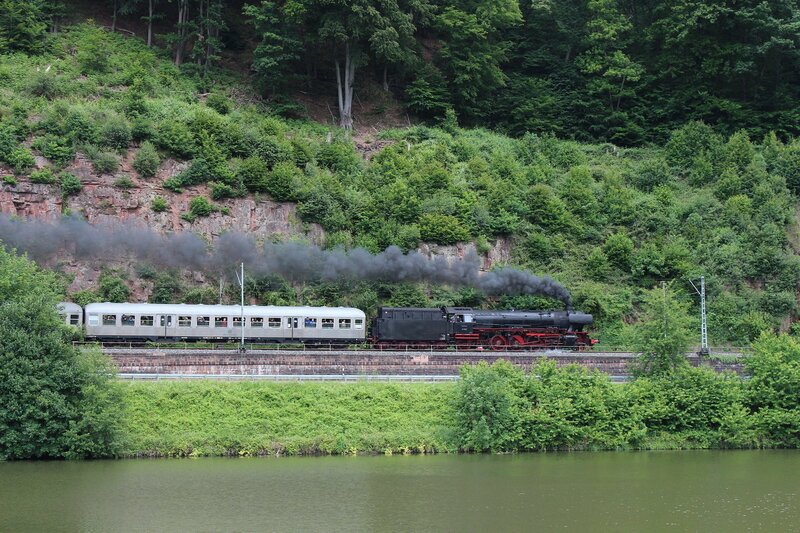 Here’s hoping that this isn’t the last of the spectaculars and that we’ll be plotting another eclectic mix of sightseeing and railway photography in another few years. 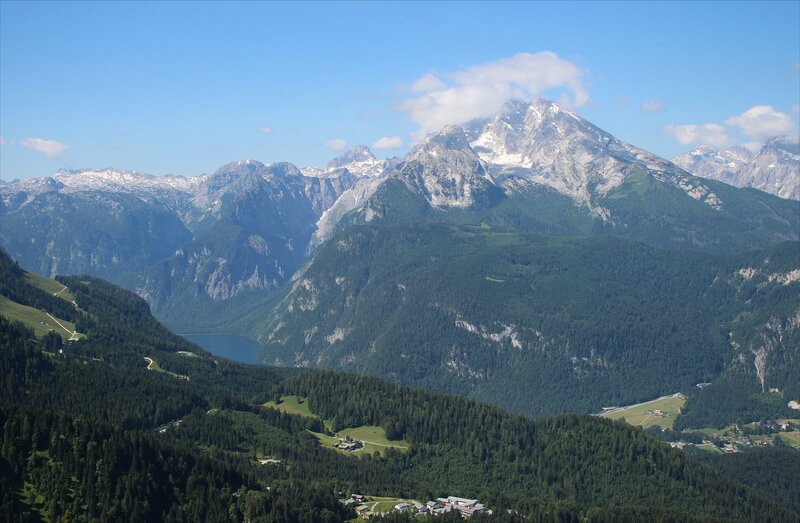 A new day saw us boarding the number 840 bus for Berchtesgaden once again, connecting with the 838 bus to Obersalzberg. 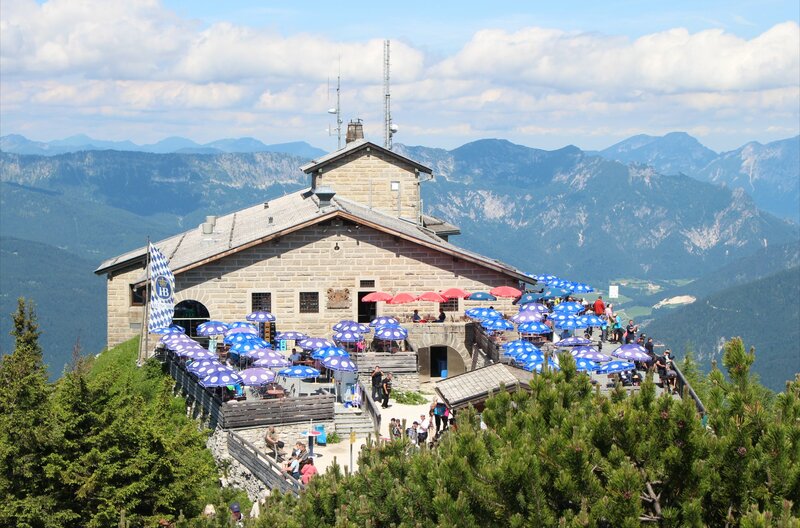 The destination for today was the kehlsteinhaus, Hitler’s mountaintop tea house, better known by its english name of the Eagle’s Nest. 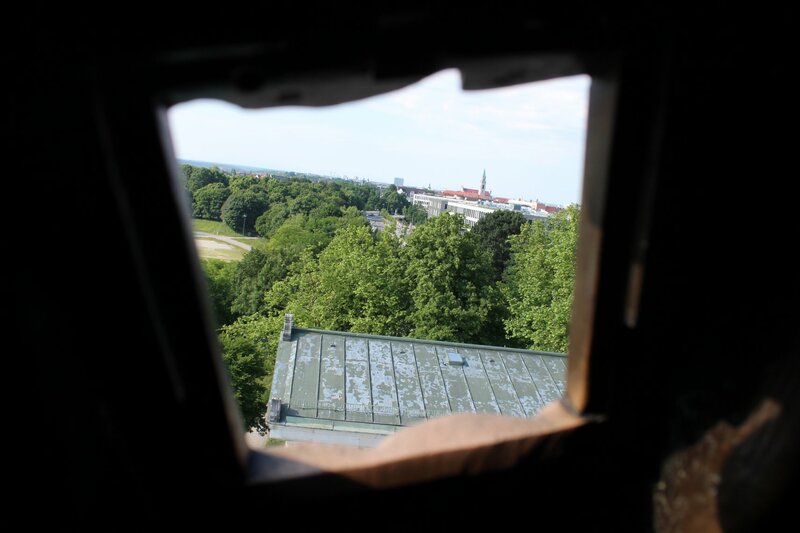 The tea house was constructed in 1938 as a present for Hitler’s fiftieth birthday, though he rarely visited the place on account of his fear of heights! 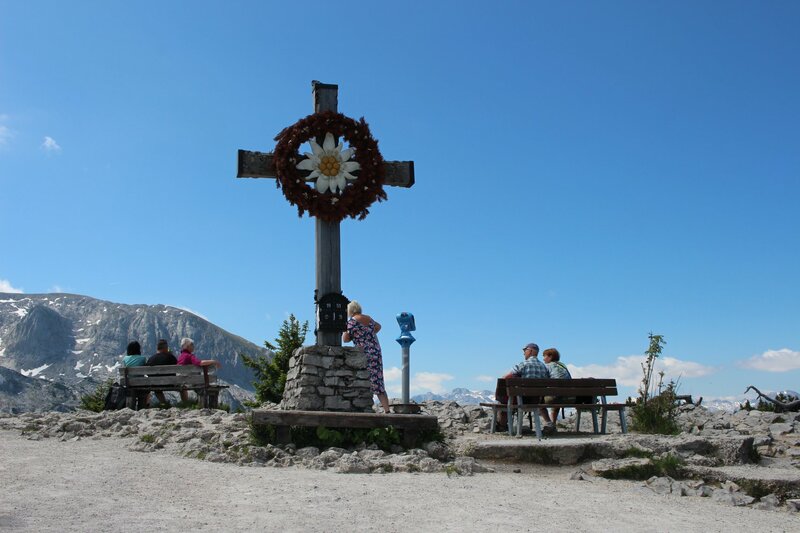 This unusual attraction sits atop the Kehlstein mountain at 1834m above sea level and draws up to 3,800 visitors every day during the summer months. 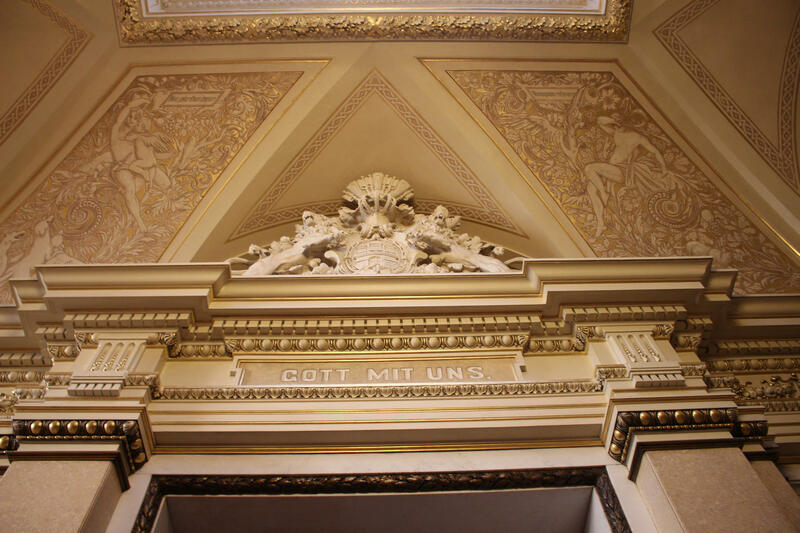 The building is now a restaurant with little in the way of original features, though a red carrara marble fireplace gifted by Mussolini can still be seen in the original reception room (though visitors are discouraged from entering as this space is reserved for diners). 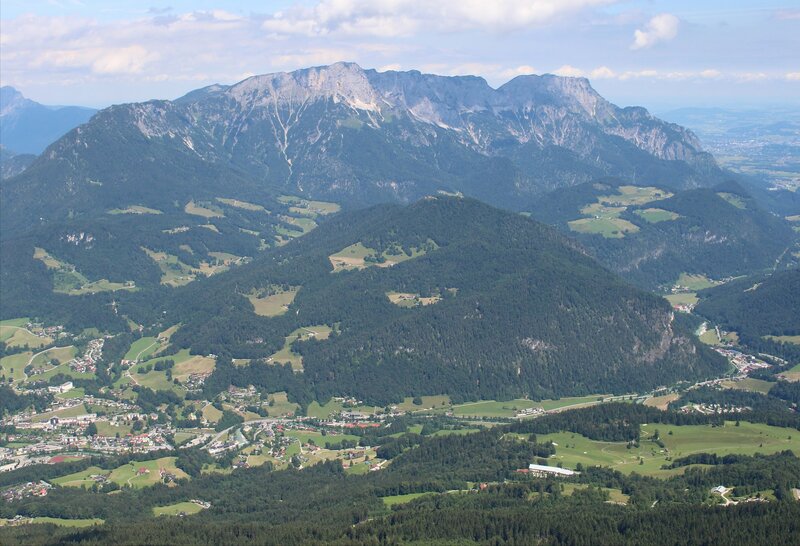 As you might expect, the views are stunning and well worth the rigmarole to get to the top. 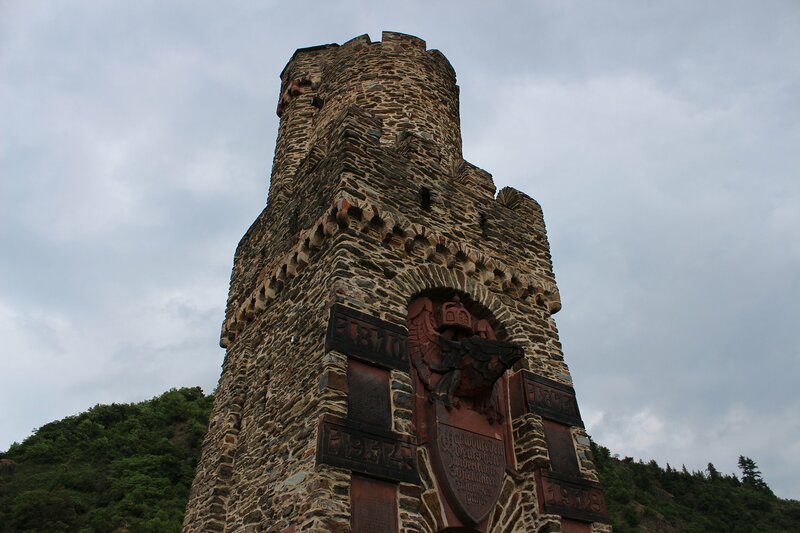 A trip up the mountain is as much of an experience as the summit, showcasing the remarkable feat of engineering that saw the 6.5km Kehlsteinstraße constructed in difficult and often perilous conditions. 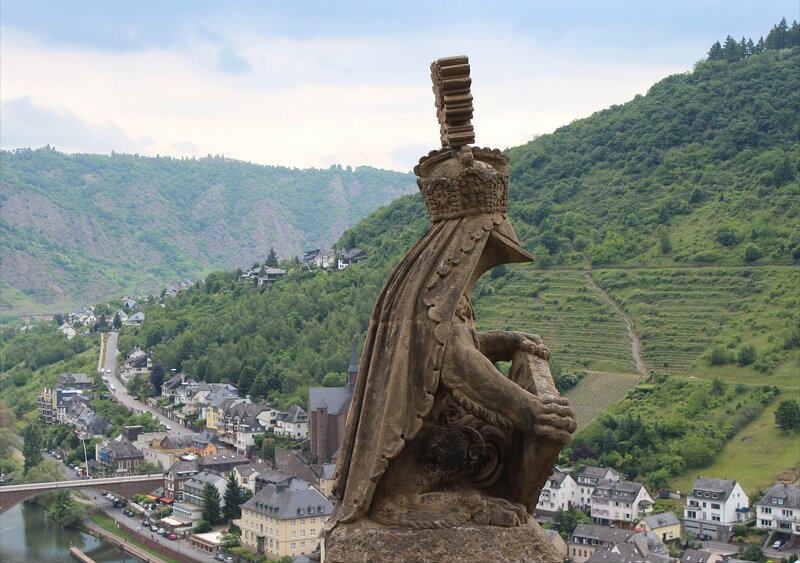 The 3,000 strong workforce completed the road in just 13 months at a cost of 30 million Reichmarks, sometimes carving the road terrace out of the mountain a metre at a time. The photographs in the guide books of the construction really make you appreciate how difficult the whole exercise was. 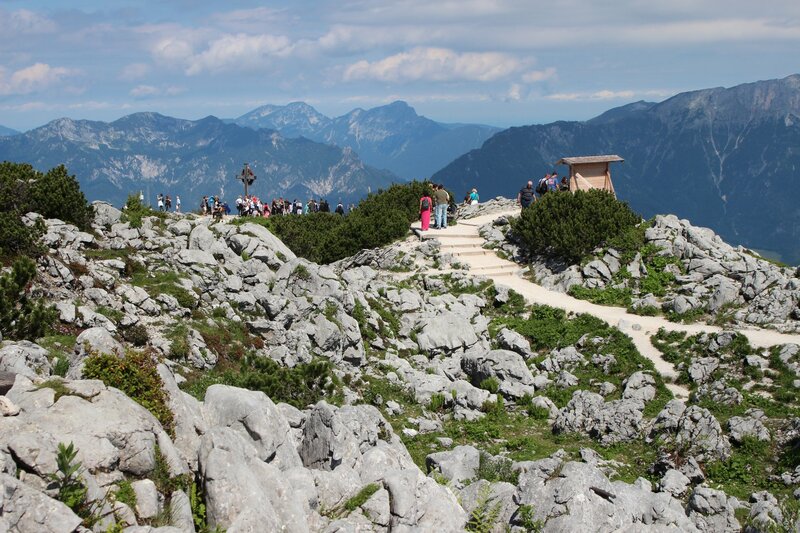 From the Eagle’s Nest Bus Station (Abfahrtsstelle Kehlsteinbus) the winding 6.8km road up the southern face of the Kehlstein to the parking place (Kehlsteinparkplatz) takes passengers up 770m in altitude. Along the way there are some marvellous views of the mountains and only one, somewhat terrifying, hairpin. 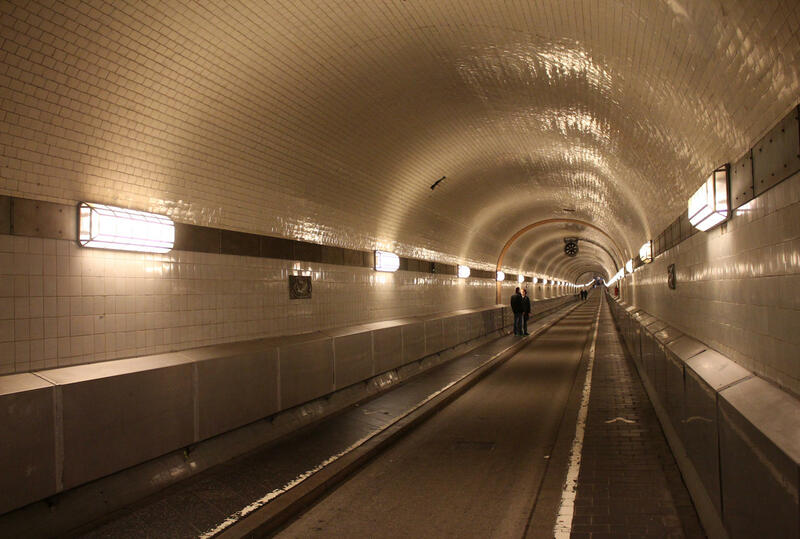 The four metre wide road is pretty steep with a 24-percent slope at points and passes through five tunnels with a combined length of 277m. 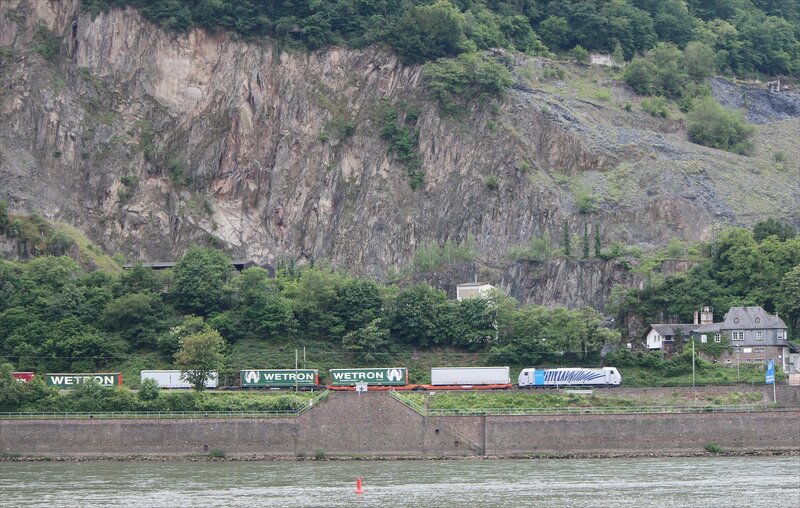 It was quite interesting to see how well organized the buses up the mountain are. 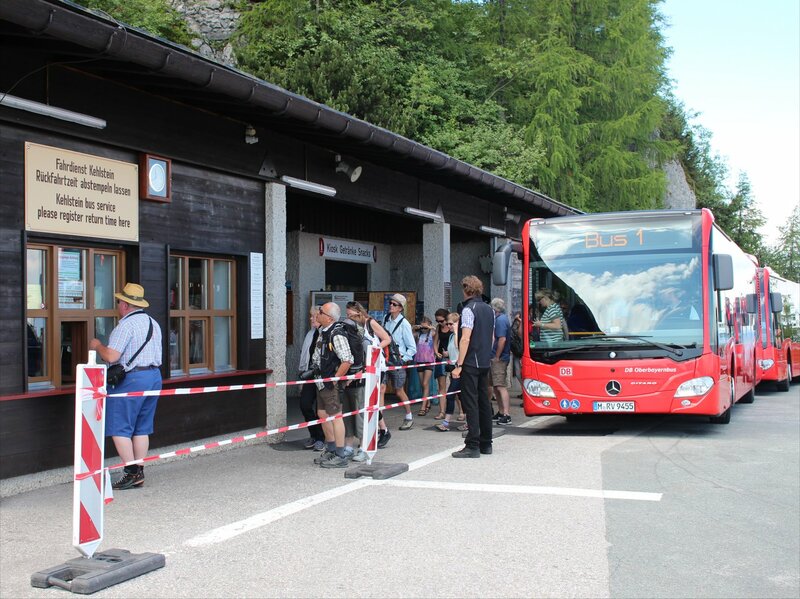 The buses operated by the Regionalverkehr Oberbayern (RVO) are the only vehicles allowed on the road and they operate a carefully timed one-way system for traffic up and down the mountain. 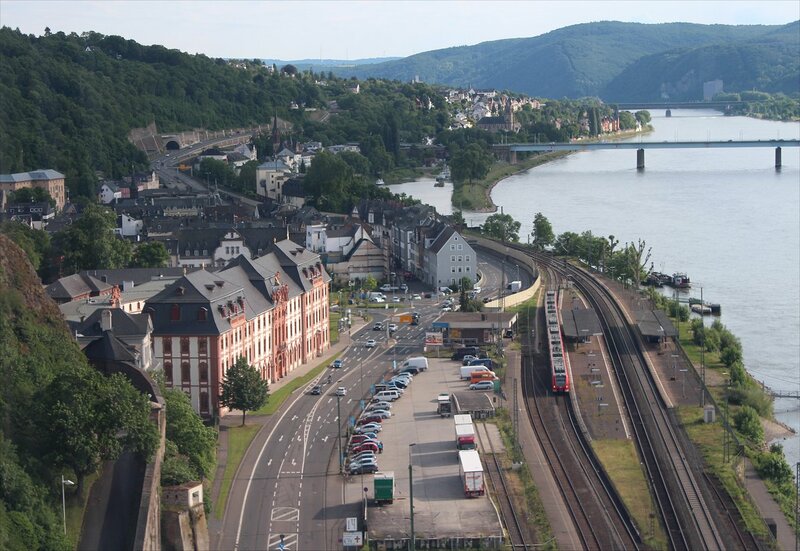 Buses depart from the bus station in convoy every 25 minutes and pass the downward traffic queuing up at a lay-by mid-route. 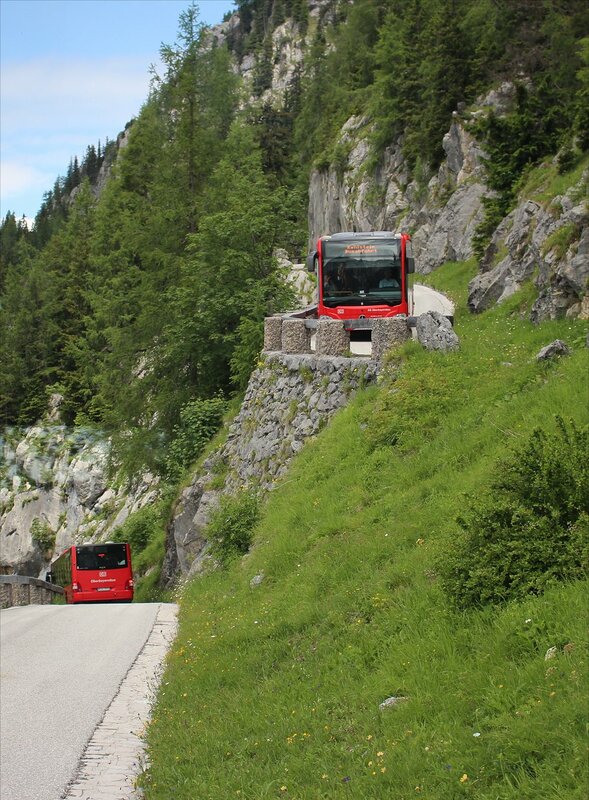 The RVO says there are twelve buses in use on this route – all with specially adapted brakes and engines – and we must have hit the morning peak with six buses up the mountain on our convoy (the 10.10 departure). 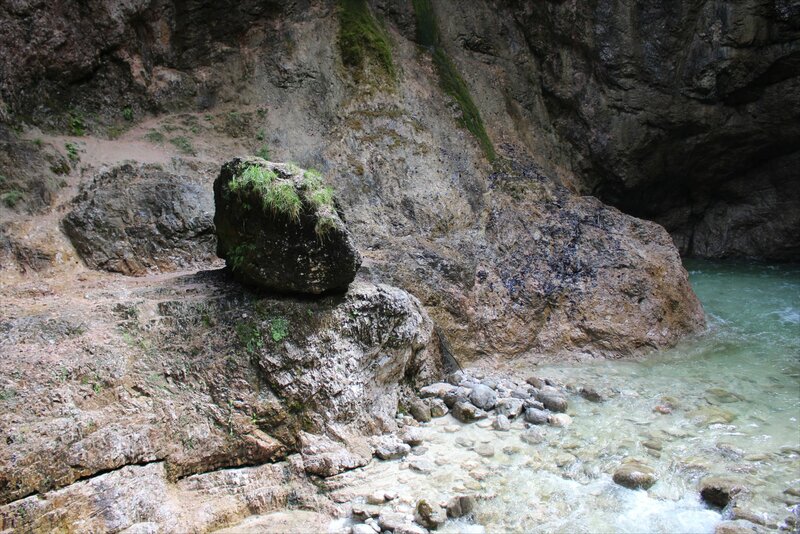 Although the route is a little terrifying we were well aware of the safety measures in place along the route and the careful rock-cleaning that takes place each winter/spring to remove loose stones. 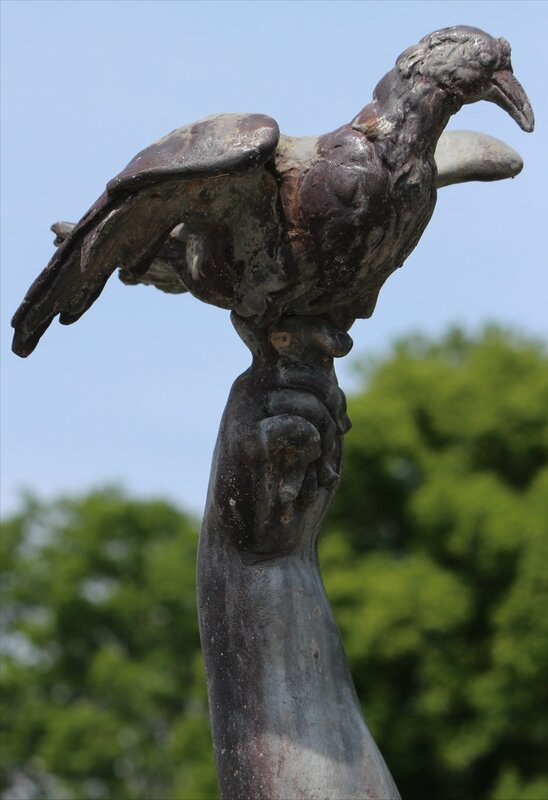 It is reassuring to note that no accidents have occurred on the road since it was first opened to the public in 1952. At the other end of the route the buses emptied one by one with all passengers immediately directed to a counter to have tickets stamped with a return time. We were lucky enough to be in the first bus, quickly got our tickets stamped and headed on our way to the summit. 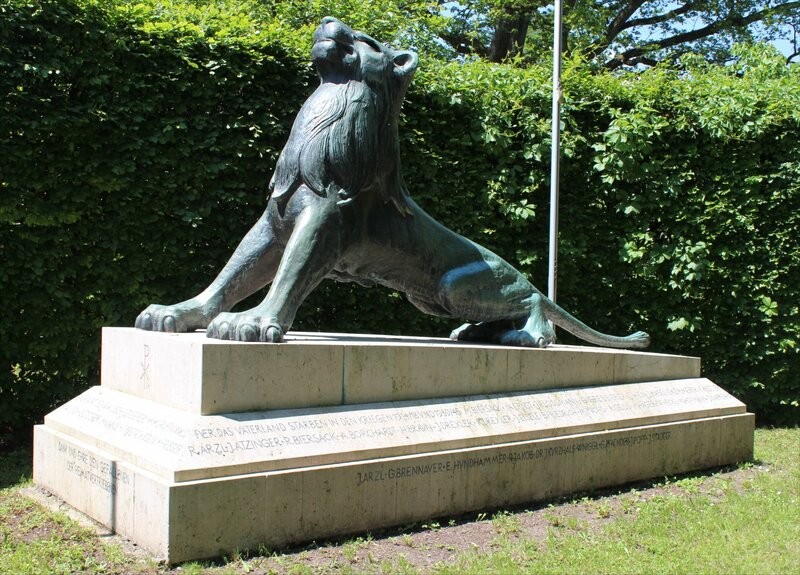 The grand entrance with its double set of thick metal doors is as impressive today as it must have been when it was built in 1938, although it is lacking the two bronze lion handles which once adorned them (one was given to Eisenhower and the other is in the hands of a private collector). 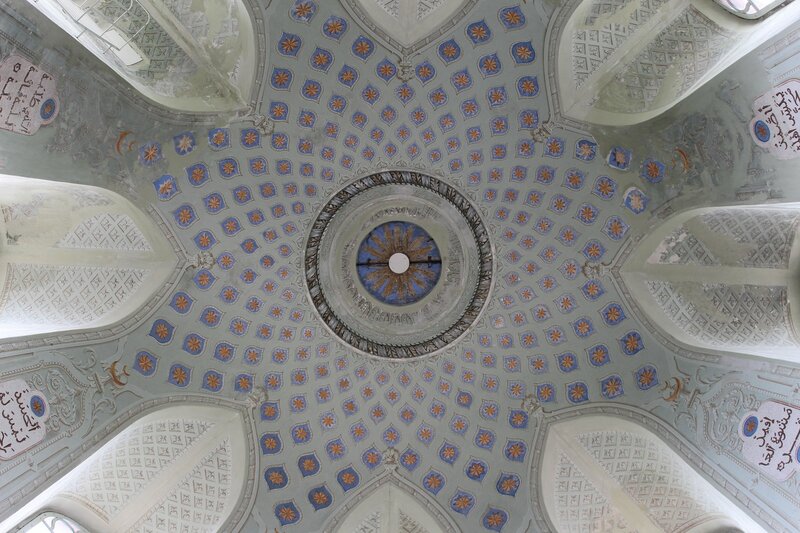 Stepping through the doorway takes you into a 126m long marble-lined tunnel into the mountain which ends at an impressive domed hall lined in Ruhpolding marble. 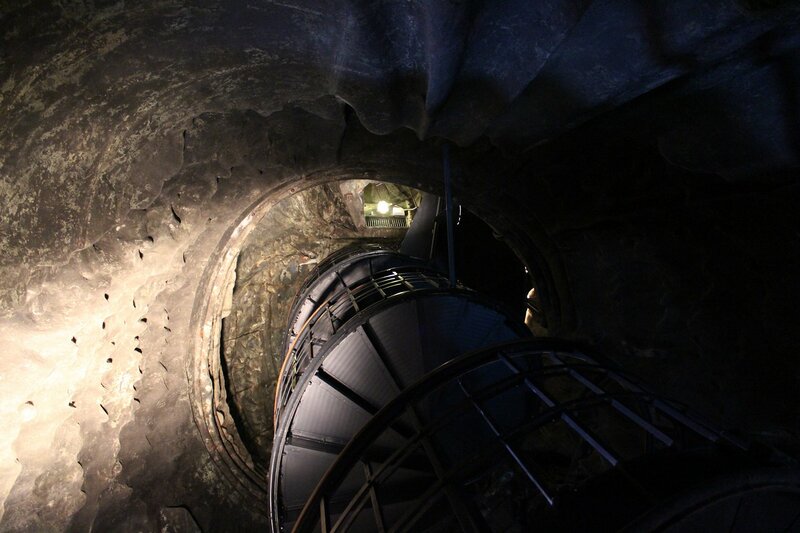 It is here that you enter Hitler’s luxurious polished brass lift capsule, inset with mirrors, for the 131m ascent to the top. 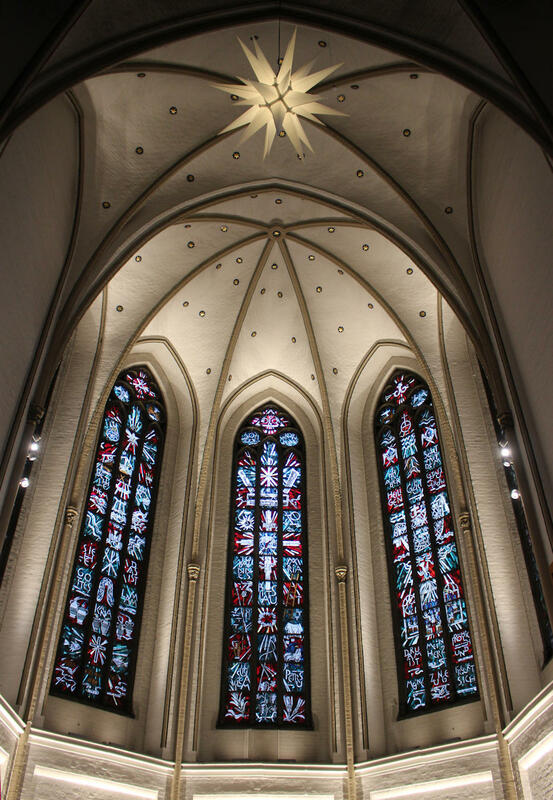 We had a few moments to appreciate the design before finding ourselves back in the fresh air again. At the top we took a leisurely wander around for the views to be found in every direction, with a particularly splendid vista of the Berchtesgadener Alps illuminated by the sun. 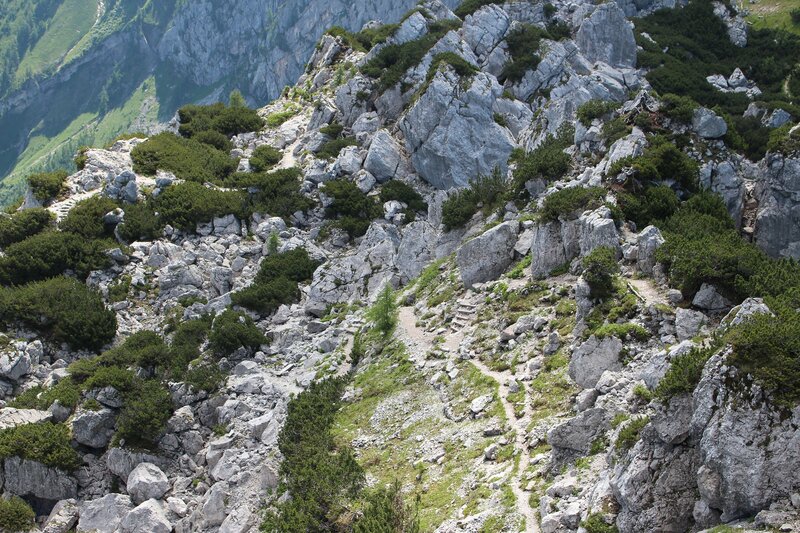 It is possible to be more adventurous and follow a trail from the summit but only a handful seemed to have chosen that option on this occasion. 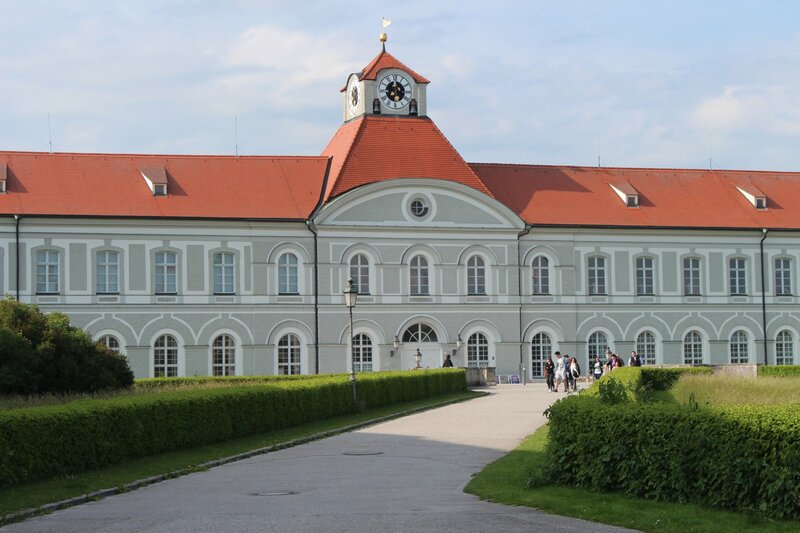 After heading back down the mountain by bus we made a visit to the Obersalzberg Documentation Centre to put our visit into context, recording the innumerable horrors of the regime. 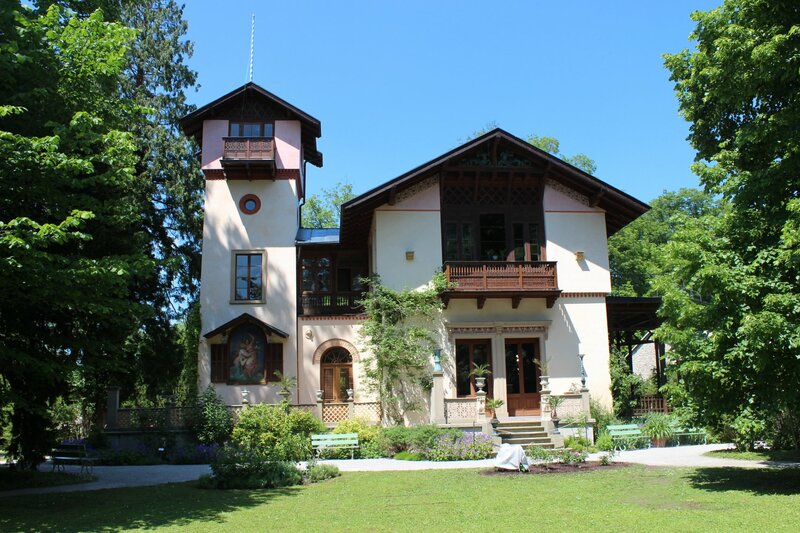 I hadn’t really known anything about the Obersalzberg before our visit, so I had not appreciated that not only was Hitler resident at the Berghof but that a whole Nazi community had developed here. 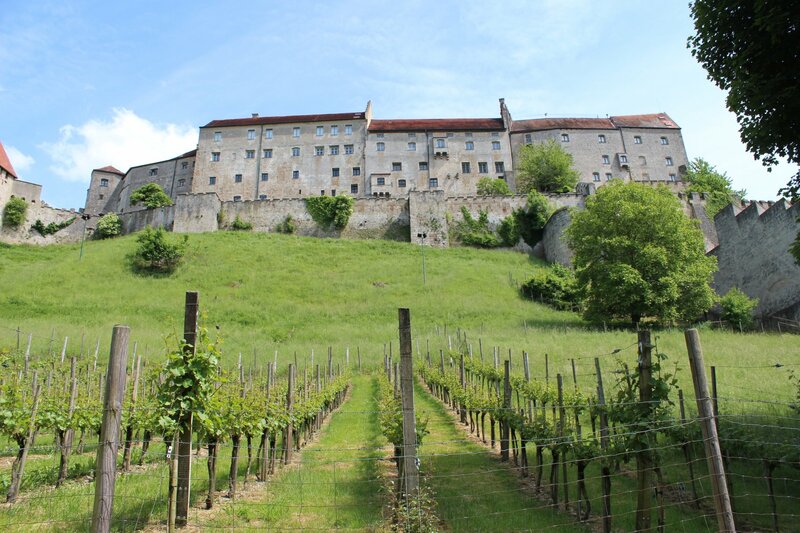 This saw existing families evicted from their properties and new residences built for prominent Nazis such as such as Hermann Göring, Martin Bormann and Albert Speer in their place. 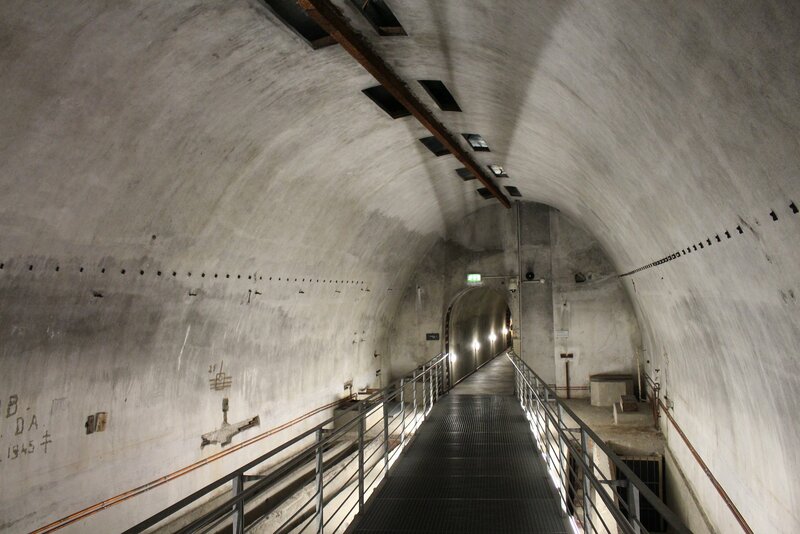 The Obersalzberg Documentation Centre also connects into one of the underground bunker systems that sat beneath the surface level buildings of the regime. 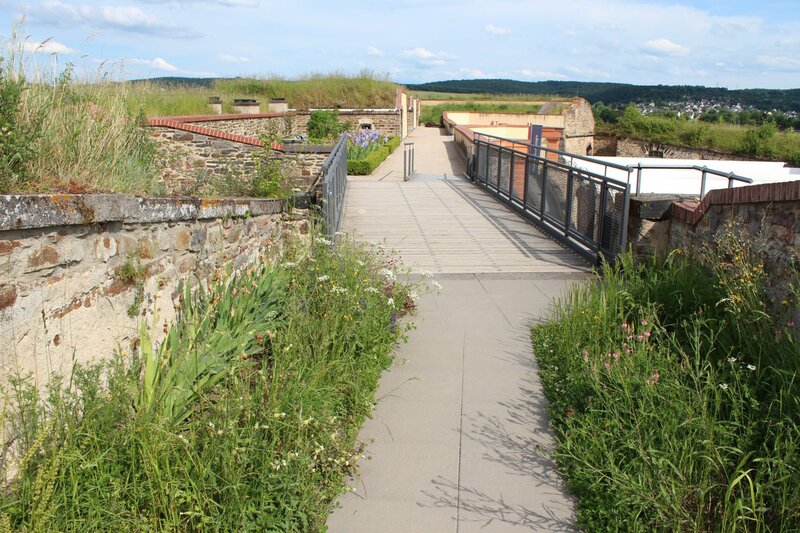 A walk into the remains of the Platterhof and Guesthouse Bunker gives a small insight into the structure of the complex and defence system created to govern the Reich whilst war raged above. 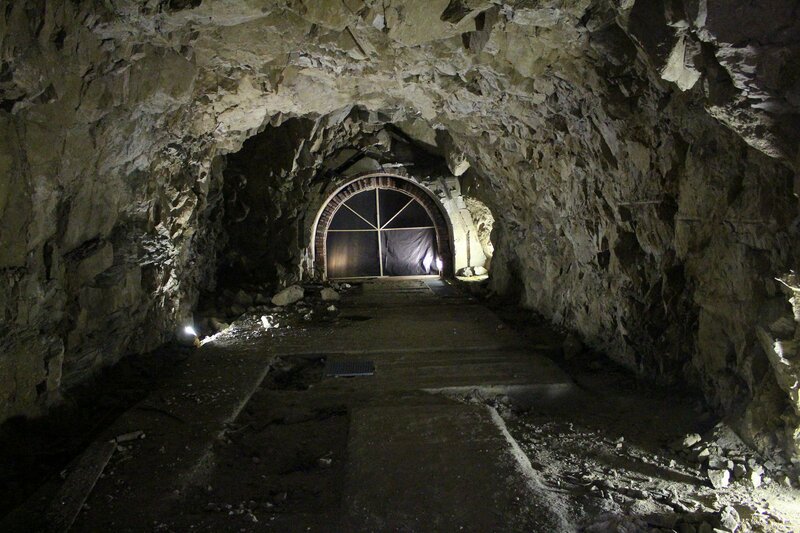 The inside shaft which connects the Guesthouse and Platterhof bunkers with the lower levels of the bunker system. 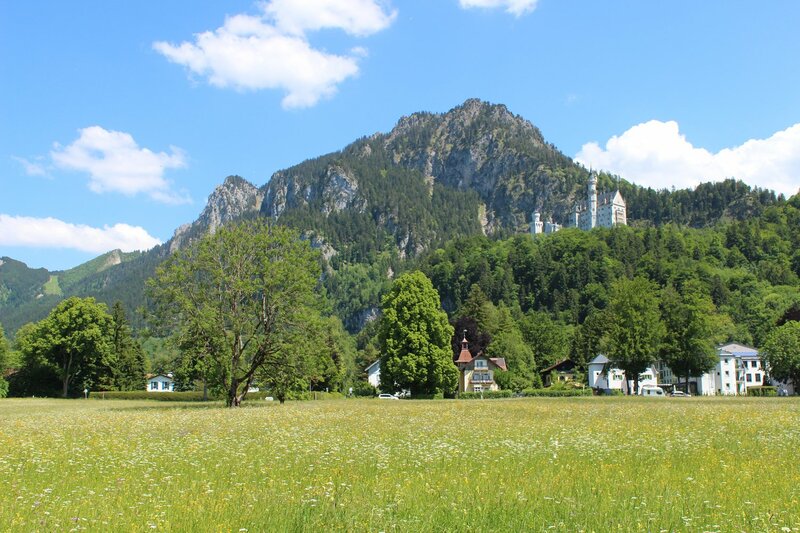 In short, the displays at the Obersalzberg Documentation Centre present a necessary and chilling counter balance to the relatively peaceful experience of a trip up to the Eagle’s Nest. 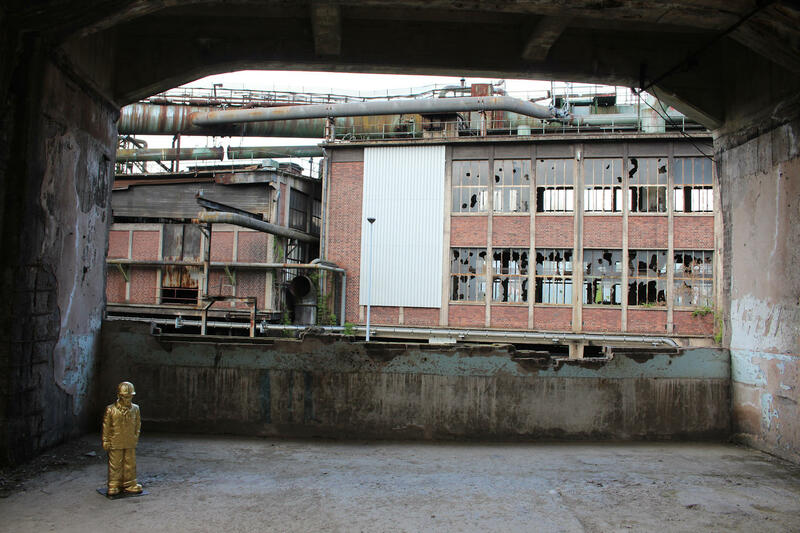 A visit inevitably presents an awful lot of darkness, but it’s also a powerful reminder of the discomfiting ease with which political movements like this have been able to find an audience amongst the disaffected. We can never be too complacent. This history must never be repeated. 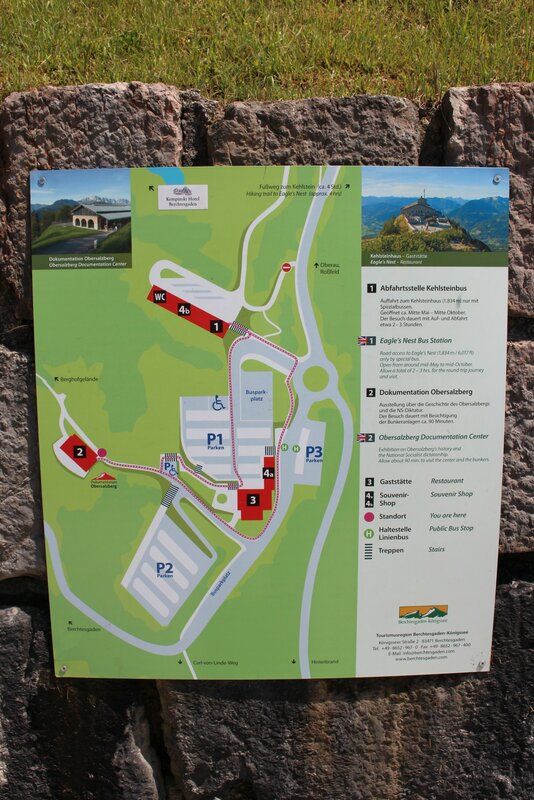 A map at the bus stop shows the location of the Eagle’s Nest Bus Station (Abfahrtsstelle Kehlsteinbus) and the Obersalzberg Documentation Centre in relation to the public bus stop. 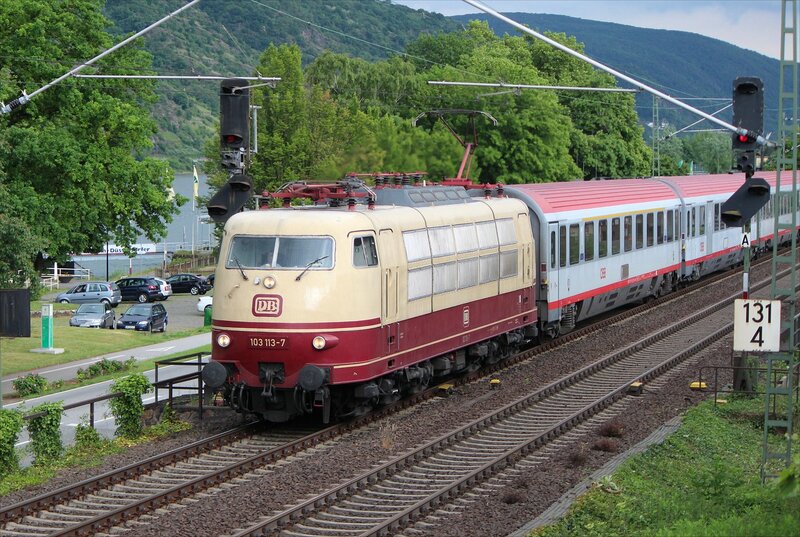 The bus timetable (Fahrplan Kehlsteinlinie) for the next leg is available from the RVO bus website. 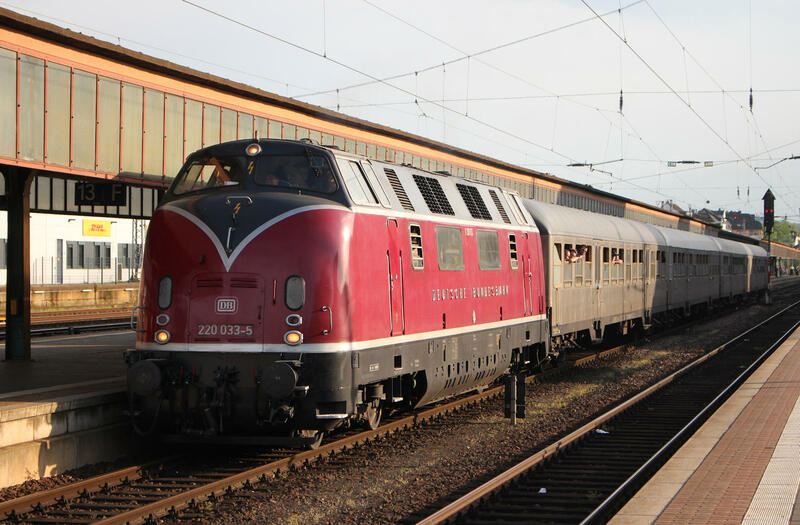 When you buy a ticket (currently 16.10 euros for an adult) you are given a specific departure time and bus number, with everyone allocated a seat in the bus. 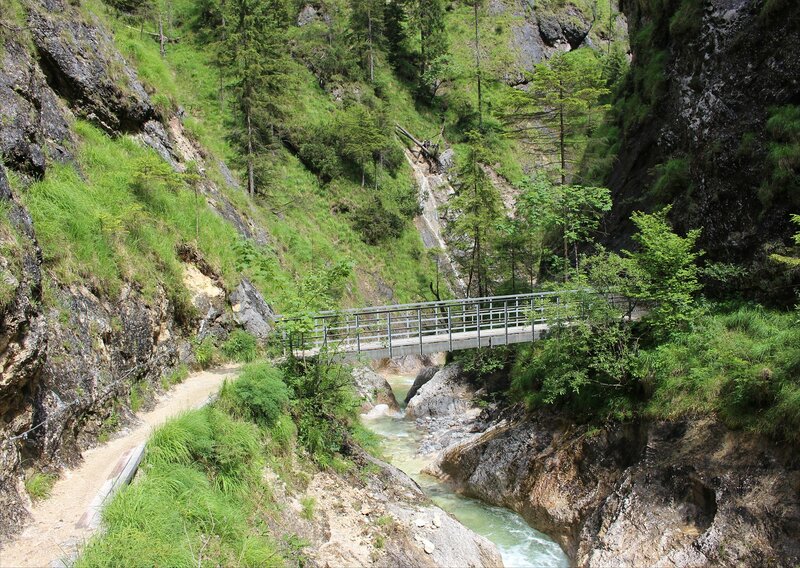 If you want to get a view out to the mountains you are best sitting on the right hand side for the journey up (though as I discovered, this can be pretty scary and had to shut my eyes at the hairpin!) 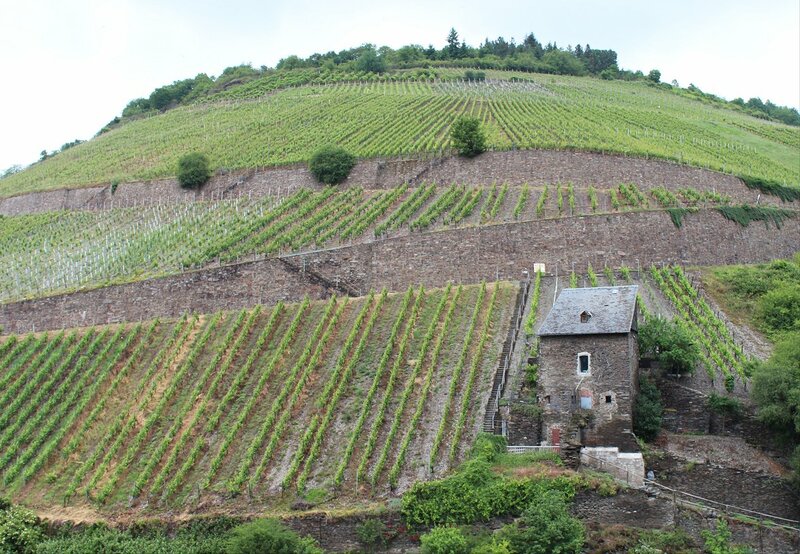 but it can be as interesting on the other side of the bus for the views of the mountain road and tunnels. 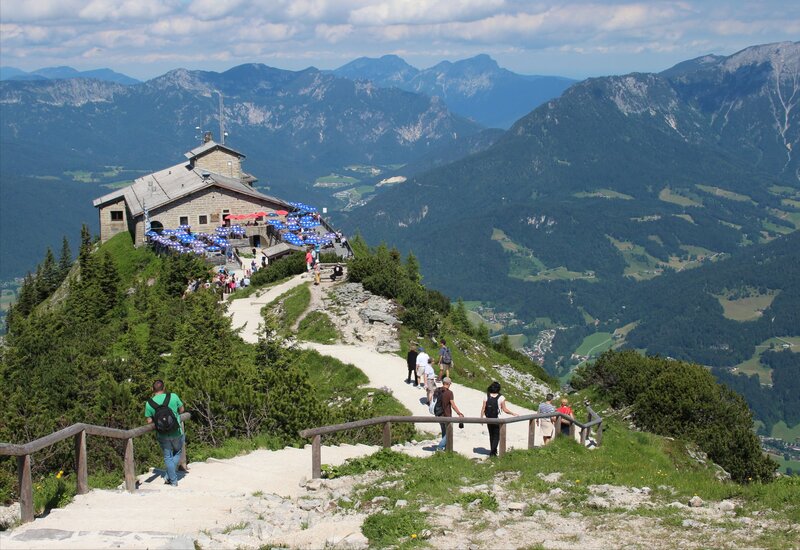 The buses take 15 minutes to get to the Kehlsteinhaus parking place. On arrival you are directed straight into a queue to fix a return time of your choosing before heading to the lift up to the very top. 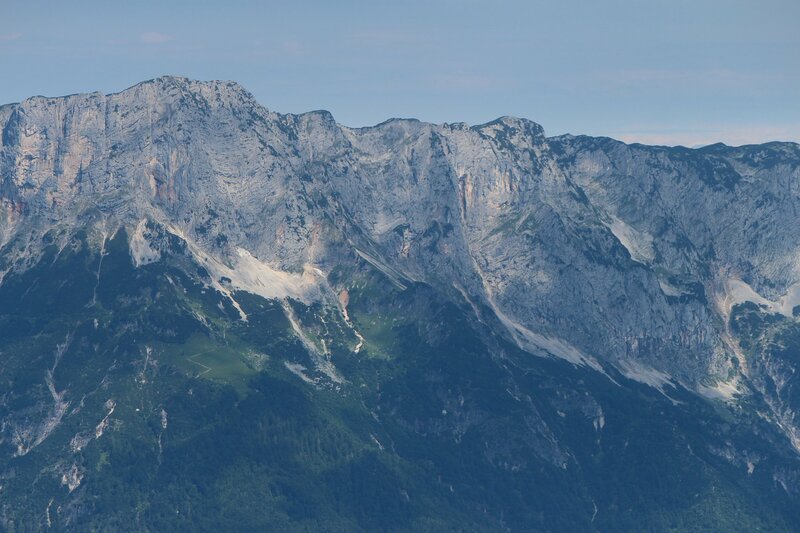 The general recommendation is to allow two hours, or longer if you plan to eat up top, but we opted for an hour and forty five minutes at the summit which proved pretty much perfect for a short wander (though we did get straight into a lift up). 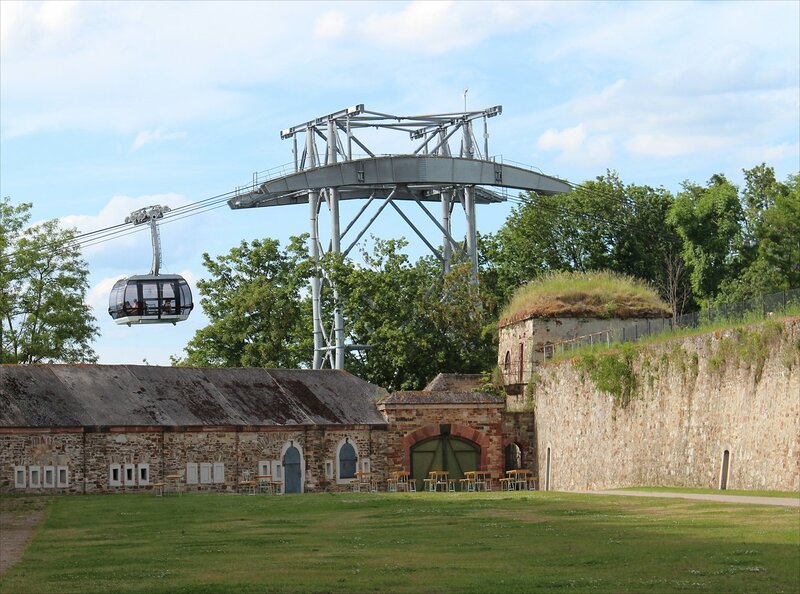 Many travel up top by lift but then take the relatively easy walk back down to the parking place (around 20 minutes) to catch a bus back. 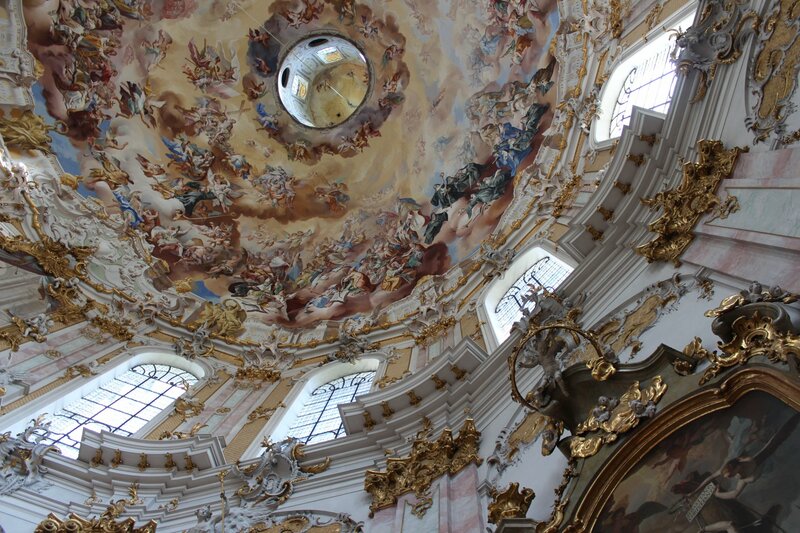 Our visit to the Obersalzberg Documentation Centre lasted a couple of hours. Most of the information is in German but there are leaflets through the galleries with english translations of the key panels, though this is only a fraction of the text on display. 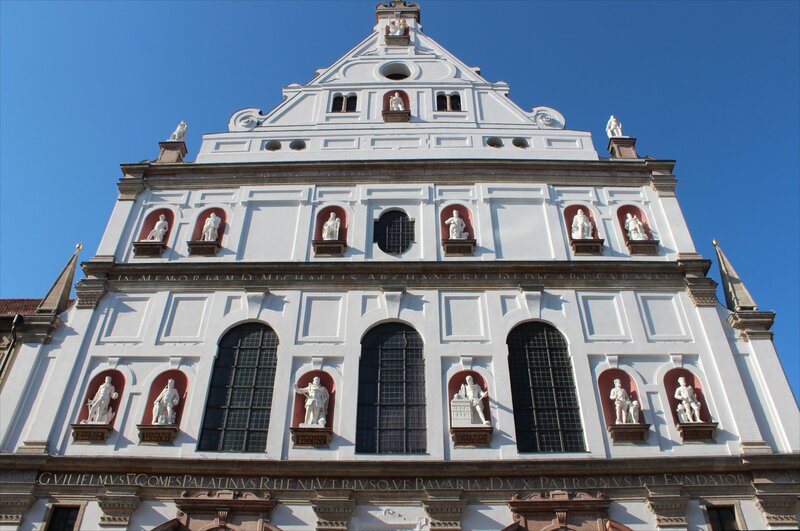 The upper space provides models and photographs that place the buildings of the Obersalzberg into context and should be a part of your visit. 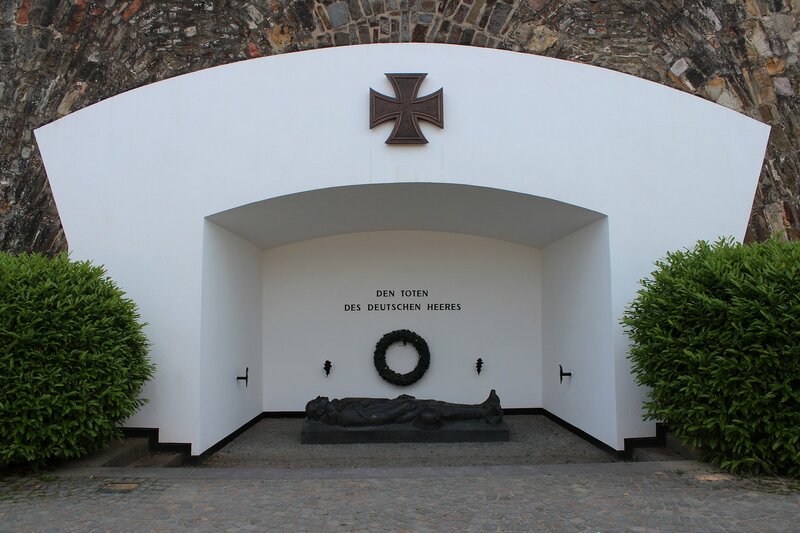 Admission cost 3 euros per adult. 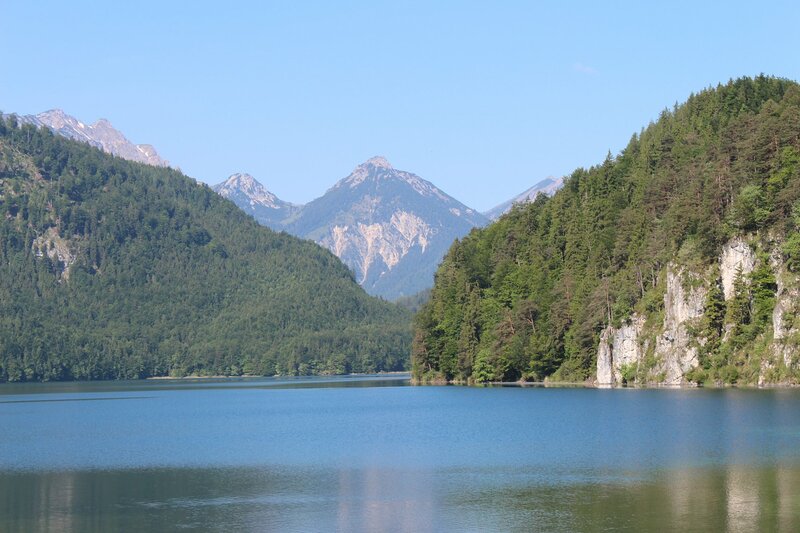 We started our day with the 8.15am bus to Berchtesgaden and returned on the 3.15pm bus to Salzburg. 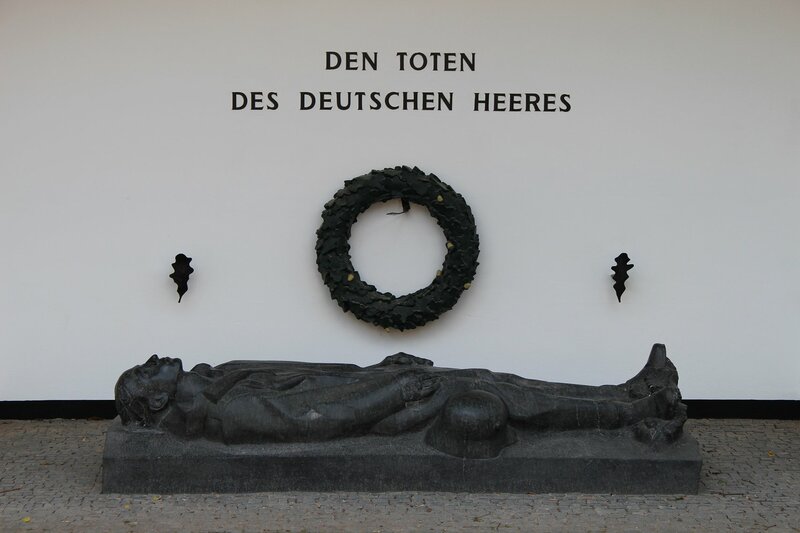 The combination of the trip to the Eagle’s Nest with the Obersalzberg Documentation Centre felt like enough visual and intellectual stimulation for one day, though we were well aware that there is more on offer should we have felt like it (such as the bunker system under the Hotel zum Türken). 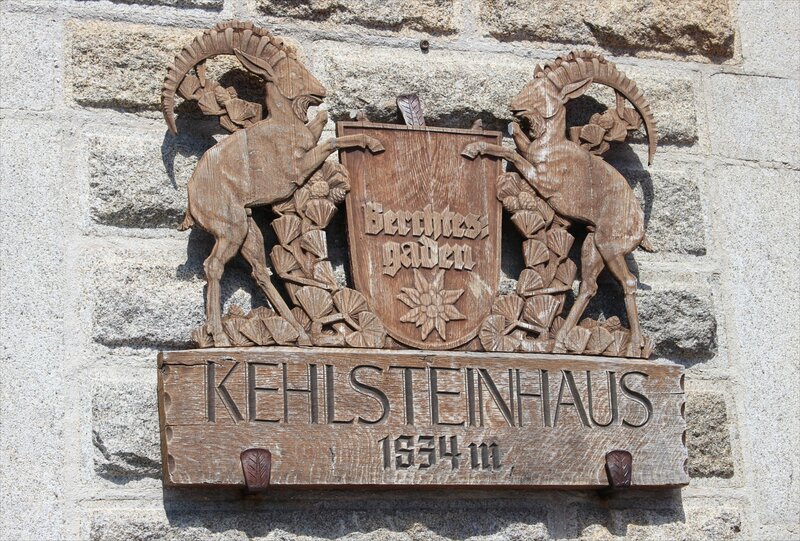 If you are thinking of making a visit it is well worth checking out the unofficial Das Kehlsteinhaus website which provides a terrific account of the history of the house and the remarkable road leading up to it. 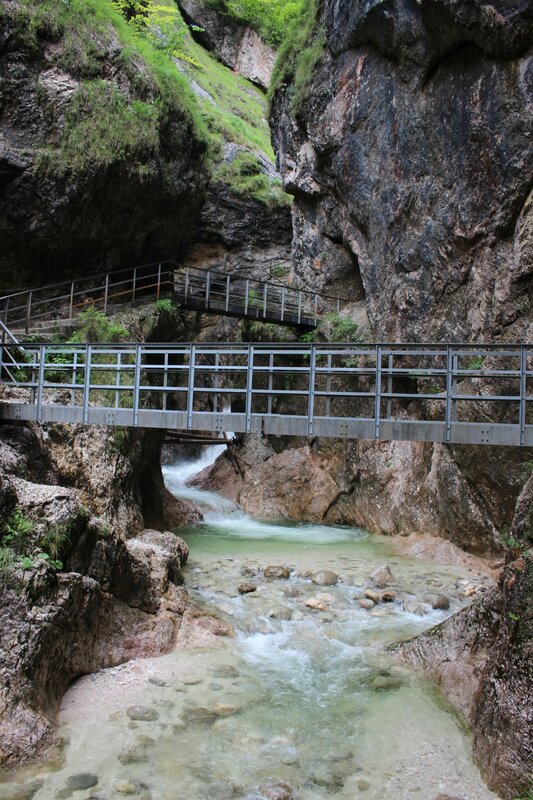 The Almbach Gorge (Almbachklamm) is not the most obvious of attractions around Berchtesgaden, but it was the perfect complement to our morning at the Konigsee. 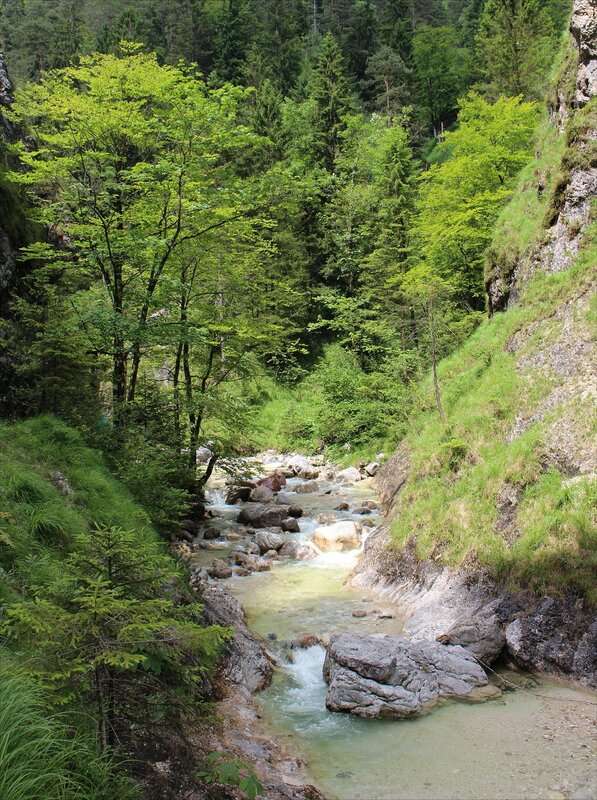 Where the lake presented us with a vista of immense scale the gorge gave us an intimate walk alongside the rushing waters of the Almbach with hardly a soul around. 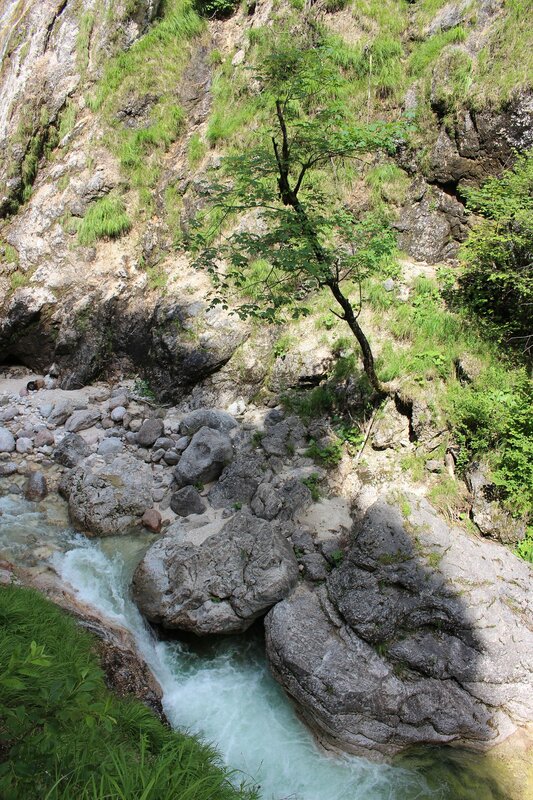 We started out at the Kugelmühle (marble mill), paid up three euros each for entry (at a small hut at the beginning of the trail) and began our trek. The trail presents a succession of watery delights that prompts many an oooh or ahhh as it twists and turns, rather than a single standout feature. 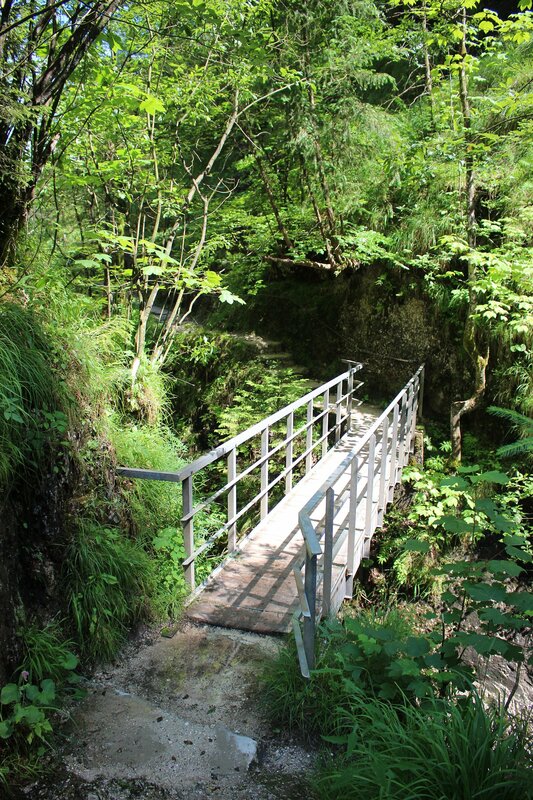 The full 2.8km distance of the trail takes you along a path that hugs the rock walls, up 320 steps, over 29 bridges and through one tunnel. 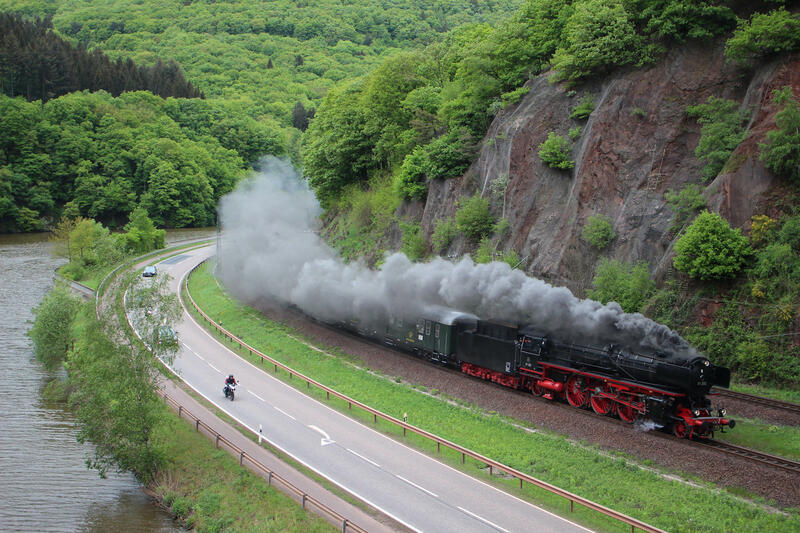 The original route was constructed in four weeks by 250 soldiers of the 1. 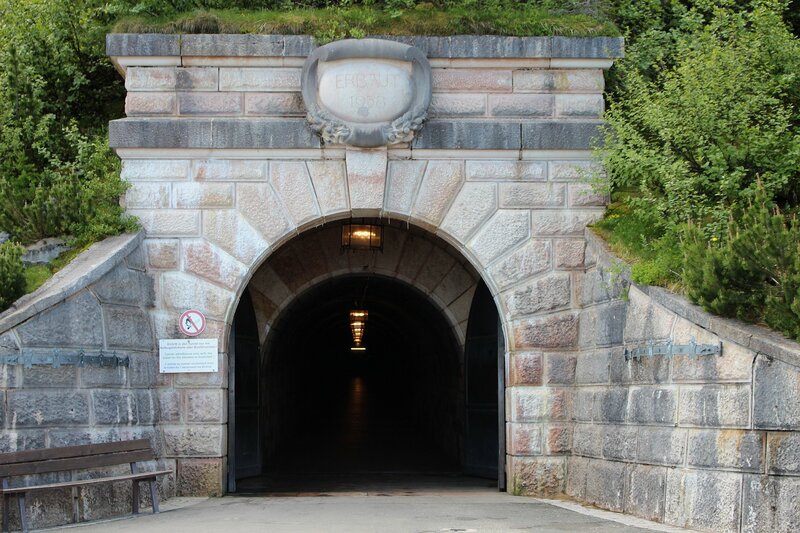 Ingolstädter Pionierbatallions in 1894 (look out for the marble tablet at the tunnel entrance commemorating their achievement) though the dam itself is a good 60 years older. 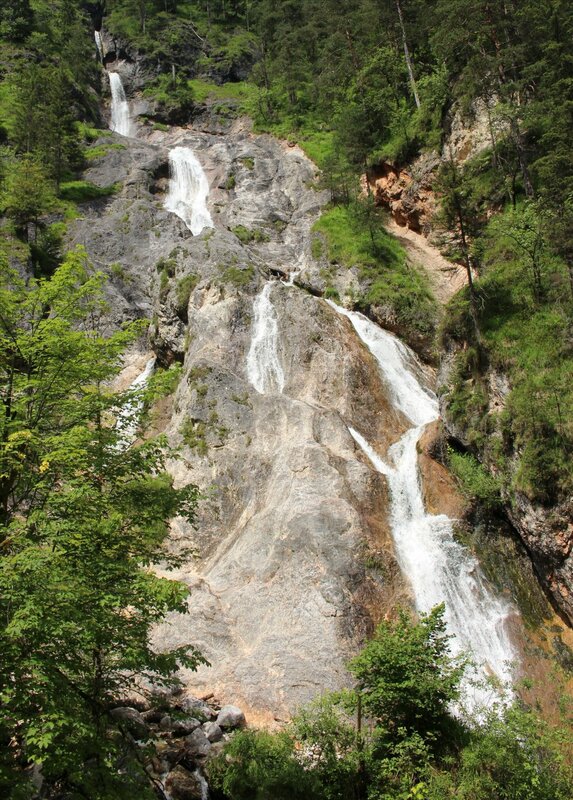 If you take the trail all the way you will find yourself at the Theresienklause dam (named after Therese of Bavaria, the wife of King Ludwig I) but we cut the route a little short, turning round after reaching the Sulzer waterfall. 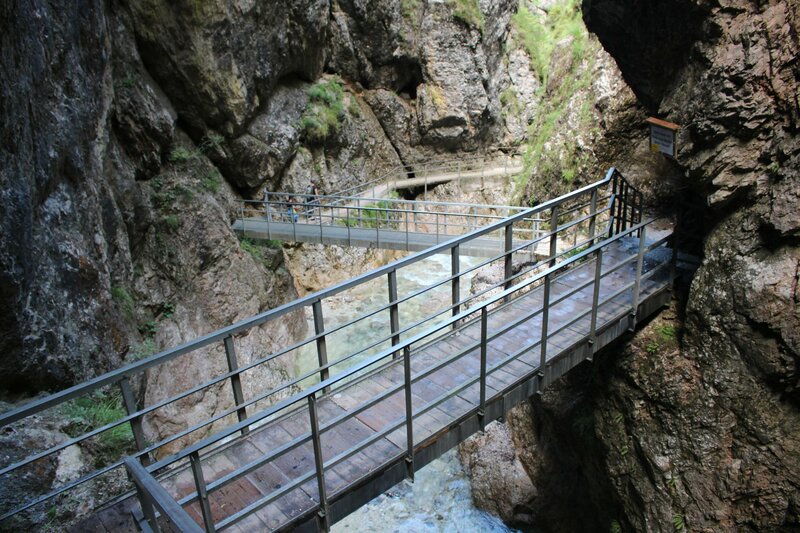 A shower was unavoidable if you wanted to cross the bridge! At the outset I thought it would be a pleasant walk but probably nothing more than that, deliberating long and hard over its inclusion in our itinerary. Instead, I was completely taken back by how delightful and enjoyable an experience it was and am rather surprised to say that it was the highlight of our day. 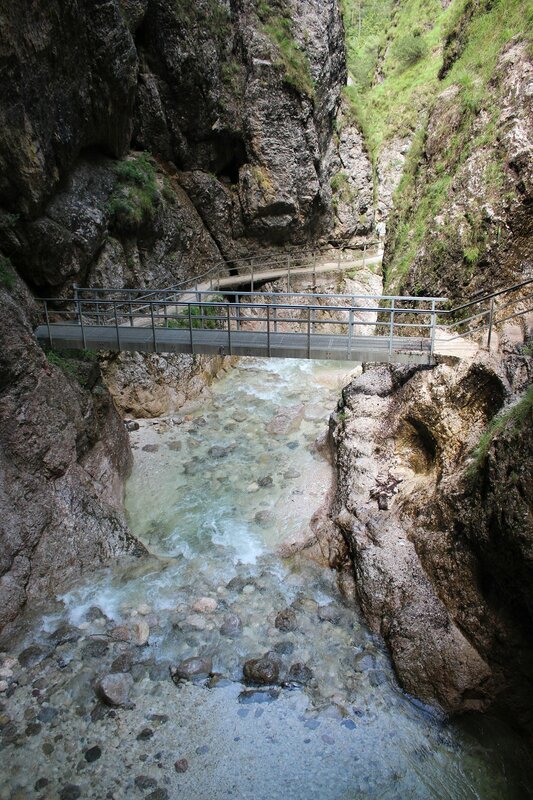 We took the 840 (Berchtesgaden-Salzburg) bus to reach the gorge and there are two bus stops within easy reach of the start of the trail. 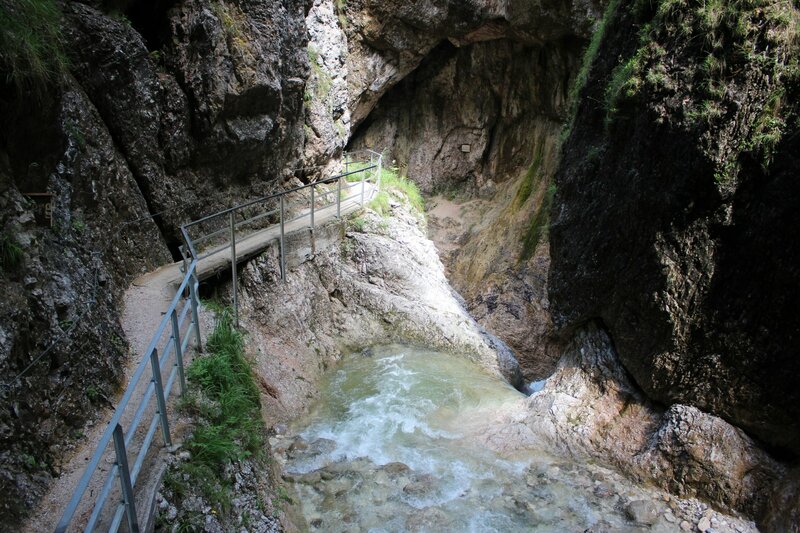 We got off at Almbachklamm on our way to the gorge and this takes you on a signed route past the Gasthaus Almbachklamm, through a field and then alongside a river (The Berchtesgadener Ache) to the marble mill (Kugelmühle). 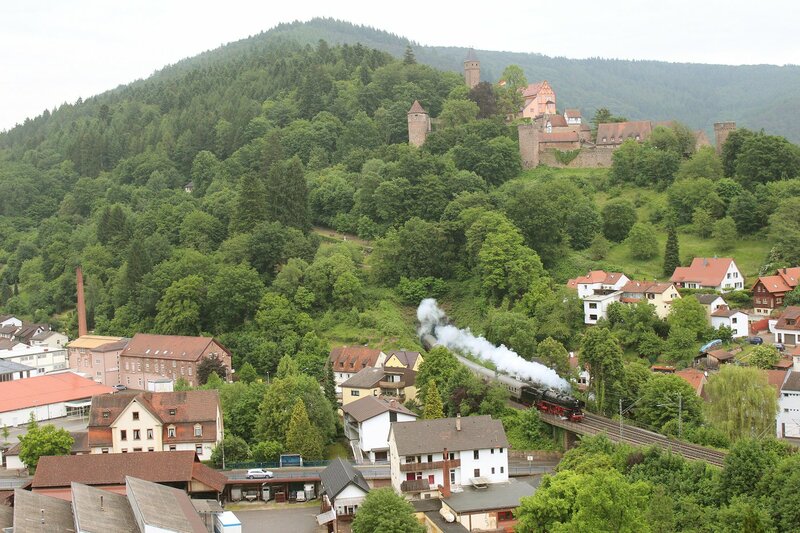 On our return we walked from the mill down Kugelmühlweg to the second bus stop (Kugelmühle Marktschellenberg) and this is clearly a little closer. 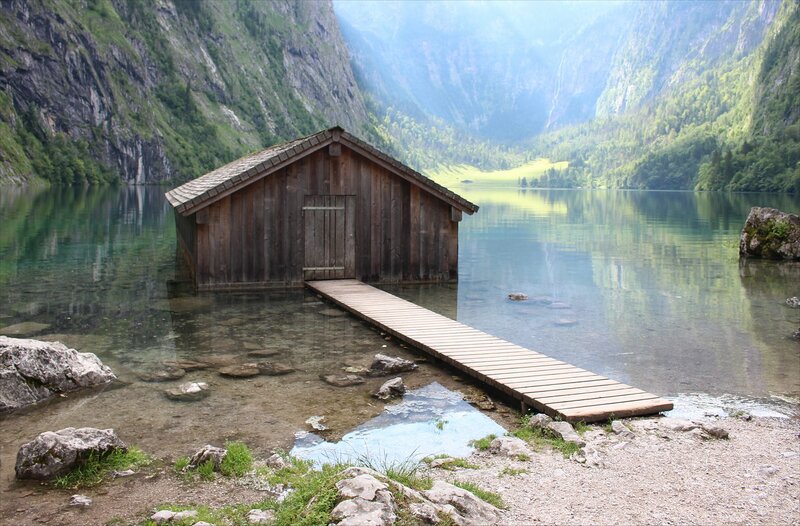 One of the most alluring spots in Germany is to be found at the Königssee in the Berchtesgaden National Park, close to the Austrian border. 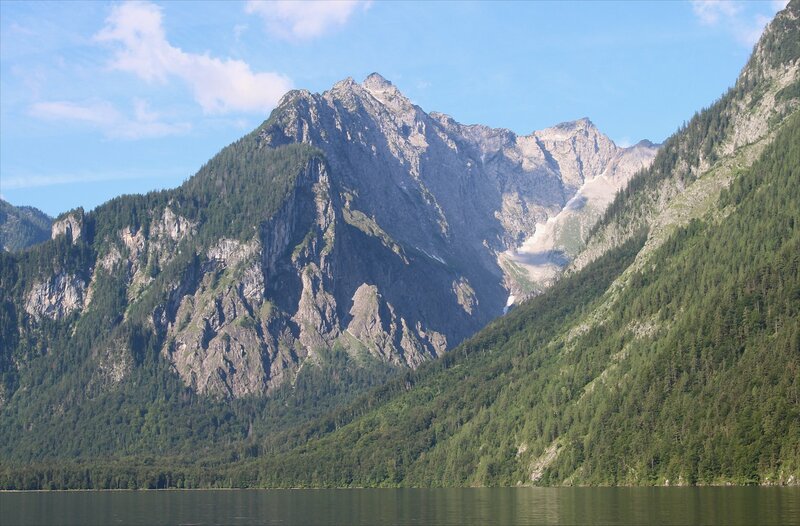 The lake is surrounded by mountain ranges and you could be forgiven for thinking that a fjord has accidentally got stranded in the Bavarian Alps. 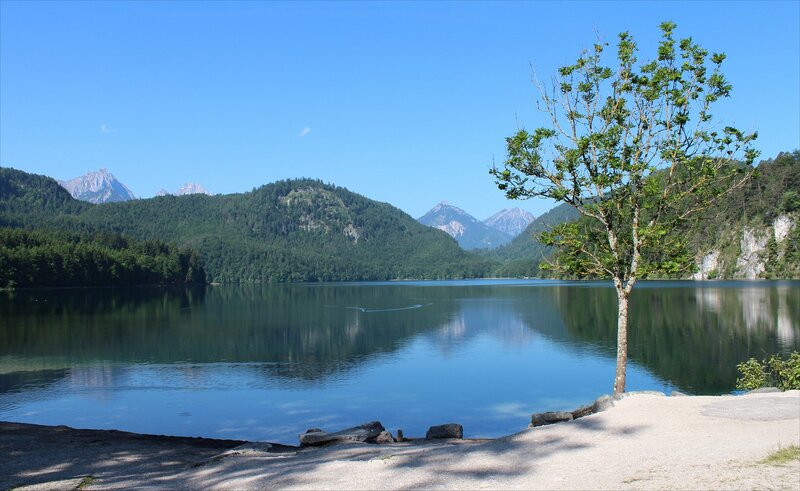 It is not exactly a secret, as over 2 million visitors make their way here each year and the lake was ranked the 12th most popular attraction in Germany for 2015 by the German National Tourist Board. 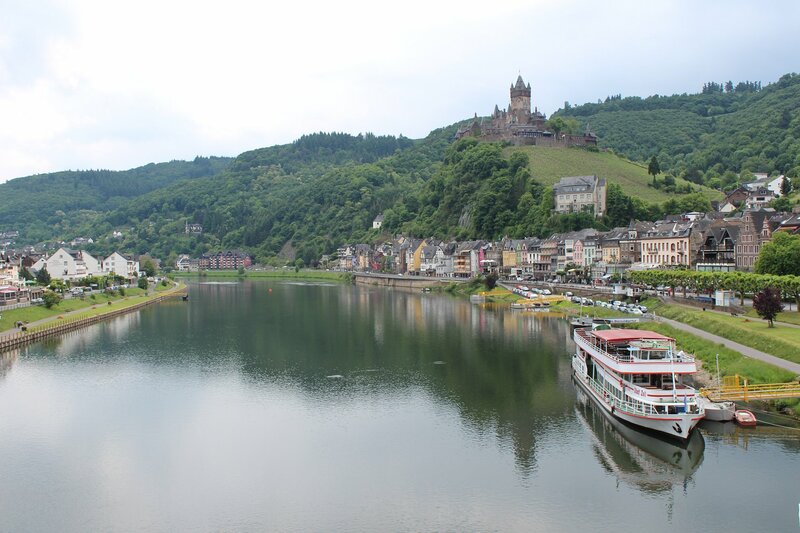 However, the Bayerische Seen-Schiffahrt are well prepared for this with a fleet of 17 electric boats to ply the lake on the run between Schönau, Kessel, St. Bartholomä and Salet. 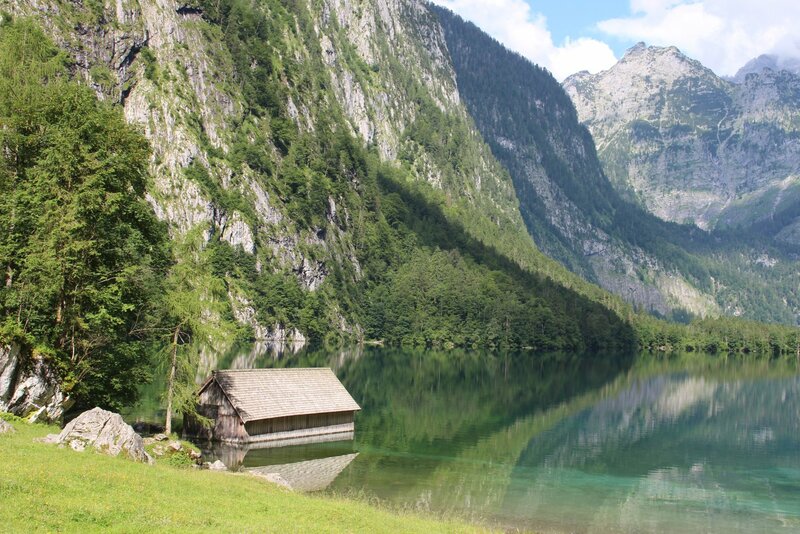 The waters of the Königssee are beautifully clear and this is one of the unintentional legacies of Prince Regent Luitpold whose concerns led to the introduction of environmentally friendly electric boats out of a fear that noisy ships would scare away his prey on hunting trips in the lakeside forests. 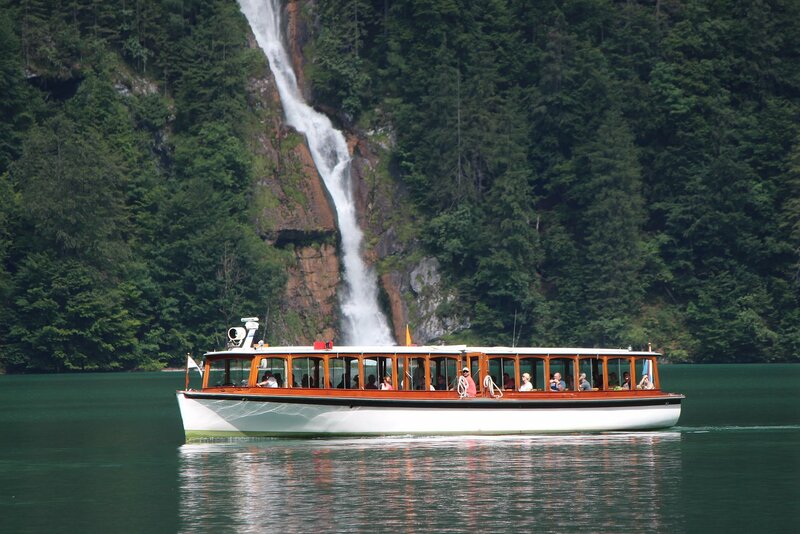 The first electric boats were introduced in 1909 to connect up with the sadly long vanished branch line from Berchtesgaden. 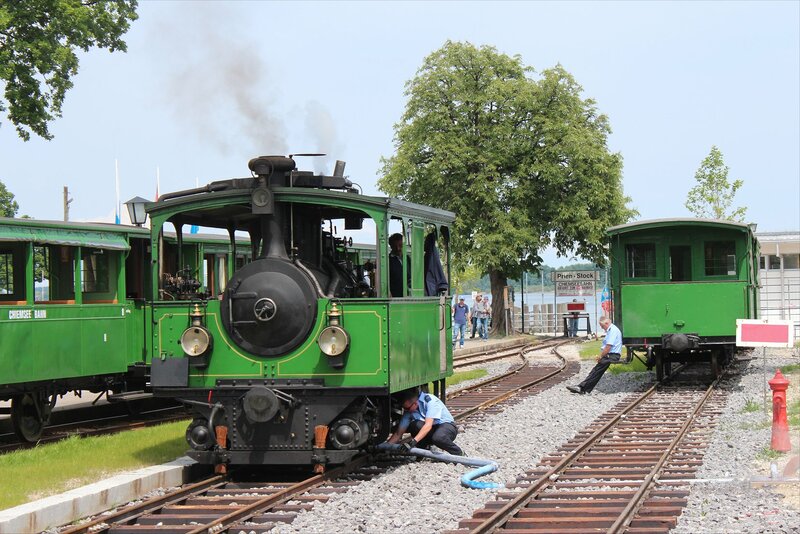 Today’s boats date back to 1958 and are beautifully maintained in the company’s own shipyard, though the engines are modern replicas of the originals. 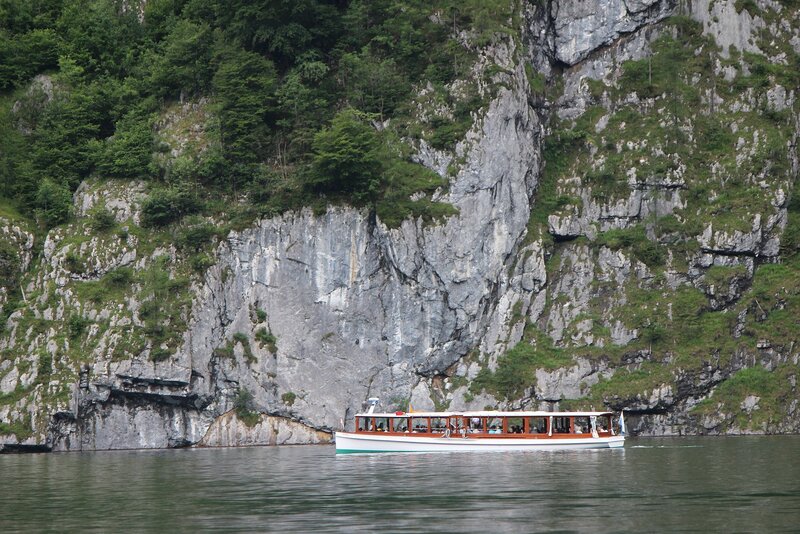 Each boat travels about 120km a day, working the 7.7km length of the lake at an average speed of 12km per hour. 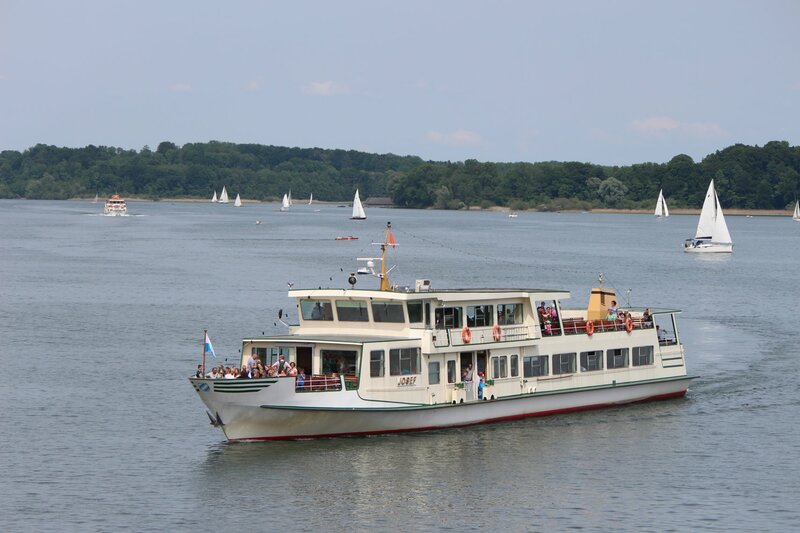 The boats take 93 passengers each and they certainly need that capacity as the crowds were immense in the middle of the day. 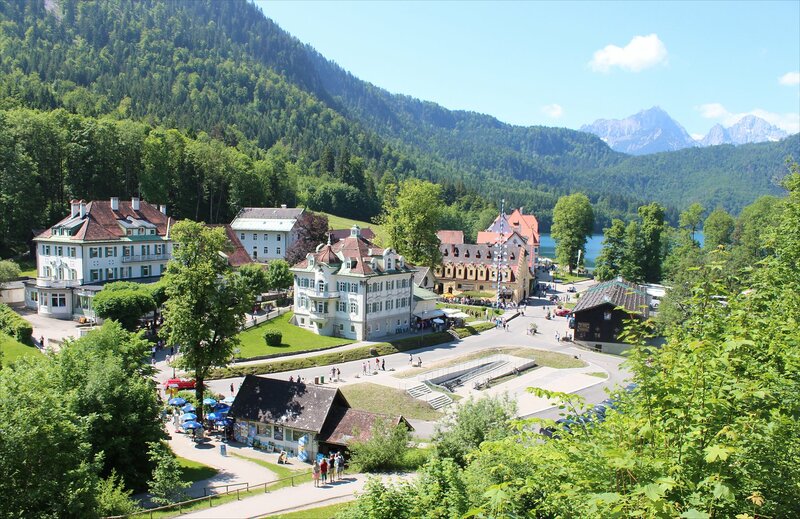 The advice we were given before starting our day trip was to get to Schönau am Königssee as early as possible as long queues can build up for tickets and to board the boats. An early start got us to the lakeside, tickets in hand, ready to take up the last few seats on the first ferry of the day at 8am. 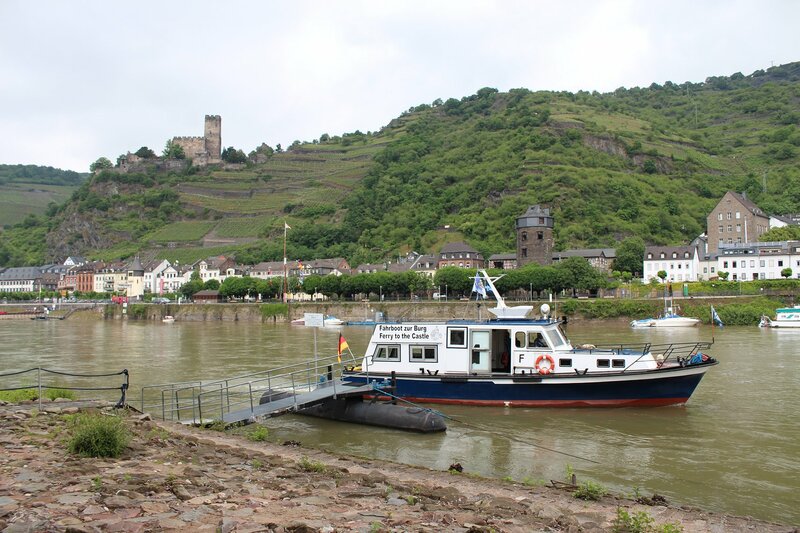 After this ferries run every 15 to 30 minutes, subject to passenger demand. 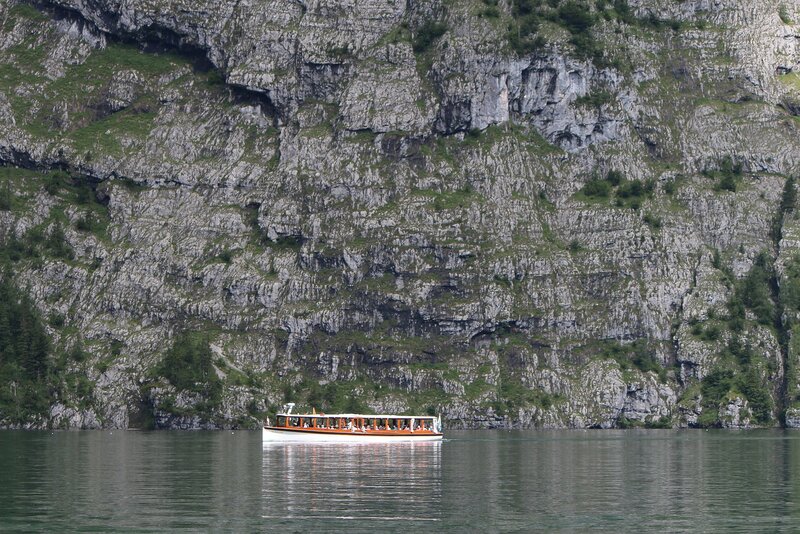 Our passage across the lake was incredibly smooth, starting with a terrific view of the sheer cliffs of the Falkensteiner Wand. A small red cross at the bottom of the cliffs here stands as a memorial to a boat of pilgrims which sank here during a thunderstorm in 1688 with the loss of 70 lives. A little farther out the captain cut the motor and clambered along the outside of the boat to the mid-ship doorway. 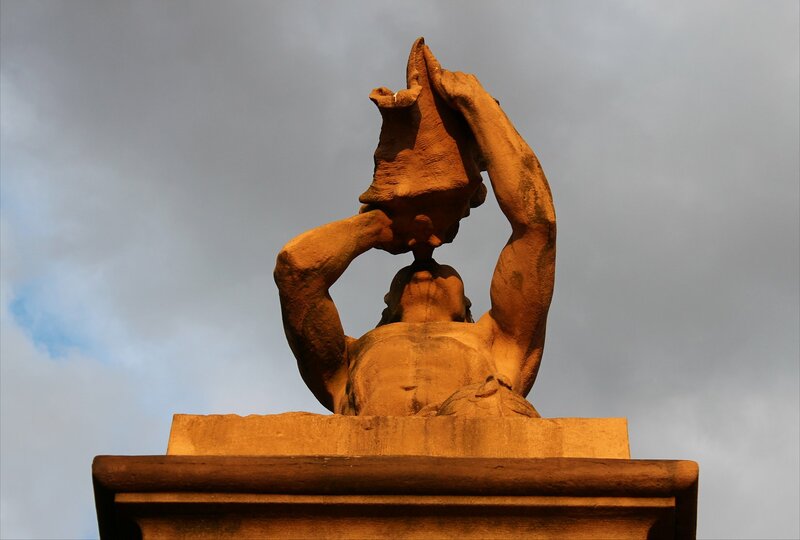 To our astonishment the captain lifted up the steps, pulled out a flugelhorn (a trumpet) and proceeded to play a tune (badly) pausing every now and again so that we could hear how the sound echoed across the lake, effectively playing the tune back to us. 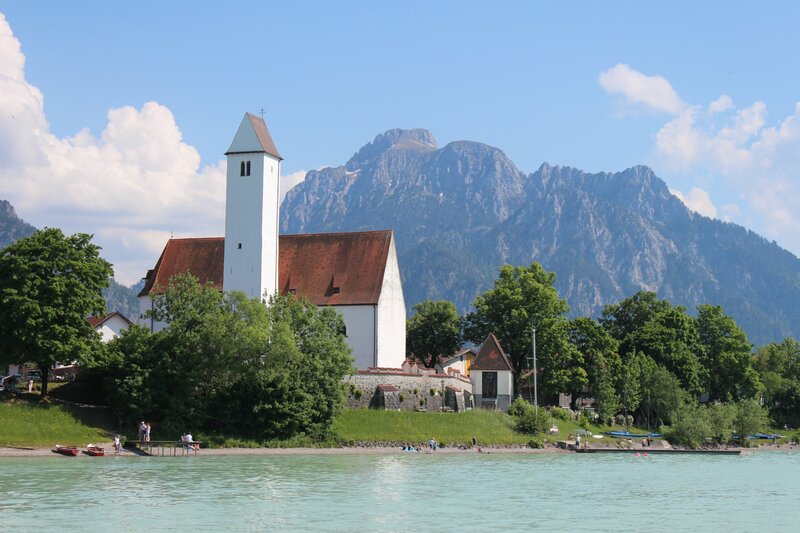 As the boat made good progress across the lake we could see the view open out to give us the iconic sight of the 17th century chapel of St. Bartholomä with the Steinernes Meer (stony ocean) mountain range beyond. 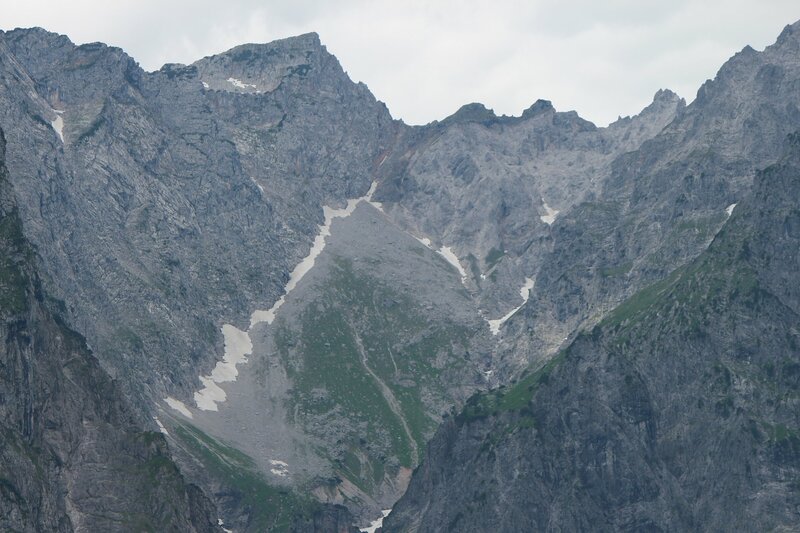 We made short stops at Kessel, a jumping off point for hikers, and St. Bartholomä before reaching Salet, the stop at the far end of the lake. 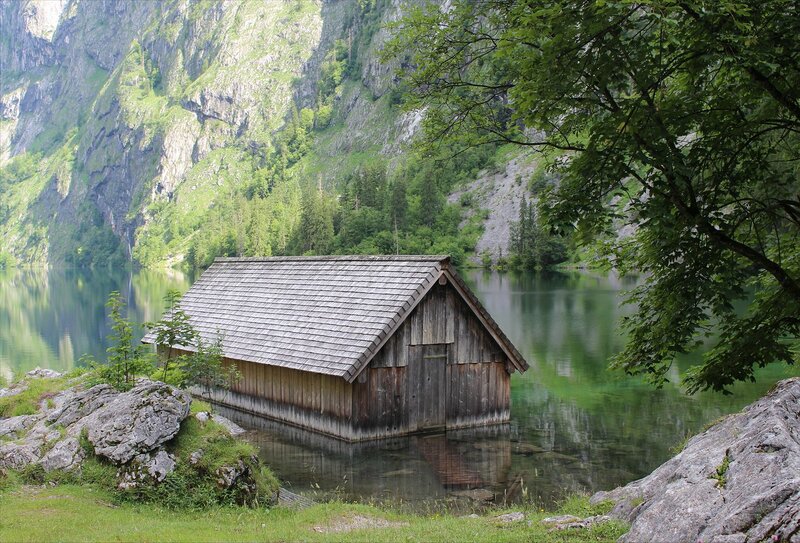 We disembarked at Salet and took the short walk to a viewpoint across a second lake, the Obersee. 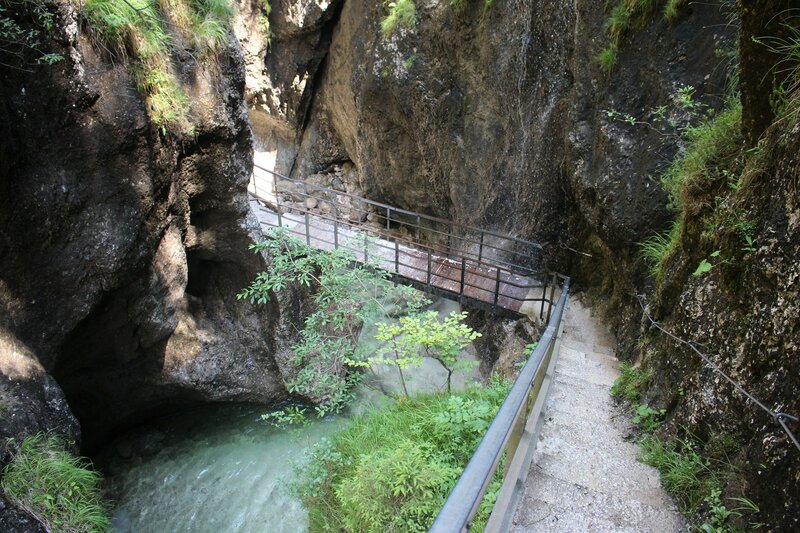 Feeling like a bit of exercise we followed the pathway (and a a slightly slippery set of rock steps) around the edge of the Obersee to a viewpoint at the other end. 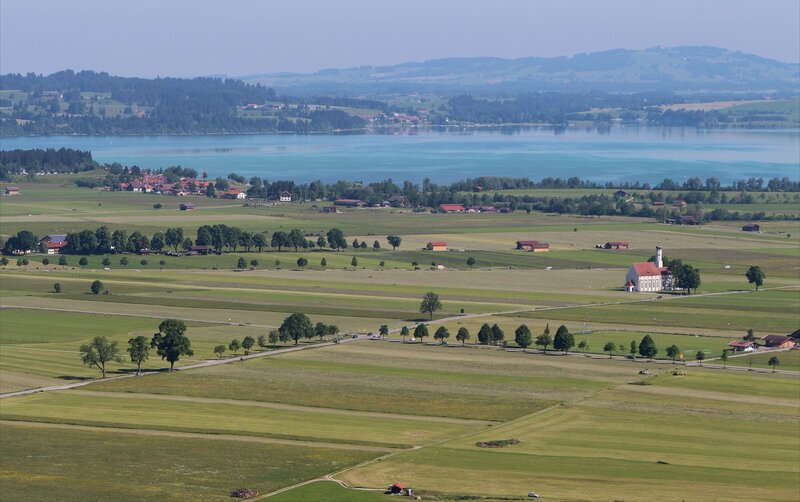 The reward was a terrific view across Fischunkel pasture and the lake with Mount Watzmann in the background (the third highest mountain in Germany, reaching 2,713m at its peak). 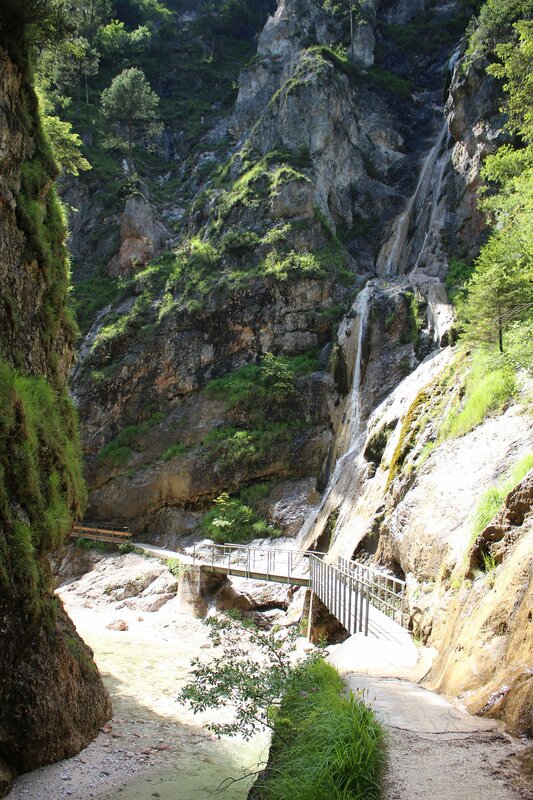 It is possible to walk up to the Röthbachfall, the highest waterfall in Germany, from this point but we opted to make our way back to the dock at Salet. Boats were now queuing to dock at Salet and whilst they were all pretty packed on arrival they were mostly empty on departure (our boat only carried seven passengers). 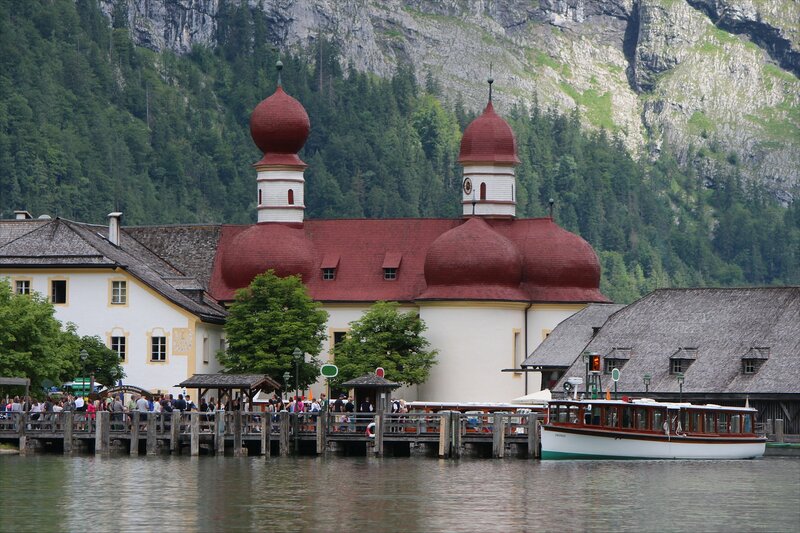 The Königssee was much busier than when we set off on our outbound journey with a line of boats stretched across the length of the lake. 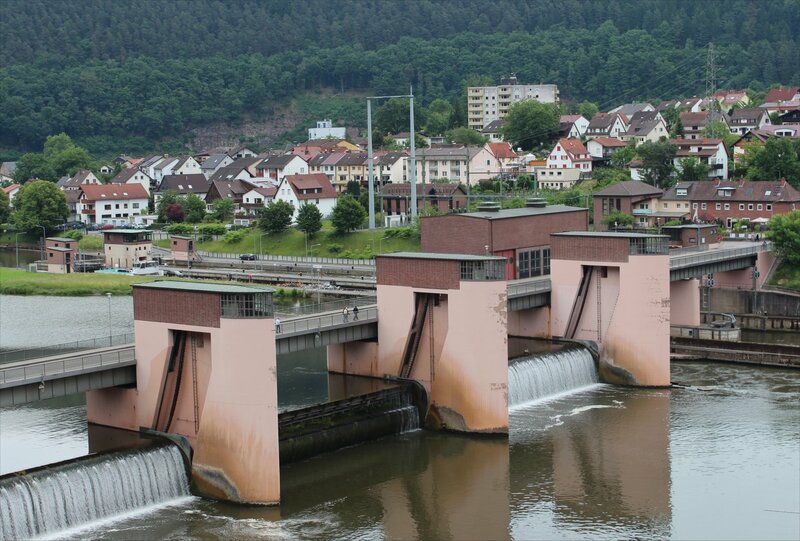 When we reached Schönau we could see that they were now loading boats three at a time and yet there were still large queues. The whole place was absolutely heaving with visitors! 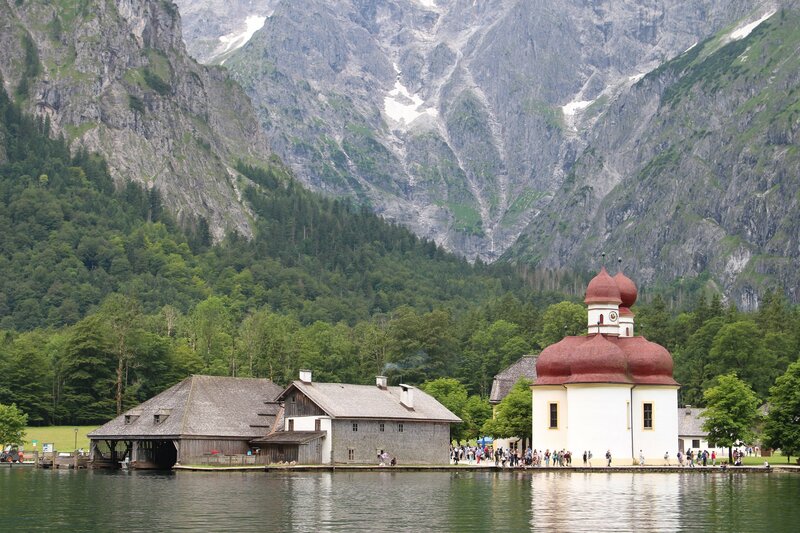 A visit to the Königssee was high on my list for a while and I enjoyed the half-day excursion tremendously, but even with the warnings I really hadn’t appreciated how busy this place would be on a mid-week morning in late June. 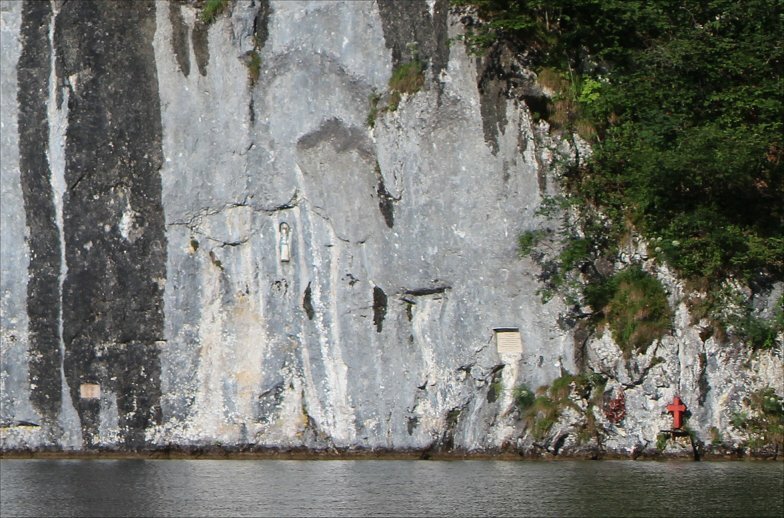 Don’t let me put you off though, the natural splendours of the lake are well worth the trouble. 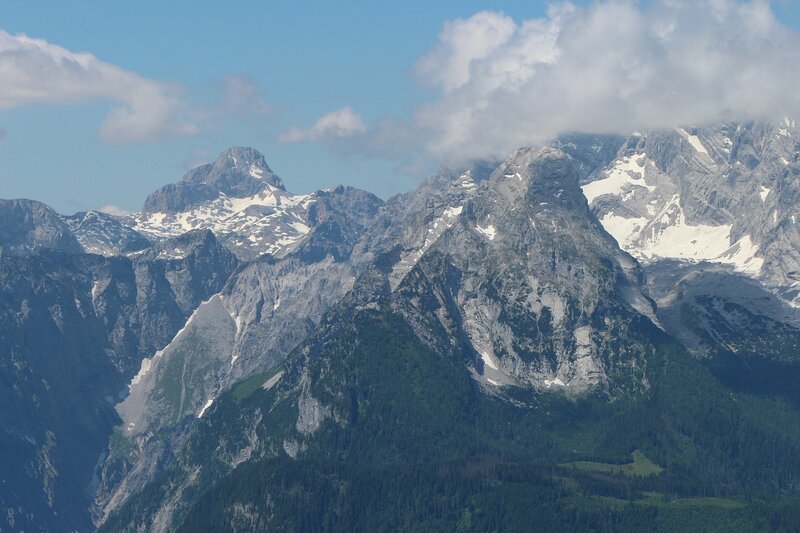 We opted for a mid-week day trip as this gave us the opportunity to take an earlier bus to Berchtesgaden (the first 840 ‘Watzmann-Express’ bus departs from Salzburg Hbf at 6.35am on weekdays compared to 9.15am at the weekend). 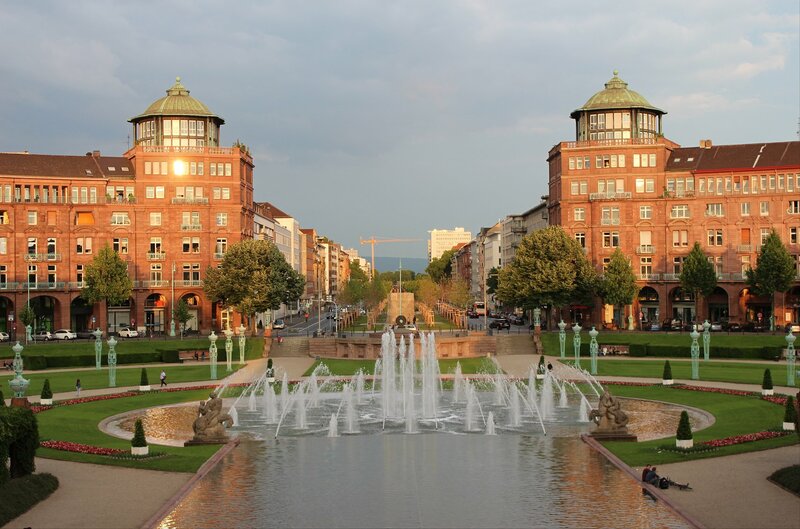 The bus leaves from Stop G on Karl-Wurmb-Straße, rather than from the cluster of stops directly outside the station. A Tagesticket der RVO for two people cost us 19.60 euros and covered all our bus journeys for the day. 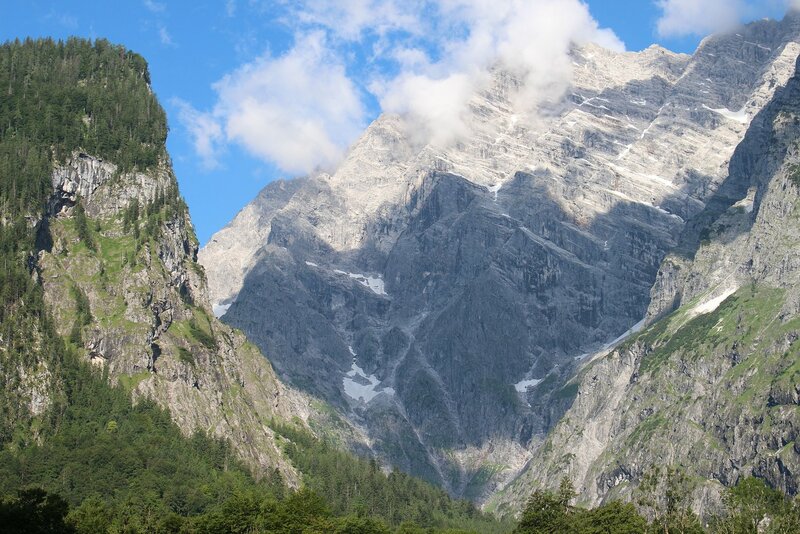 The early morning 840 reached Berchtesgaden at 7.24am, giving us an 11 minute wait for the departure of the number 841 bus to Schönau am Königssee. The second bus ride was relatively short at just 17 minutes. 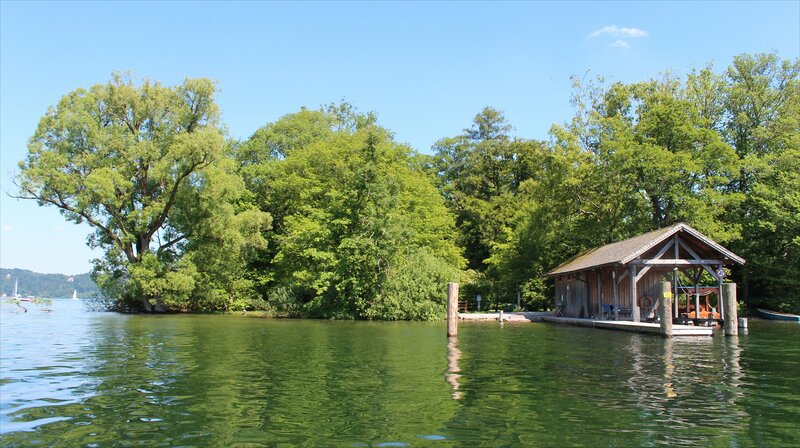 A short stroll along Seestraße (lined with cafes, ice cream parlours and souvenir shops) brings you to a ferry ticket booth by the lakeside (only one counter was open when we arrived but there are three counters in use at busy times). Lengthy queues start to form from 9.30am on summer mornings, but we only faced a short queue arriving just before 8am. 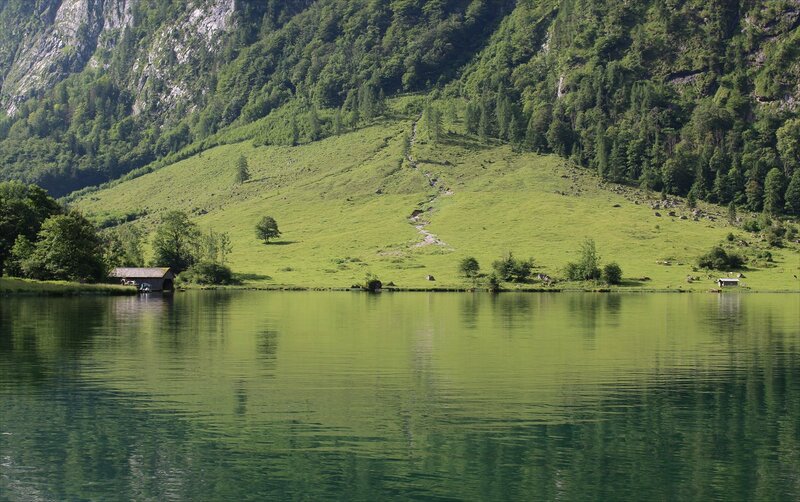 There are a couple of possibilities for buying food/drink at the far end of the lake – a self-service restaurant at Salet (Alpengaststätte Saletalm) and a servery at the Fischunkel pasture which offers a modest selection of savoury options (such as bread with cheese or ham), beer and radler. We had brought lunch with us so can’t offer any opinion on either establishment! 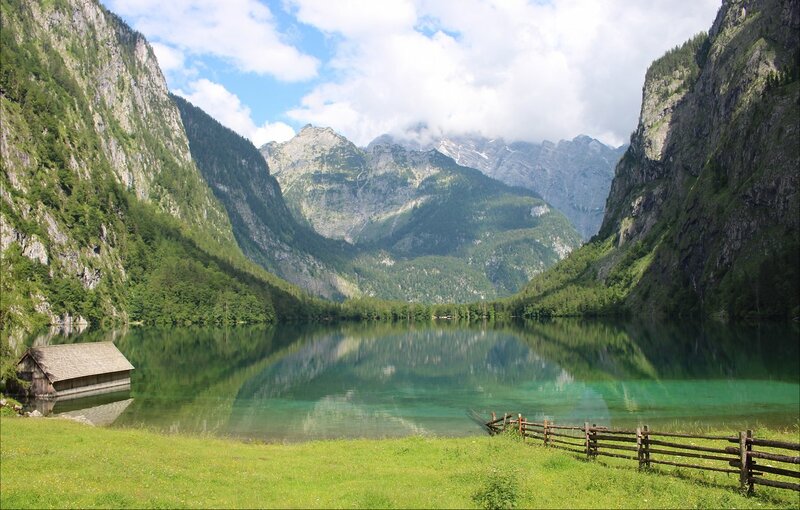 You can make a trip to the Königssee as leisurely as you like within the contraints of the ferry timetable and there are plenty of options for hikes (from Salet to the Röthbach waterfall, from St. Bartholomä to the ice chapel at the foot of the Watzmann and from Kessel into the mountains). 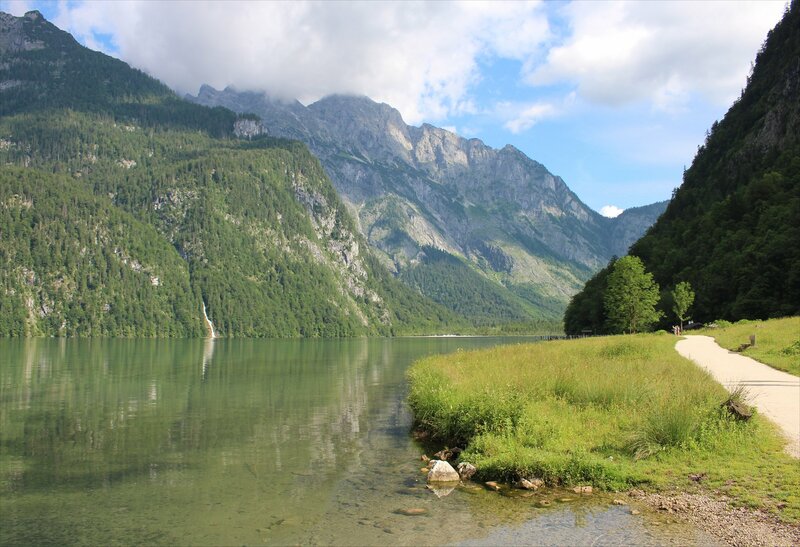 We opted to spend just half a day at the Königssee, combining it with a trip to the Almbach Gorge just outside Berchtesgaden (on the route of the 840 bus towards Salzburg). More about that in the next post! 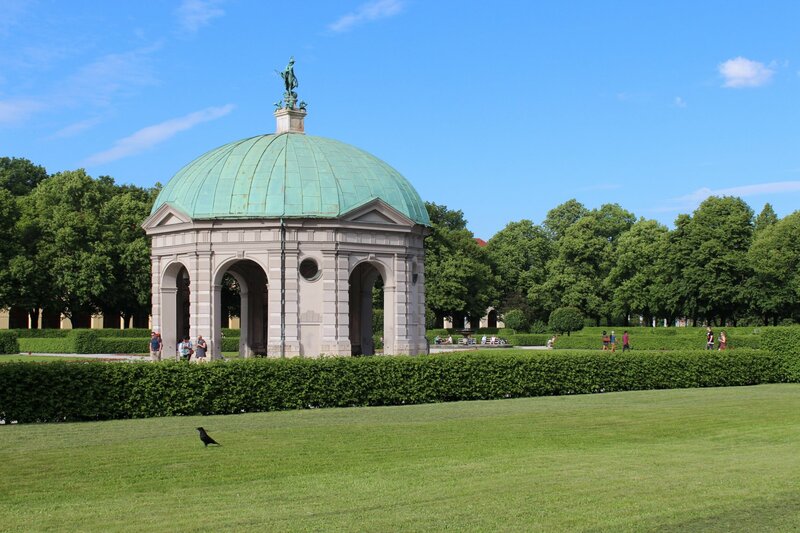 The trip was all but over and we had barely seen anything of Munich itself, apart from a trip to the Residenz and Nymphenburg Palace on the day we arrived. To rectify this glaring gap we made an early start on our last day and set off on a wander. 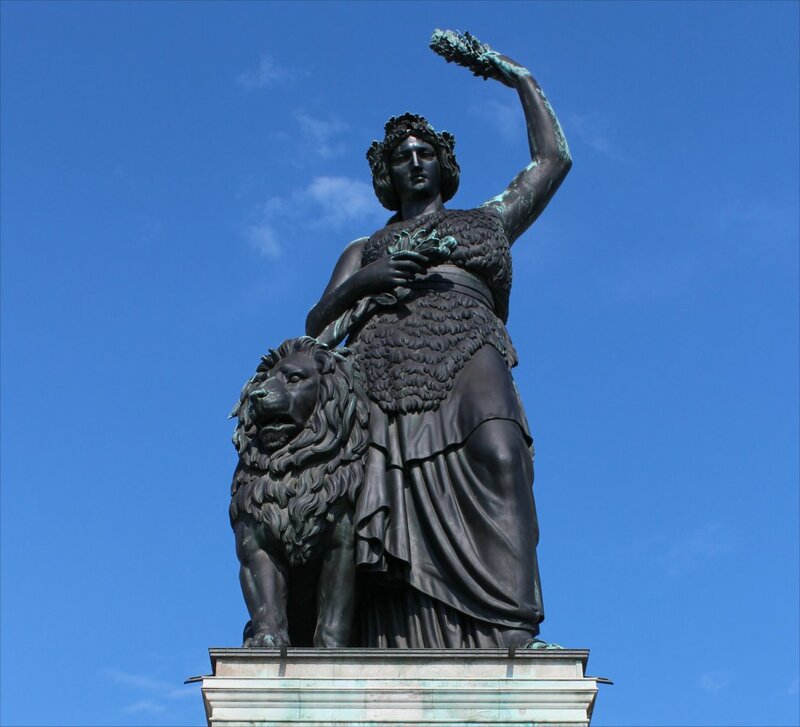 Appropriately enough, our first stop was Bavaria, or rather the embodiment of Bavaria in bronze that was unveiled in 1850. 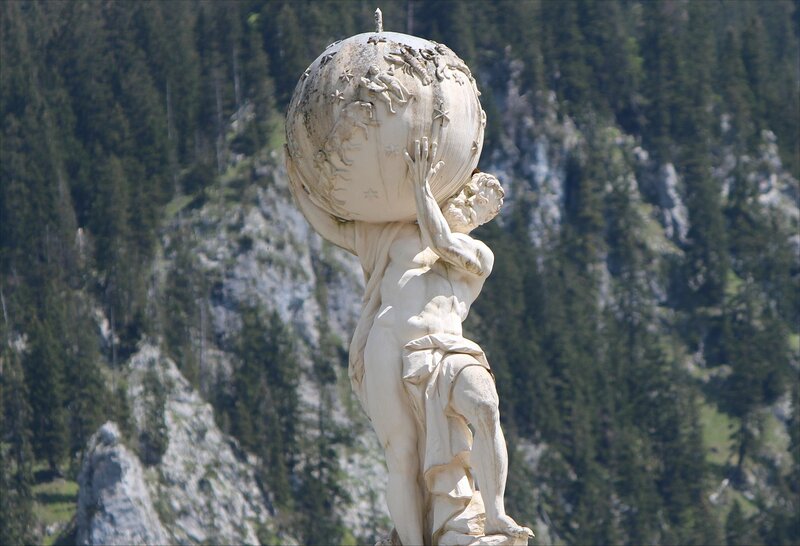 It is a huge sculpture and remarkably advanced for its time. 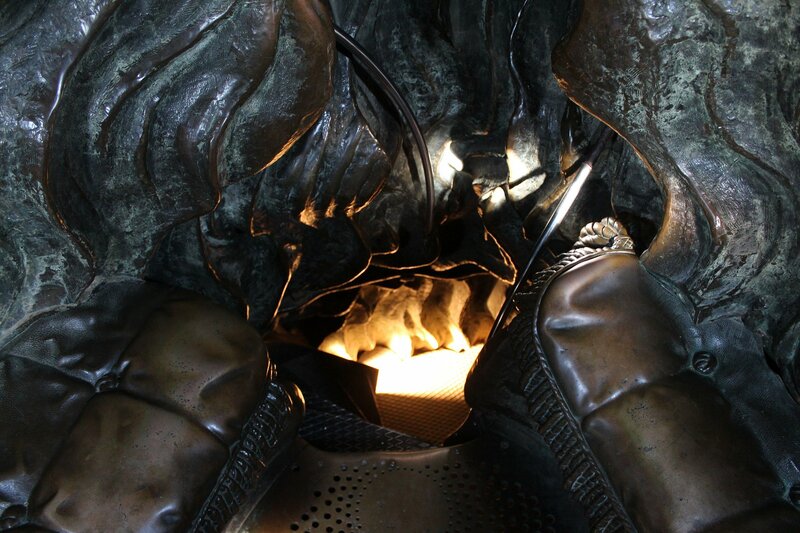 You can climb up the inside of the sculpture and peer out of a few openings in an incredibly tight chamber, reached by the most awkward staircase that I have come across. I was the only one inside at the time of our early morning visit so no-one could witness the indignity of my attempts to clamber and crawl into this space! It was rather strange being inside the head, a bit like seeing everything from the inside of a jelly mould. 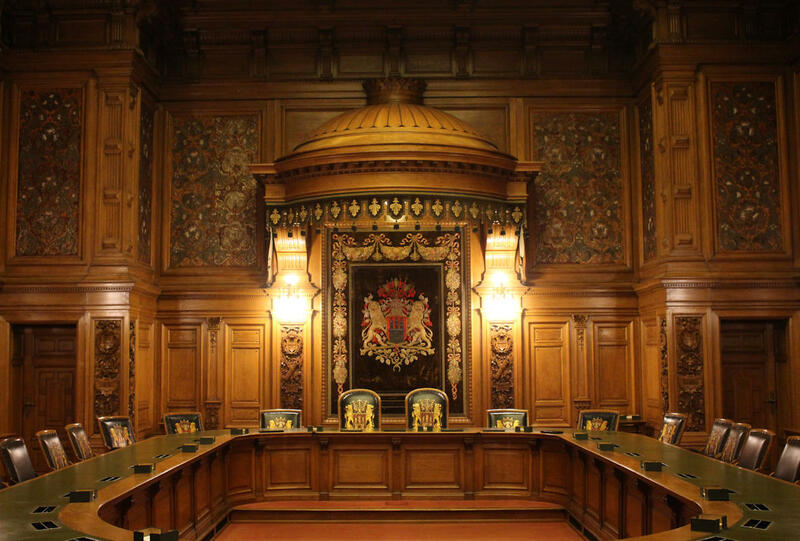 The seats at the top have been rather wonderfully designed to look like they are cushioned, though they too are made from bronze. 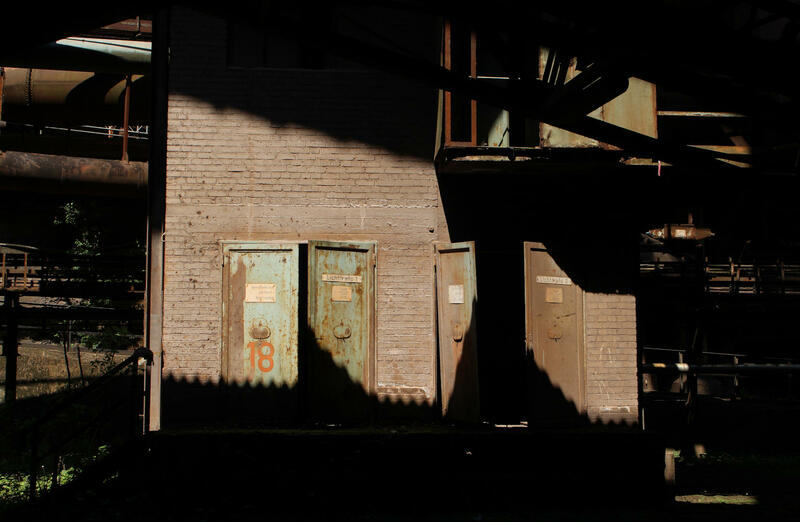 Thankfully the temperatures were not as high as yesterday but it still felt like an oven inside there – what on earth must it be like in the midday sun!? 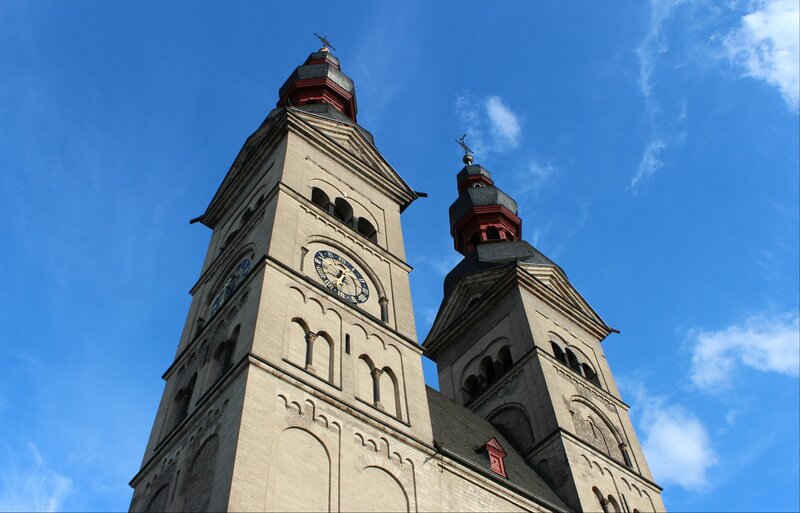 Our morning then took us on a trail of stunning churches, including St Pauls, the Burgersaal, St Michaels, the Frauenkirche, the Asamkirche and the Ludwig kirche – all stunning in their own ways. From our last stop we took a combination of metro and S-Bahn to get back to the airport for our late afternoon flight home. An hour’s delay to our flight provided a welcome opportunity for one last radler to toast Bavarian hospitality. 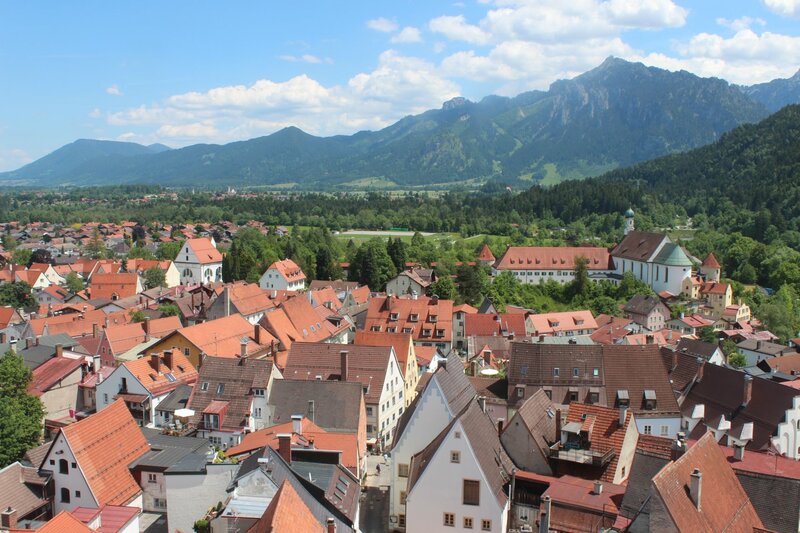 I have thoroughly enjoyed our trip to Bavaria and alongside the spectacle of the palaces it has been a pleasure to be delighted by unexpected exhibits (such as the golden model of Trajan’s column in the Residenz Treasury), seduced by the natural beauty of the countryside and wowed by surprising interiors (such as the dome at the Kloster Ettal). Occasionally it is nice not to have done your homework and find your breath taken away when you least expected it. 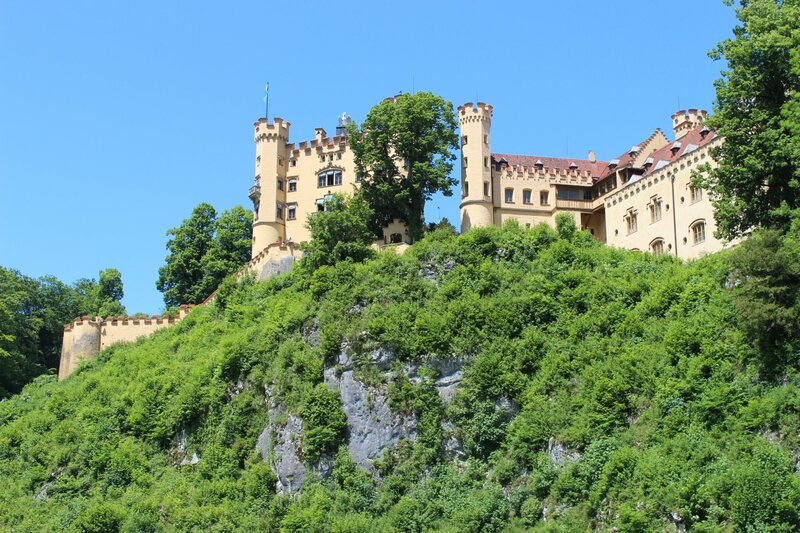 It’s astonishing how many wonderful sights are packed into Bavaria and it is no wonder that we barely dented the list of places we wanted to see. I expect we will be back before long! 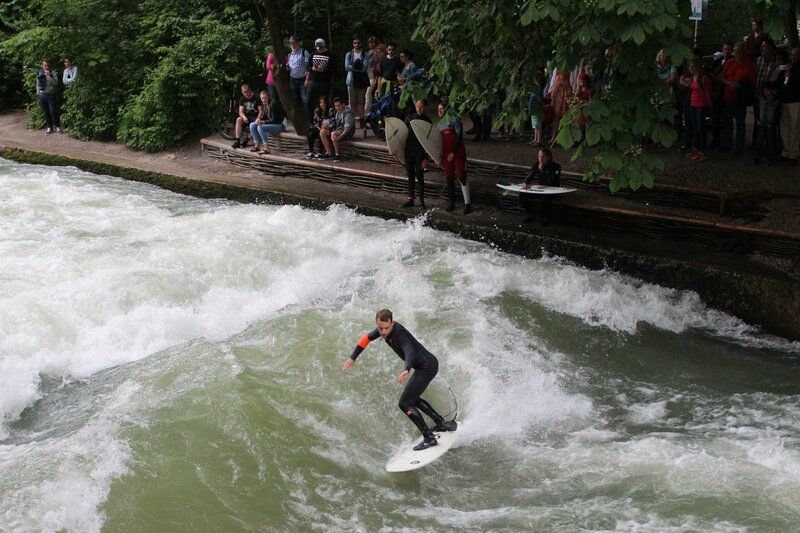 One of the unexpected pleasures of our trip to Bavaria was the opportunity to see surfing in the most unlikely of locations – Munich city centre. 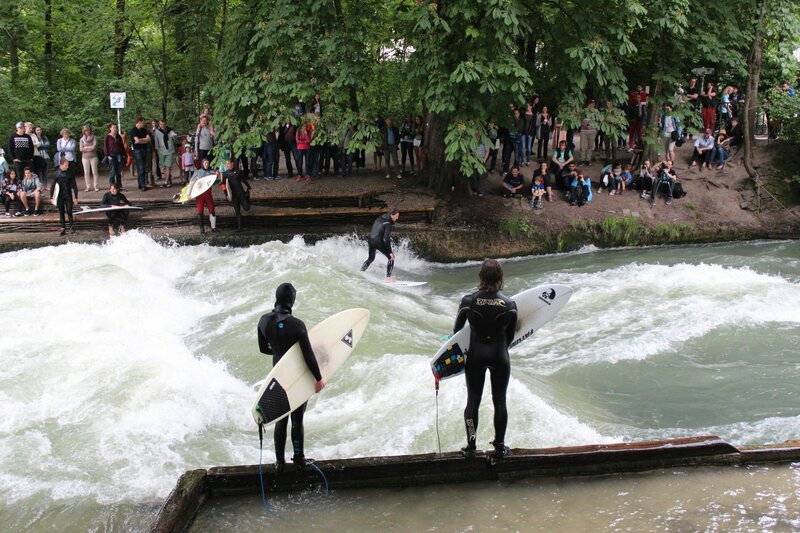 Surfing takes place most days on the Eisbach, a man made stretch of river that runs parallel to the Isar, next to the Haus der Kunst. It’s quite easy to spot as you wander along the street as there is usually a large crowd on the bridge watching the action (as well as on either bank). 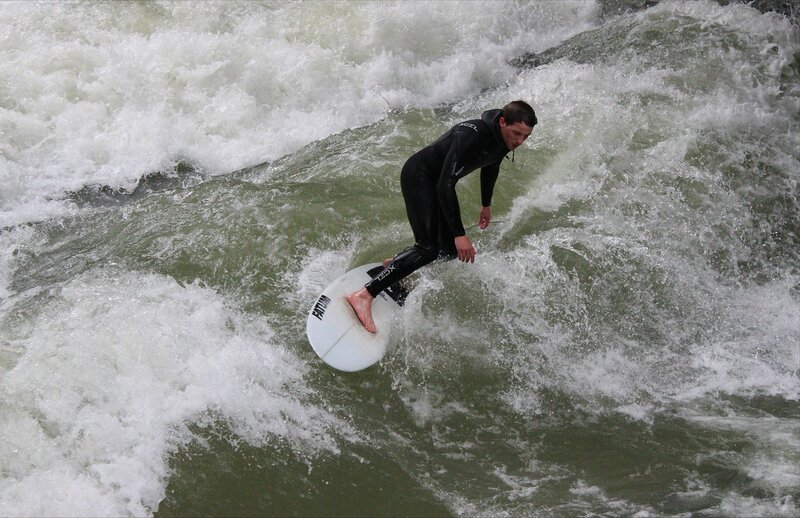 Although the summer is the obvious time to see some surfing here it’s clearly an all year attraction for some surfers – there are plenty of pictures of surfing taking place whilst thick snow covers the riverside! 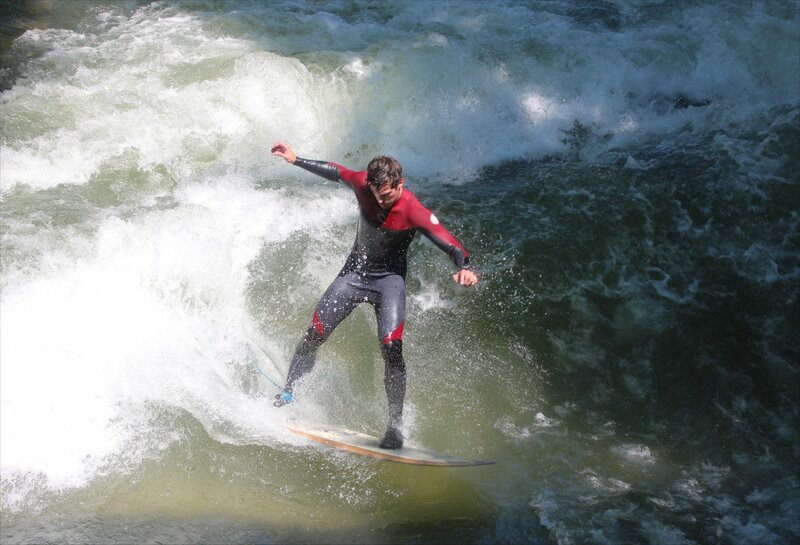 The appeal of the spot is easy to see – the river forms a standing wave that is about a metre high. 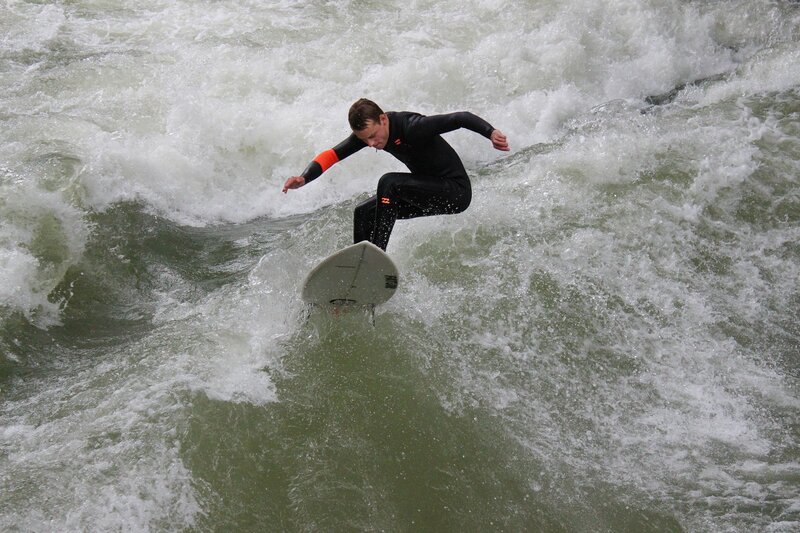 Surfers line up on either bank and take it in turns to tackle the shallow, icy waters. I’m no expert but it looked like a tricky spot to master, particularly as the water masks a series of concrete blocks inserted into the riverbed by the builders. 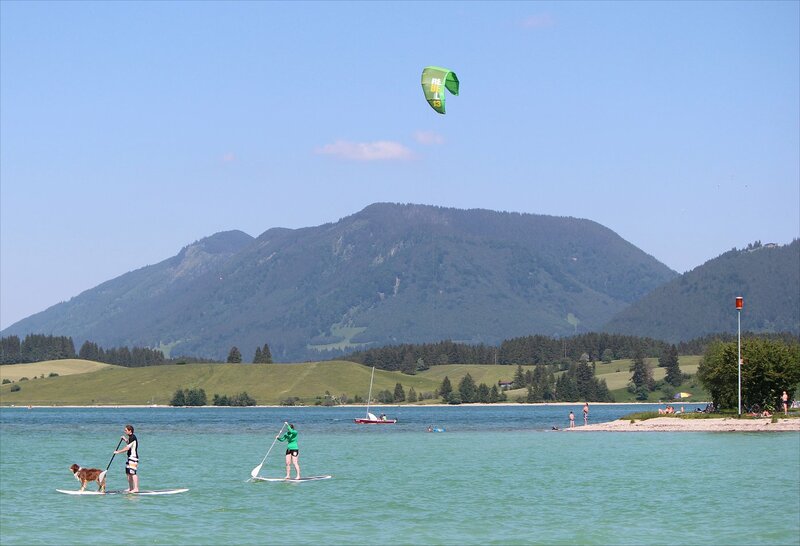 An unlucky fall here can have nasty consequences for bord and body so the inexperienced are generally discouraged from taking their chances – there’s another spot at Floßlände in Thalkirchen where the conditions are better suited to beginners. 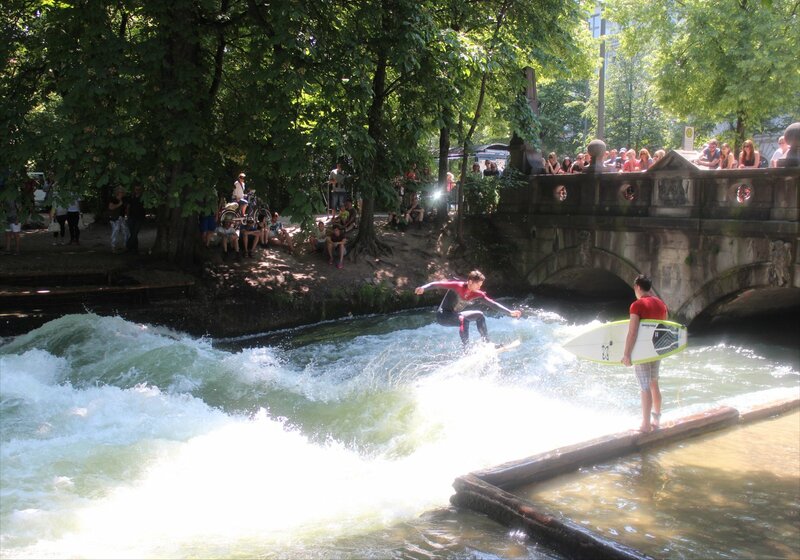 A few years back there was a proposal to demolish the wave on safety grounds which generated an incredible surge of opposition from around the world. 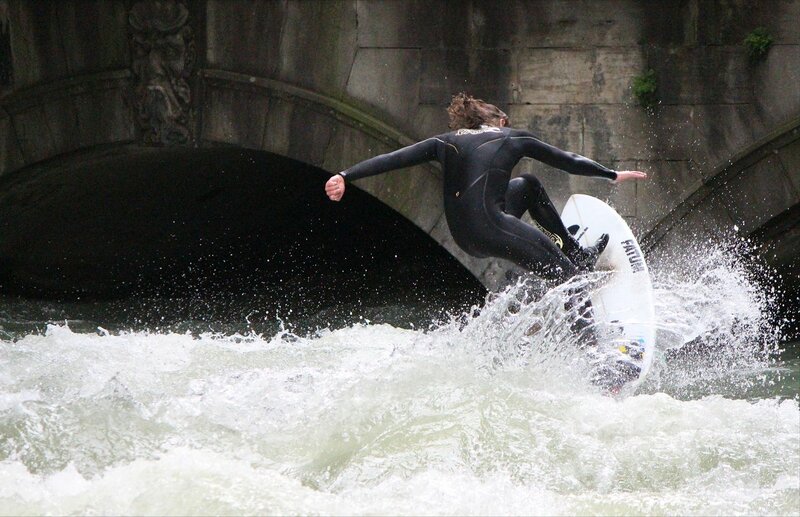 The plans were dropped and surfing has been officially accepted since 2010. It is astonishing to think that the tradition of surfing here has already entered its fifth decade, having started in the early 1970s. It is entrancing to watch surfers riding the wave, making their way from side to side, until they accept the inevitable and take the plunge into the icy waters. 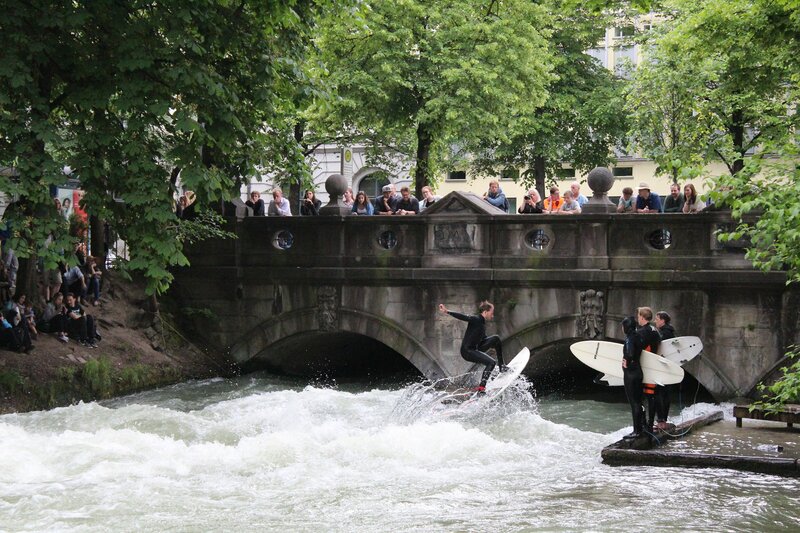 Long may this brave band of surfers continue entertaining tourists and locals! 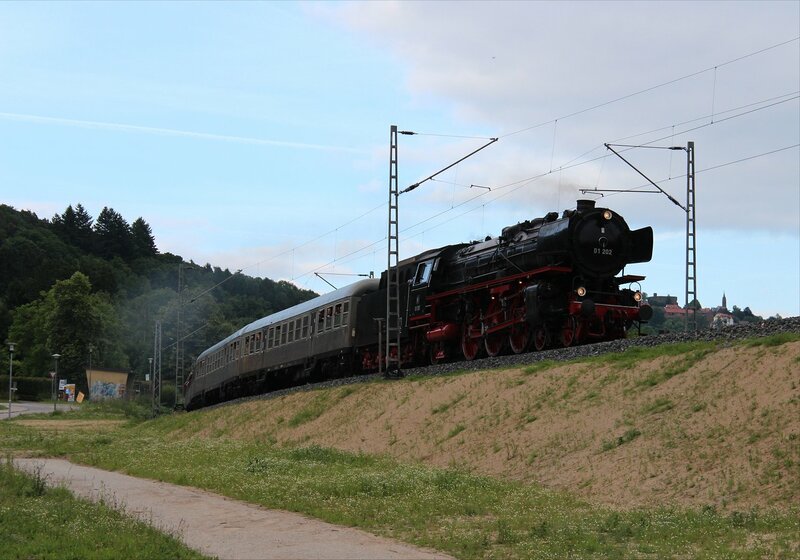 Although my trip to Bavaria was not designed with railway photography in mind, it would have been remiss to have passed up the opportunities that arose on our travels. 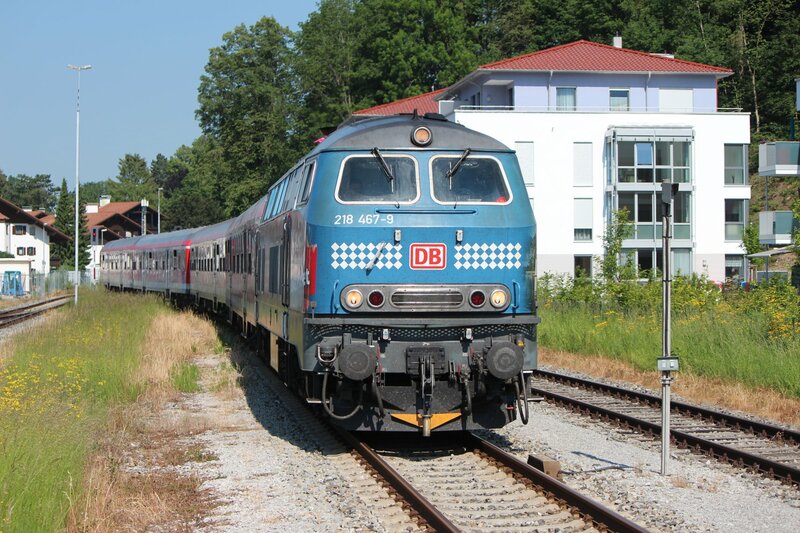 The trips we made to Burghausen and to Füssen just happened to be some of the last places in Germany with a concentration of turns by class 218 diesels, better known as ‘rabbits’ on account of the appearance of their two exhaust funnels. 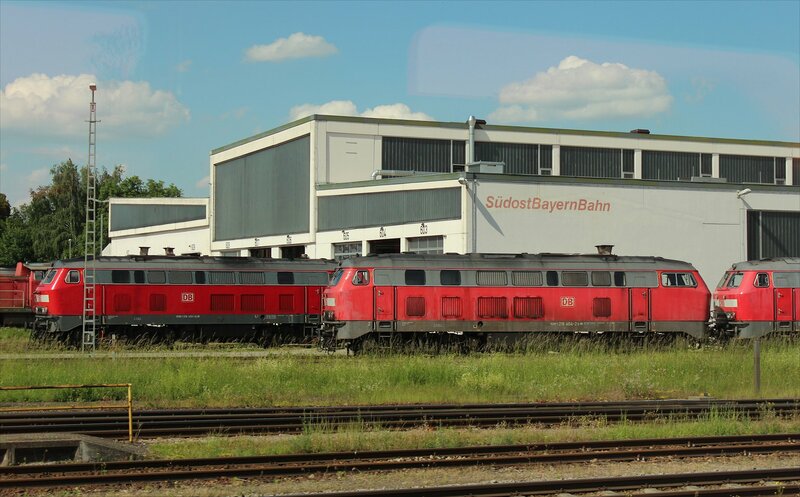 The class was easily spotted at its peak, with 398 built in the main production run between 1971 and 1979, but their use across the network has steadily decreased in recent years. 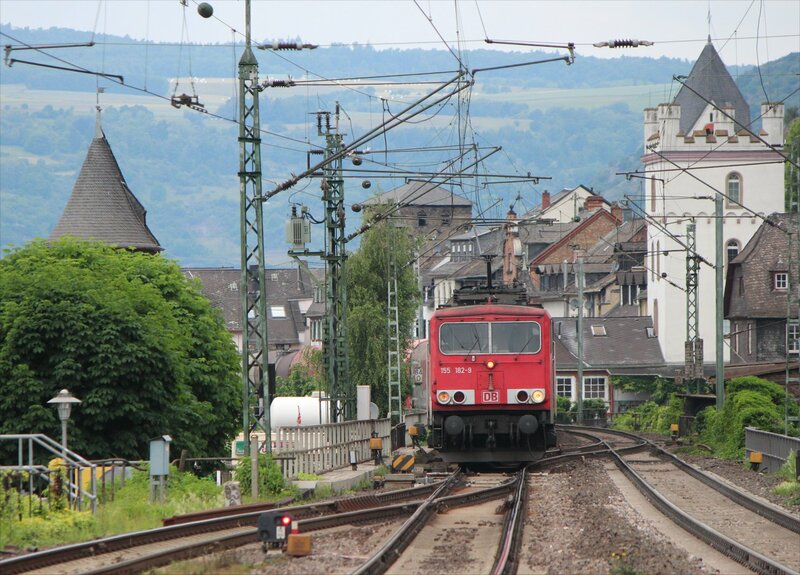 Electrification plans scheduled for the next five years will inevitably reduce this further. 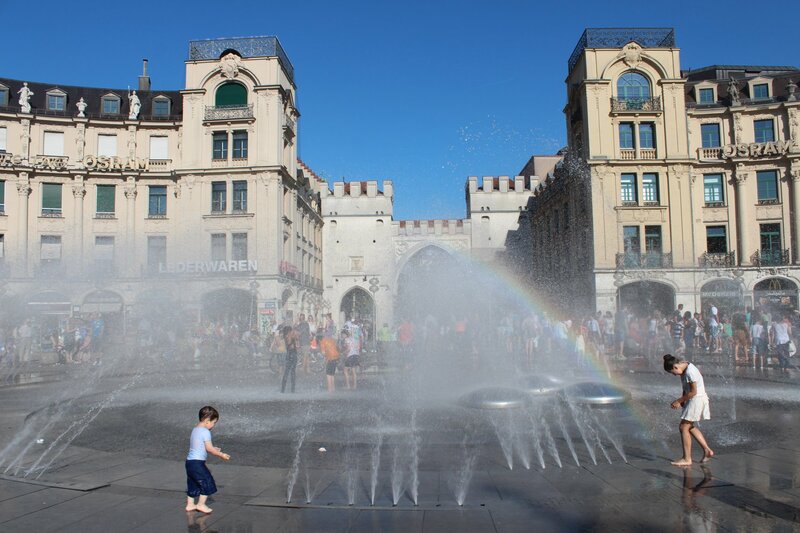 I didn’t come armed with the necessary diagrams which centre around Kempten (taking in Füssen, Munich, Memmingen and Augsburg) and Mühldorf (taking in Munich and Lindau) so I was delighted to see so many on our travels. 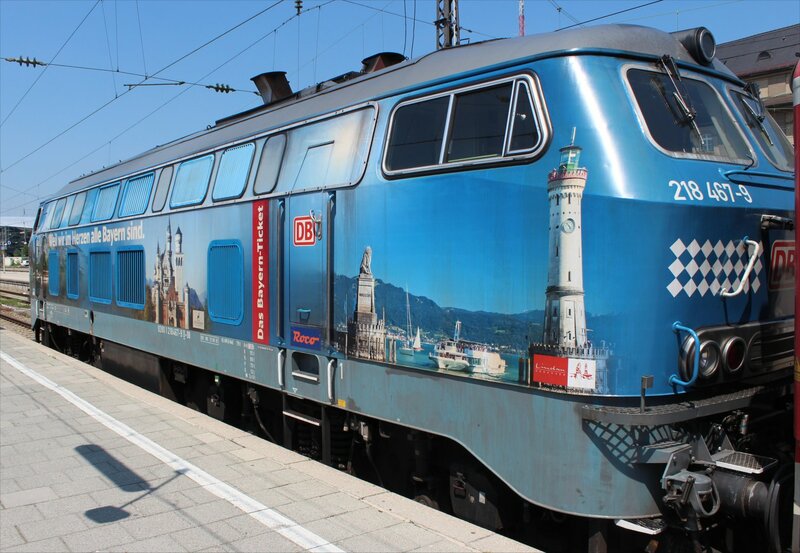 I was particularly surprised when 218 467-9 turned up at Füssen to propel our service towards Munich, not least because this example has been painted in an attractive livery to promote the Bayern ticket with illustrations of Lindau, Neuchwanstein and the Königssee (whereas most of the class are painted in red). 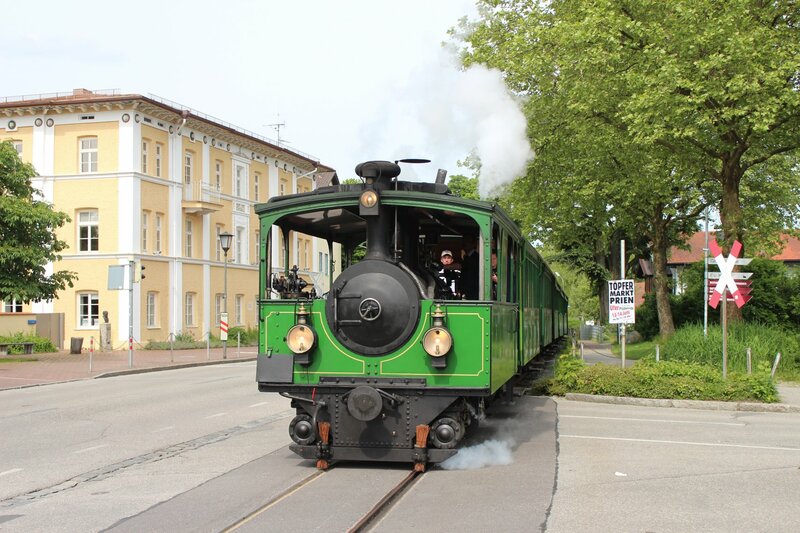 The rabbits of Bavaria are not yet an endangered species, but it’s marvellous to see and hear these noisy beasts whilst they’re still around. 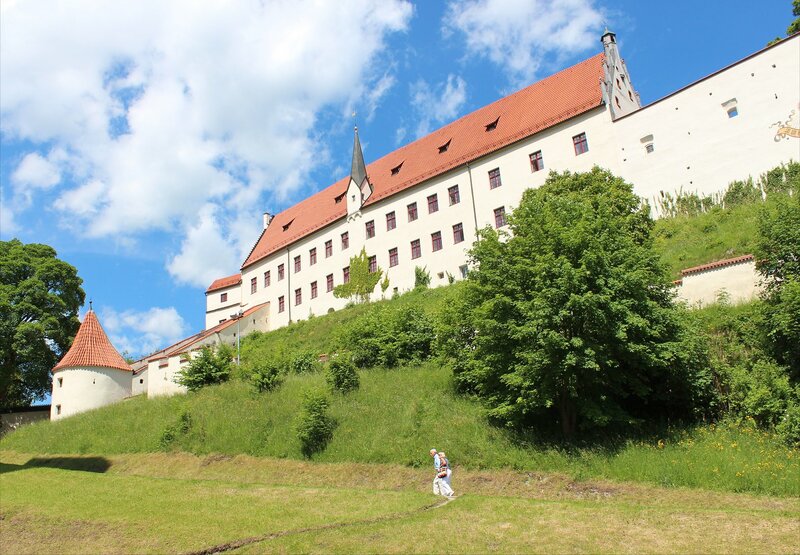 Füssen is a wonderful place to stay, with a collection of sights that make it worth a visit in its own right. 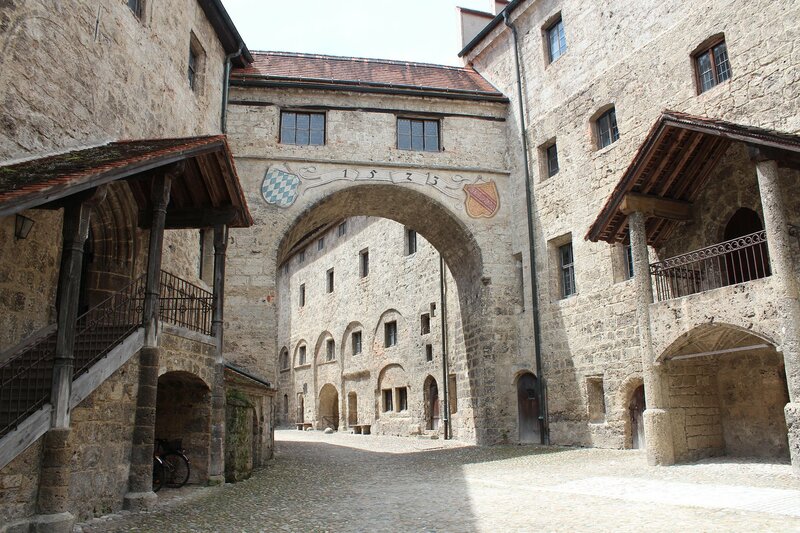 Sadly, most visitors pass straight through on their way to the castles, missing out on the wonderful interiors of the State Gallery in the Hohes Schloss and the baroque halls of the Benedictine Monastery of St Mang, as well as the delights of a cruise on the Forggensee. 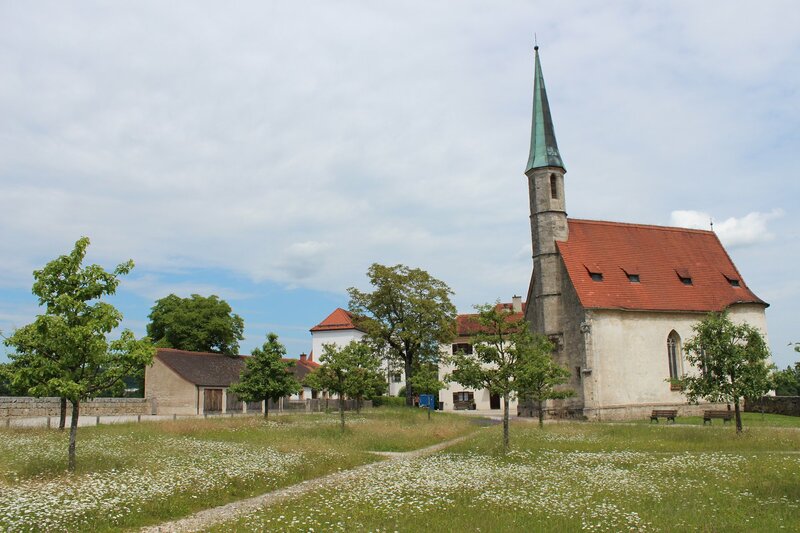 Although we thought our timing was pretty poor, having not realised that we were staying during a Bavarian public holiday (Corpus Christi) or the G7 summit, neither factor caused us any great complications. 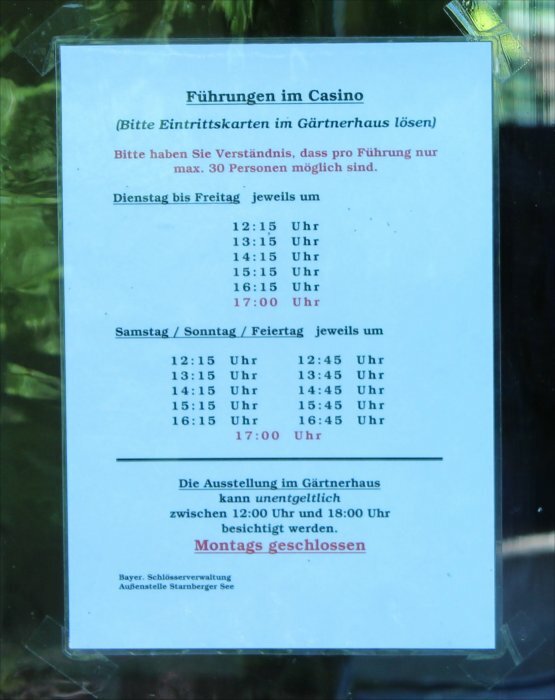 Nothing much seemed to shut during Corpus Christi and a planned closure of the castles during the summit was cancelled (though they did still project the flags of the G7 nations onto Neuschwanstein at night). The State Gallery in the Hohes Schloss and the Benedictine Monastery of St Mang can be visited on a combination ticket for 7 euros which is great value (it costs 6 euros to visit each individually) and you share the space with hardly a soul (we only counted two other visitors when we wandered around the museum in the former monastery). 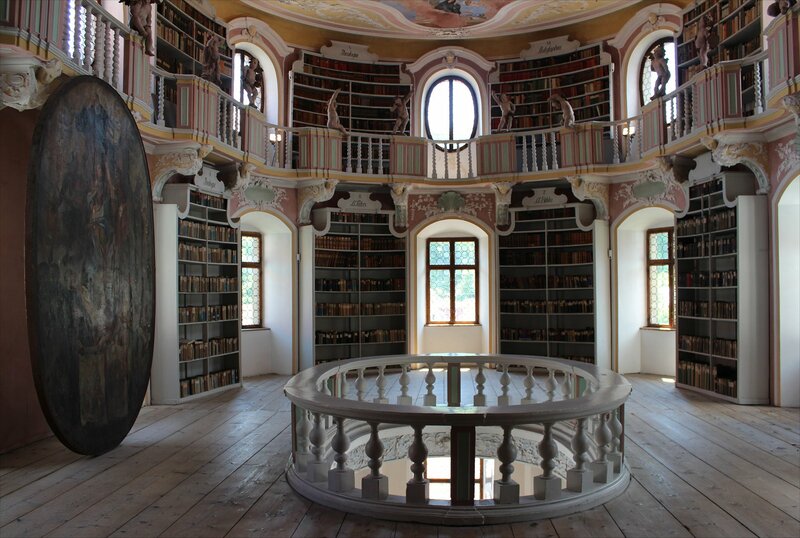 The Füssen Heritage Museum in the monastery is a labyrinthine place which includes a wonderful library, some beautiful baroque halls and a chapel with a macabre Dance of Death cycle. The cycle, painted by Jakob Hiebeler in 1602, presents images of 20 individuals from all classes dancing with death under the motto “Say yes or say no, you must dance”. 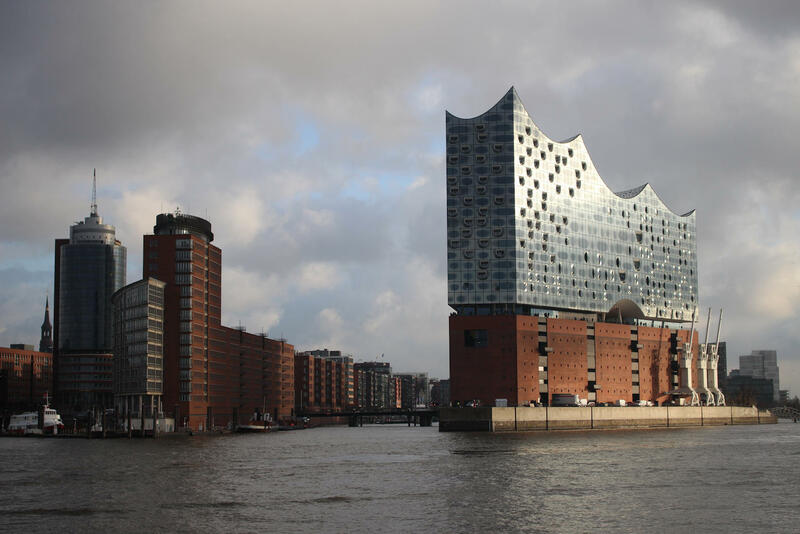 Besides this, there are a plethora of fascinating exhibits including all sorts of rare wooden musical instruments that hark back to the town’s past as a manufacturing centre in this field. 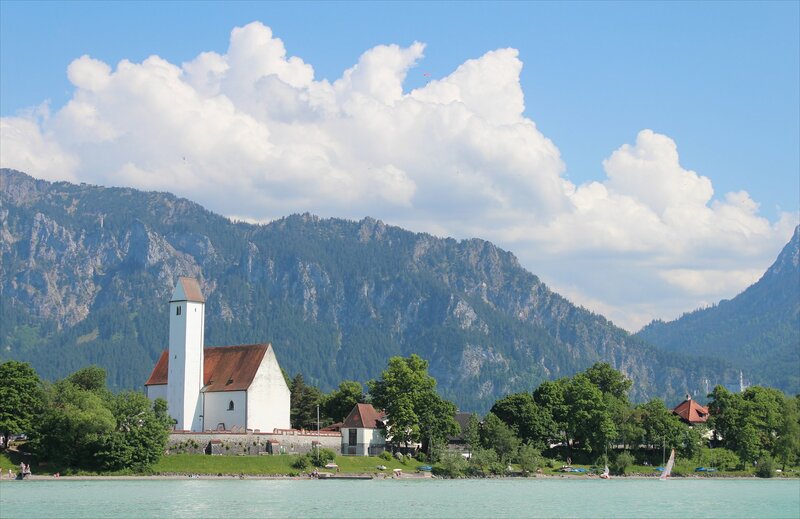 Our short cruise of the Forggensee in the afternoon gave us a different perspective on the local landscape and the castles. 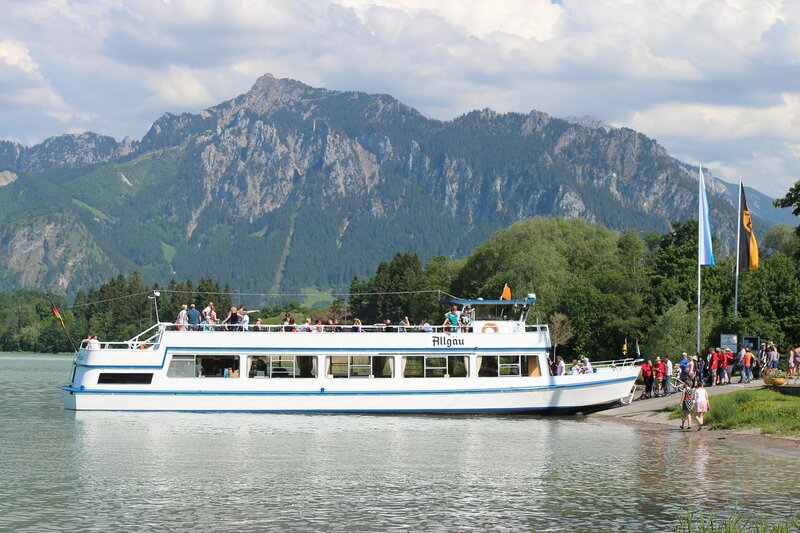 I never would have envisaged people sunbathing on beaches in front of Neuschwanstein without taking to the waters and it was all the more pleasurable with an on-board bar serving up radler. Besides, I would never have seen the even more delightful sight of a dog paddle boarding alongside us although others on board managed to miss this completely! 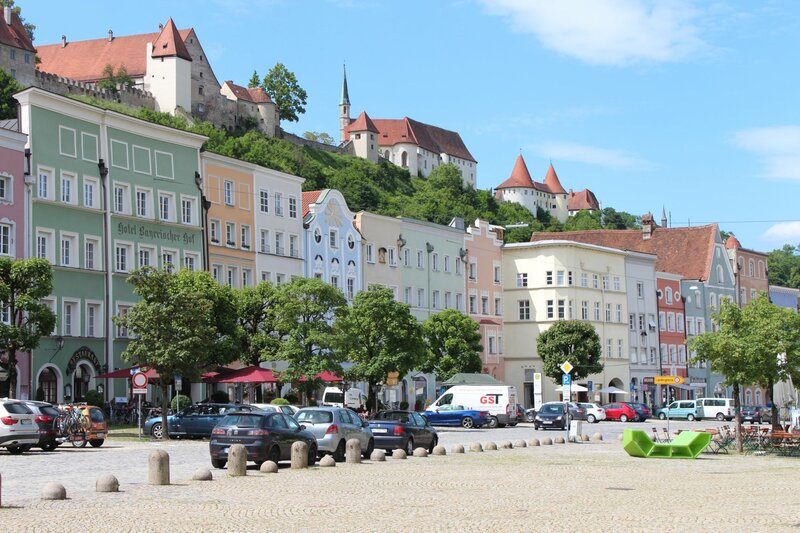 We stayed at the Hotel Sonne in Füssen which is handily located close to the railway station and right at the heart of the old town. I would heartily recommend this place with its unbeatable location, friendly staff and for serving up the tastiest breakfast of our travels. For similar reasons, we found the Ristorante-Pizzeria La Perla utterly charming – the most wonderful staff and an artistically arranged Tiramisu that we won’t forget in a hurry! 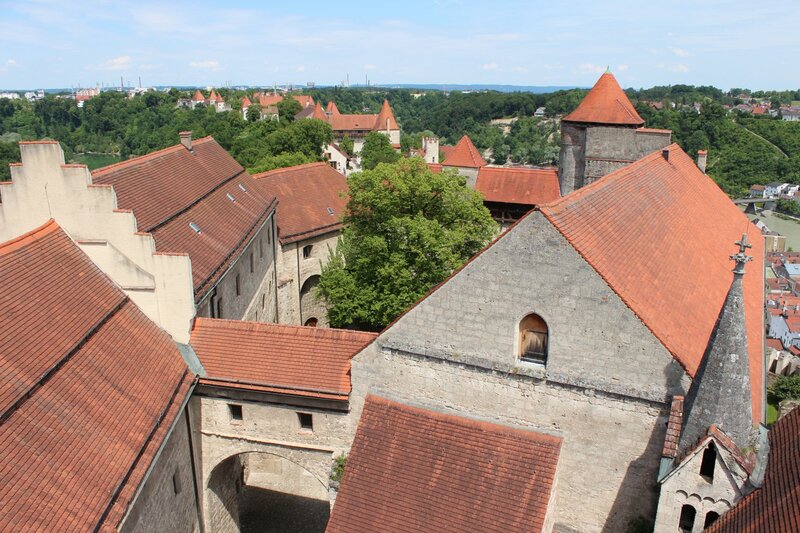 It is impossible to miss the museum in the monastery and the state gallery as they tower above the old town. 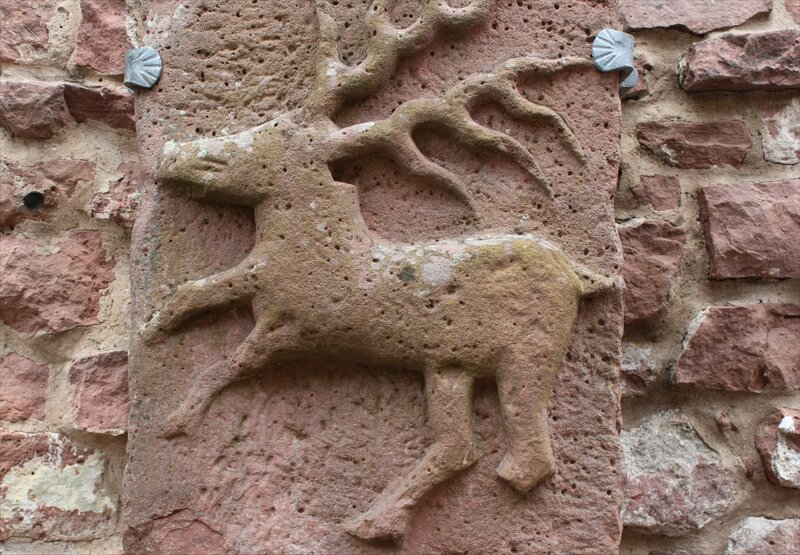 It takes a couple of hours to do both places justice, though you could easily spend much longer. 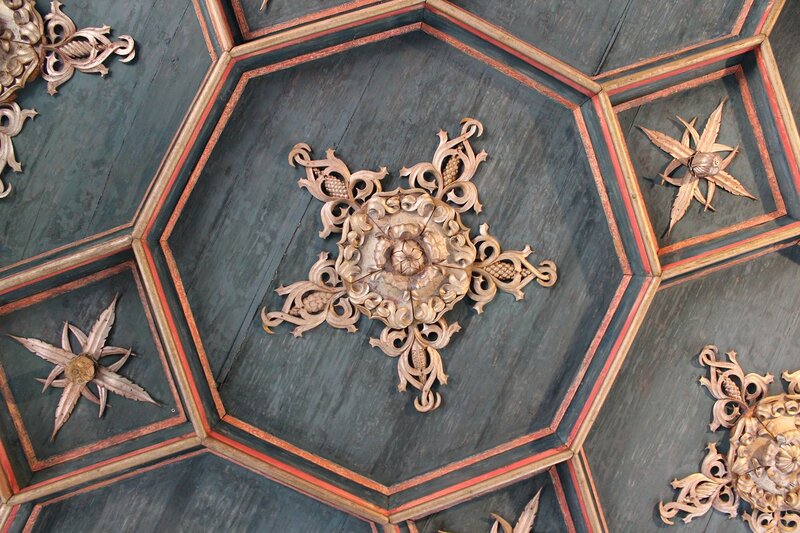 The church next to the monastery can be visited free of charge and is just as marvellous with some wonderful ceiling decoration. 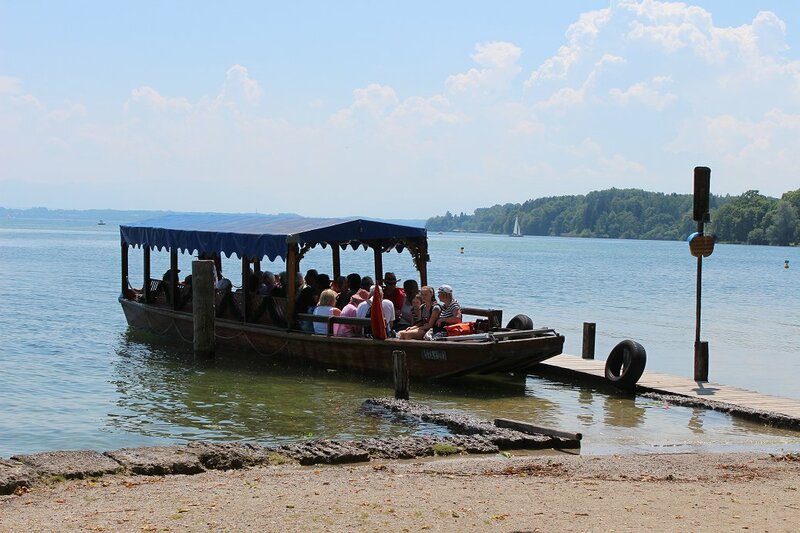 It takes around half an hour to walk from the town centre to the boarding point for lake tours. 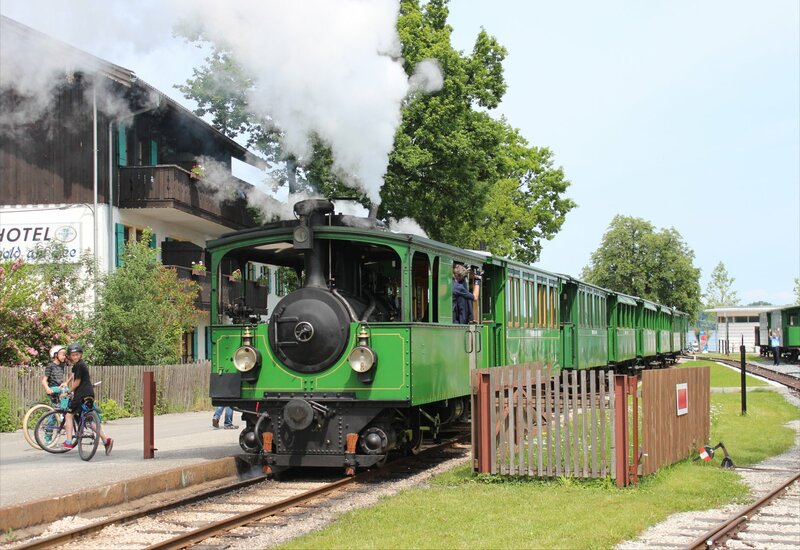 Tickets for the trips are sold on the boarding ramp (prices range from 8 euros per adult for the small circuit, lasting 55 minutes, to 11 euros per adult for the large circuit, lasting 2 hours, with discounts for holders of the Füssen card). 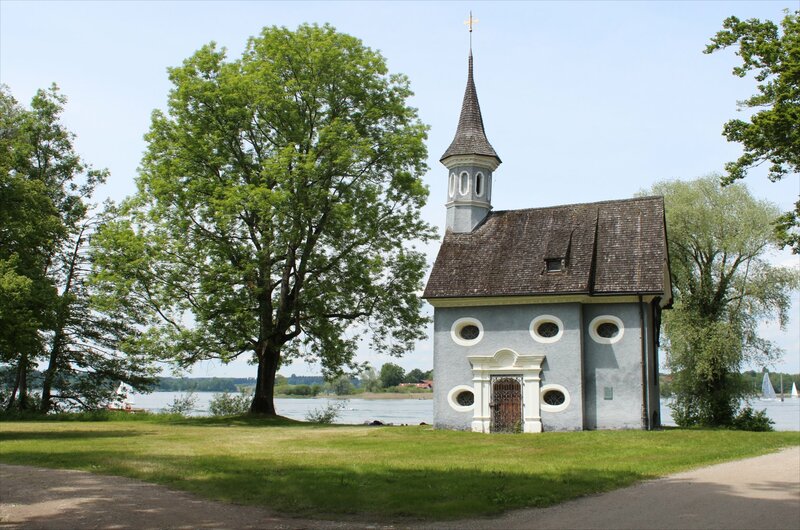 We opted for the small circuit, which takes you as far north as Rieden before crossing the lake to Waltenhofen with its distinctive lakeside church, then back to Füssen. 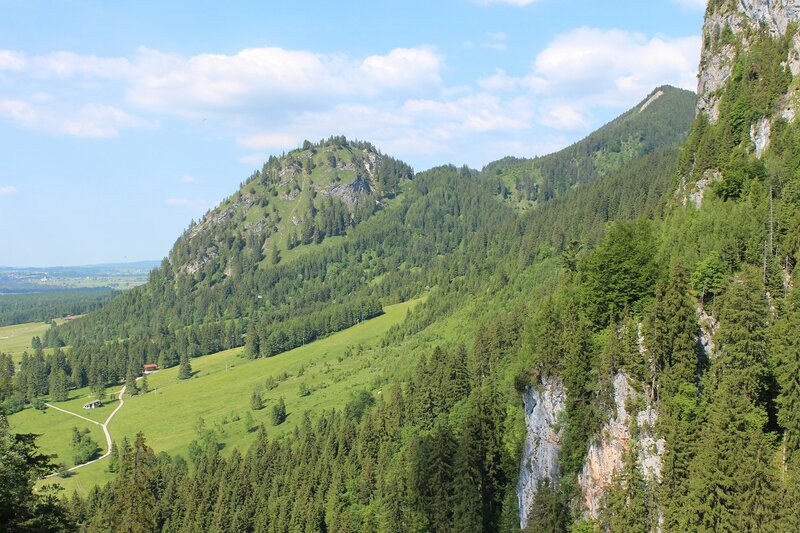 A blisteringly hot day saw us make a return to Hohenschwangau to visit the older of the two castles and take a look around the Museum of the Bavarian Kings, but first we enjoyed a walk to the edge of the alpsee and the marvellous views up to the mountains. 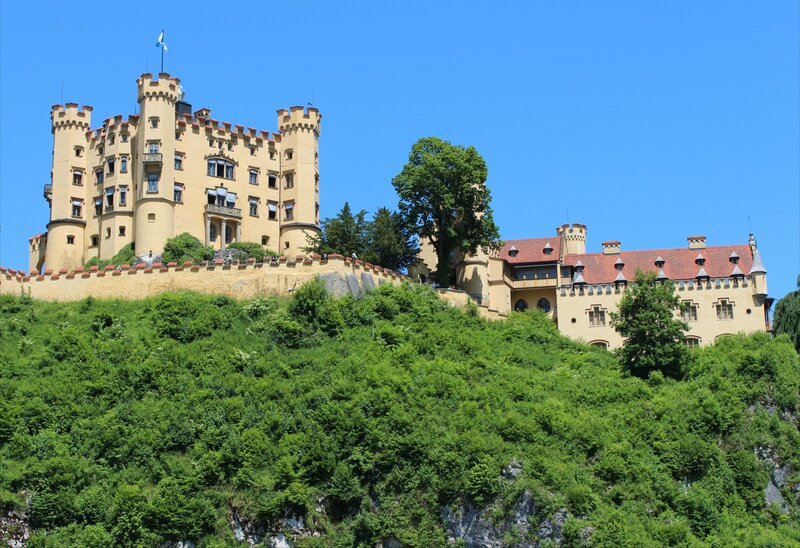 It’s not hard to see why this spot so entranced Crown Prince Maximillian when he first came across it aged 18, prompting him to rebuild Schwanstein castle between 1833 and 1837 (better known as Hohenschwangau Castle today). 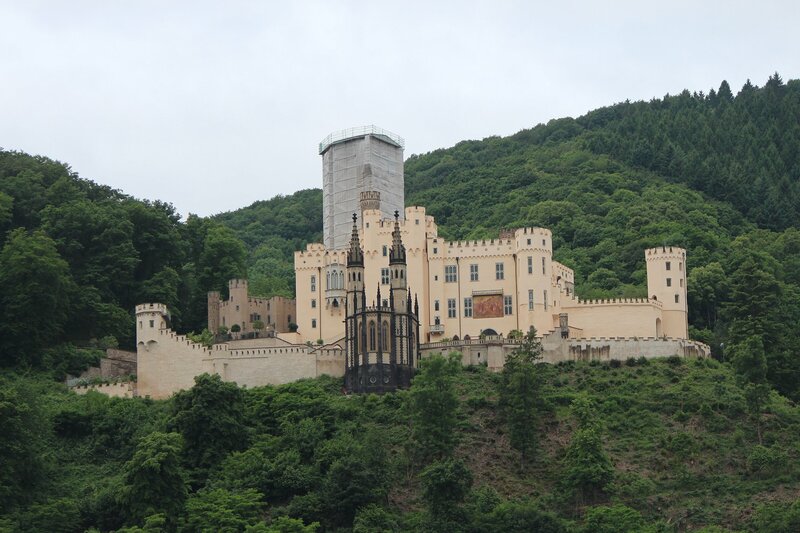 How striking that both father and son decided to rebuild romantic castles at a similar age. The similarities between father and son clearly don’t end there. 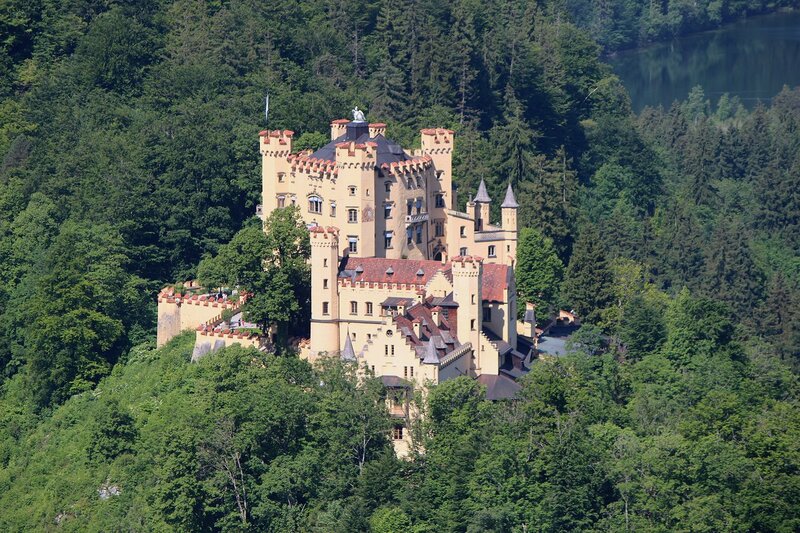 I had imagined Hohenschwangau Castle to be a simple family home, but how wrong I was! 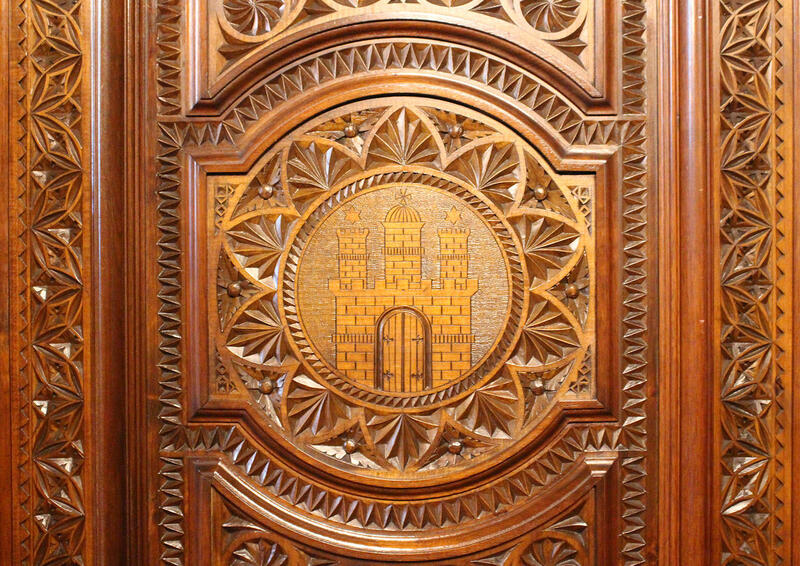 On our tour of the castle it soon became clear that Maximillian had as much of a creative vision as his son, with wonderful rooms such as the Hall of the Swan Knight, the Hall of the Heroes and Tasso Room which feature murals painted directly onto the walls and an assortment of neo-gothic elements. 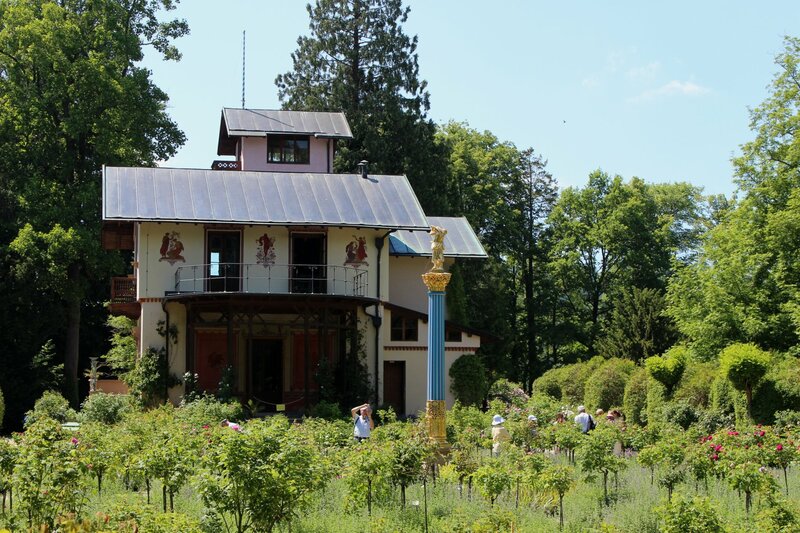 The romantic vision is married with a domestic comfort that I didn’t see in Ludwig’s palaces, but there is no doubting where Ludwig’s imagination had been incubated! 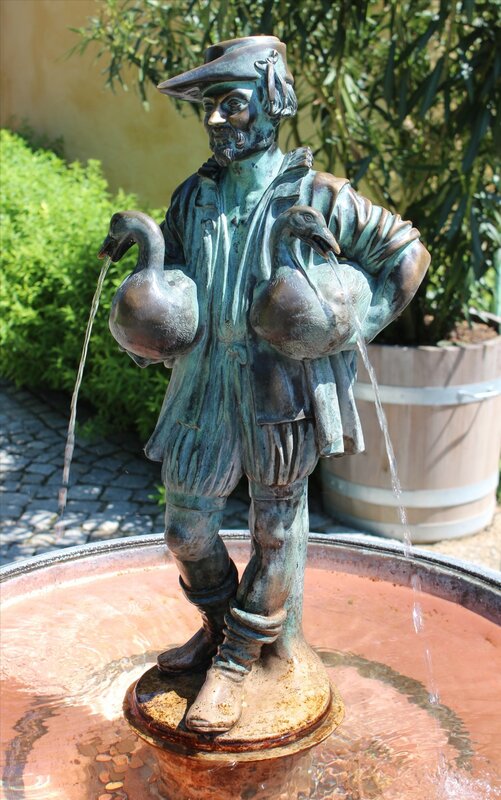 The grounds surrounding the castle hold some lovely touches too, including a fountain supported by four water spiting lions, a swan fountain and a replica of the famous Gooseherd fountain (a peasant holding a water spouting goose under each arm). 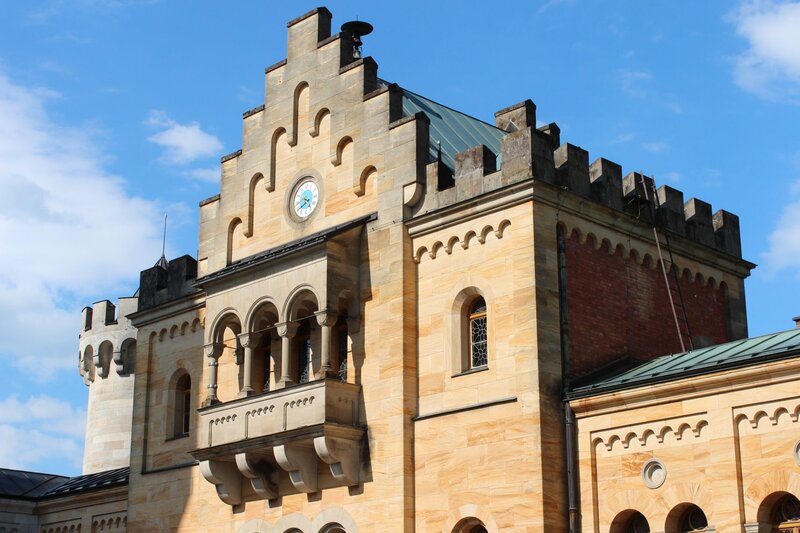 The nearby Museum of the Bavarian Kings is also well worth a visit, putting the Wittlesbach line into some perspective and treating us to the wonderful Nibelungen centrepiece (commissioned by Crown Prince Maximillian in 1842 to celebrate his nuptuals), the robes of Ludwig II and the 326 piece Royal Bavarian Service created to celebrate the golden wedding of Ludwig III and Marie Therese in 1918. 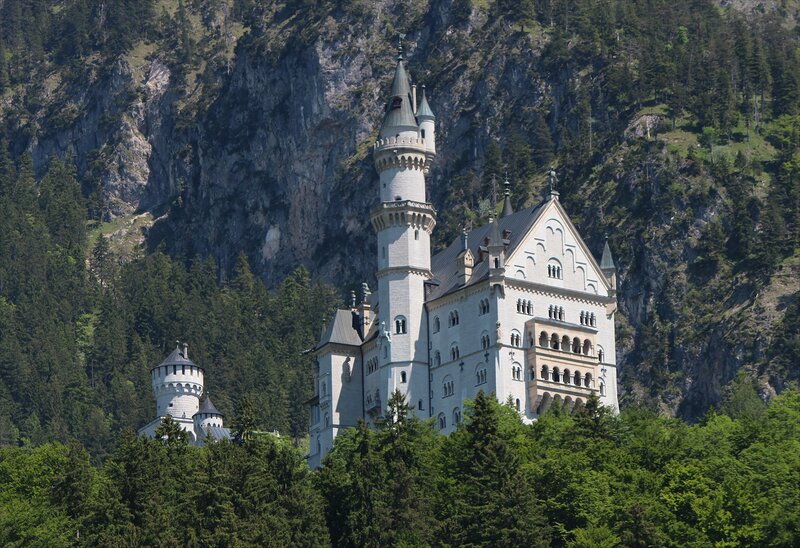 After waiting for over 30 years to visit Neuschwanstein I wondered whether the reality would live up to my childhood expectations, particularly as so many reviewers on Tripadvisor had commented that they wished they had viewed it from outside and not bothered to go in. 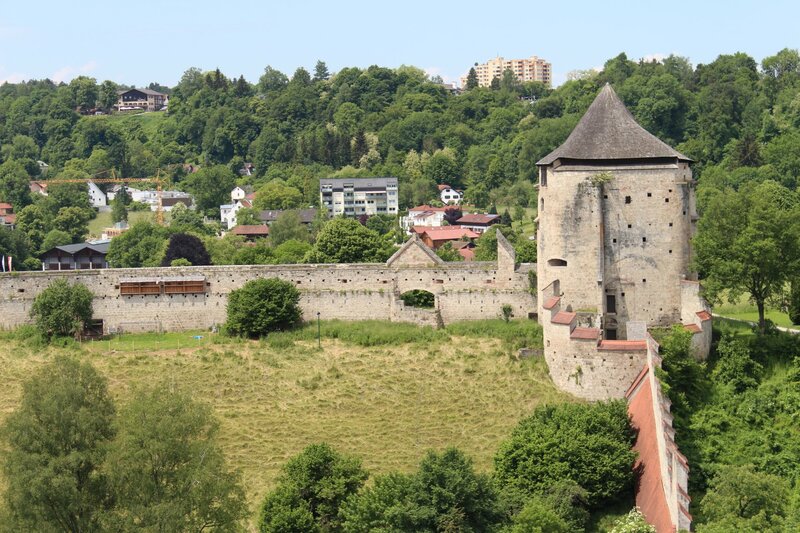 The start of our visit did not begin well – a walk up the gently curving road to the castle might look delightful on the maps but the reality was anything but. 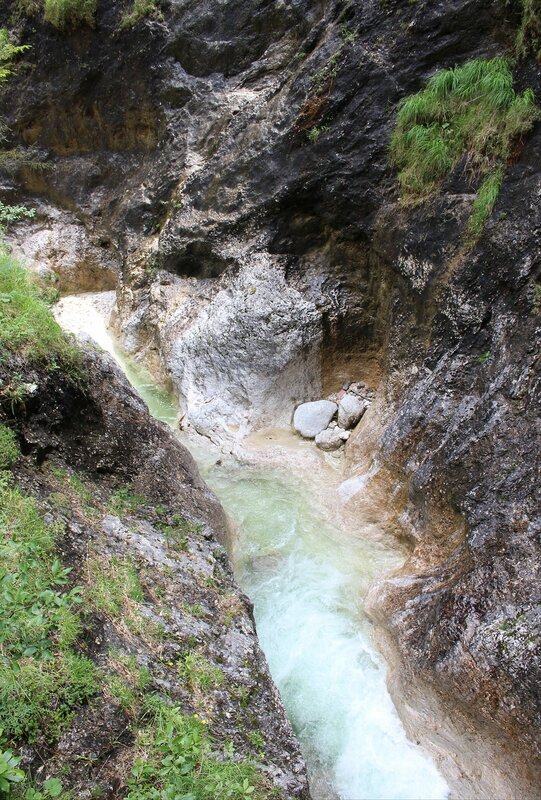 The route is plyed by horse and carriage all day long, so by late afternoon on a hot day the streams of urine and other deposits presented quite a challenge. 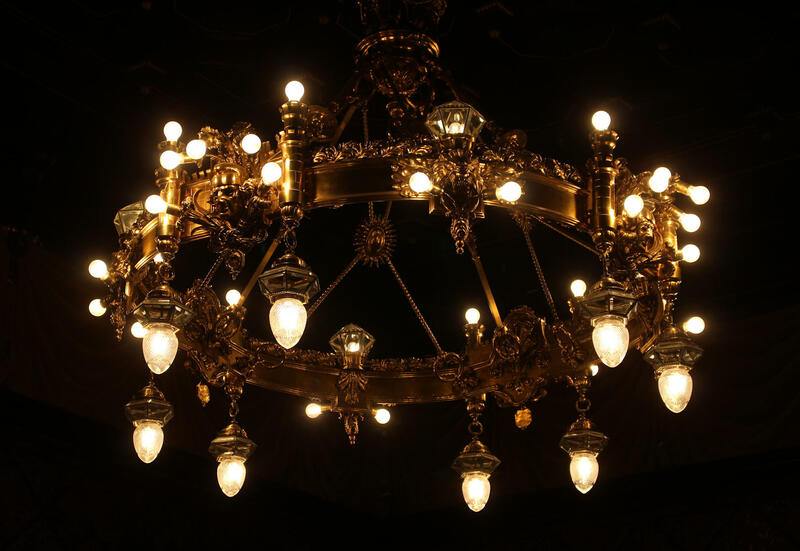 Huge swarms of flies had gathered and the only way up was through them, holding your hand over your mouth to avoid any possibility of swallowing one. Lovely! 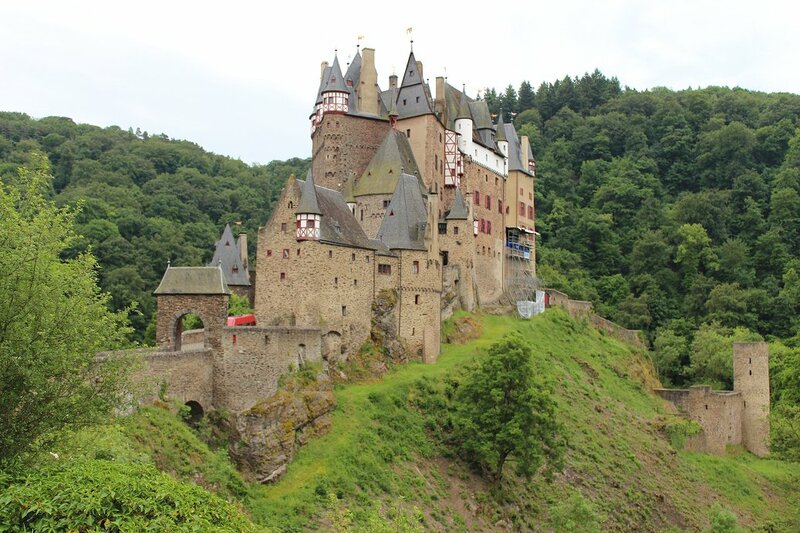 Once we reached the castle and joined our tour all my earlier doubts melted away. 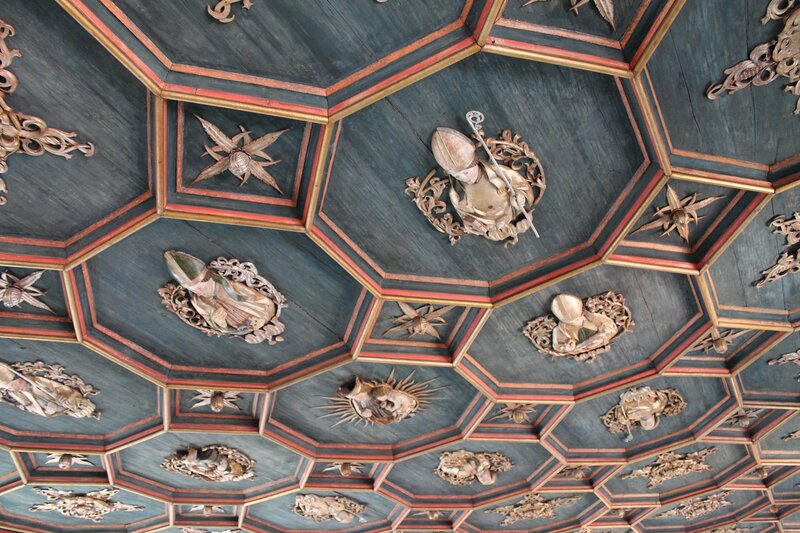 The palace is incredibly spectacular and quite unlike anything I have seen anywhere else. 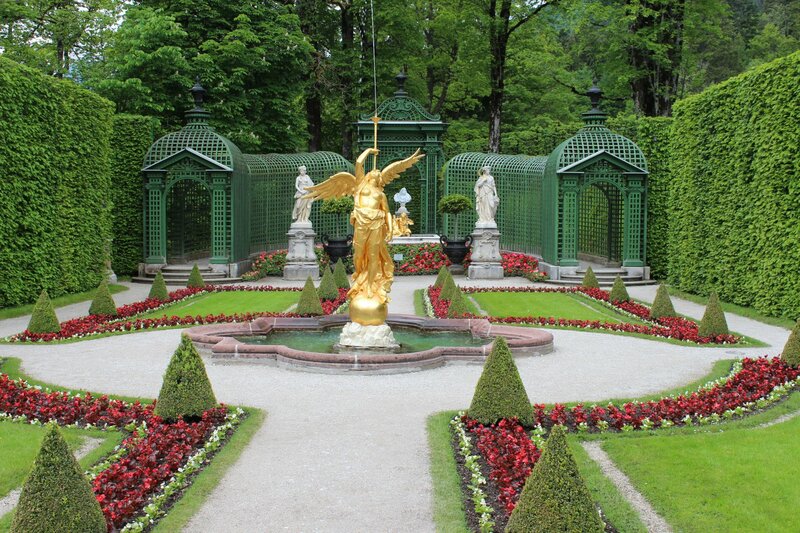 To my mind is it the most extraordinary of all Ludwig’s palaces. 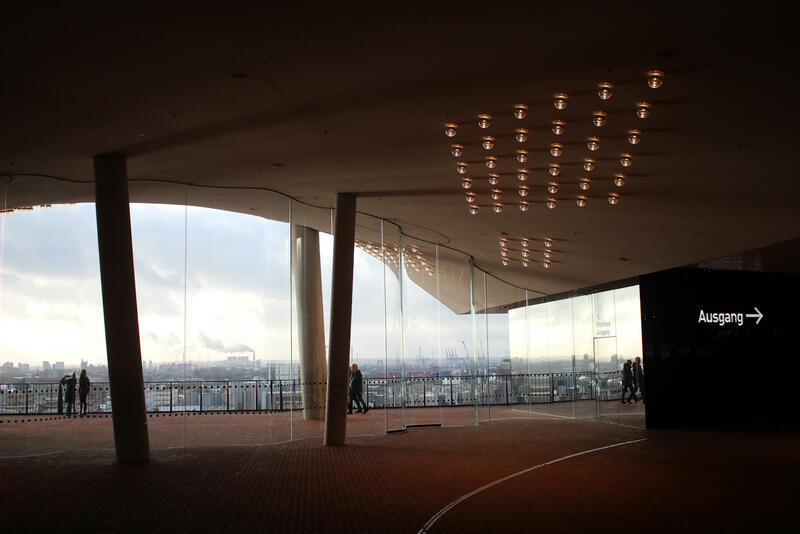 No wonder it sees 1.5 million visitors a year and has already exceeded 60 million visitors over its lifetime (it reached this milestone in 2013). 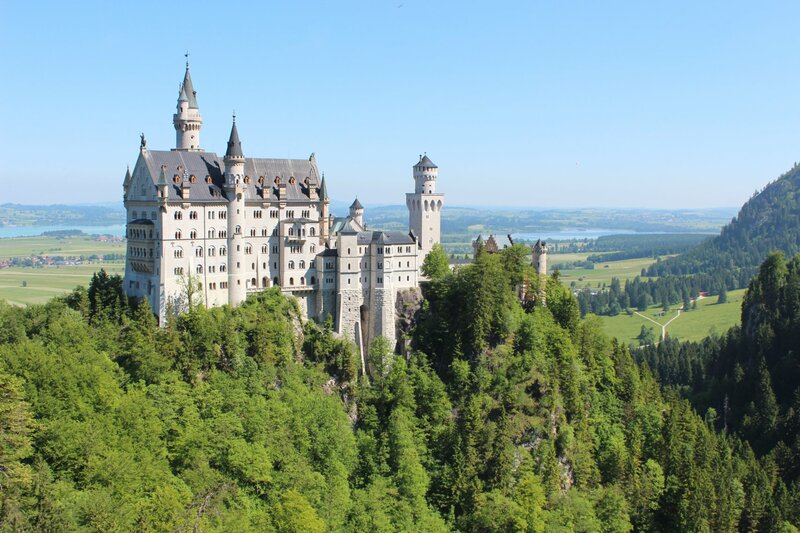 It is easy to forget that Ludwig began to develop the concept for Neuschwanstein Castle in 1868, at the age of 22, envisaging nothing less than a monument to absolute monarchy. 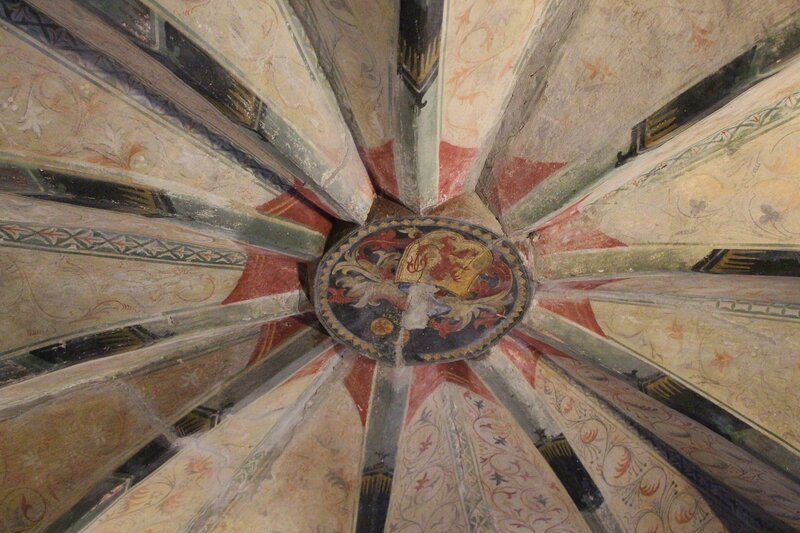 It is a quite remarkable vision that gives us a throne room fit for a Byzantine palace and presents us with Ludwig’s vision of true kingship in the depiction of six holy kings in the abse (including Edward the Confessor). The Singers’ Hall is equally stunning with its depiction of the saga of the Arthurian knight Percival and his quest for the Holy Grail. 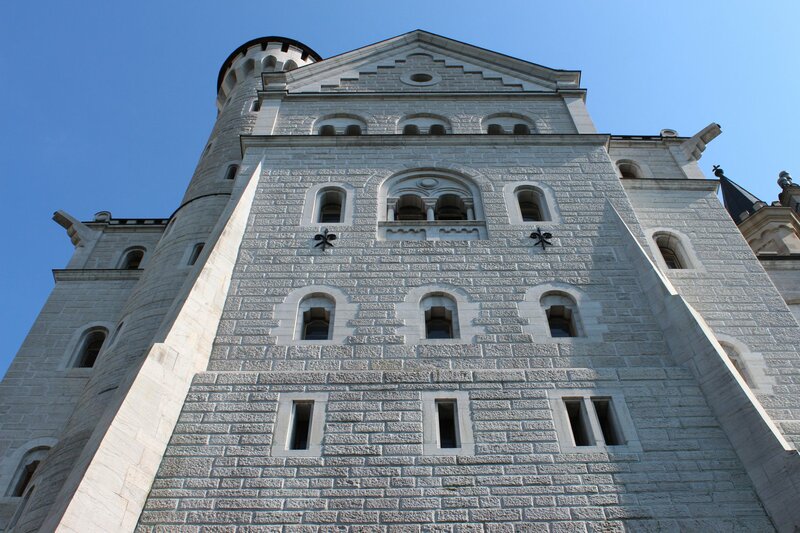 A tour of Neuschwanstein might only last thirty minutes, but it is quite an incredible thirty minutes and well worth any hassles along the way. 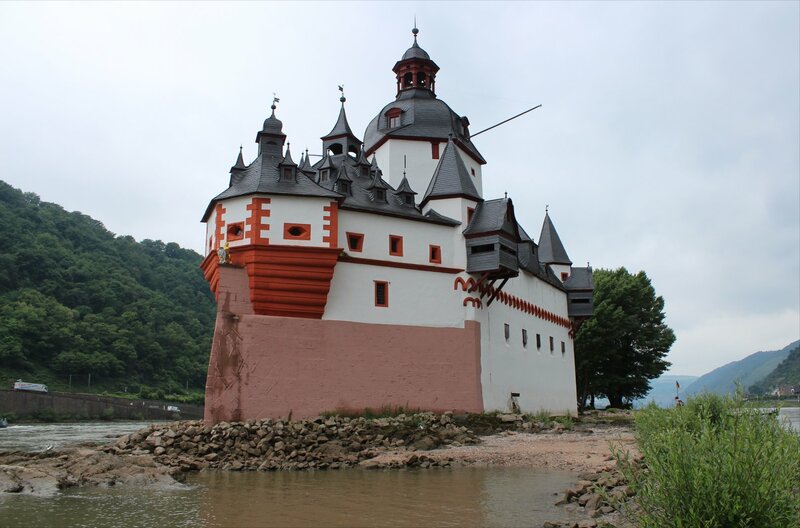 It is a pity that Ludwig did not get to complete his vision – amongst the unfinished projects were the Moorish Hall, the bathing hall with its viewing terrace and the centrepiece of a keep and castle chapel. 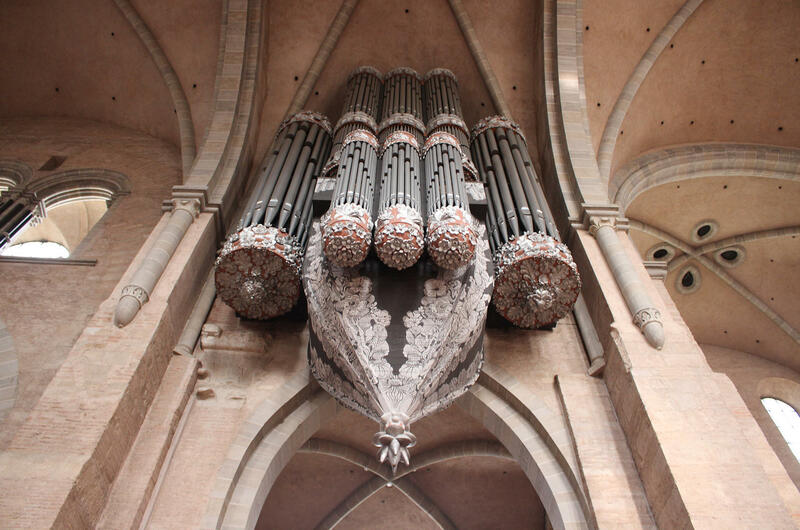 In a similar vein, many interior fittings were never finished including the king’s throne. 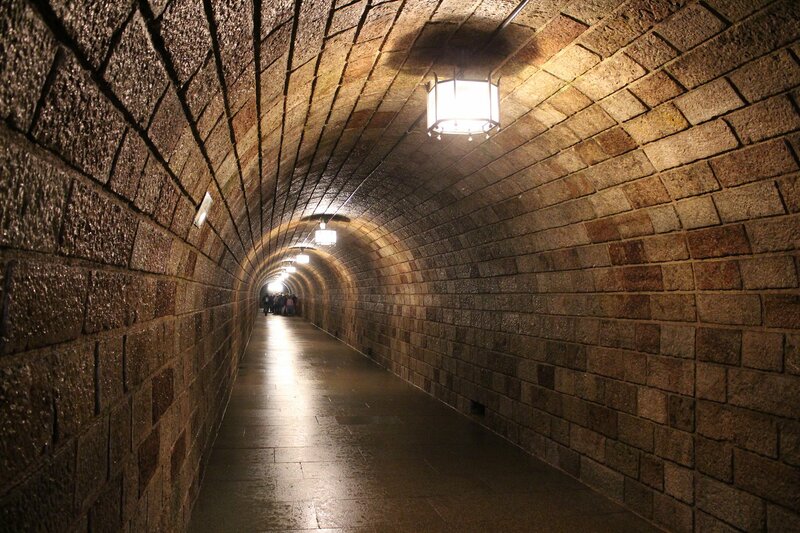 Nevertheless, what we have today in the fifteen or so finished rooms is quite extraordinary. 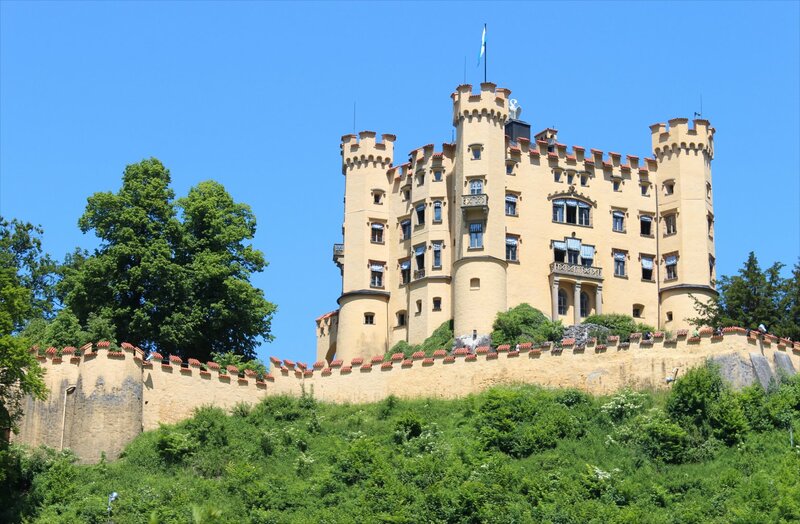 The closest railway station to Neuschwanstein is located at Füssen and it is easy to get reach the castles from here using local buses. 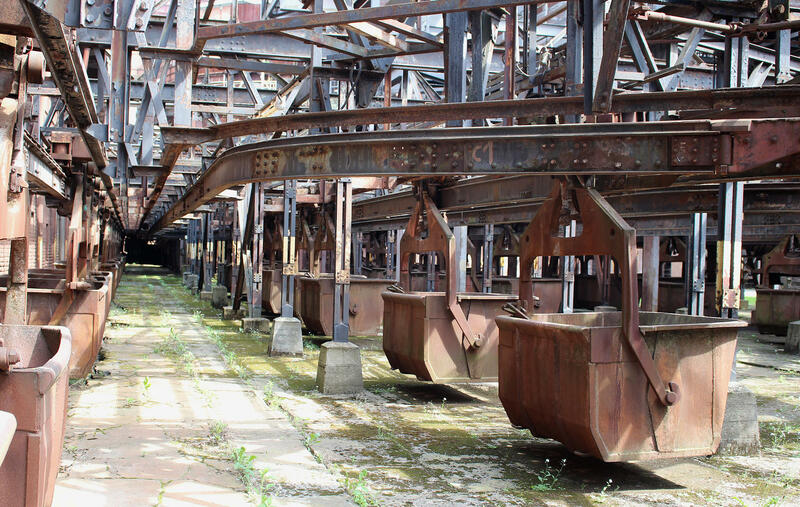 The old rustic station building from the nineteenth century was demolished in 2012 and is currently nothing more than a deep hole, meaning that all passengers arriving at the station have to skirt round the fenced off construction site to get to the bus terminal. 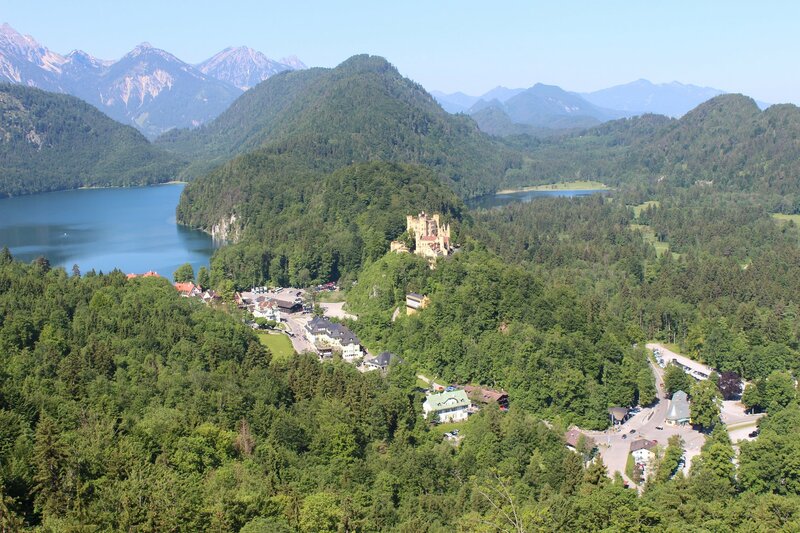 Bus numbers 73 and 78 are the most likely options for the short ride to Hohenschwangau for the castles. 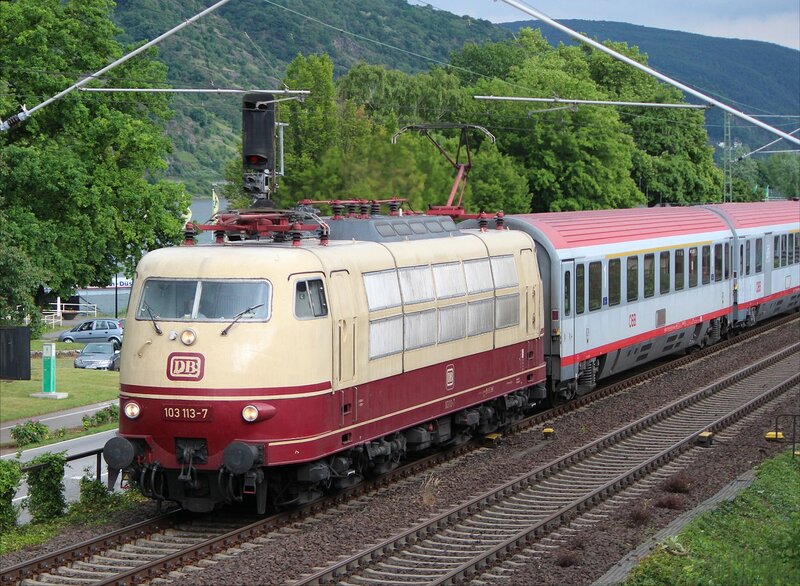 Bayern tickets are valid on the buses. 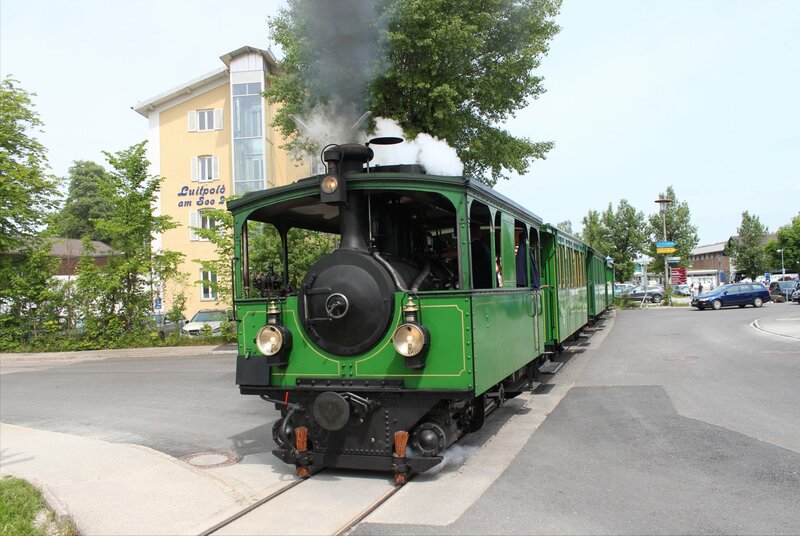 If you are staying in Füssen, like us, you may find that your hotel offers free local transport for your stay through the ‘Füssen card‘ which you just tap on the reader when you enter the bus. 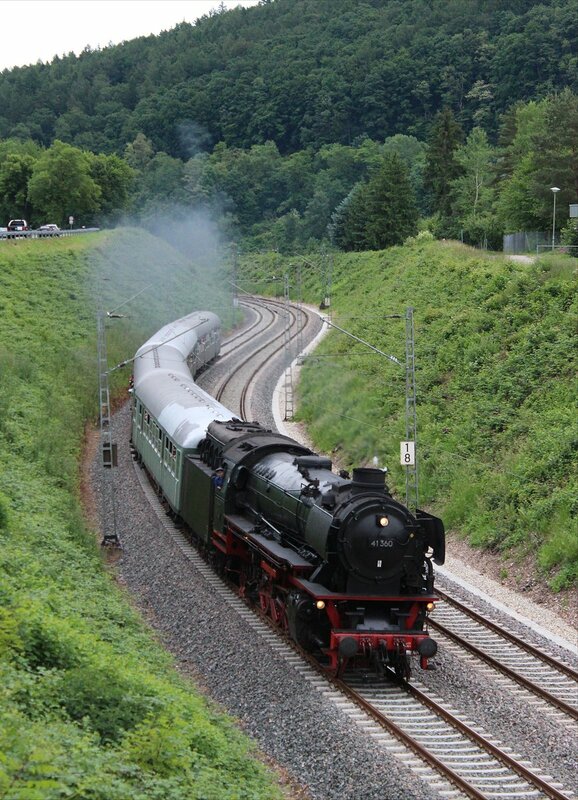 The ticket centre at Hohenschwangau had a hefty queue when we arrived and limited time-slots available for tours. I can well believe that in the height of summer there can be days where no tickets are available at all. 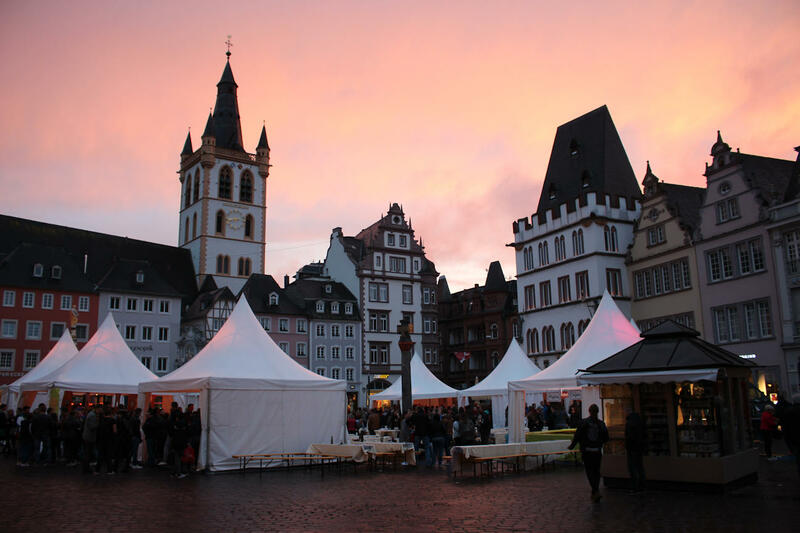 It is much better to book in advance through their website – not only do you stand a much better chance of getting the time slot you want but you can also use the much shorter queue for people picking up reserved tickets. Tickets can only be purchased on the day of use and there are a variety of combinations available. 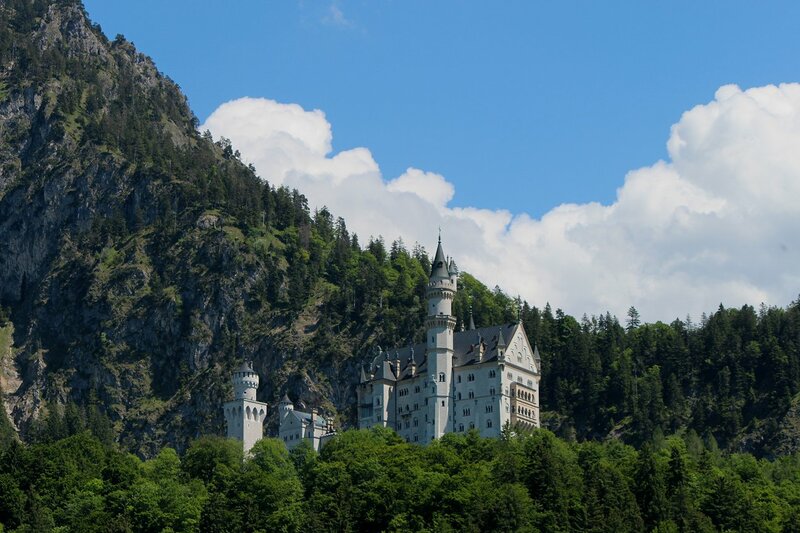 The 14 day pass from the Bavarian Palaces department includes Neuschwanstein so we only needed to pay the reservation fee (you should indicate on the reservation form that you will have this pass). 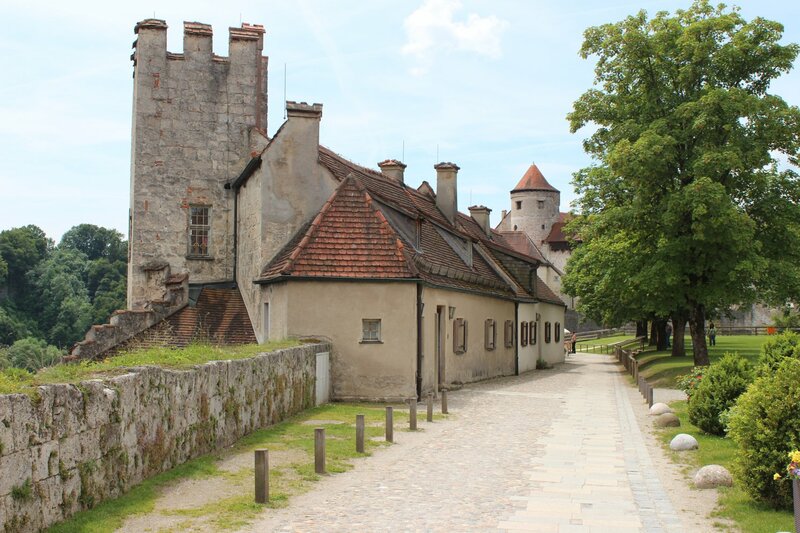 You can reach the castle on foot, by horse and carriage, or by bus. 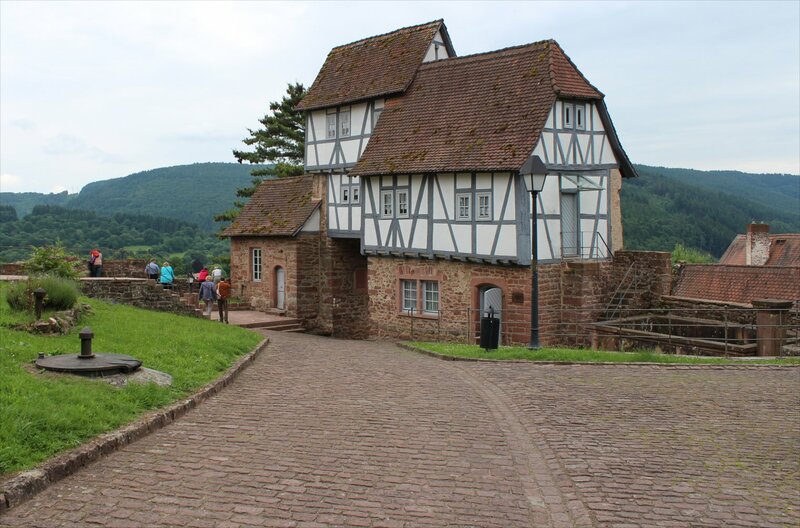 We opted for the 40 minute uphill walk and arrived in good time for our slot (a digital display indicates when visitors with each tour number should scan their tickets to enter the ‘cattle-pen’ before being led into the building by a tour guide). 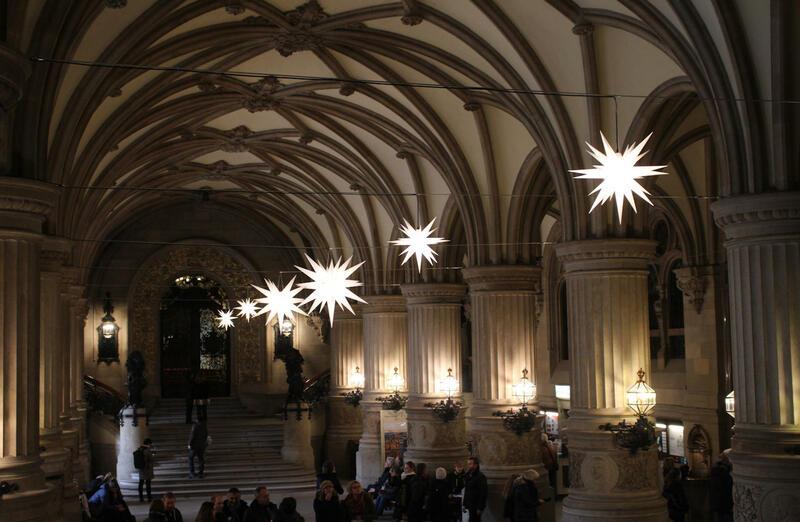 Tours take around 35 minutes and you don’t always get the chance to stop in each room so you need to be quite alert to take in everything around you as you pass through. 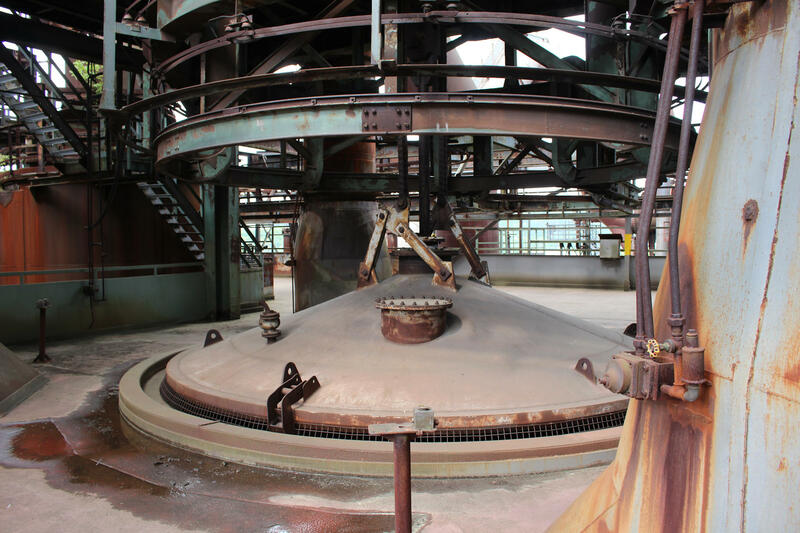 Our tour guide told us that every group from the start to the end of the day was of the maximum size, so they really are operating at full capacity. 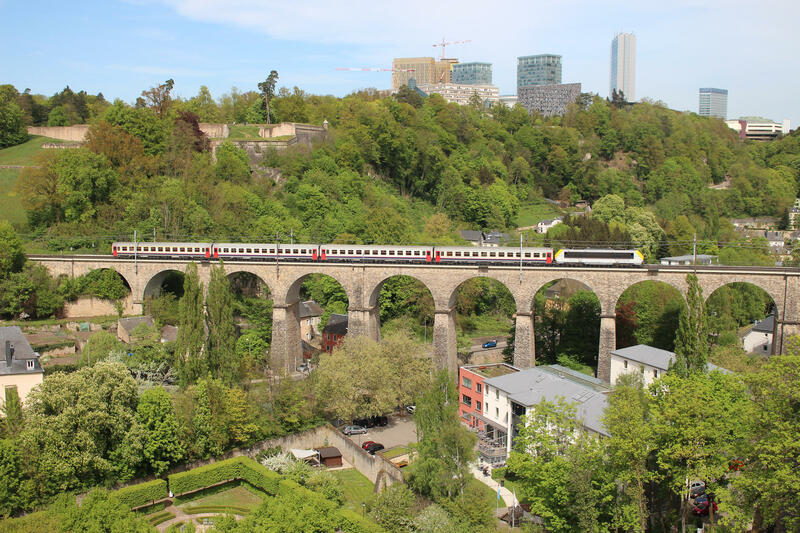 If you wish to visit Marienbrücke, the bridge over the Pollat Gorge that Ludwig constructed to offer the best view of the castle, this is a further 15 minutes walk up from the castle terrace (if you take the bus up to the castle it will drop you off close by). 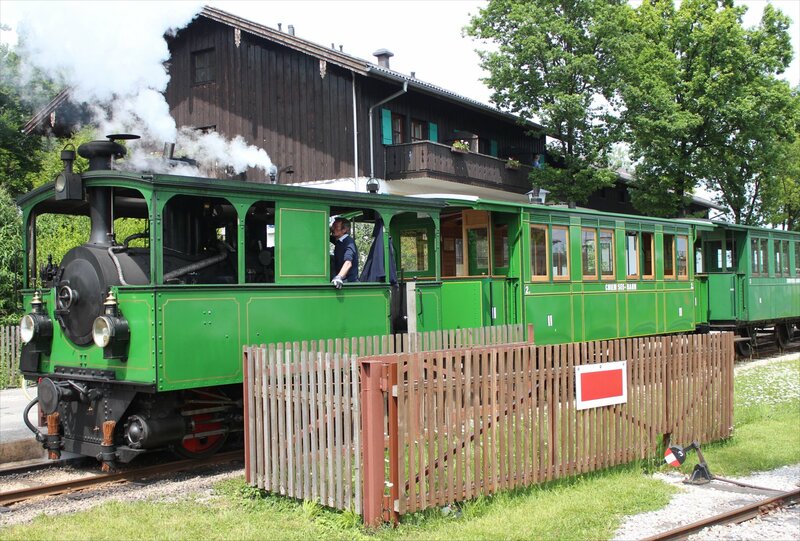 It can become incredibly packed, particularly after a new busload of visitors has been disgorged. 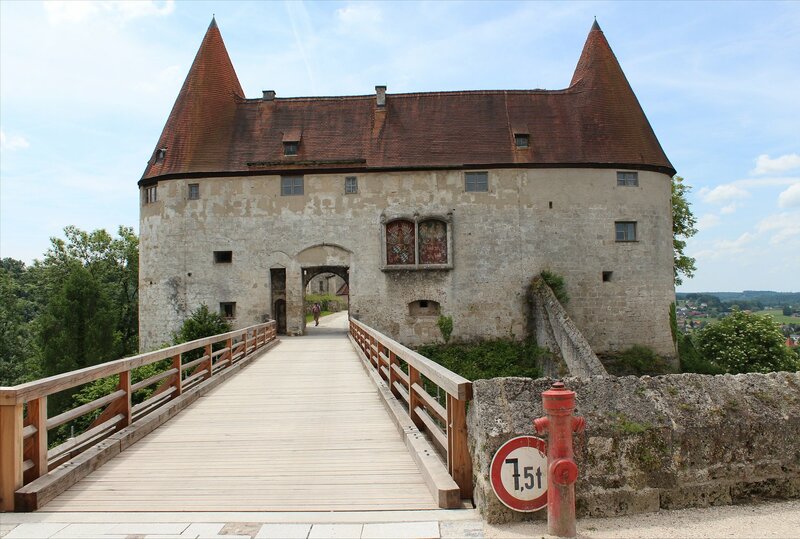 A notice posted nearby indicated that the bridge will be closed for renovations this year (since we visited the closure dates have been revised to 3 August 2015 until mid November 2015). 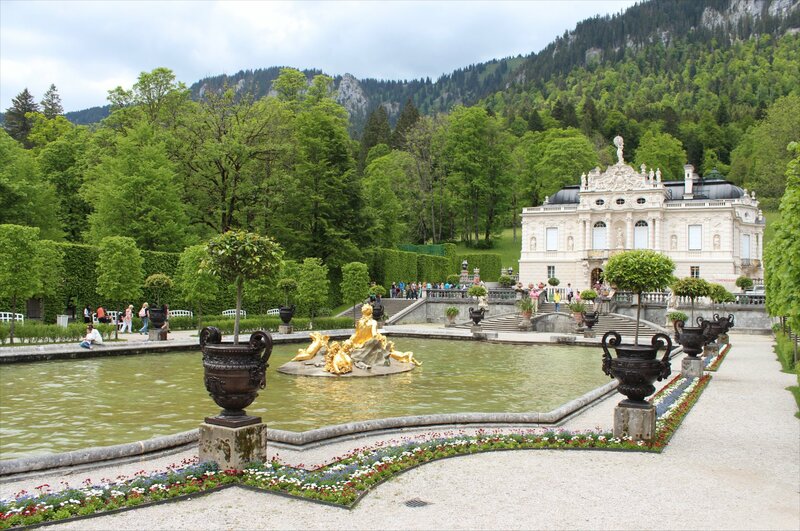 The morning train from Munich took us south into the Bavarian mountains to seek out Linderhof, the most secluded of Ludwig II’s palaces. 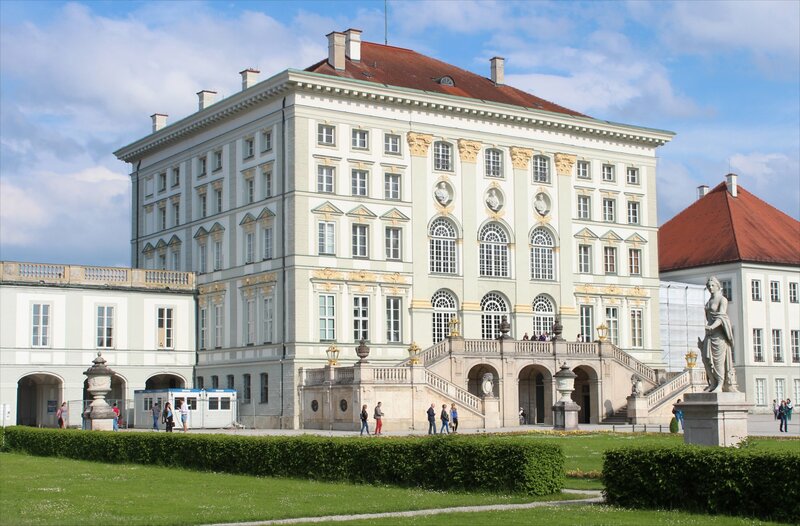 It is also the most human in scale, so it is perhaps no surprise to learn that this was where the young king spent much of his time, enjoying life at the royal villa for extended periods away from Munich. 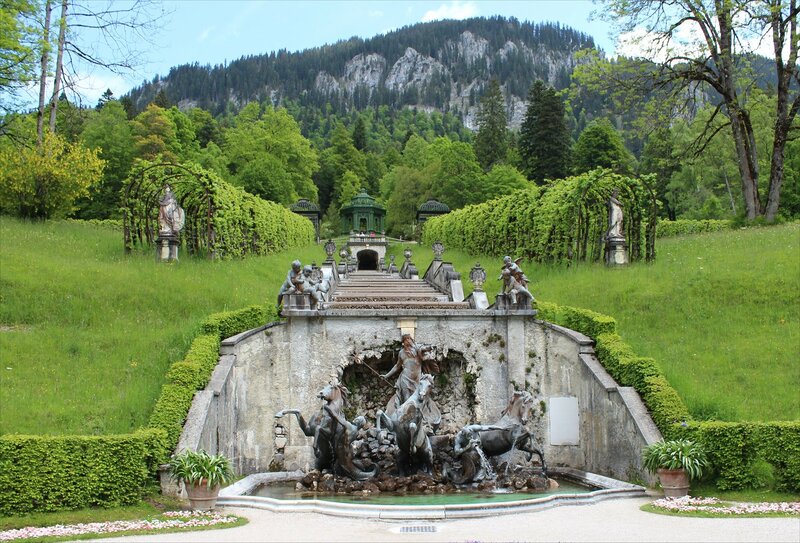 It still takes a little bit of effort to get to Linderhof if you use public transport, which only serves to emphasise the relative seclusion of the location to this day. 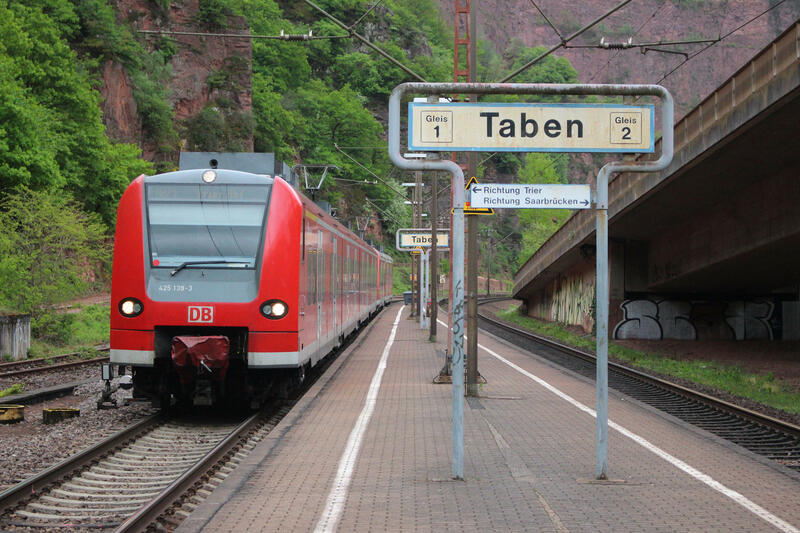 It was a somewhat surreal journey for us as the security precautions for the G7 summit meant that every station along the route had been heavily populated by policemen, backed up by a fleet of police vans. 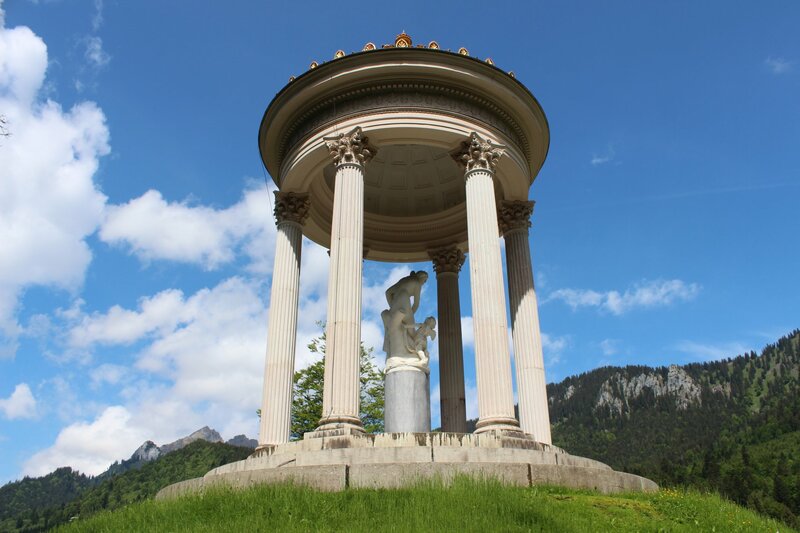 The impression of travelling through a police state was not dispelled by a further security checkpoint on the road leading to Linderhof! The journey was well worth it. 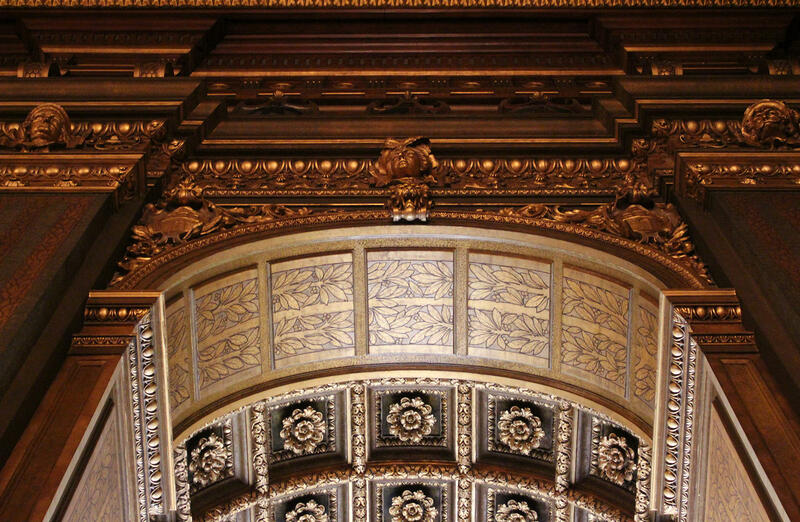 The richly decorated interior of the rococo-style palace is simply spectacular, far exceeding the opulence that you expect of such buildings. 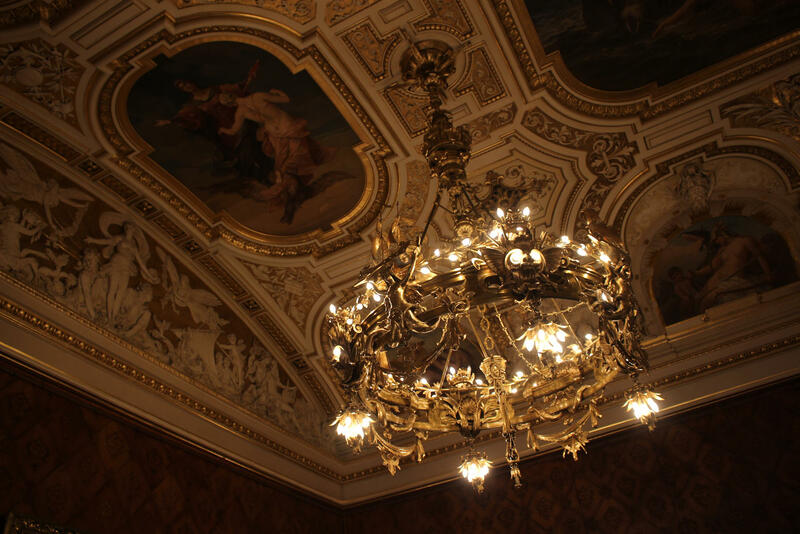 It may be a short tour but every room packs an incredible punch, from the small dressing room lined with portraits of Louis XV’s mistresses to the vibrant blue and gold decoration of the king’s bedroom. 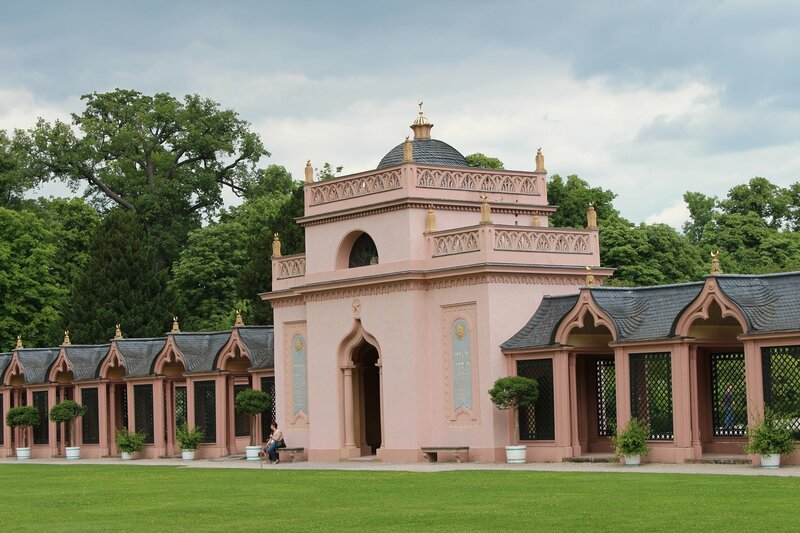 On top of this, the surrounding park offers up an array of wonderfully decorative refuges ranging from a Moroccan house to a Moorish kiosk with a peacock throne. 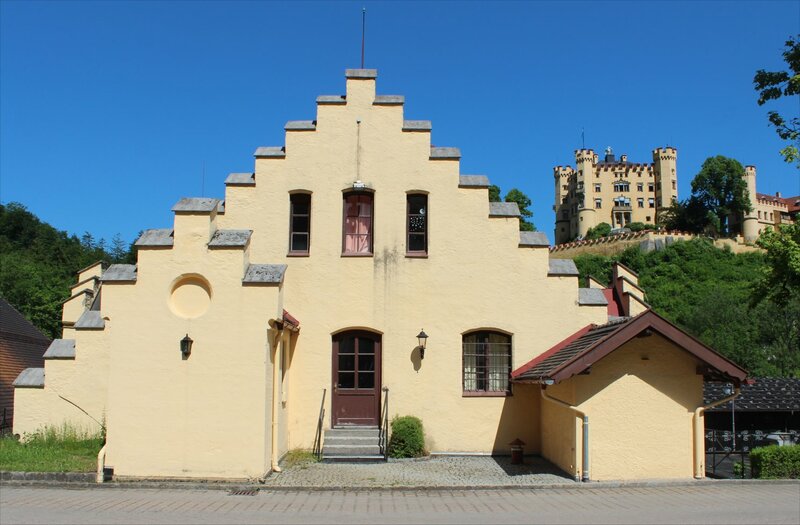 In many respects the park buildings act as stage sets, allowing Ludwig to step into the legends that he so loved and escape the realities of his day to day life. 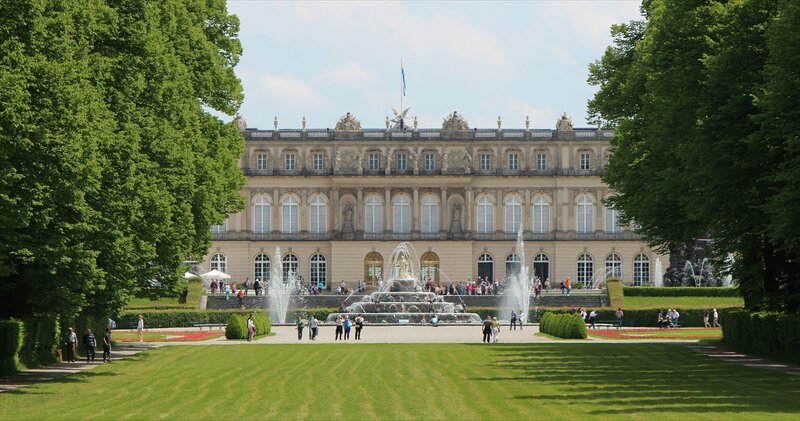 Although our visit was in bright daylight this is not how Ludwig would have been most familiar with the palace as he was very much a creature of the night – rising for breakfast as the sun set, taking lunch at midnight and heading to bed as the sun rose! 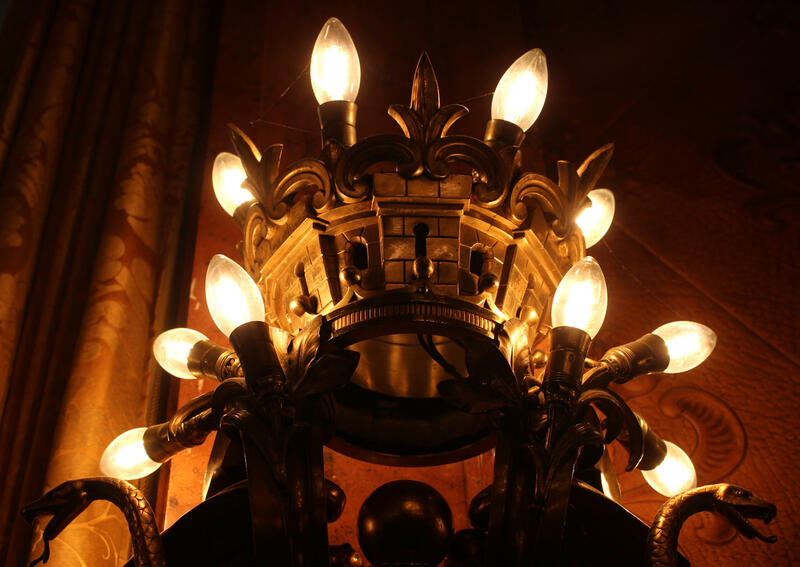 The rooms must have looked astonishing as they sparkled by candlelight, particularly in the hall of mirrors where the reflected light and shine of the abundant gilt decoration must have created an incredible effect. 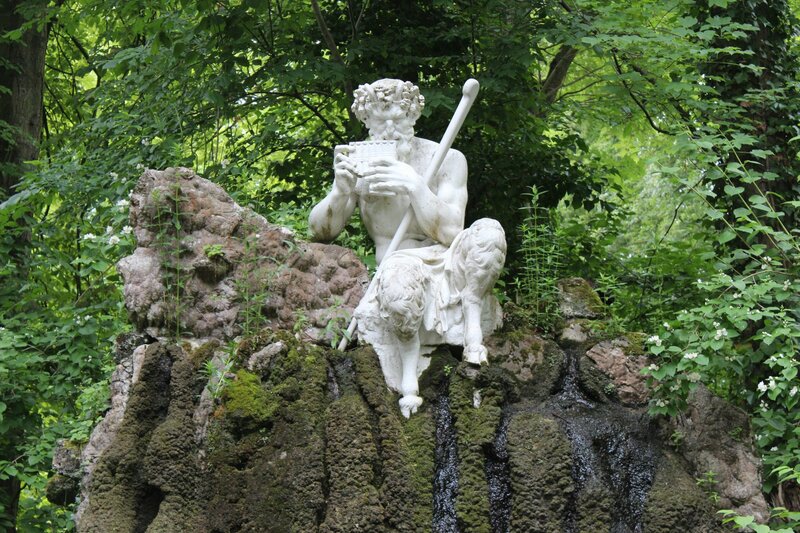 After leaving the palace we headed to the remarkable Venus grotto, which gives the appearance of being hewn from the rocks, but is an entirely man-made construction constructed using canvas and cement. 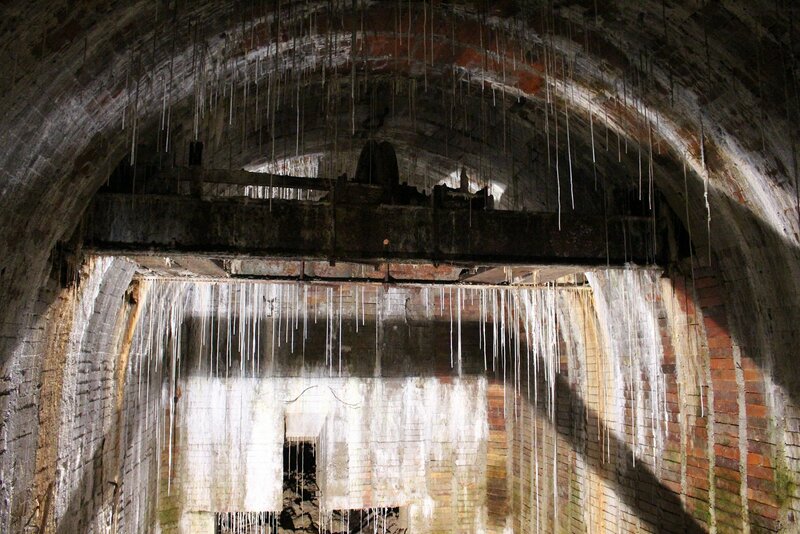 At its heart is a ten metre tall cave with stalactites hanging from the roof which contains an underground lake and waterfall. On the water a gilt shell boat rests. 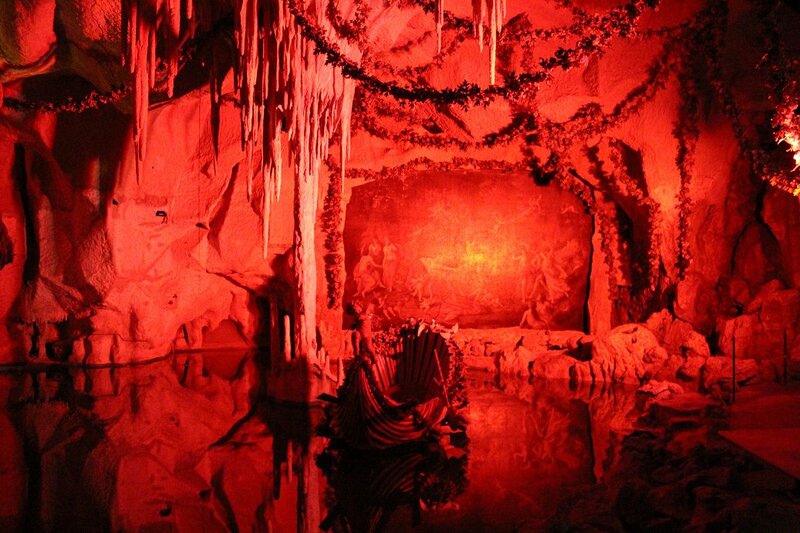 All of this was illuminated by electric lighting, creating different colour effects. 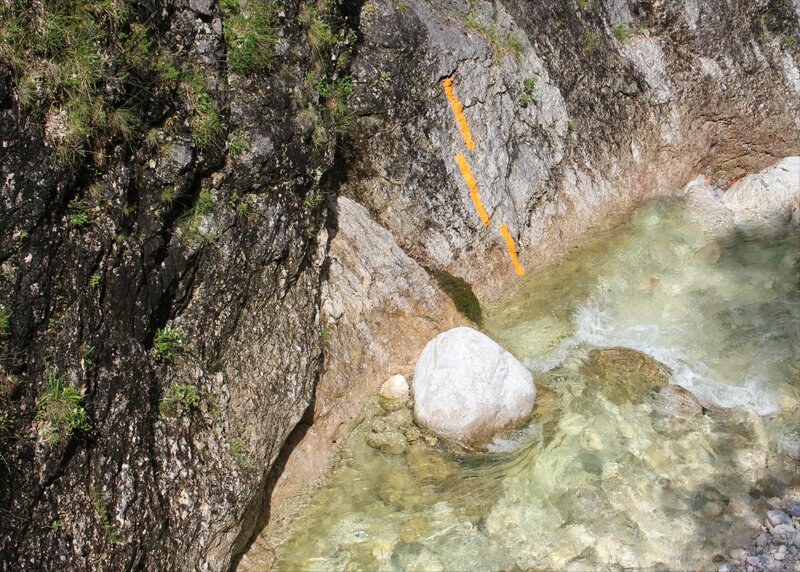 It is a wonderful illusion and hard not to be impressed as you stand by the water’s edge. 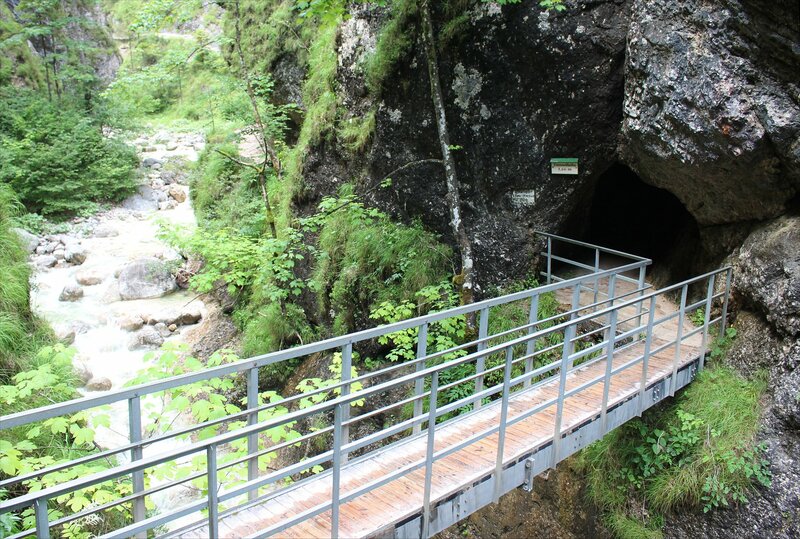 Our guide ran through a long explanation of the grotto in german before switching to a recorded english commentary which she left running as she headed off to get ready for the next group, by which point we were the only visitors left in the cave. 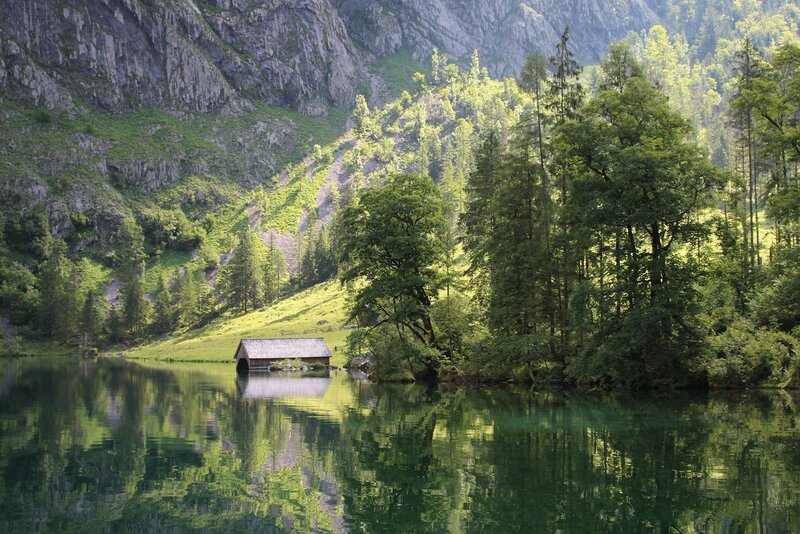 It suddenly felt far too cavernous, so goodness only knows how Ludwig must have found it when he was in there alone, drifting in his boat. 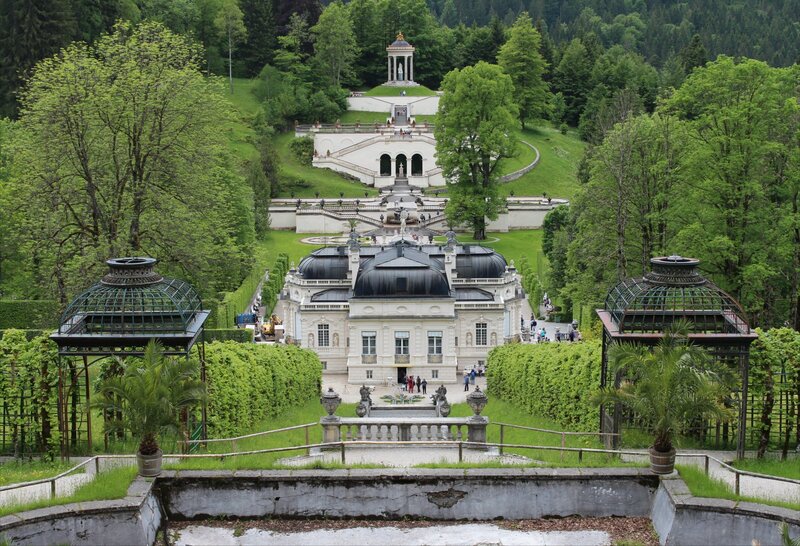 Overall, we had a great day at Linderhof but it is difficult to get a good sense of Ludwig’s time there as the tour guides present a sanitised version of Ludwig’s life story that is presumably intended to play well to any audience. 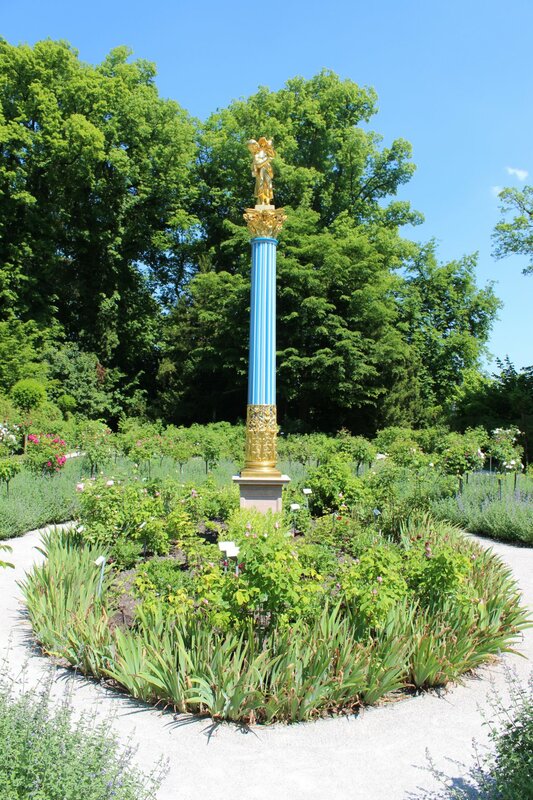 The edited story presented to visitors describes the loneliness of Ludwig’s life after he broke off his engagement whilst neatly omitting the scandalous tales of his male companions! 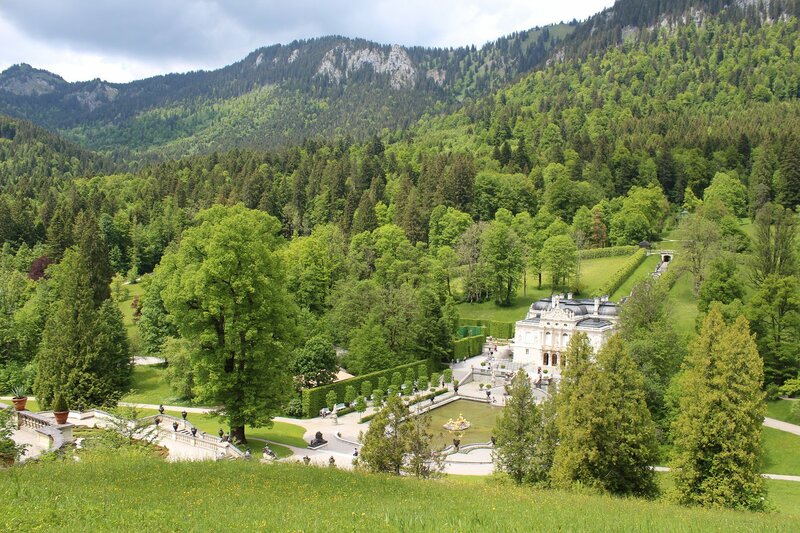 Linderhof first opened to the public two weeks after Ludwig’s death on 13th June 1886 and attracted 619 visitors (up to September) despite the lack of connecting routes. 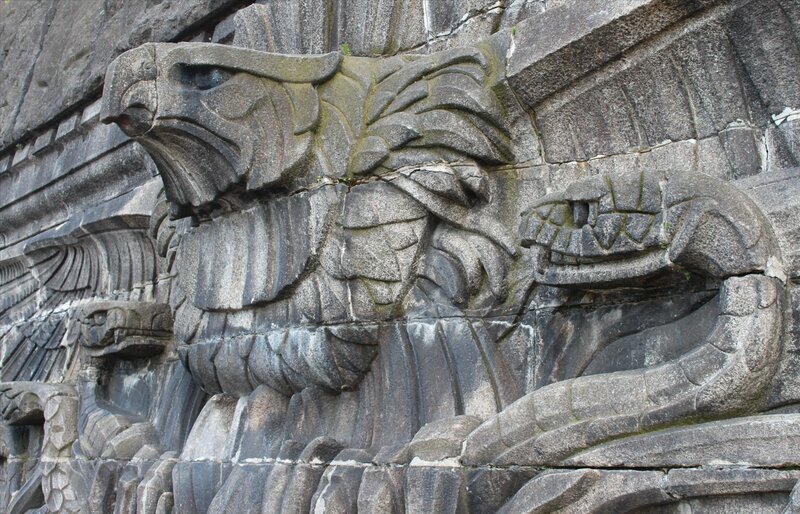 Once these difficulties were overcome the visitors poured in and the palace now sees over 1 million visitors a year. 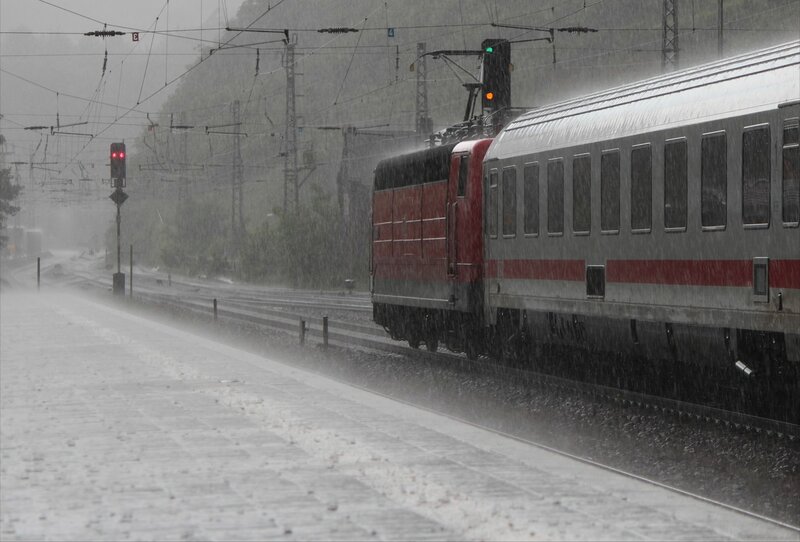 Various permutations of route by public transport are possible today, but all require at least one train journey and one bus ride. 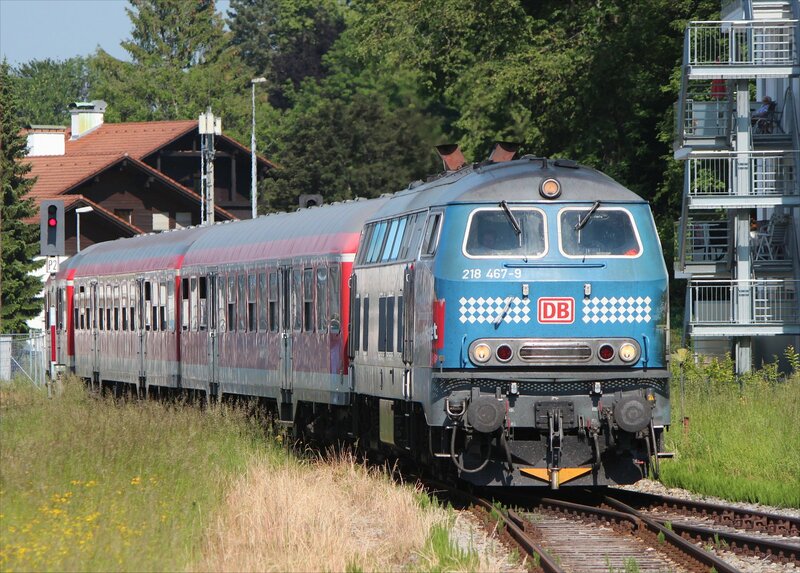 We caught the 8.32am regional train from Munich to Oberau, arriving at 9.45am. From the stop outside Oberau station we picked up bus 9606 at 9:58am and took this as far as Oberammergau, where we switched to bus 9622 to Linderhof. 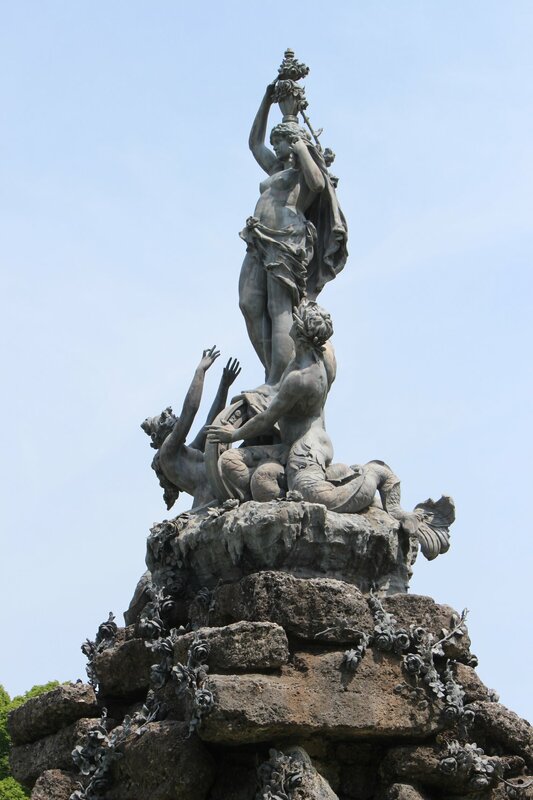 It took us two and a quarter hours to reach the palace. 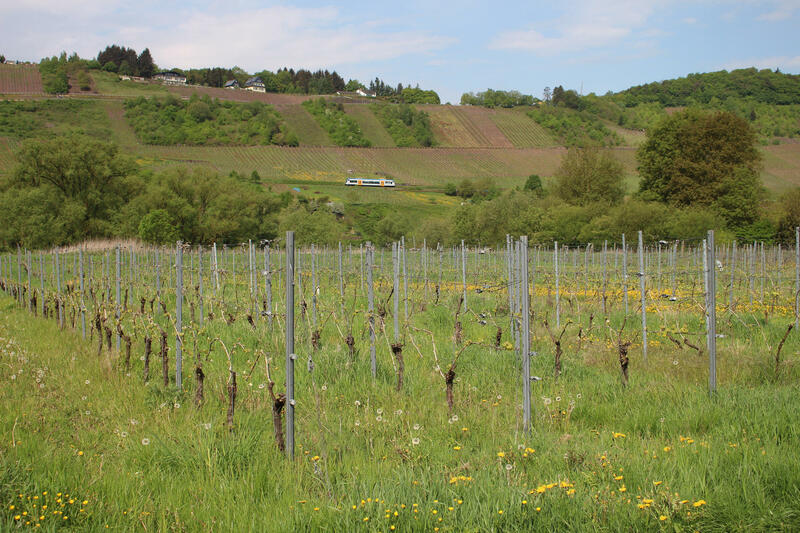 It didn’t appear to be a popular option – we were the only passengers on bus 9622! 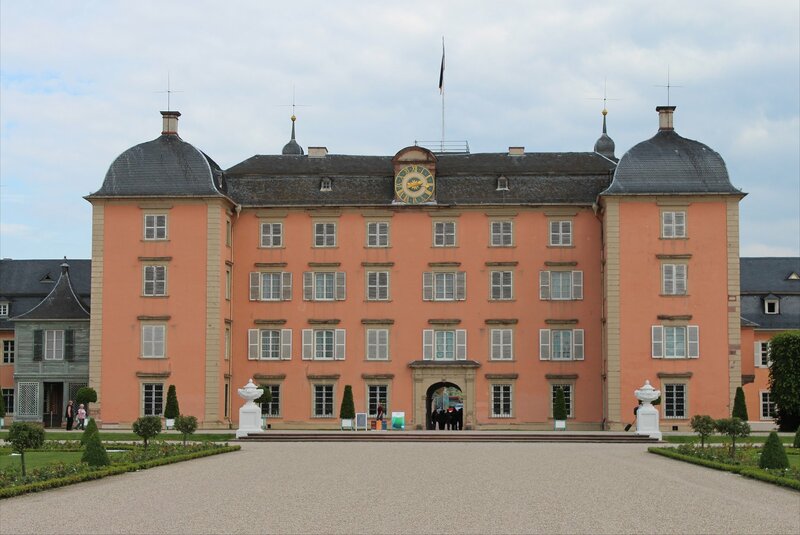 Tours are incredibly well organised at all of Ludwig’s palaces with your ticket giving you an admission slot for a specific time. Shortly before the appointed time you have to scan your ticket to get into what can only be described as a ‘sheep-pen’ for humans (there are four pens and an electronic display indicates which one you need to enter). 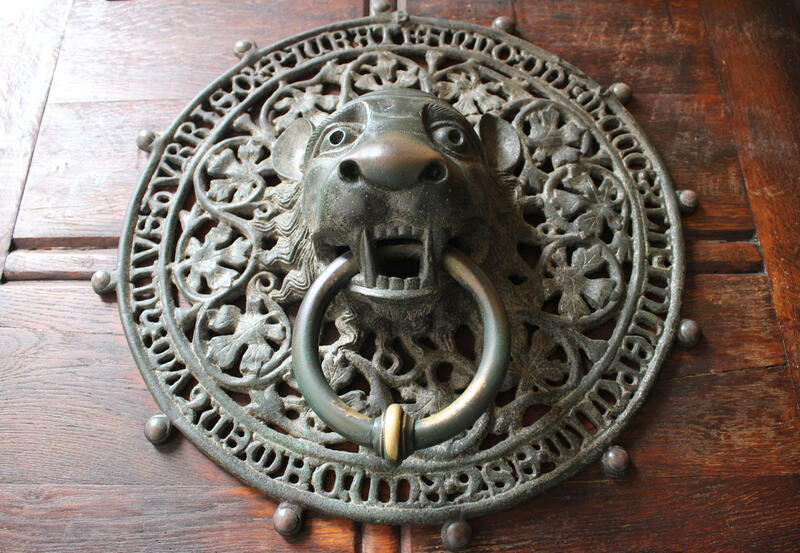 Once all the tourists have been coralled a gate opens at the other end, allowing you to start the tour under the watchful eye of your official tour guide. It may sound bizarre, but it is a really efficient system that ensures the staff can get as many people through the building during the day. Given the hefty visitor numbers that really is impressive. It appeared that the biggest influx of visitors had arrived in the morning on the day we visited, though I don’t know whether this is typical. The upshot of this was that the grounds were noticeably quieter in the afternoon. 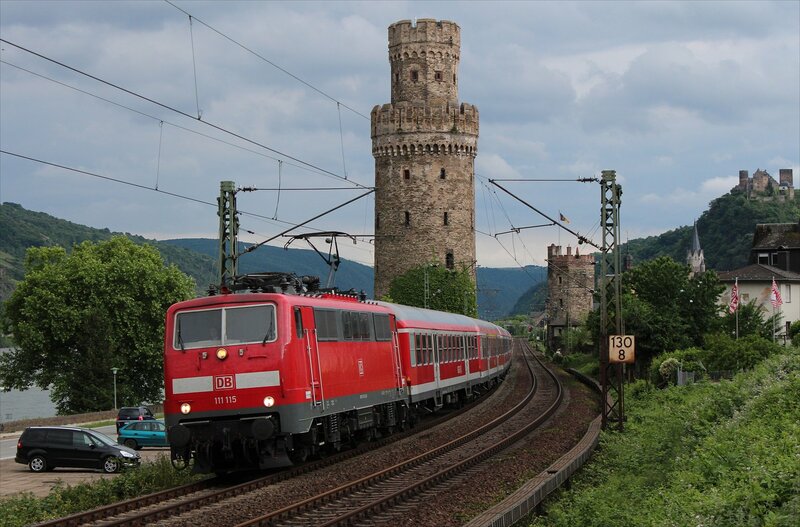 Taking public transport gave us a degree of freedom to spend as long admiring the grounds as we needed. 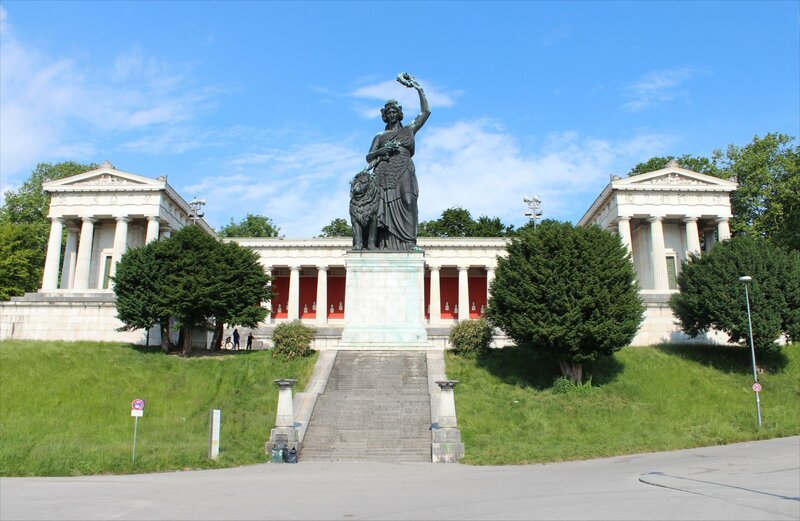 In practice, we found that 4 hours was sufficient time to see the palace, grotto and surrounding park (with time enough left over to get a refreshing glass of radler before catching the 3.06pm bus back). 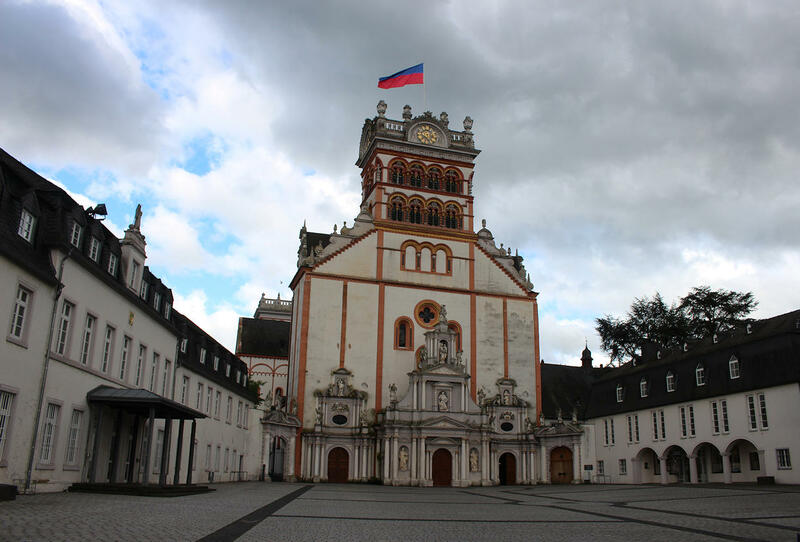 The return journey gave us a 29 minute break at Ettal between buses and a chance to glimpse the wonderful interior of the Kloster Ettal. It’s certainly worth a look if the timings permit it. 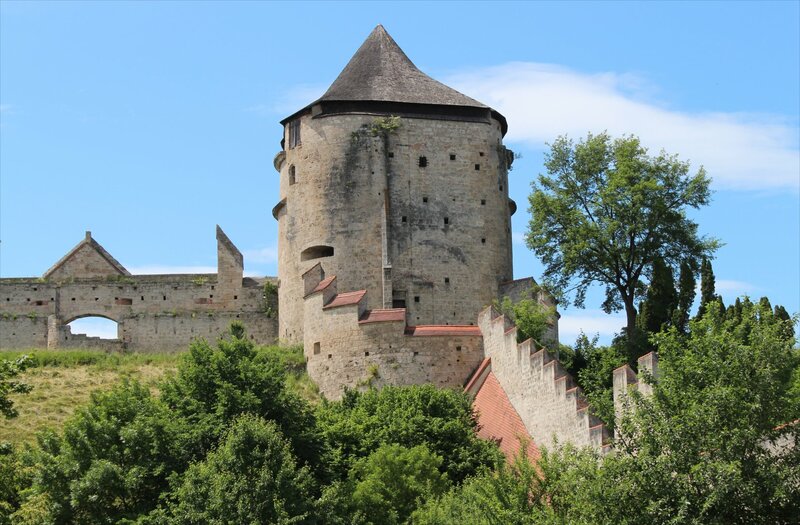 A fresh day saw us head east to the fortress at Burghausen, which is notable for being one of the longest castle complexes in the world. 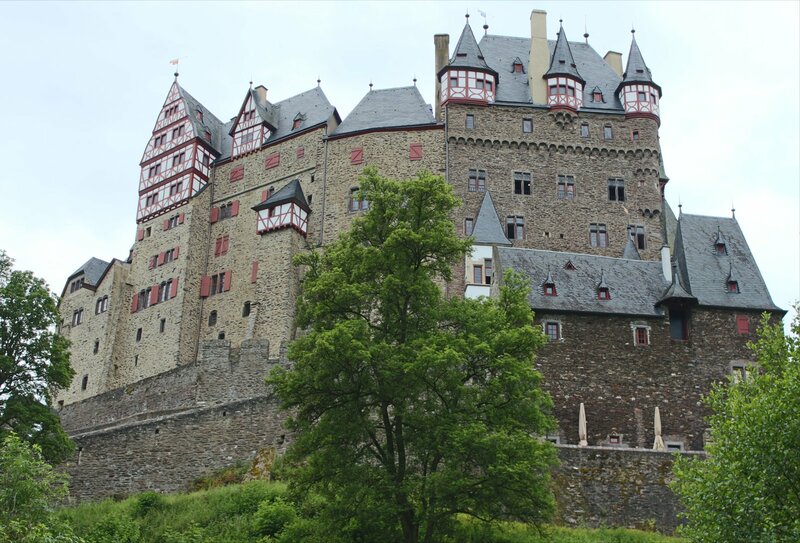 The castle’s footprint stretches out for 1000 metres and encompasses six courtyards, a couple of chapels, a clocktower and the palace itself. 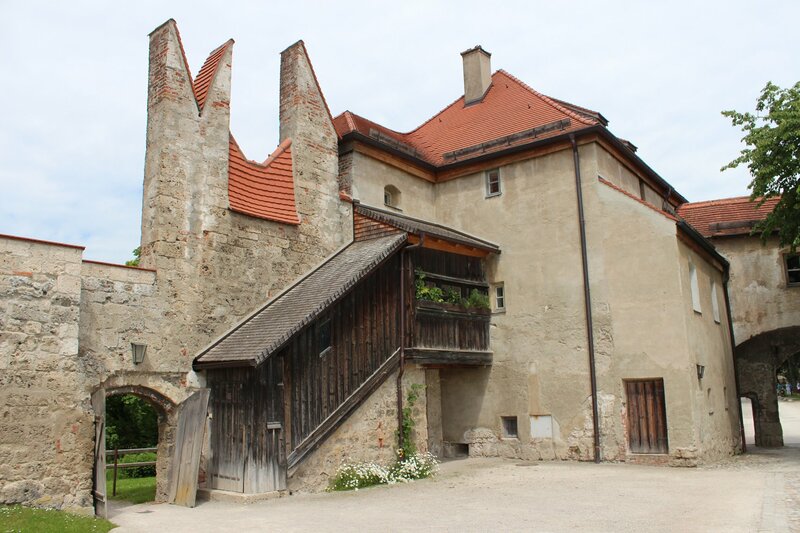 The castle was used by the Dukes of Lower Bavaria from the House of Wittlesbach as their second seat of government and was constructed between the 13th to 16th centuries. 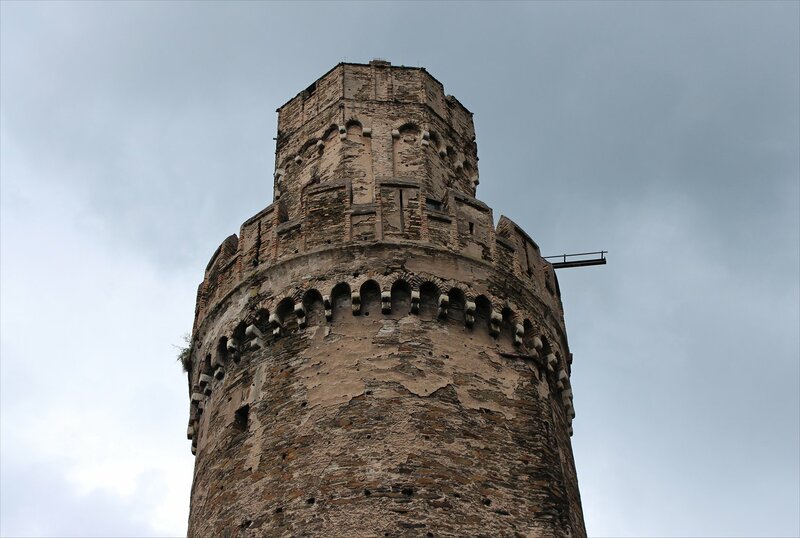 It was fortified at the end of the 15th century in anticipation of a Turkish invasion, making it the most formidable fortress in the country. 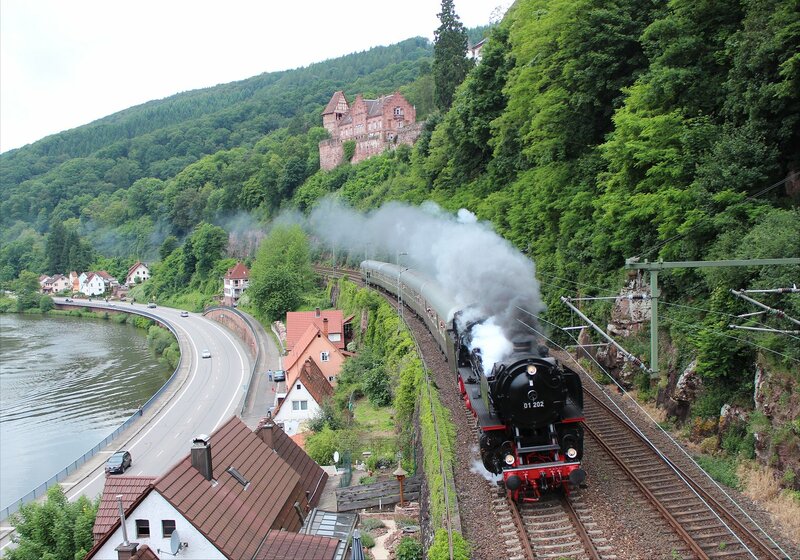 You get a really good sense of this from the platform at the top of the State Castle Museum as you look back on the long tail of the castle winding through the wooded hillside. 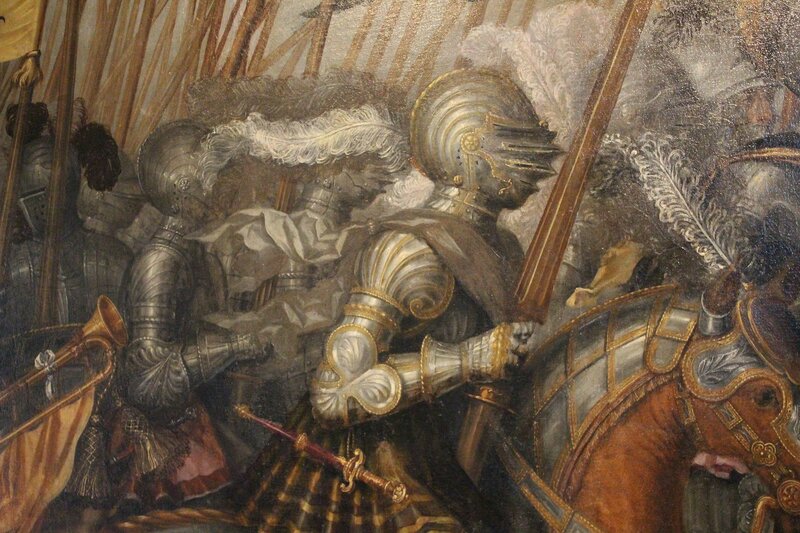 A particular delight of the interior is the collection of massive paintings showing the battles of the Bavarian dukes – you need to stand before them for quite a while to absorb the scale of each battle and the rich detail woven into the paintings. 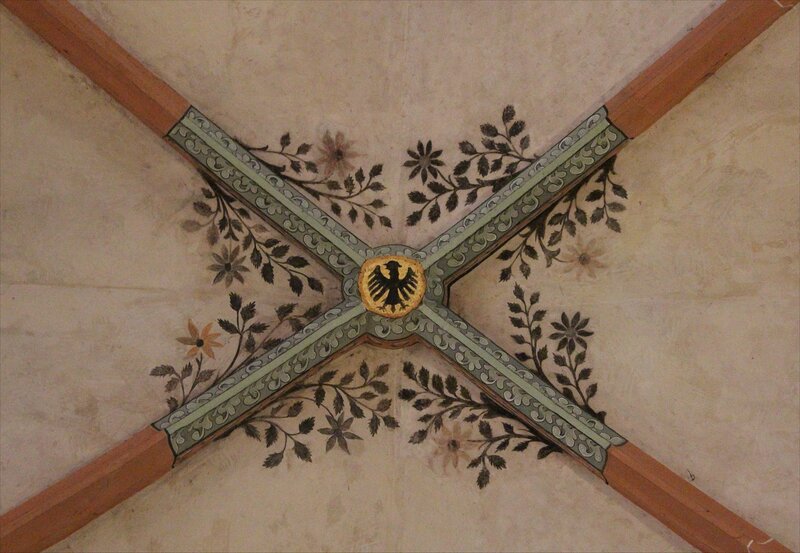 The most stunning of these is the 11 metre long painting of the Battle of Mühldorf in 1322 which depicts the meeting of Frederick I of Hapsburg and Albert Rindsmaul of Bavaria mid-battle. 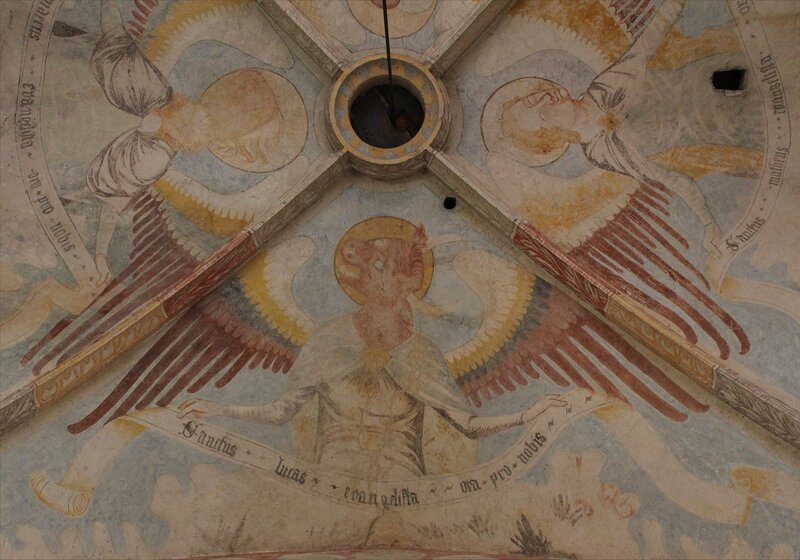 The 11 metre long painting of the Battle of Mühldorf in 1322. 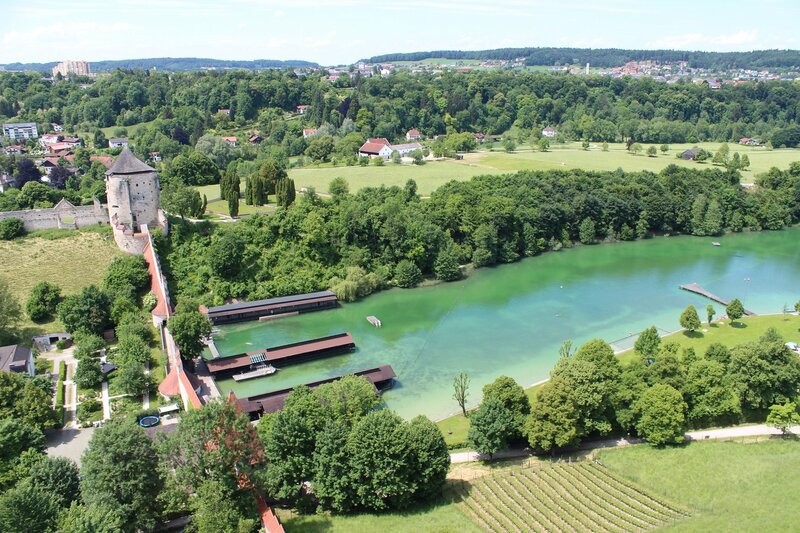 It was a particularly hot day when we visited and a dip in the swimming facilities in the river looked incredibly tempting, though we settled instead for a refreshing ice cream! 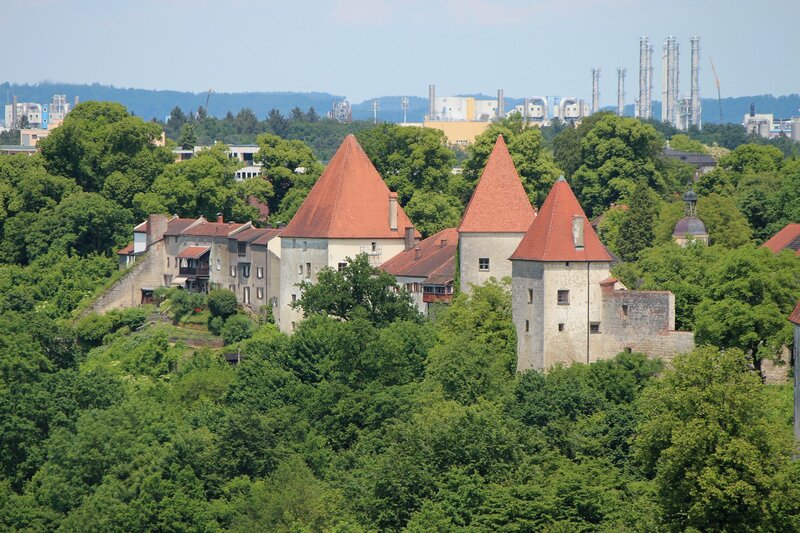 The journey from Munich to Burghausen takes about two hours by train. 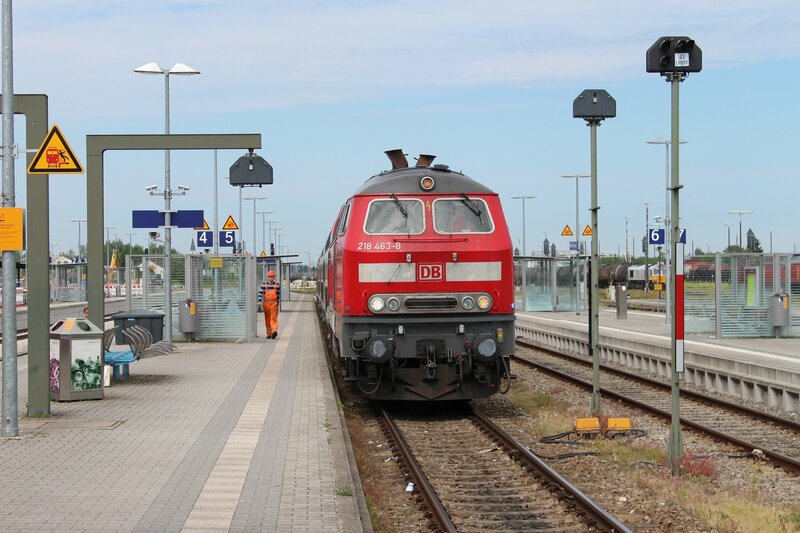 On our day trip we caught the 9:07am train from Munich which reached Mühldorf at 10:16, giving us a 21 minute break before switching to the 10:37am train to Burghausen (which gets in at 11.16am). 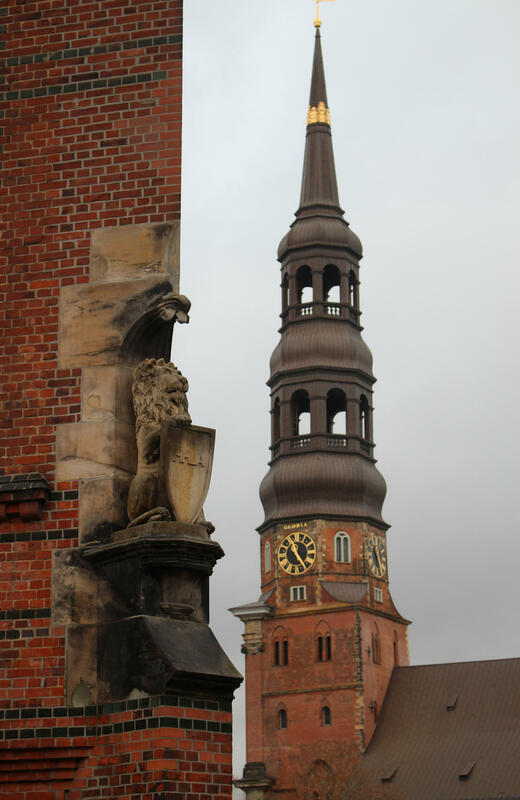 All in all, we spent about three and a half hours exploring the castle and the old town, including a visit to the State Castle Museum, before taking a train back to Munich via Mühldorf. 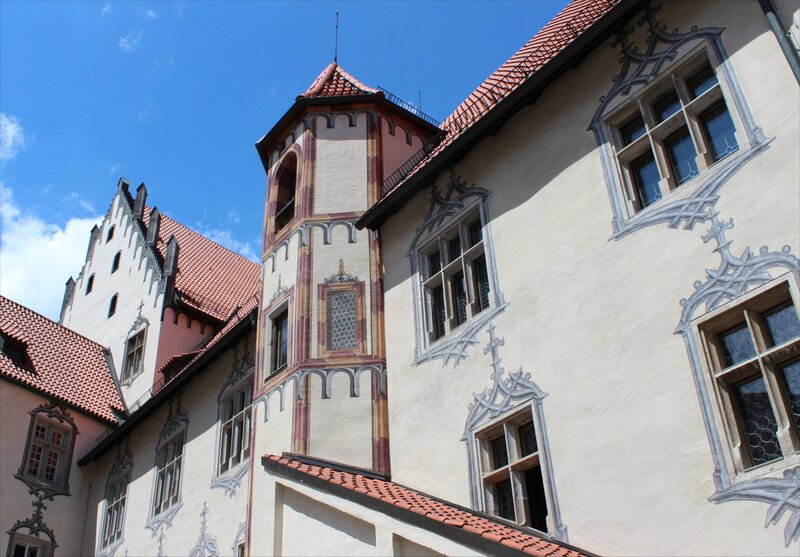 We used the remarkably good value 14 day ticket of the Bavarian Palace Department to cover admission to the castle museum. 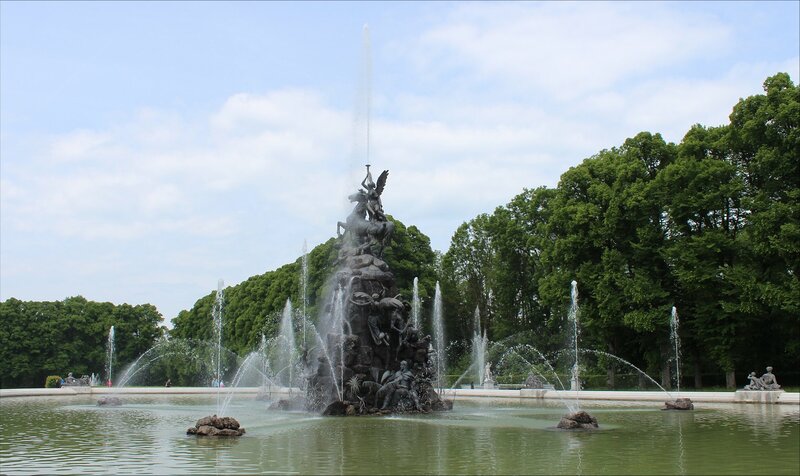 The Royal Palace at Herrenchiemsee was opened to the public just six weeks after the death of King Ludwig II on 13 June 1886. 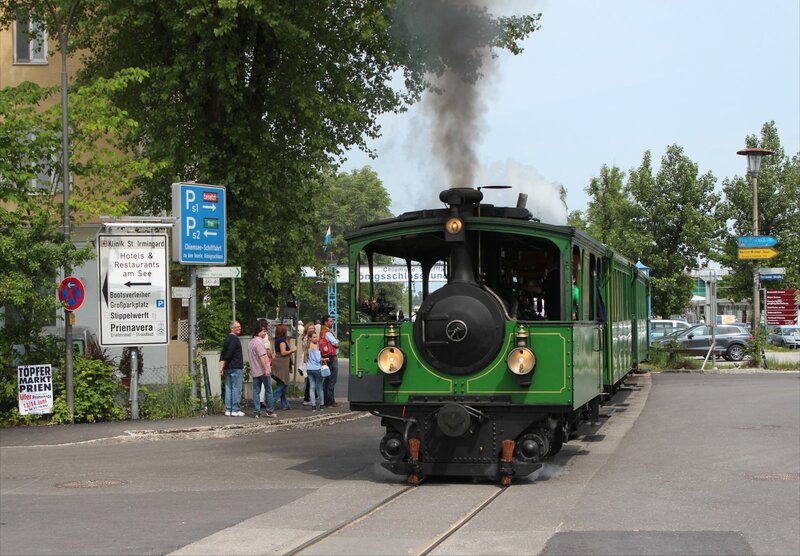 Although visitor numbers were low at first they soon shot up to extraordinary numbers and it was this dramatic increase in the number of visitors arriving at Prien am Chiemsee that spurred rapid development of the transport infrastructure in the area. 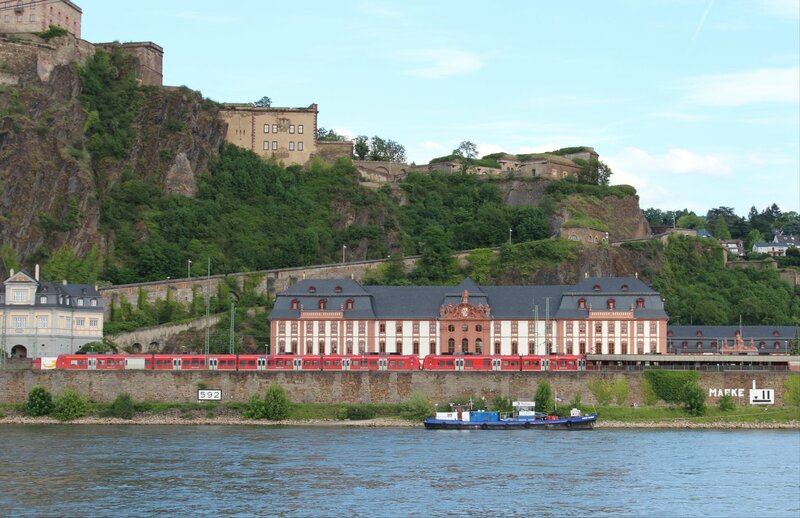 Although there had been a ferry to the islands since the mid-nineteenth century the additional tourist traffic soon necessitated a more frequent ferry services to Herreninsel. 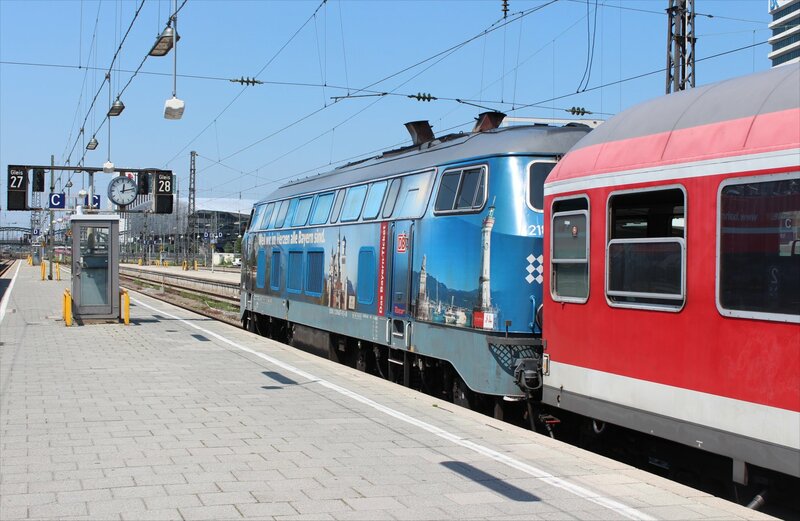 However, the absence of a shuttle service between the railway station and the harbour remained a problem for arriving passengers. 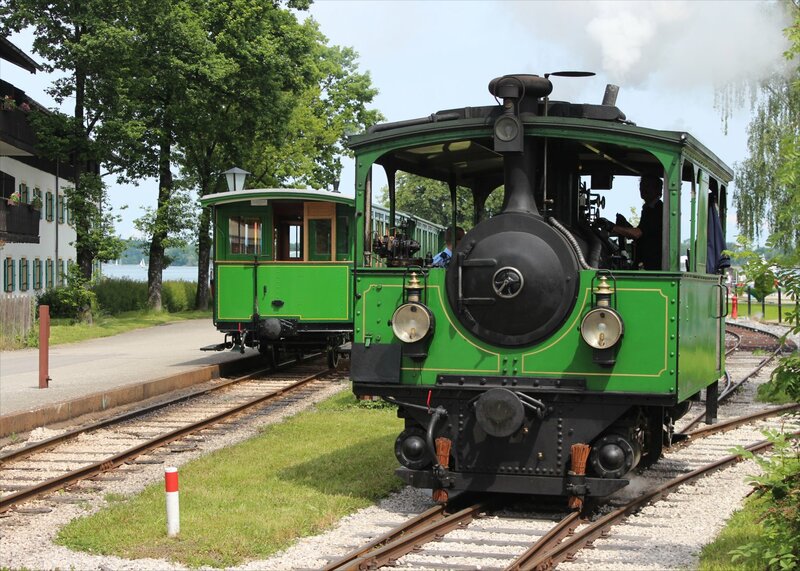 Ludwig Fessler was quick to seize the opportunity and reached agreement with George Krauss (founder of the Krauss Locomotive Works in Munich) to construct a 2km single track metre-gauge line between the mainline station (Prien) and the harbour (Stock am Chiemsee). 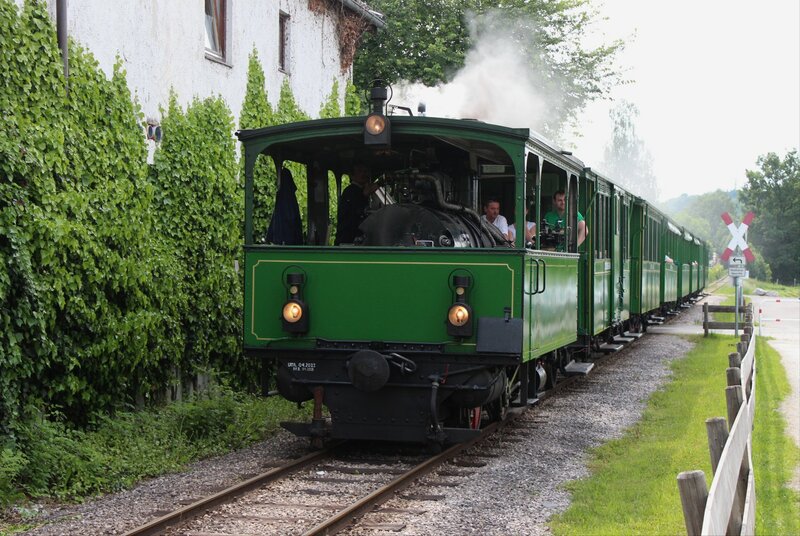 The line opened on 10th July 1887 and was an immediate success. 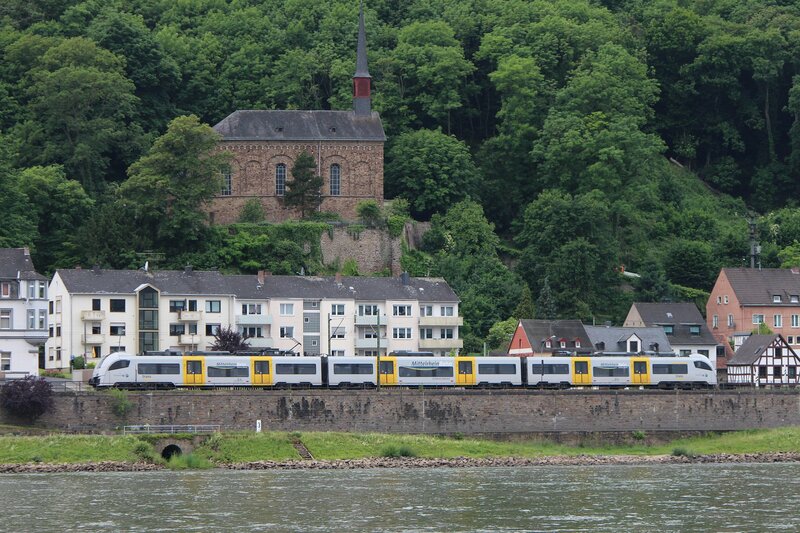 Services soon had to be increased to meet the demand, despite the relatively expensive fare for the time. 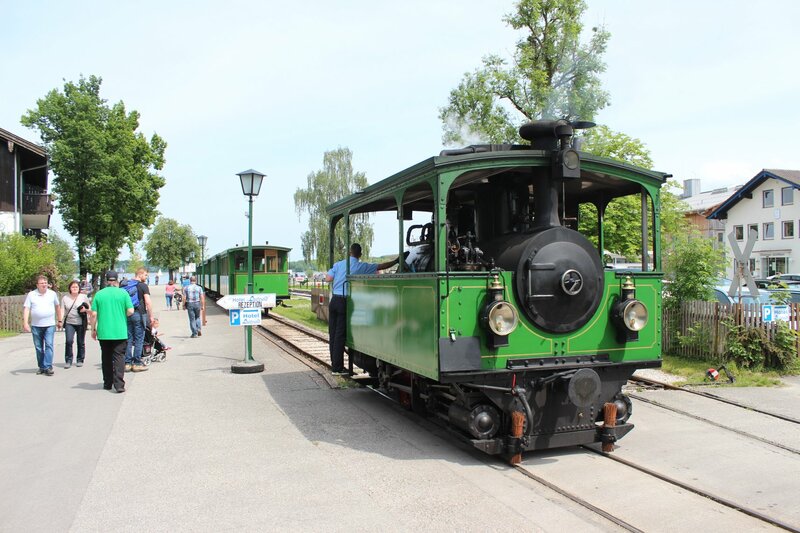 Although the train only hauls passenger carriages today, in its early years the consist included two open wagons with coal for the steam ships and the islands. 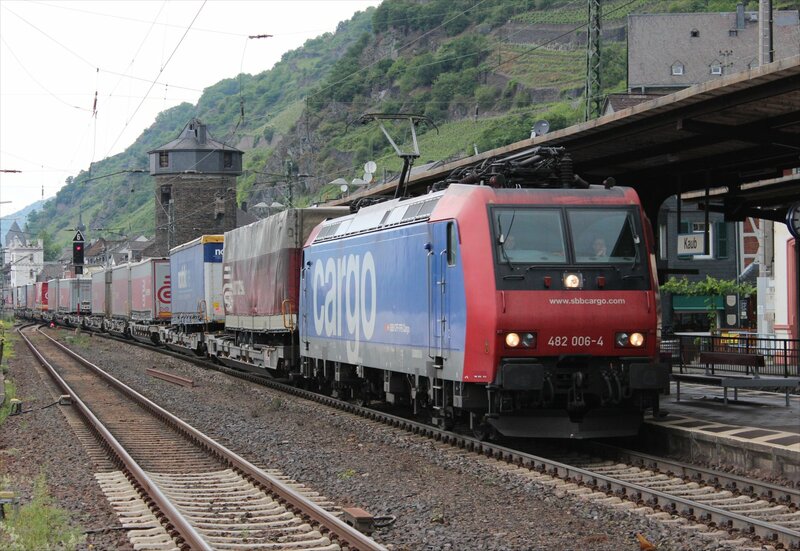 In time the freight traffic disappeared and for a time it seemed as though the entire railway would follow suit. 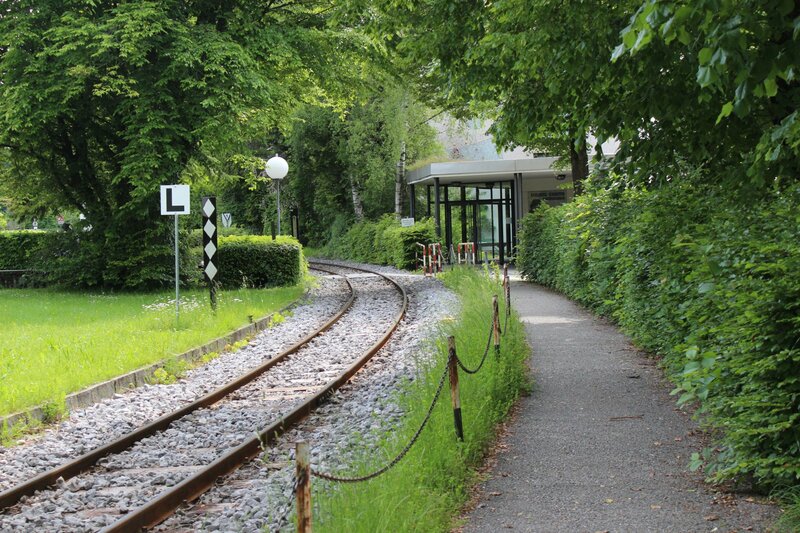 Thankfully the threats to the line were staved off and the the railway looks to be thriving. 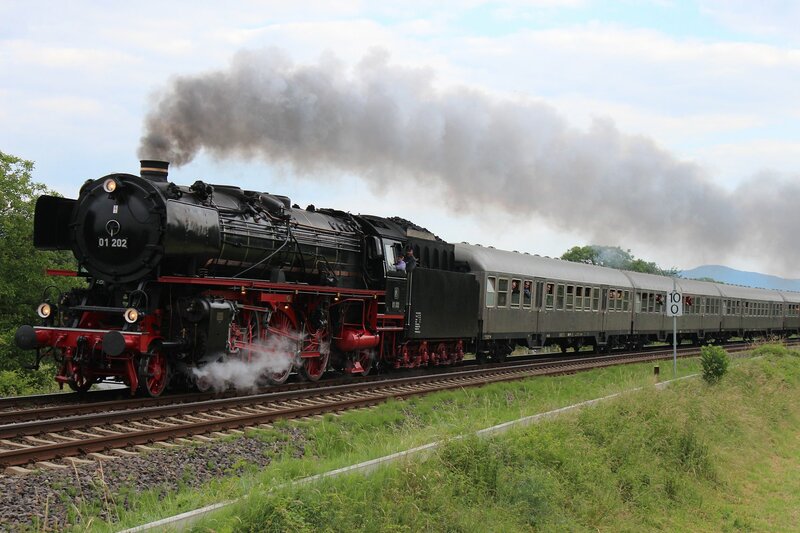 Remarkably, the railway still uses the same steam locomotive and stock today that it did at the beginning of its existence (although the boiler in the locomotive was replaced in 1957). 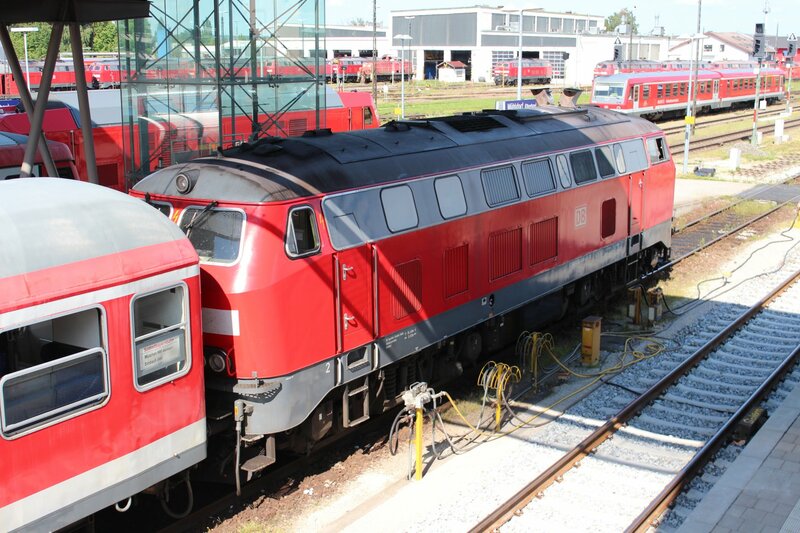 In 1962 the railway purchased a diesel locomotive for use when traffic is lighter. 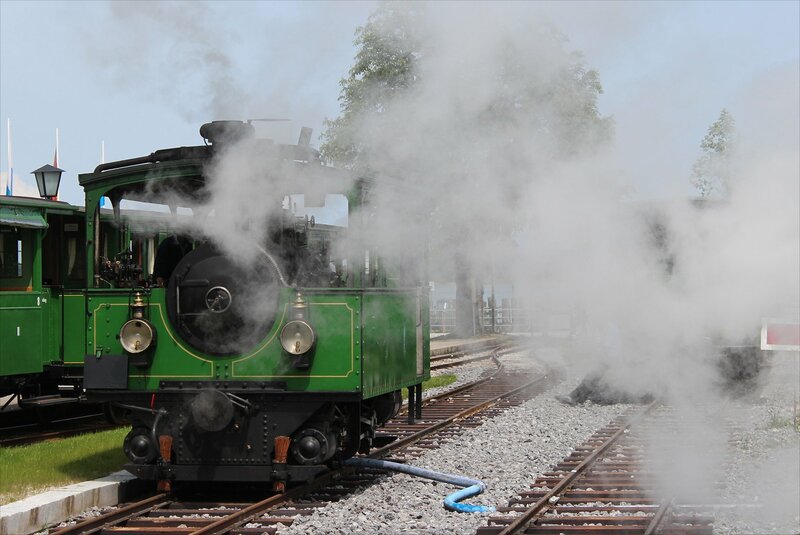 On the day we visited we were lucky enough to see the steam locomotive in use and took advantage of the good weather to walk the footpath that runs alongside the line to check out the photographic opportunities. 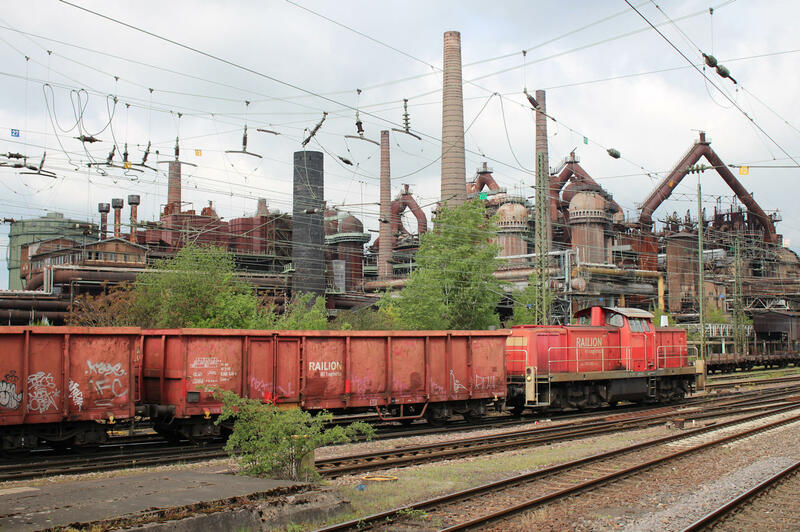 The yard at Stock offers a good opportunity to see the loco run around (the locomotive is bi-directional and was running with the chimney facing towards Prien during our visit). 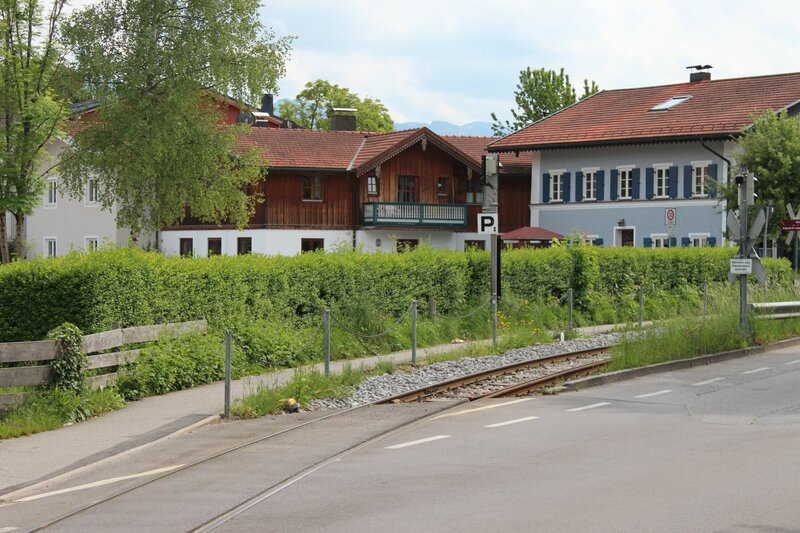 After leaving the harbour station (crossing a busy road) the line runs through a residential area, passing the rear of a tavern, residential care home and flats. A three foot tall hedge along the line makes photography tricky for a fair chunk of the way but there are a few interesting footpath and road crossings that offer some opportunities. 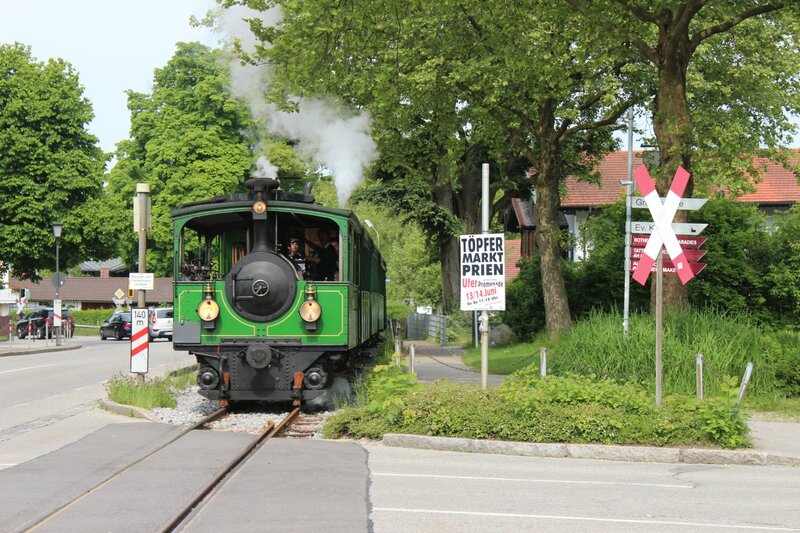 As the line reaches Prien it crosses a couple of roads, passes a pretty pond and then curves round to Prien station. 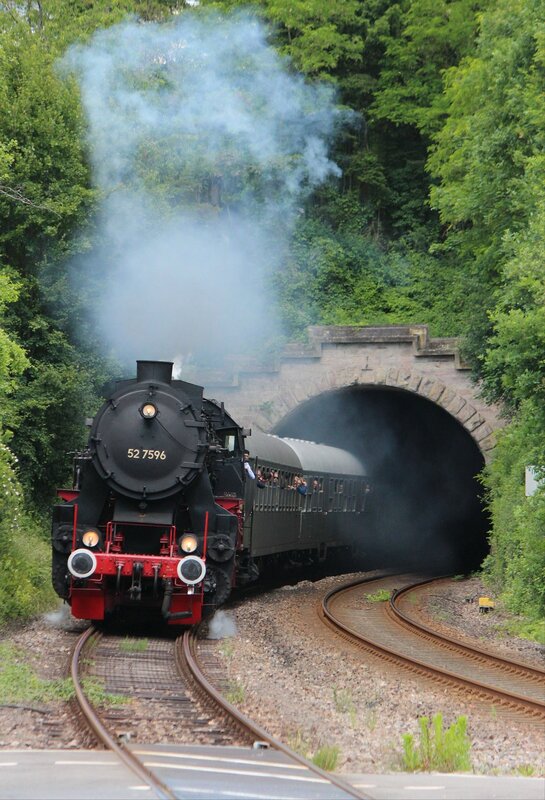 If you are relying on catching a mainline train it is worth noting that the timings are quite tight and if the train is more than a couple of minutes late (as it was on the afternoon we visited) you could be left with a dash through the adjacent subway to make your connection! Overall, it is a thoroughly delightful line. 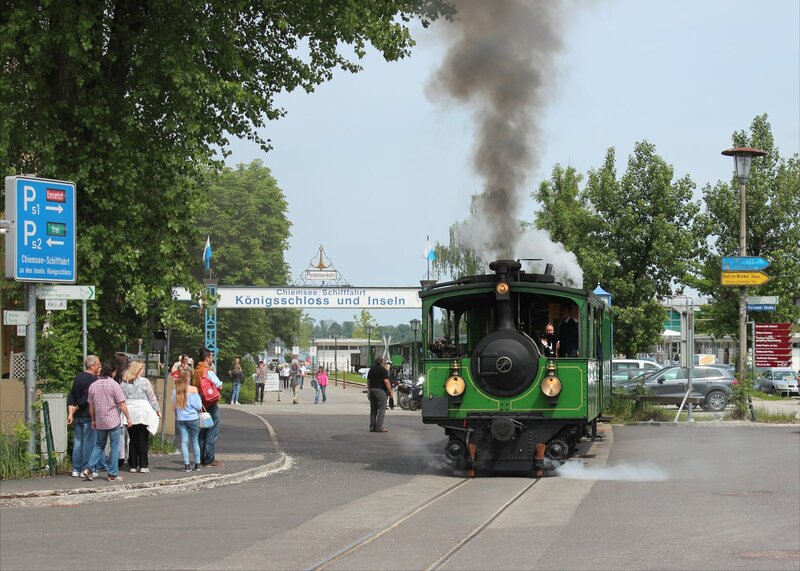 If you combine it with a sailing on the steam ship Ludwig Fessler (now under diesel-hydraulic power) and a visit to the Royal Palace at Herrenchiemsee it makes quite an amazing day out. 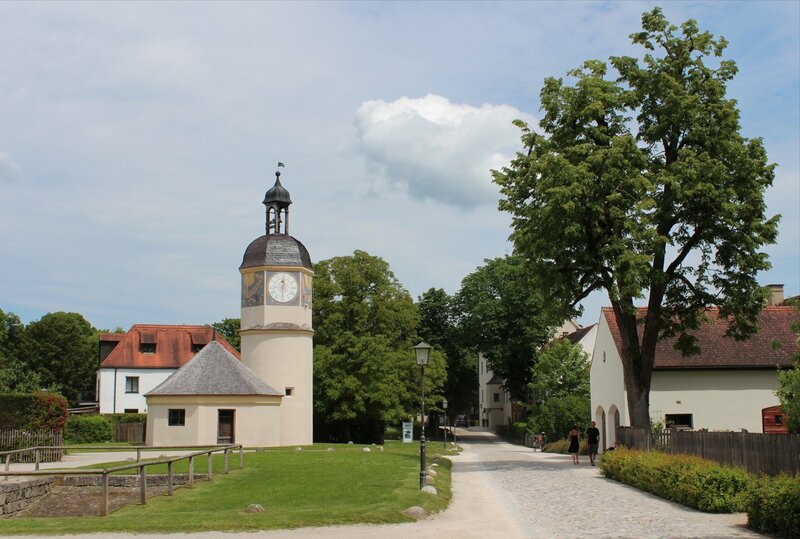 The first stop on our tour of King Ludwig II’s palaces brought us to the town of Prien am Chiemsee, an hour’s journey by train from Munich. 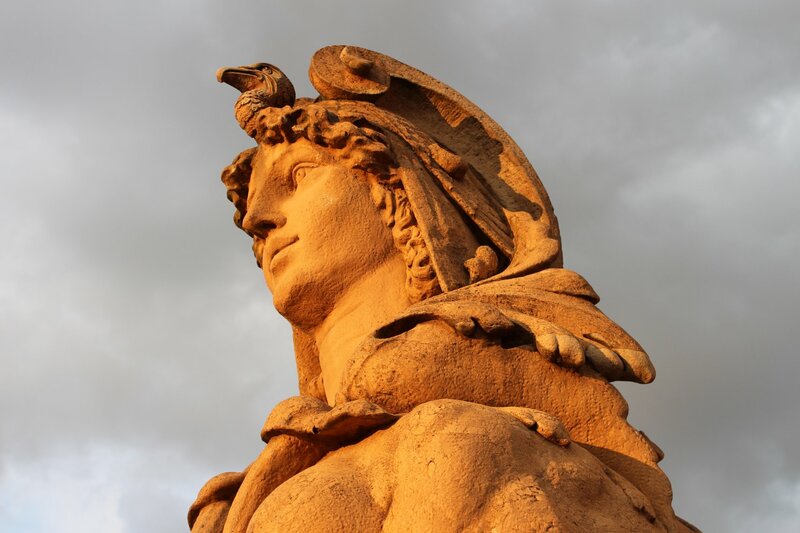 It was here that Ludwig audaciously planned to build a new Versailles in tribute to his idol Louis XIV and the lost age of absolutist rule, having discovered a suitably reclusive spot on a heavily wooded island in the middle of the lake. 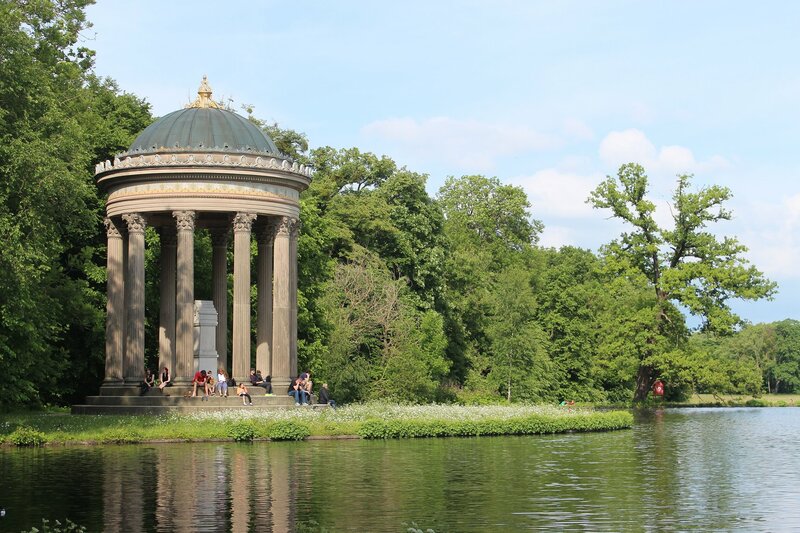 As a visitor you get a sense of the seclusion that the island of Herreninsel offered as you take a ferry from the harbour and follow this with a twenty minute walk through the woods to reach the palace. 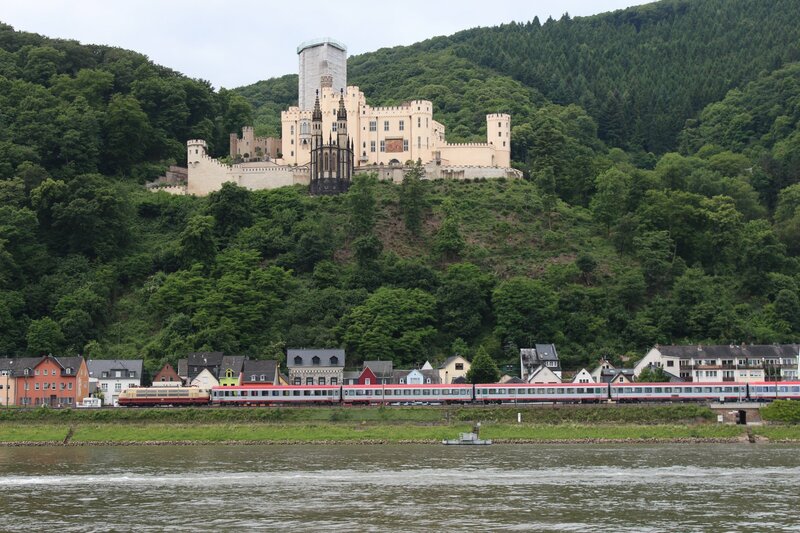 The ferry crossing offers only the briefest glimpse of the palace, adding to its dramatic effect, as was entirely intentional. 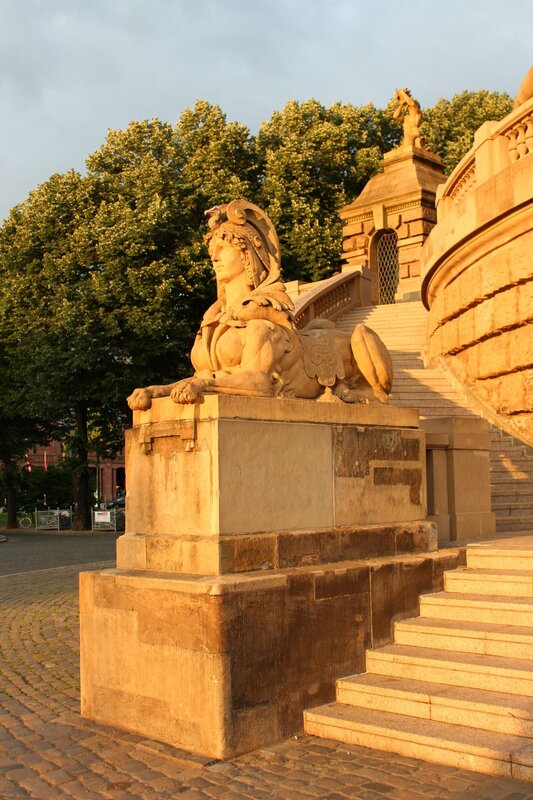 The island was to be a new kingdom that Ludwig could wander, taking delight in his new palace as it came into view from the myriad of pathways that cross the island or from the grand vista of the canal. 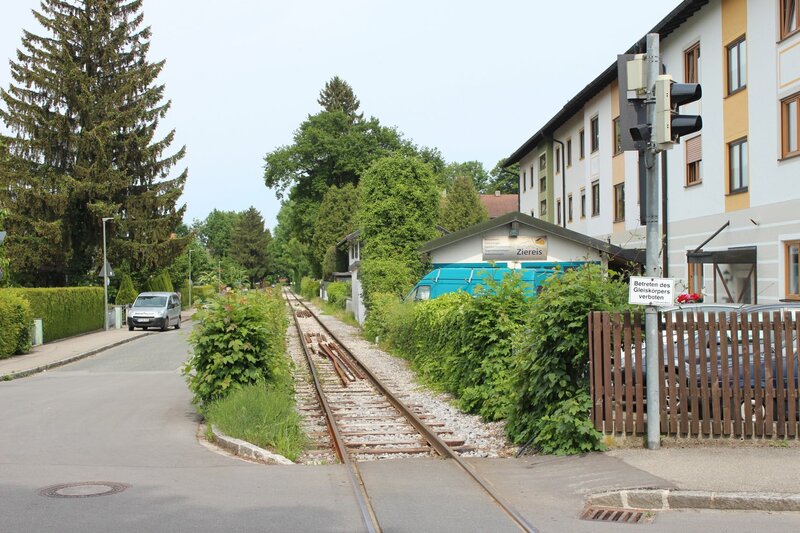 It is a pity that Ludwig never got to build his island railway as it would have been fascinating to see how that would have fitted into the scheme. 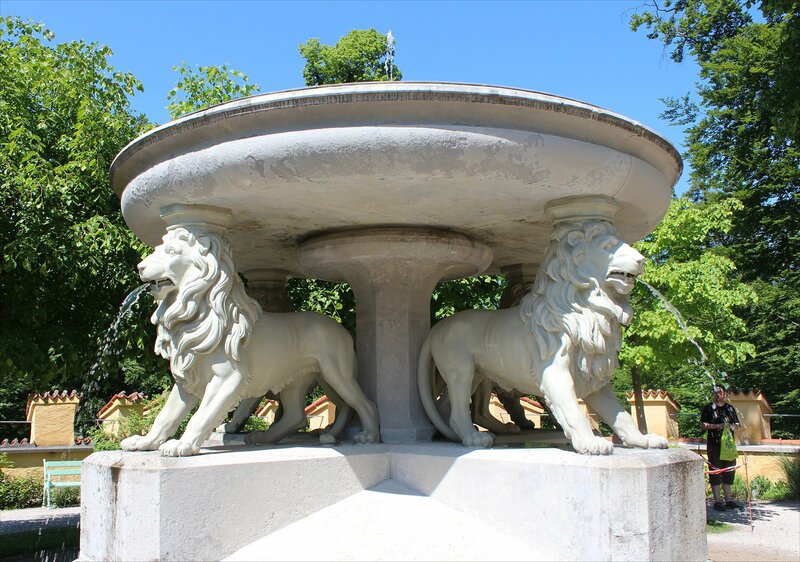 Once you reach the palace grounds you find that they offer a curious pick and mix, with a copy of the Latona fountain from Versailles and a couple of fountains from the royal palace of La Granja de San Ildefonso. 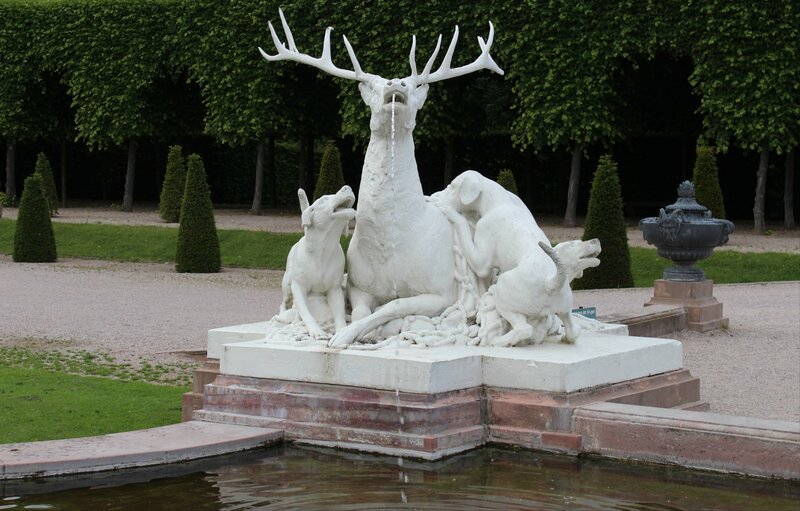 All entirely delightful, even if the vision remains incomplete – the final element, a copy of the Apollo fountain from Versailles, was never installed. 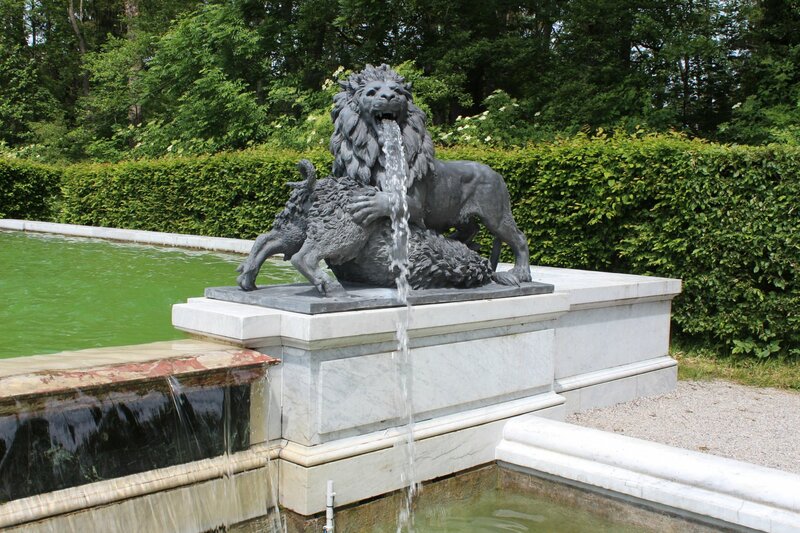 The fountains spring into life every half hour adding to the marvellous vision of the Palace. 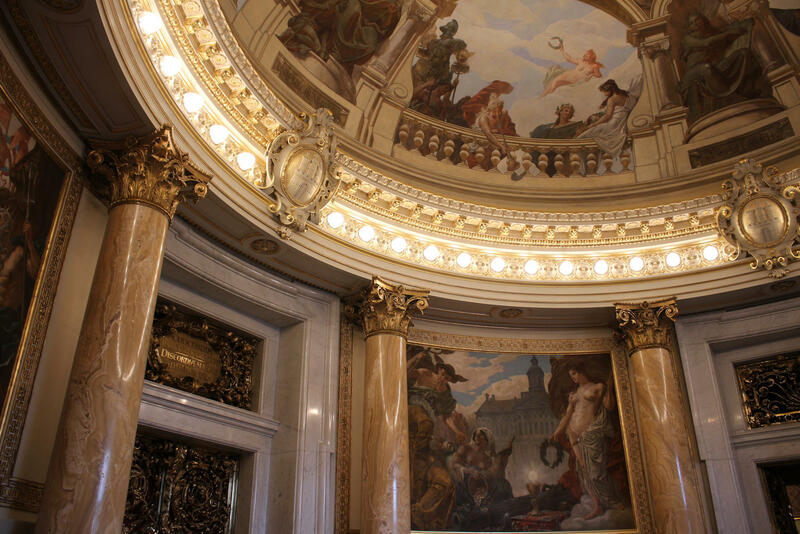 The interior of the palace is breathtaking from the moment that you enter the state staircase (a replica of the Ambassador’s Staircase from Versailles, recreated from engravings as the original was destroyed in 1752) to the moment that you step out of the last room. 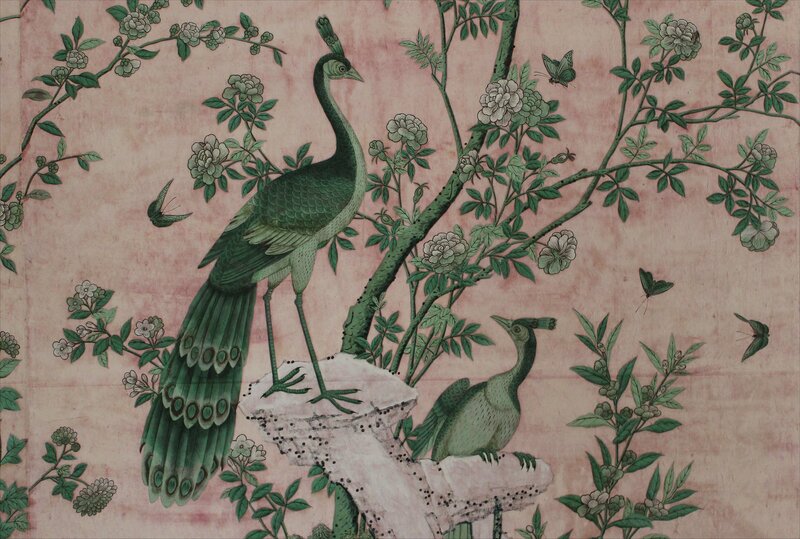 Opulent does not even begin to cover the breathtaking decoration and furnishings in each room (where many of the equivalents at Versailles have long since lost their furnishings these rooms are almost fully furnished, having not suffered from the ravishings of two revolutions). 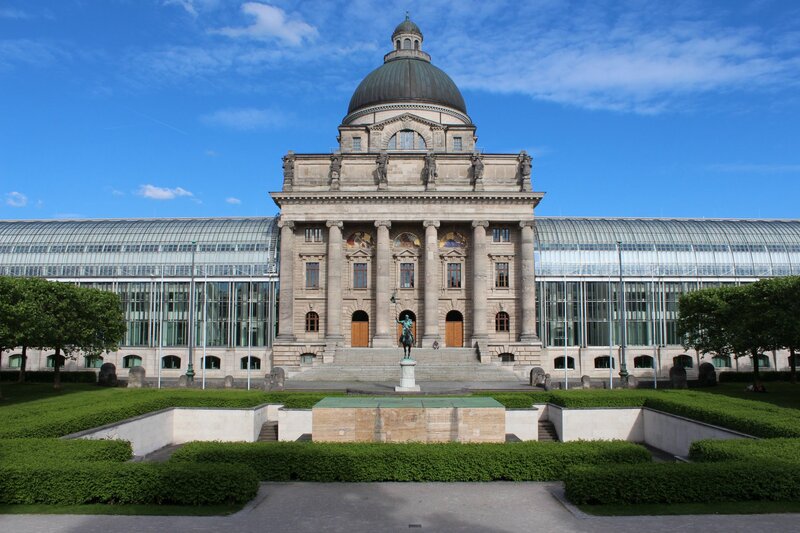 The re-creation of the Hall of Mirrors is particularly impressive, but so are the individual elements such as the chandeliers and delicate flower bouquets made entirely of Meissen porcelain. 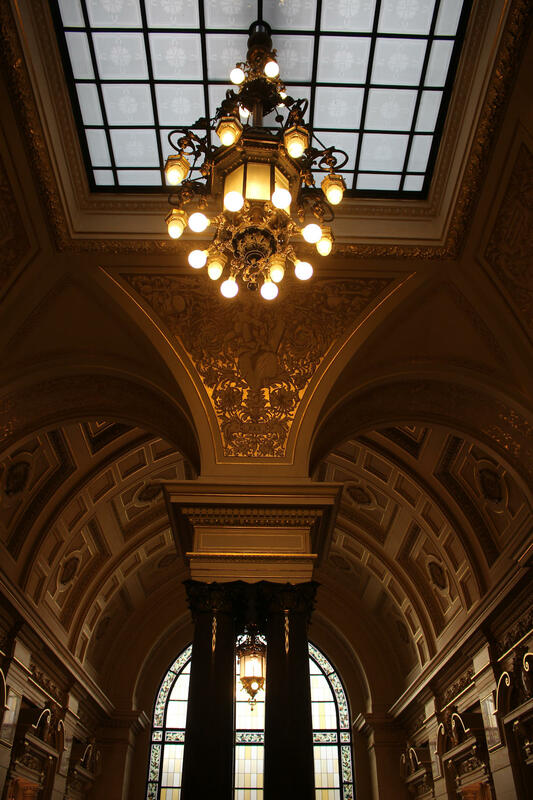 The guides can’t linger if they are to get the vast number of visitors around the building, but that’s probably just as well as you could spend forever focusing on all the marvellous touches to these rooms! 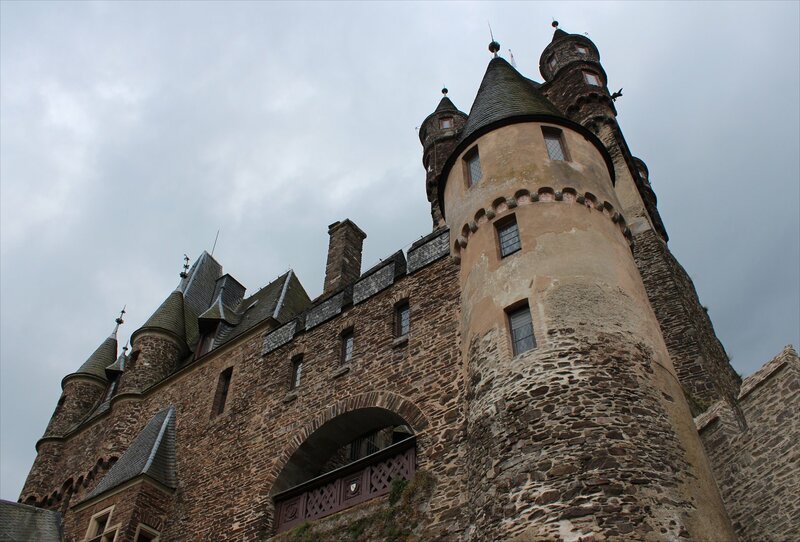 The tour of the King’s living quarters, which have little to do with Versailles, proved to be the highlight for me. In particular, Ludwig’s bedroom with its blue globe night-light (naturally, on a richly carved and gilded stand) gave a much stronger sense of his personality and you could imagine how beautiful the room must have been with its artificially created moonlight filling the room. 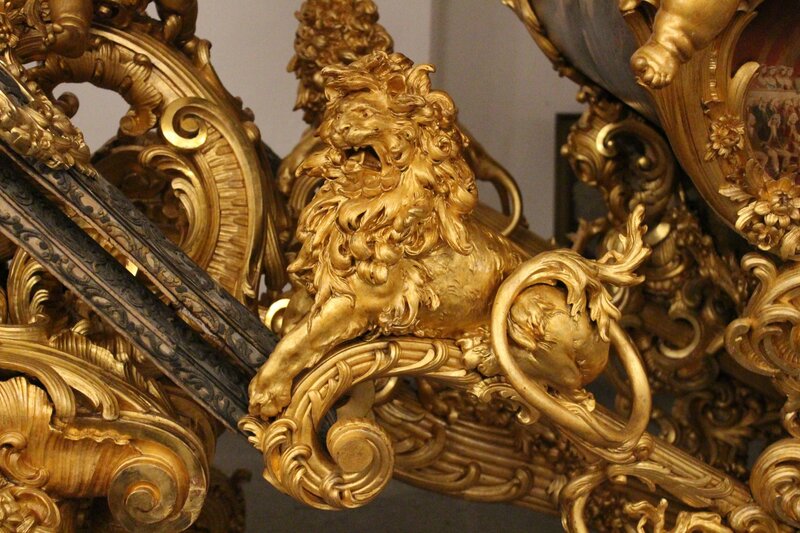 Another touch that gave a sense of the man behind the legend came from the ‘magic’ table which could be mechanically lowered and raised, allowing Ludwig to dine without coming into contact with his servants. 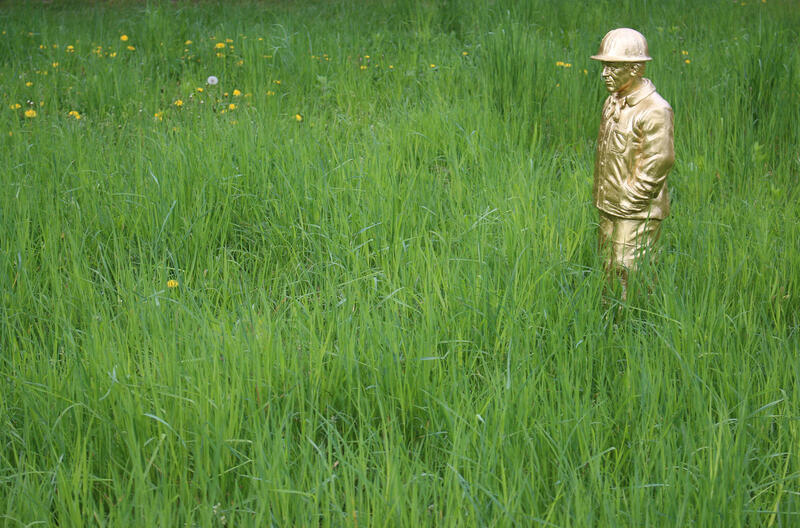 Such a lonely existence. 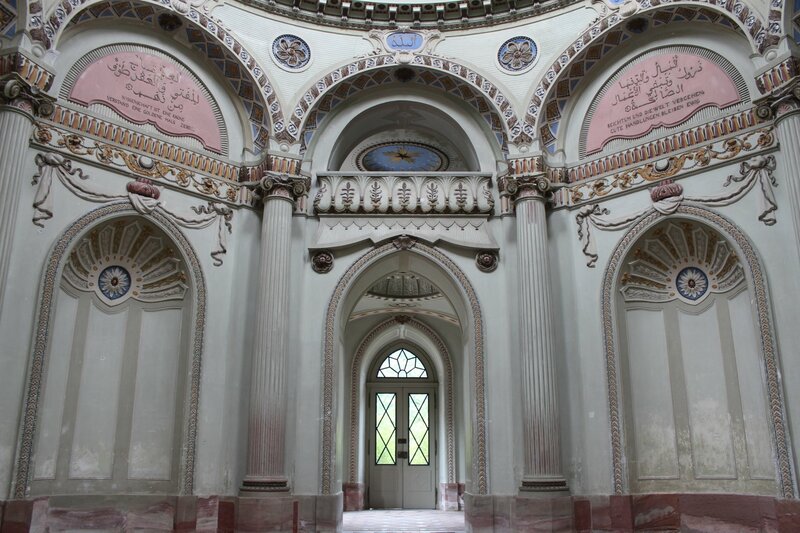 On our visit to the palace an art exhibition was taking place in the unfinished rooms, offering a rare opportunity to see just how plain these rooms are. 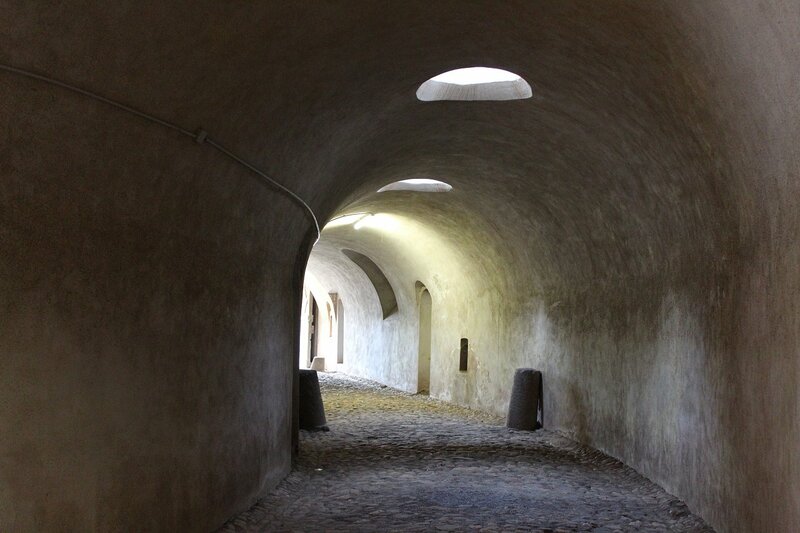 These rooms are empty brick shells, perfect for modern art but a world apart from the rooms we had seen moments earlier. 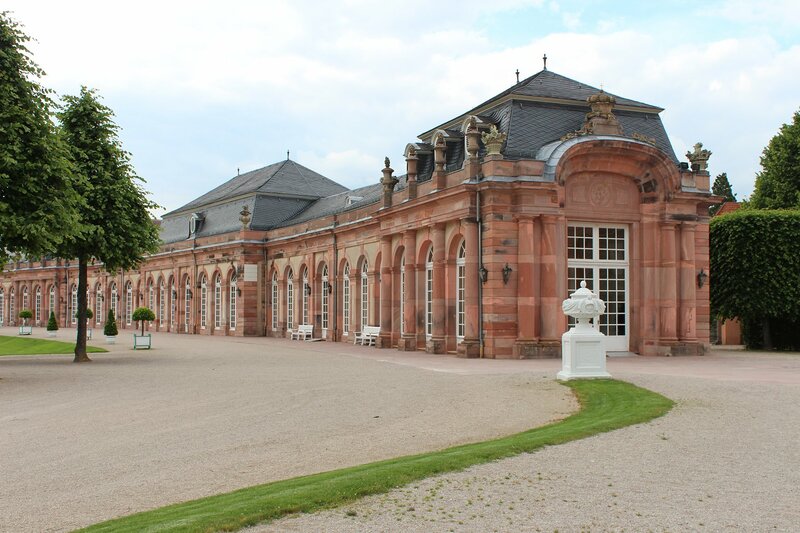 On our visit it was stressed that talk of Herrenchiemsee as an ‘unfinished’ palace are a little wide of the mark for the construction plans of 1878 show no further interiors than the ones we can see finished today – demonstrating just how well the finished rooms created sufficient illusion for the King’s purposes. 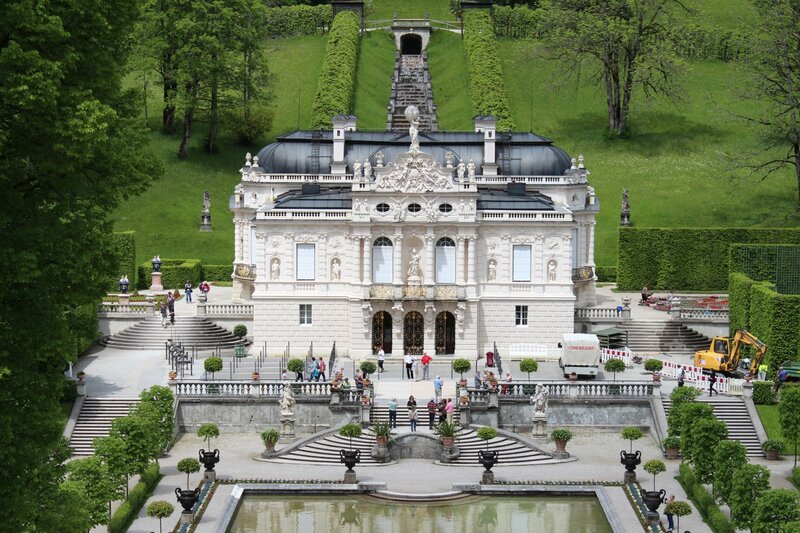 The palace also houses the King Ludwig II museum which offers a fascinating glimpse into the King’s long lost residence in Munich (destroyed during the Second World War), his remarkable winter garden (a vast water filled conservatory built atop the Munich Residenz, dismantled in 1897) and a variety of other projects that never got off the drawing board. 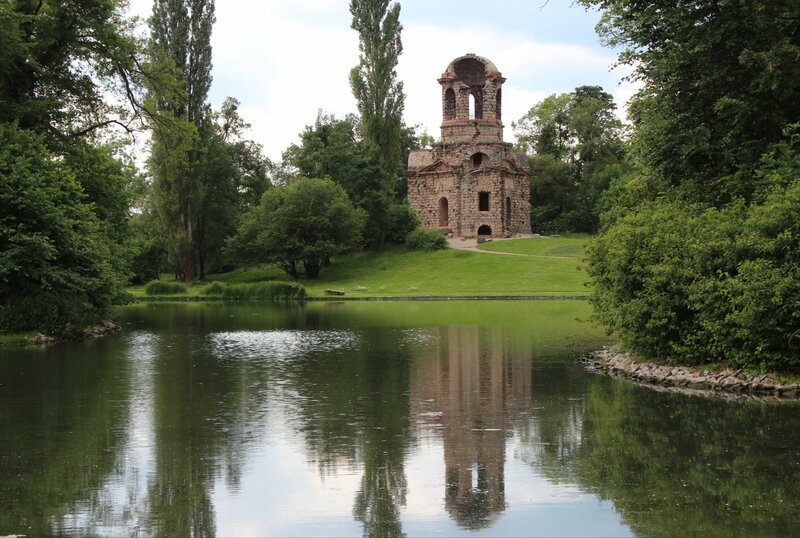 After leaving the palace we sampled the delights of a radler on the terrace before exploring the monastery (worth a visit in its own right for its beautiful interior and the fascinating contrast of the simple apartment that Ludwig II used whilst overseeing his project) and taking a walk out to get a view of the Lakeside Chapel of the Holy Cross. You can easily spend an entire day here. 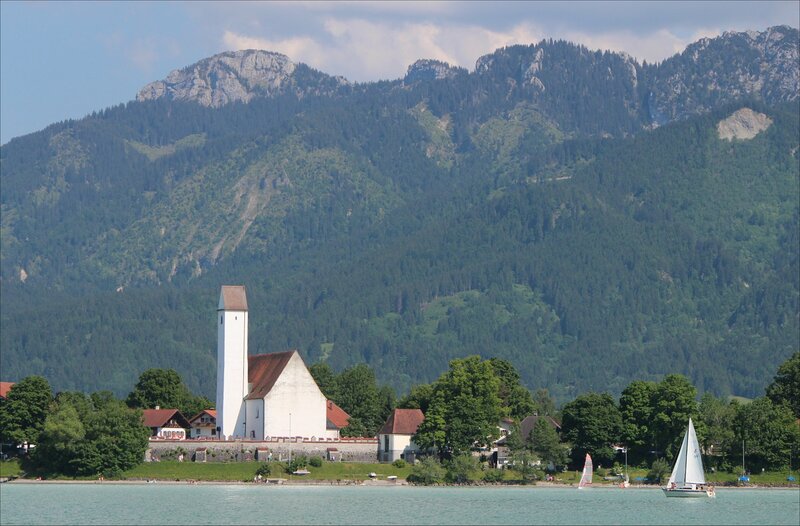 Prien am Chiemsee is roughly an hour by train from Munich and Salzburg. 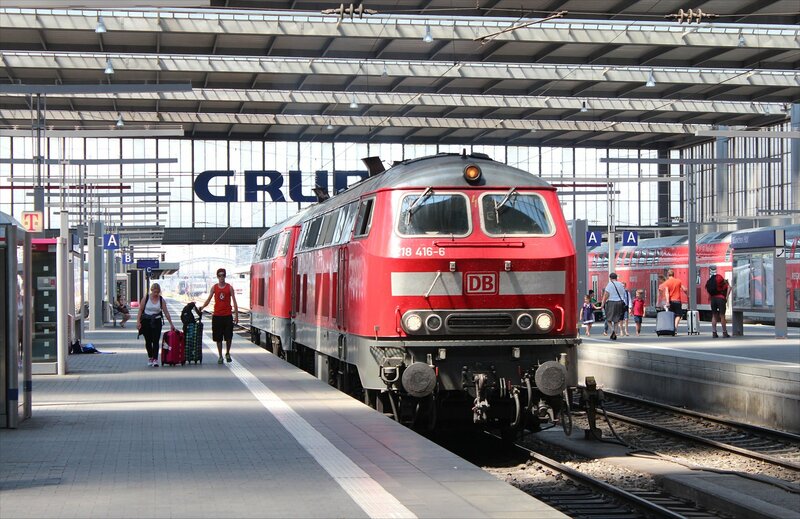 We opted for the 7.55am train from Munich which arrived at 8.52am. 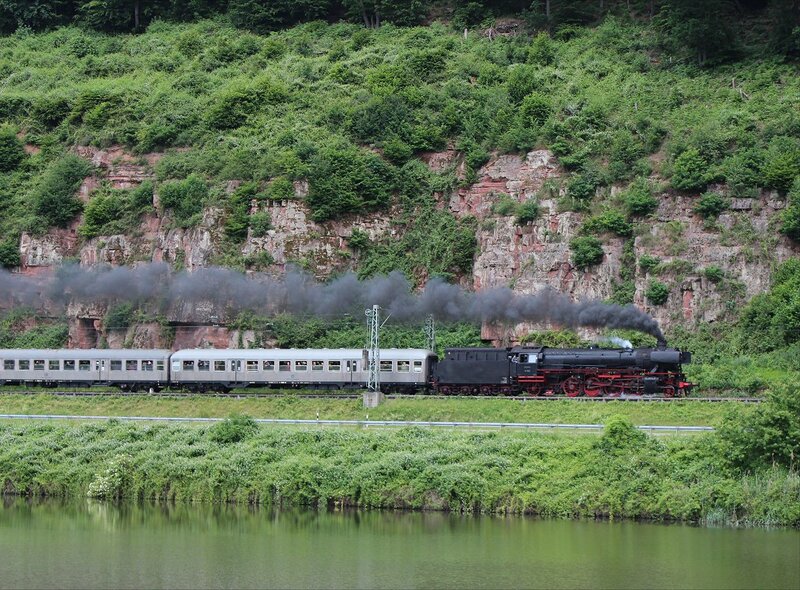 From the railway station it is an easy 20 minute walk to the harbour (our choice) or you can take a trip on the steam railway if it is operating (an 8 minute journey). 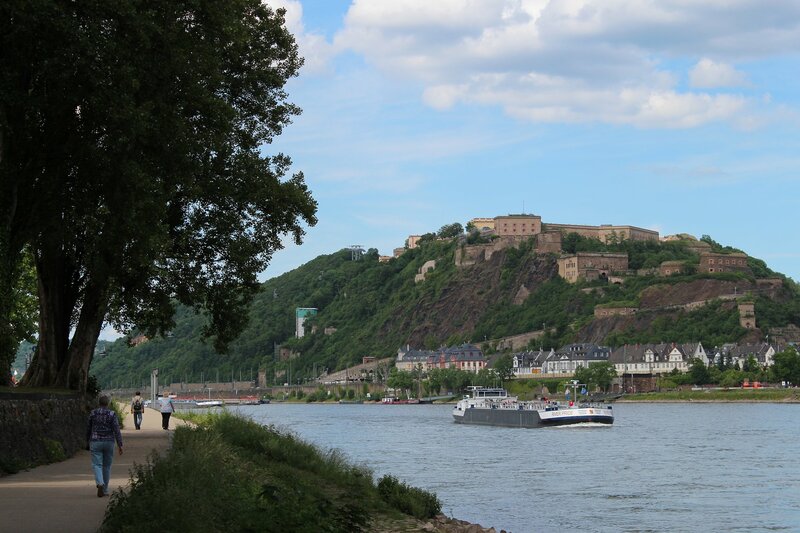 Our walk got us to the harbour in perfect time for the 9.25am sailing, arriving at Herreninsel around 9.40am. 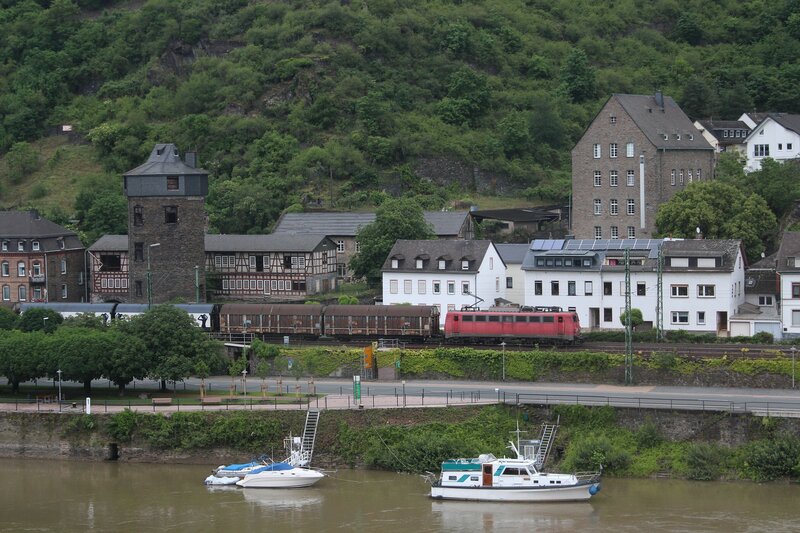 If there is a queue for tickets at the harbour you can usually buy tickets on board. 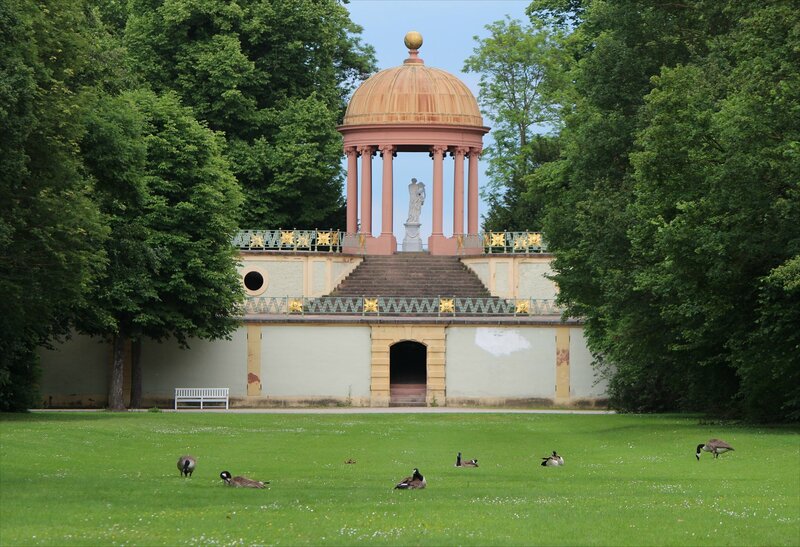 Tickets for a tour of the palace are purchased at the ticket booths close to the jetty on Herreninsel. 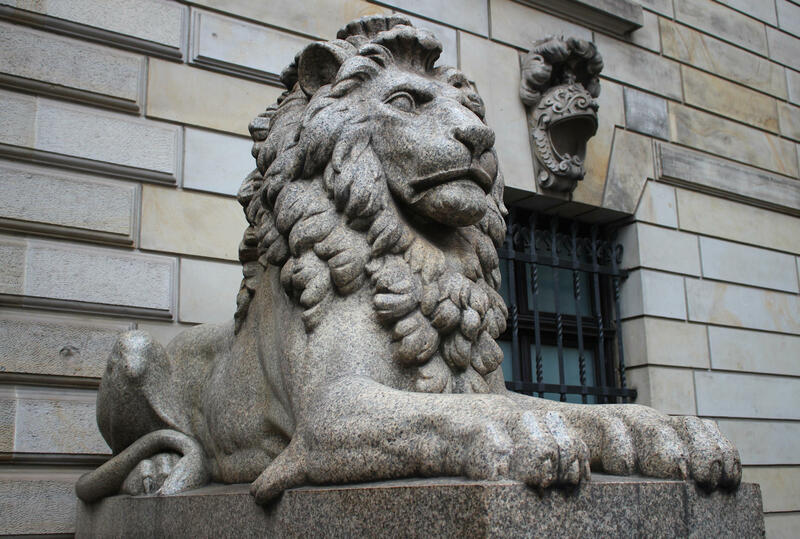 At this time of year the early morning English language tours don’t seem to be in such demand – there were just 10-12 people on our tour slot (10.15am). It’s worth grabbing a copy of the ferry timetables as the return timings are a little erratic, with the gap between crossings ranging from 15 minutes to 50 minutes. At the age of eight or nine I went on a trip to Thorpe Park organised by my primary school. 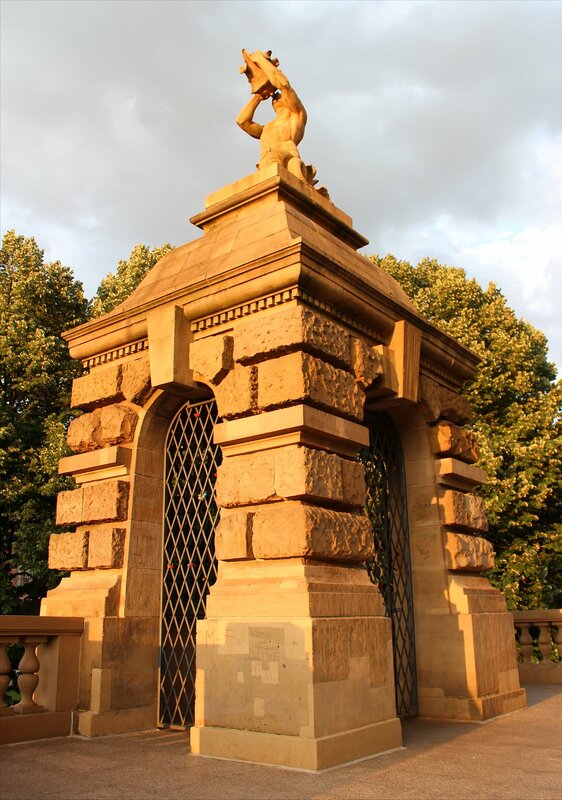 If that seems a little strange today, you need to know that Thorpe Park was originally conceived as an educational attraction rather than the thrill-seeker’s theme park of today. 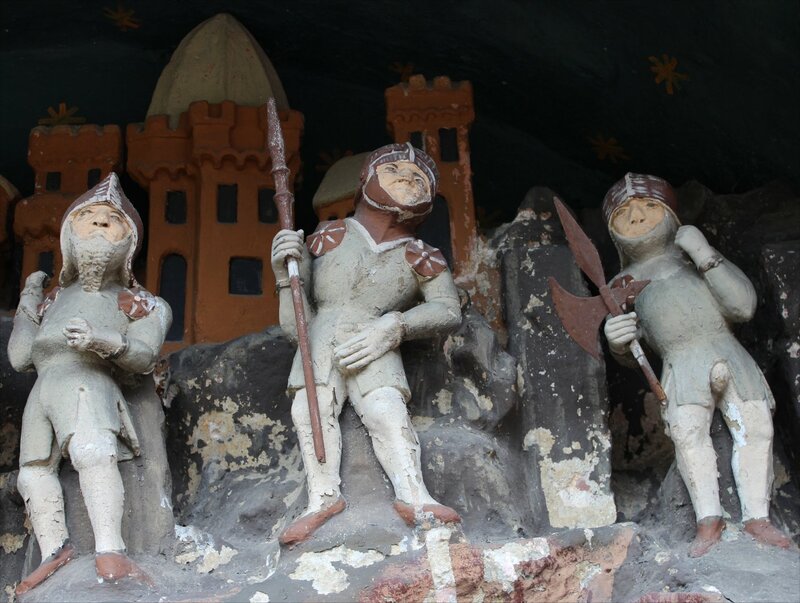 Instead of the rides that you would find now, the parkland was packed with recreated historic buildings (representing the ‘Invaders of England’) along with models of some of the world’s most astonishing buildings. 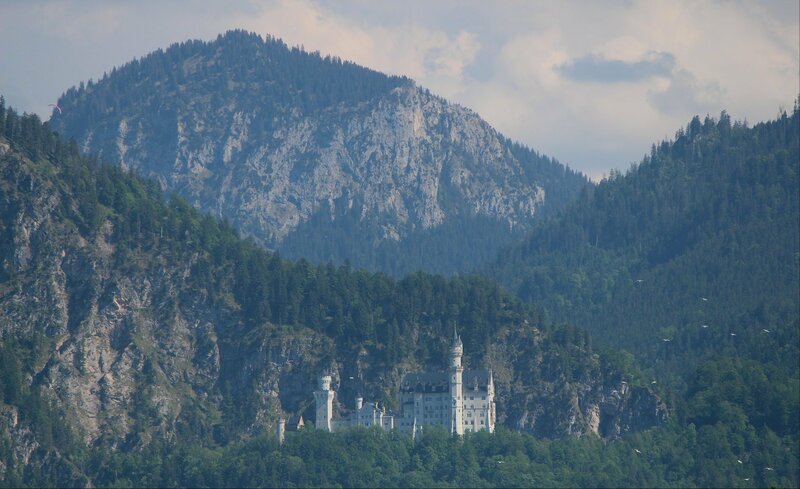 The one that caught my eye most of all was Neuschwanstein Castle. 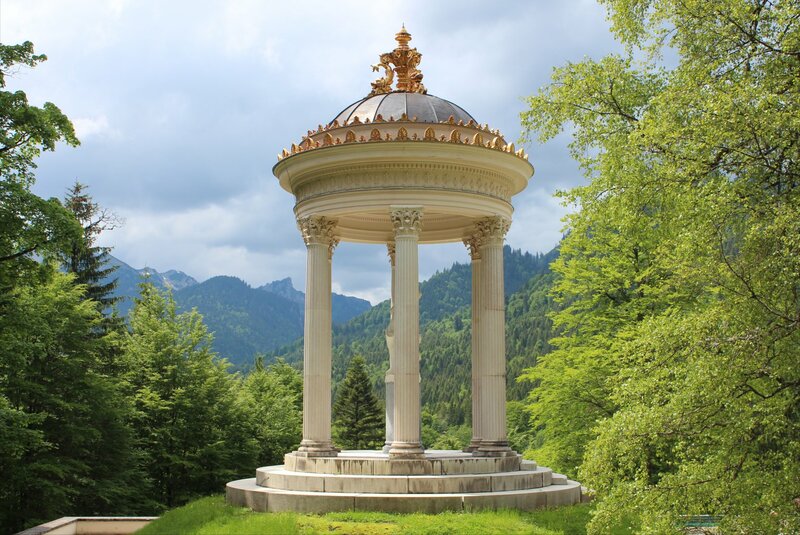 It has taken me a little while to get around to visiting the real thing, but this week I have finally made it to Bavaria armed with a plan to see all three of King Ludwig II’s incredible creations – Linderhof Palace, Herrenchiemsee Palace and Neuschwanstein Castle. 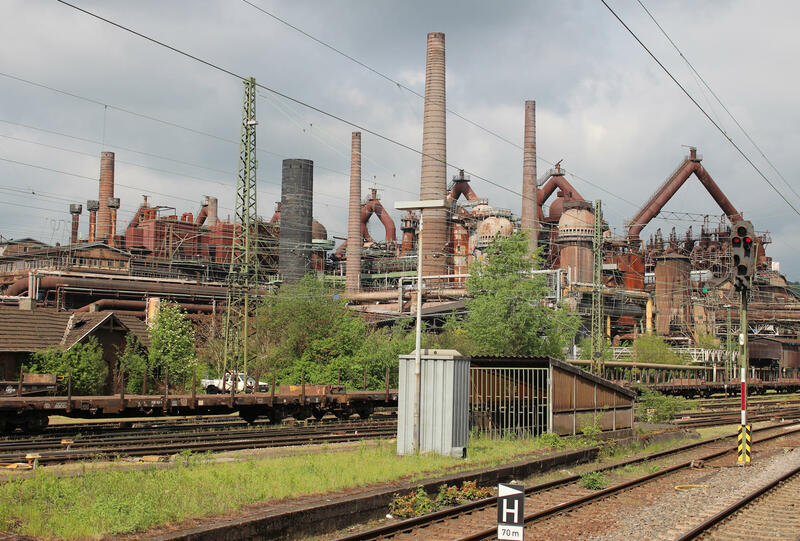 In theory this should have been fairly simple to arrange but the threat of a long railway strike and the complications of a security lockdown for the G7 summit at Elmau have made me wonder whether the attempt was doomed before it began! 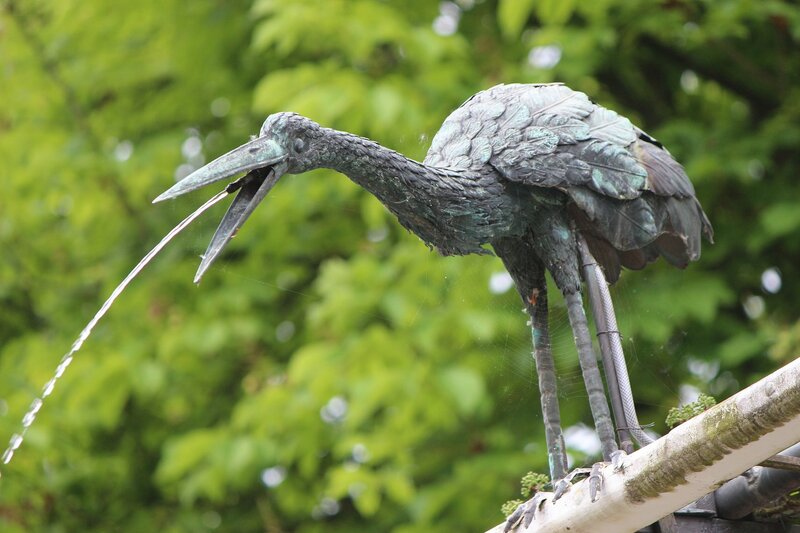 And what of the historic buildings of Thorpe Park? 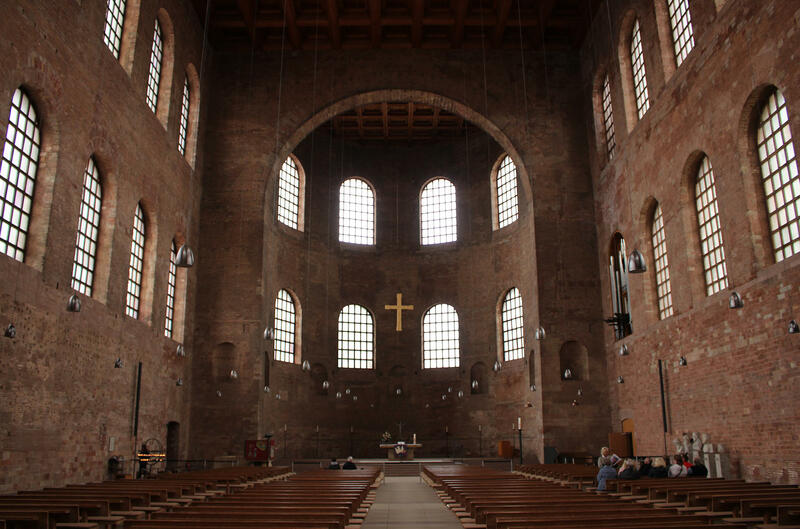 They were largely demolished in 1990, whilst the models survived until the early 2000s. Not much trace remains of the educational park that was unveiled to the public on 24th May 1979 and which so entranced me as a youngster in 1980-81. 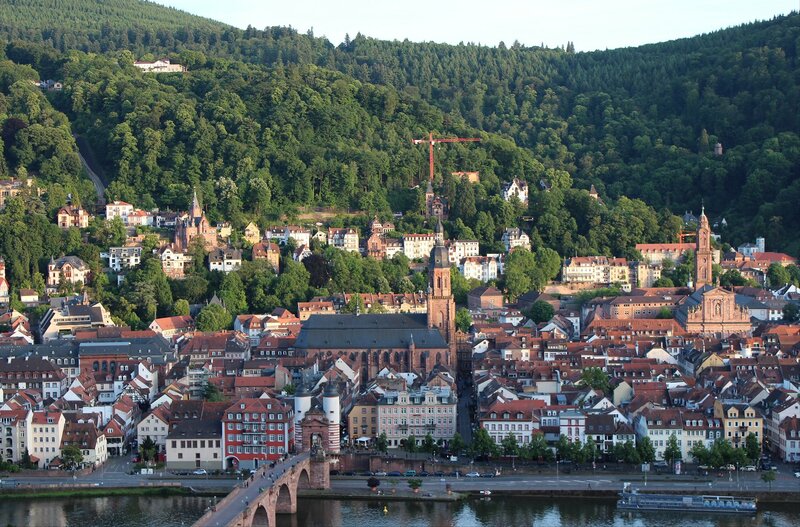 Our trip brought us to Heidelberg today, with an opportunity to wander around the city and appreciate the charms of the old town. 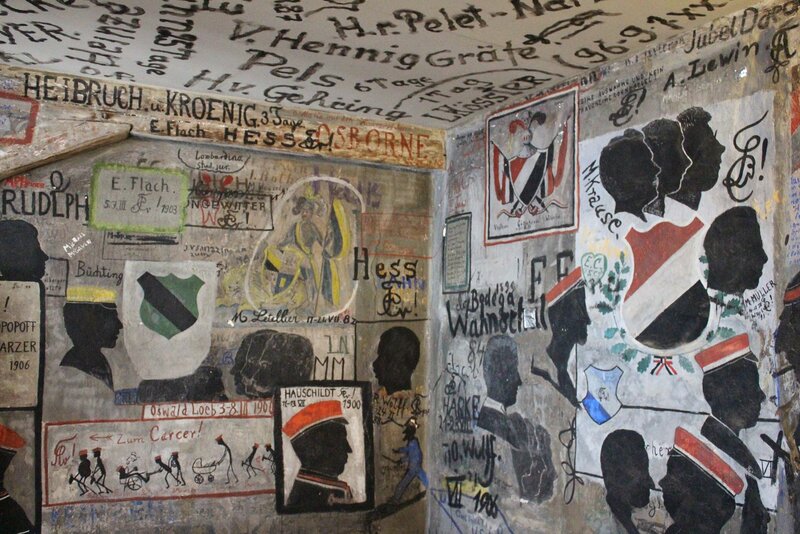 There is no denying that Heidelberg is an extraordinary tourist magnet, as any glance around the streets would confirm, but we were more than a little surprised to find that the highlight of our visit – the student prison – was relatively quiet. 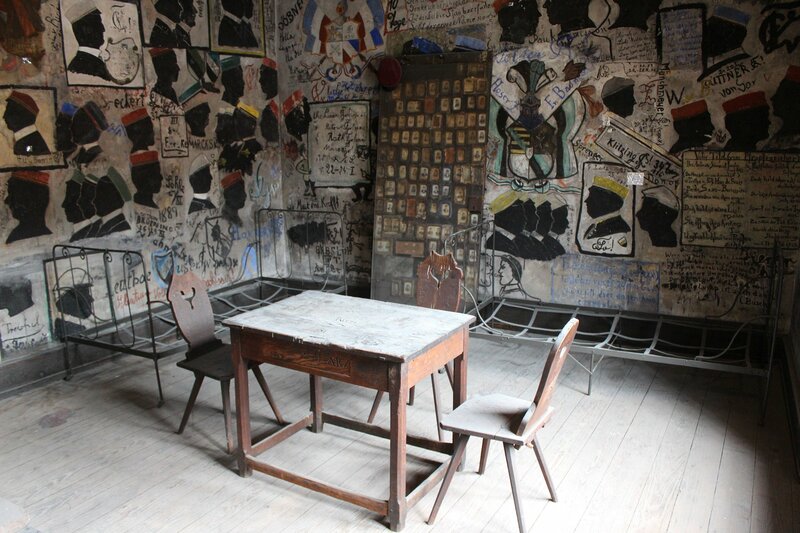 The student prison is a real oddity, born out of a medieval world in which universities sat outside of the boundaries of civil and state law. 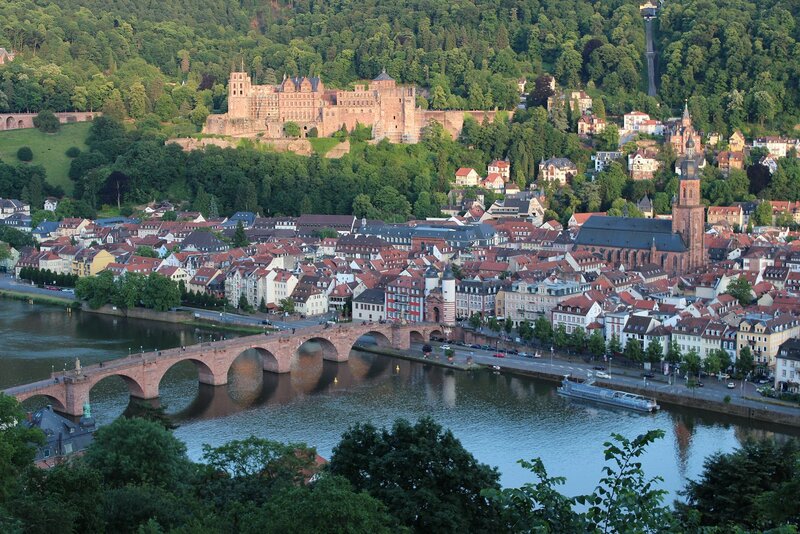 Heidelberg University was founded in 1386 and exercised its power in criminal and disciplinary matters overs its student from the very beginning. 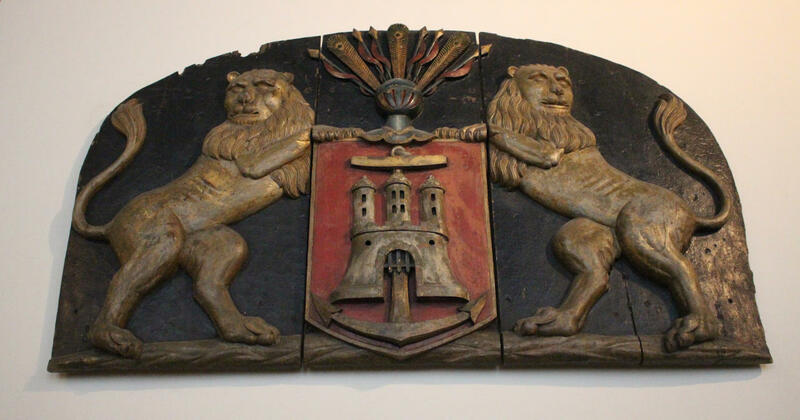 However, it was not until 1545 that the university established the first prison exclusively for the use of its undergraduates. 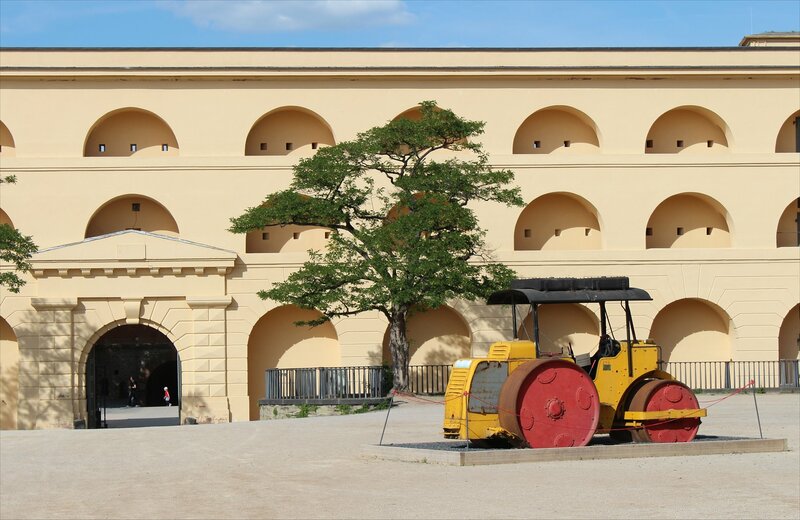 In 1784 the prison was re-established in a residential property that backed onto the old university, but it was not until the 1820s that a satisfactory arrangement was agreed. 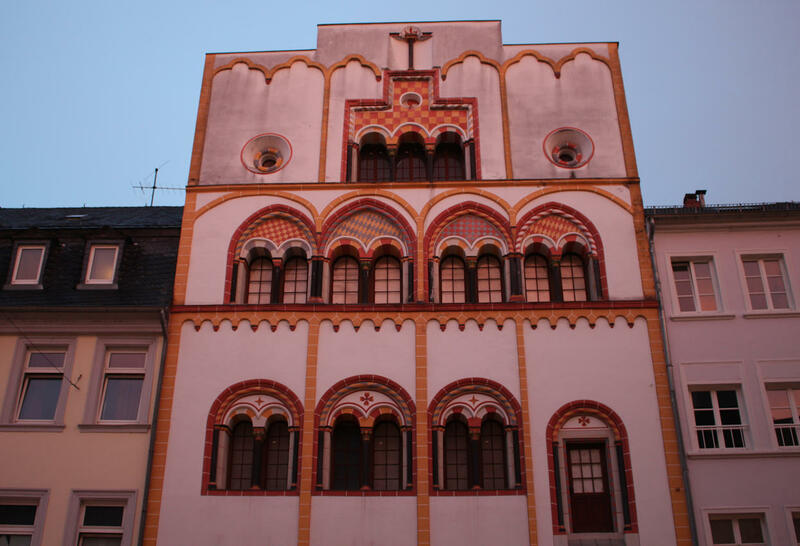 At this time a new top storey was fitted out with four cells, supplemented by a fifth in 1886. 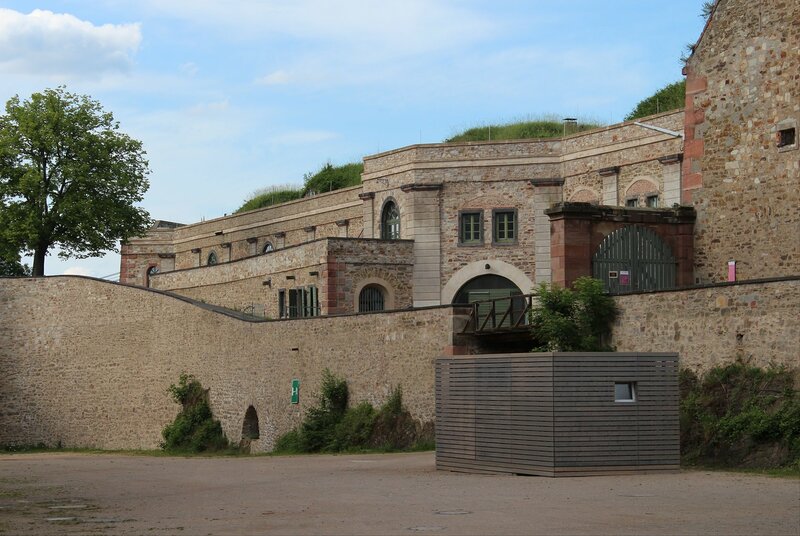 This layout survived until the end of the prison’s life in 1914 and is the space that can be seen today. The cell was not a roomy one; still it was a little larger than an ordinary prison cell. 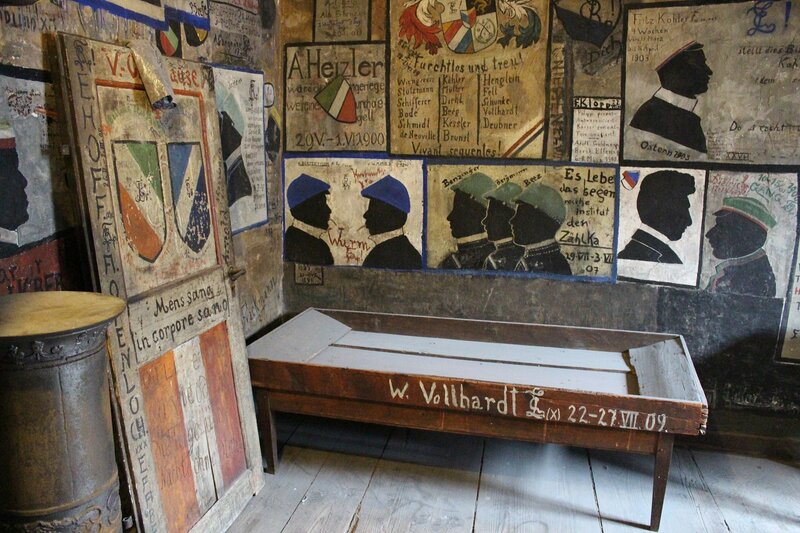 It had a window of good size, iron-grated; a small stove; two wooden chairs; two oaken tables, very old and most elaborately carved with names, mottoes, faces, armorial bearings, etc.–the work of several generations of imprisoned students; and a narrow wooden bedstead with a villainous straw mattress, but no sheets, pillows, blankets, or coverlets–for these the student must furnish at his own cost if he wants them. There was no carpet, of course. 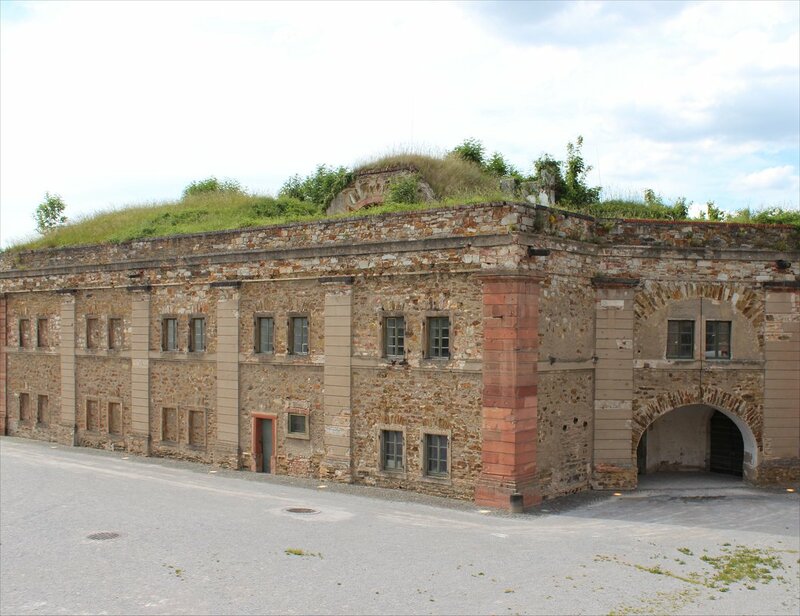 It sounds as though incarceration here was not exactly the hardship that you might have expected – prisoners were permitted to leave their cells for lectures, could commision local restaurants to supply their meals and were allowed two bottles of beer a day (or the equivalent amount in wine). 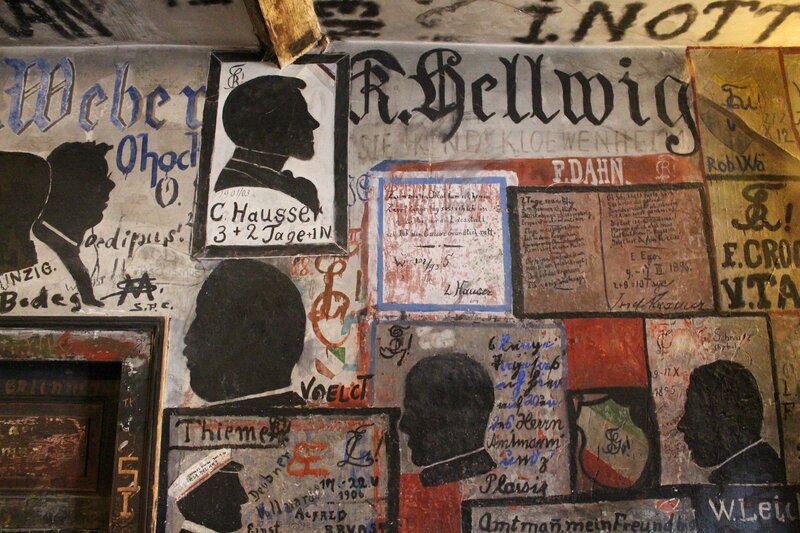 One piece of grafitti from a prisoner shows that it was far from perfect – wine had to be drunk warm as there were no ice buckets! 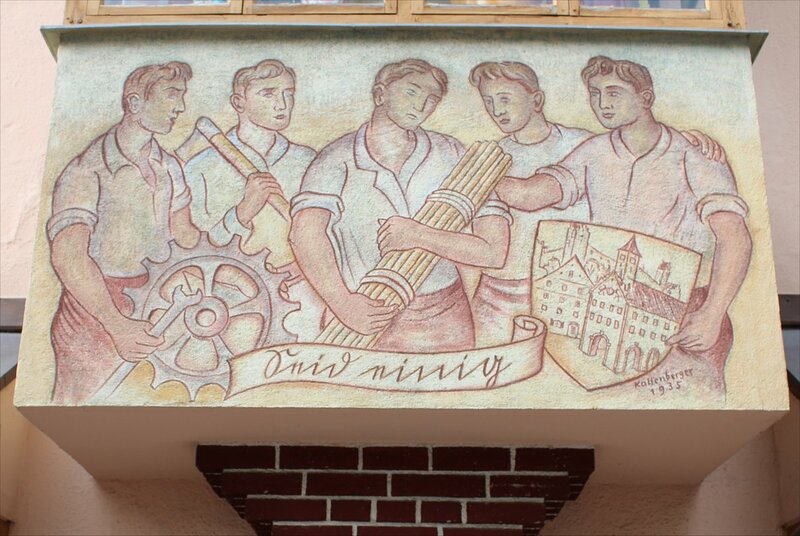 Along with admission to the student prison the tickets we bought included entry to an exhibition about the history of the university and to the Alte Aula (Old hall) which is well worth seeing in its own right. 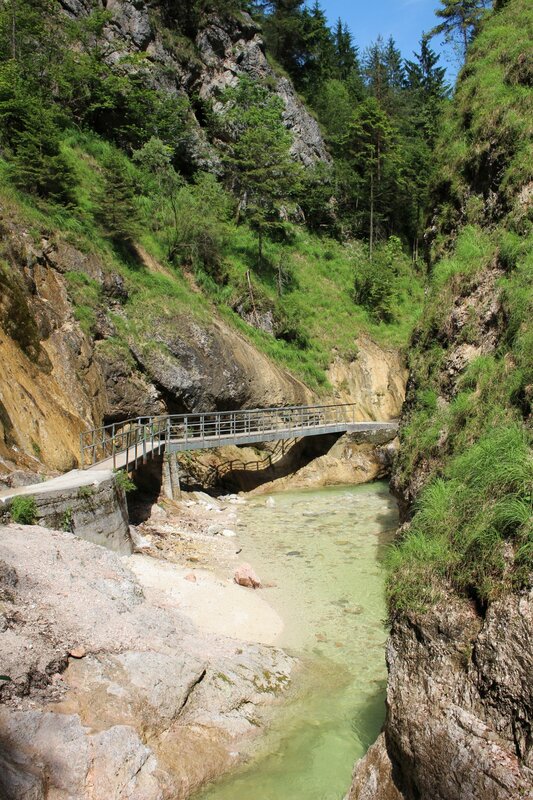 An improvement in the weather persuaded us that a walk up the schlangenweg (snake path) would be a good way to round off the day. 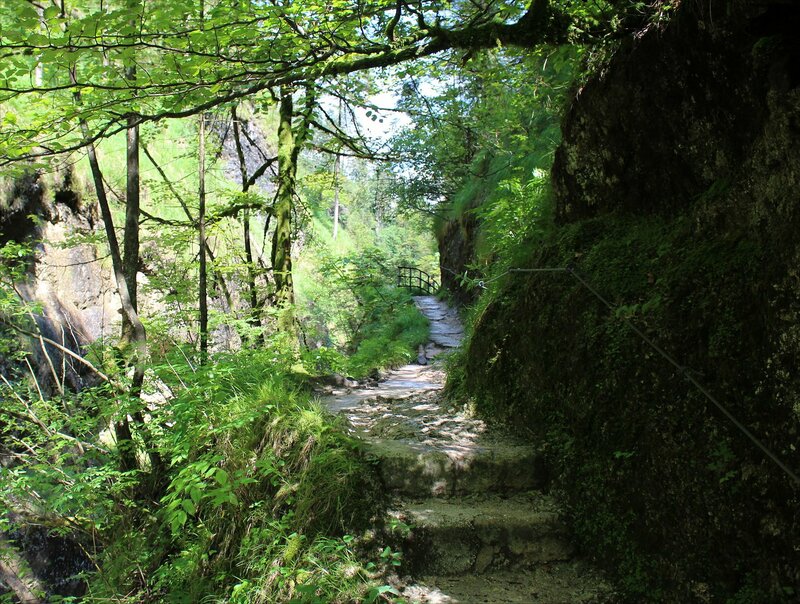 The steep pathway twists and turns relentlessly, tiring out the most energetic of souls, but the vantage point offered by the Philosophers’ Way makes it all worthwhile. 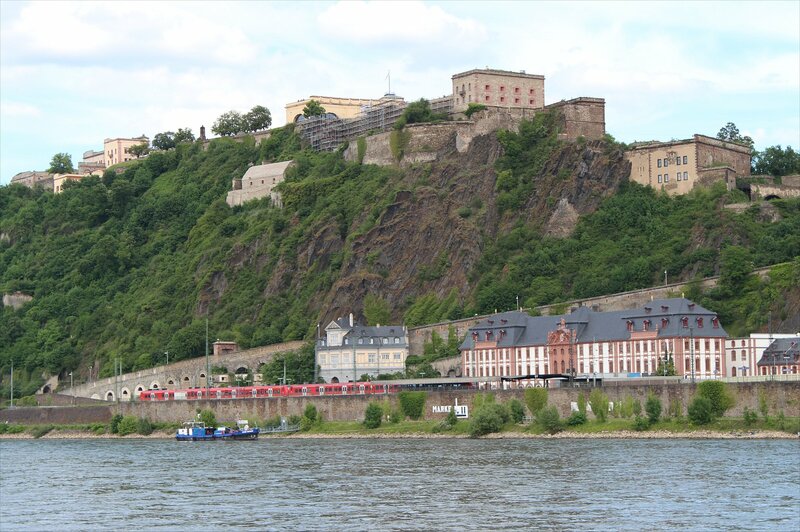 The panoramic view of the old bridge, castle and funicular railway at sunset was simply stunning. 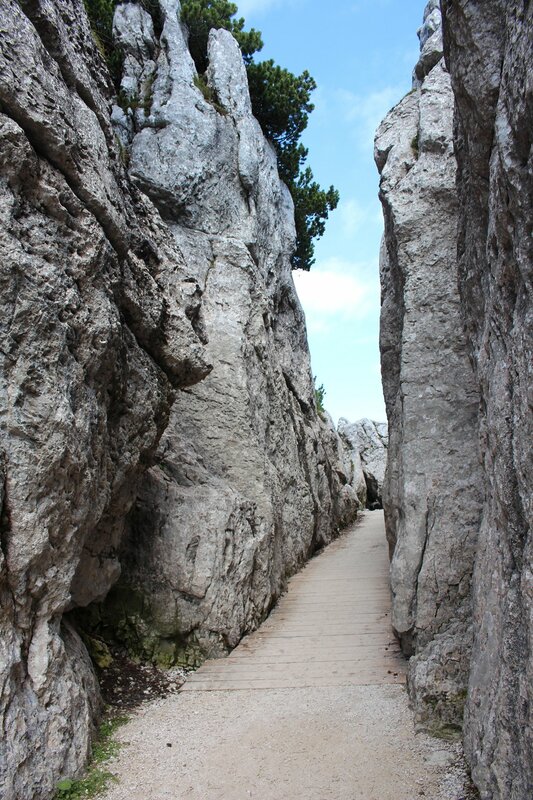 Needless to say, the walk back down was considerably slower and more relaxed! 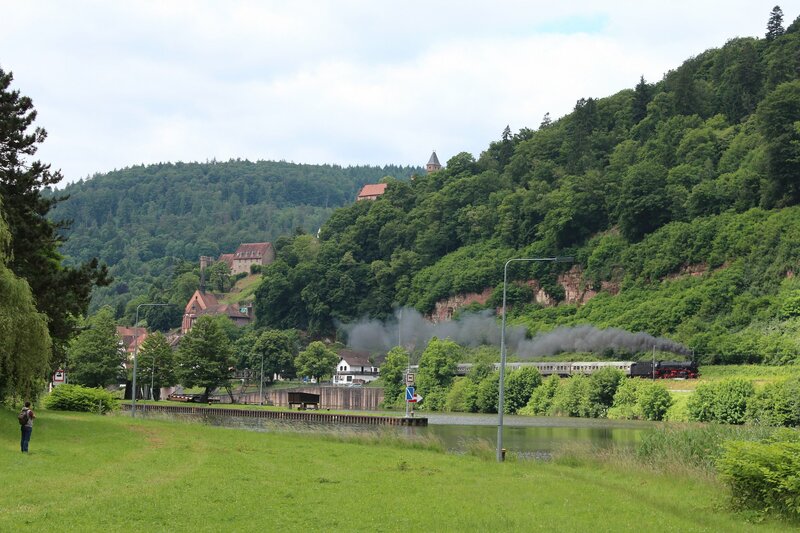 The last two days have been spent exploring the Neckar Valley and checking out a few of the many possible locations to photograph the special steam hauled services running on these days. 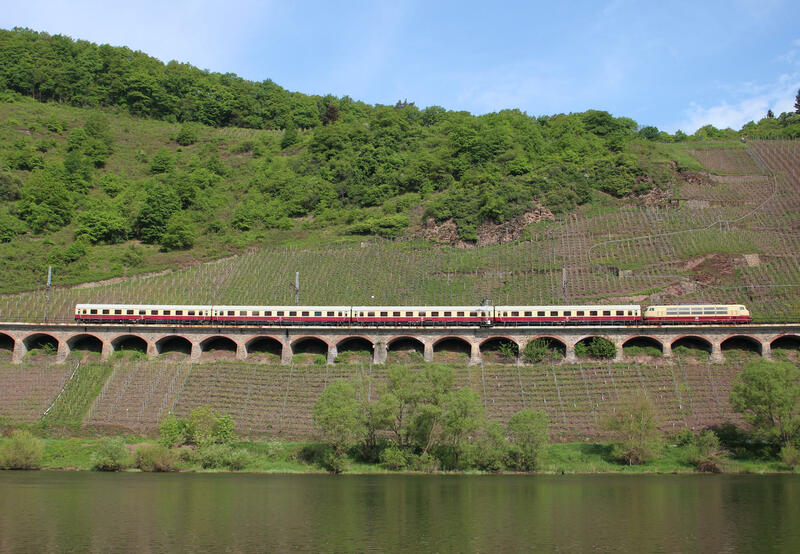 Away from the rails, we have taken the opportunity to explore some of the most beautiful spots and chief amongst these was Hirschhorn. 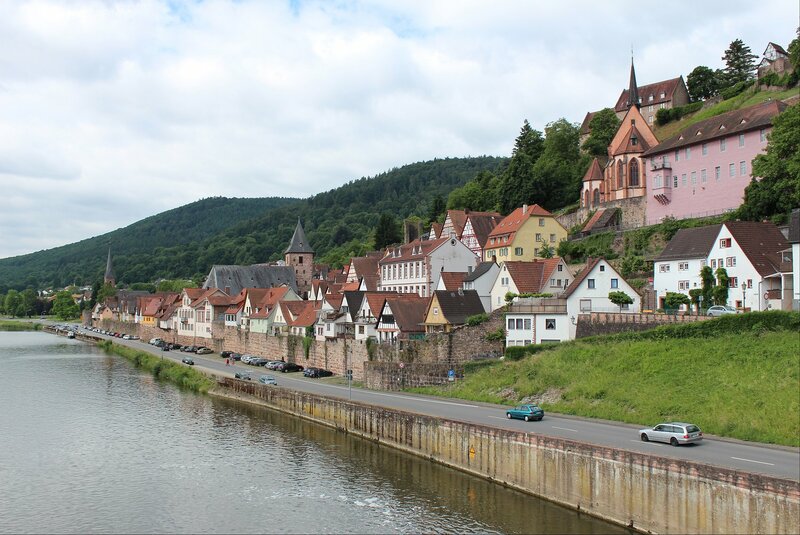 Hirschhorn is widely known as ‘the Pearl of the Neckar’ and has a stunning position, hugging the hillside, on a horseshoe bend of the river. 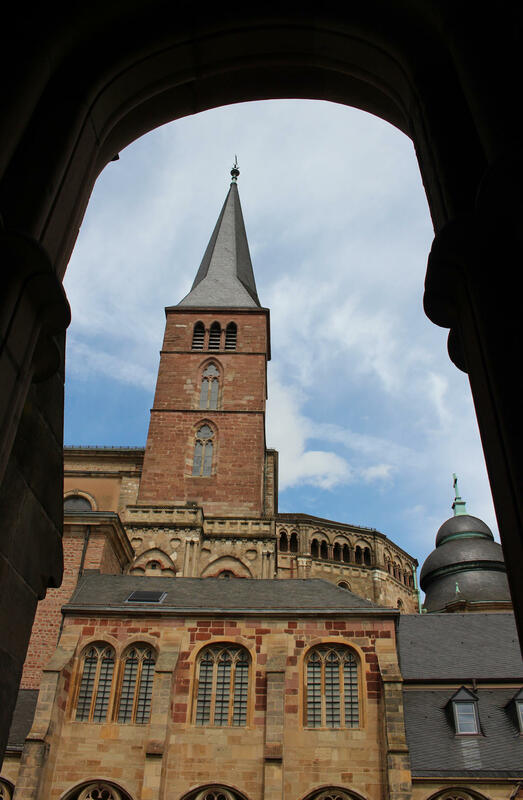 The historical sights include a castle, monastery and some lovely old churches which you can explore by following the historical town walk published on the town’s website. 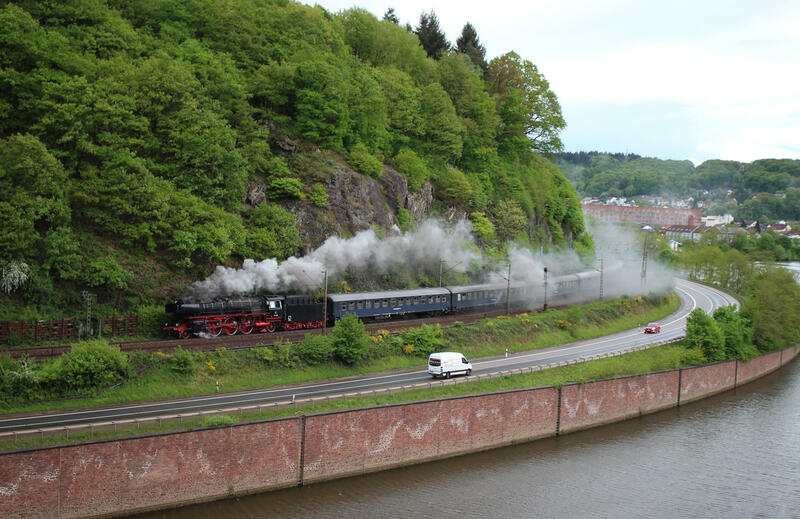 A walk along the Panorama Weg also offers a wonderful view of the castle and town (this turned out to be our chosen spot for one of the steam specials, watching as it blasted out of the tunnel underneath the castle on a very wet Thursday afternoon). 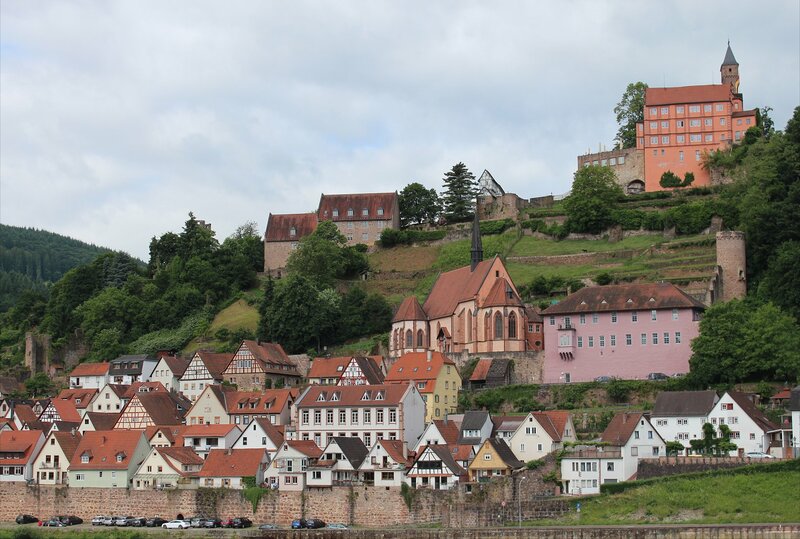 The most interesting sight, the Ersheim Chapel, is located on the opposite side of the Neckar, which can easily be accessed on foot using the bridge over the lock (the location of the chapel is clearly marked on this handy map of the town). 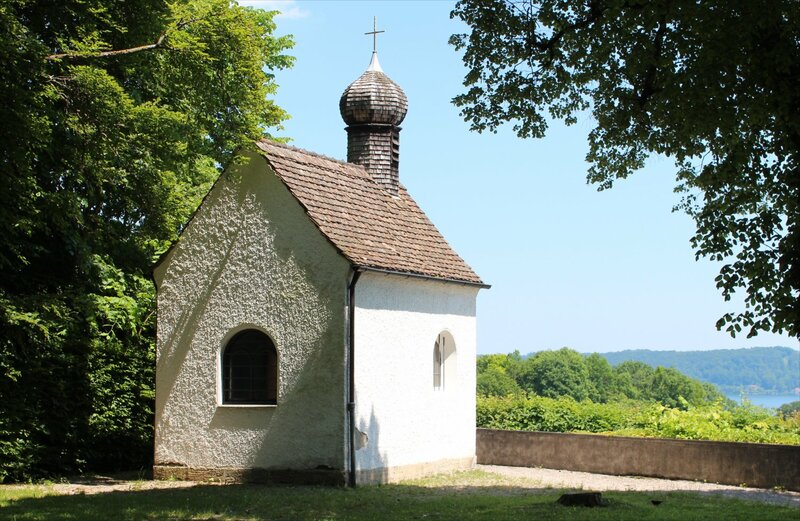 The Ersheim Chapel dates back to 1345 and is believed to be the oldest church in Hirschhorn, though it has been expanded and altered over time. 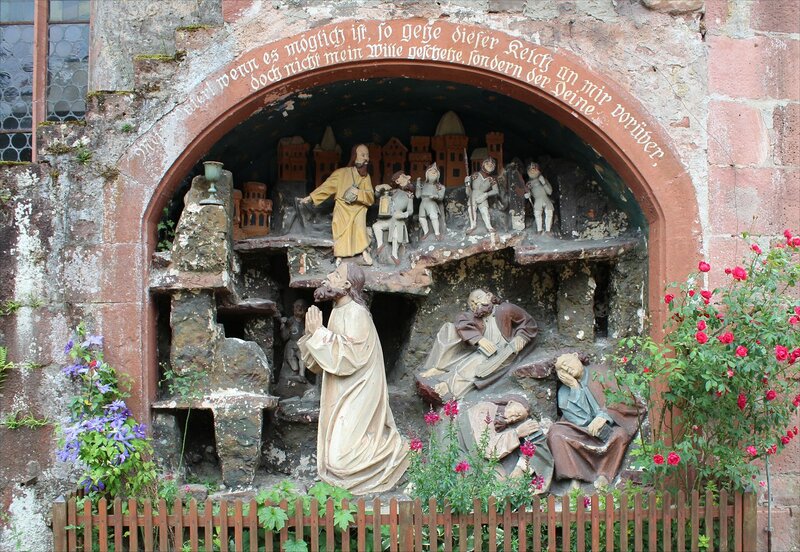 On the exterior wall you can find a rather lovely scene from the Garden of Gethsemene (added to the church in 1669), whilst the interior astonishes with a beautiful gothic ribbed ceiling and some intriguing frescoes. 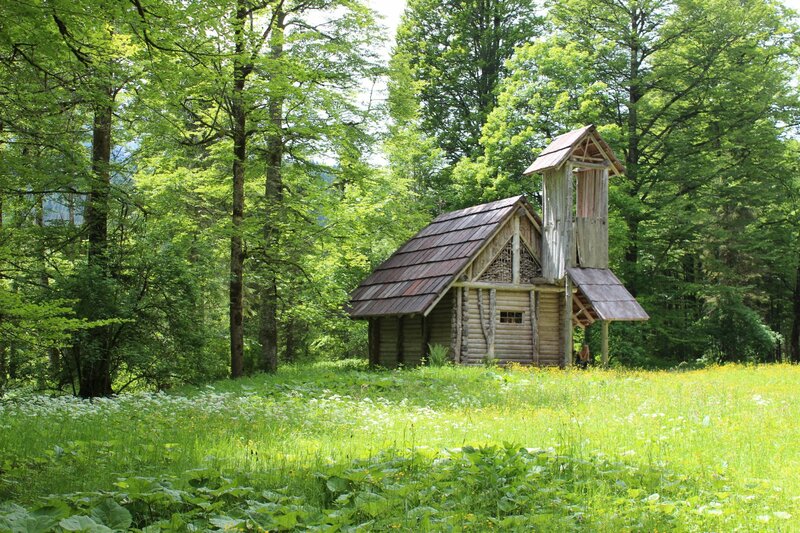 It seems that the chapel is also home to a large breeding colony of the greater mouse-eared bat (over a thousand female bats raise their young here over summer) but we were thankfully unaware of their presence! 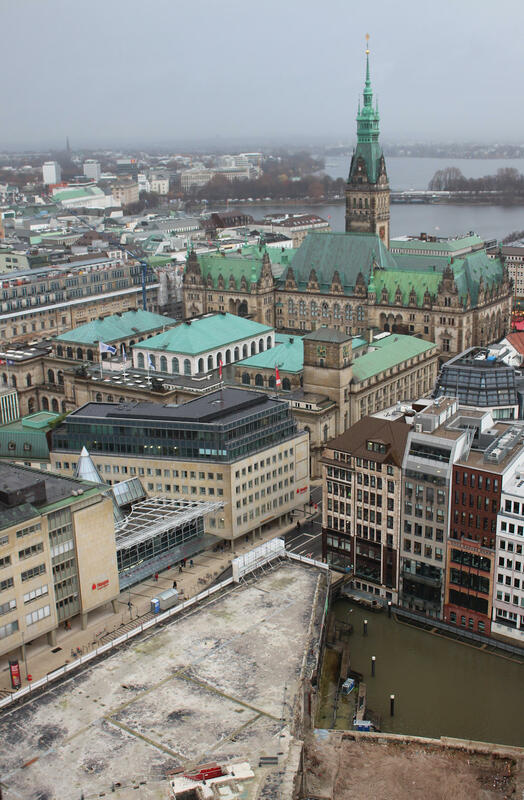 Our two visits to Hirschhorn were a delight, though a special mention has to go to the Café am Rathaus which served up some delicious cake and lunch to sustain us on our explorations. 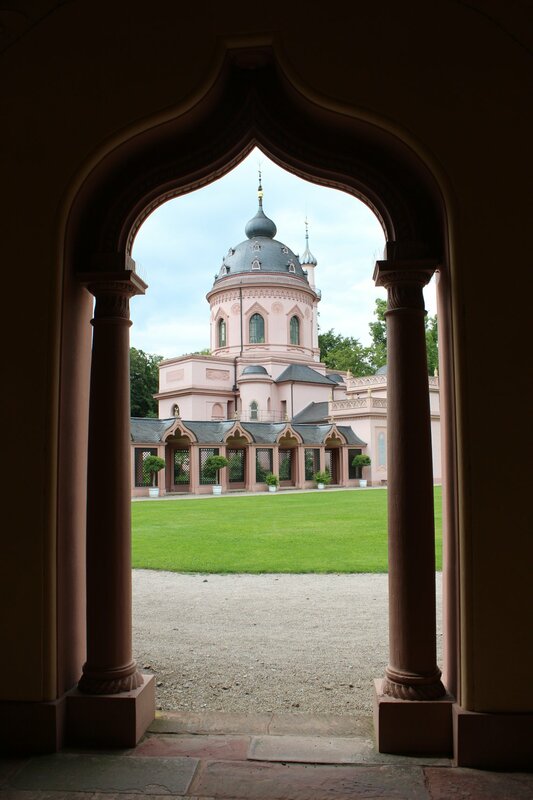 Our travels today have taken us south to Mannheim, which is perfectly located for our exploration of the region. 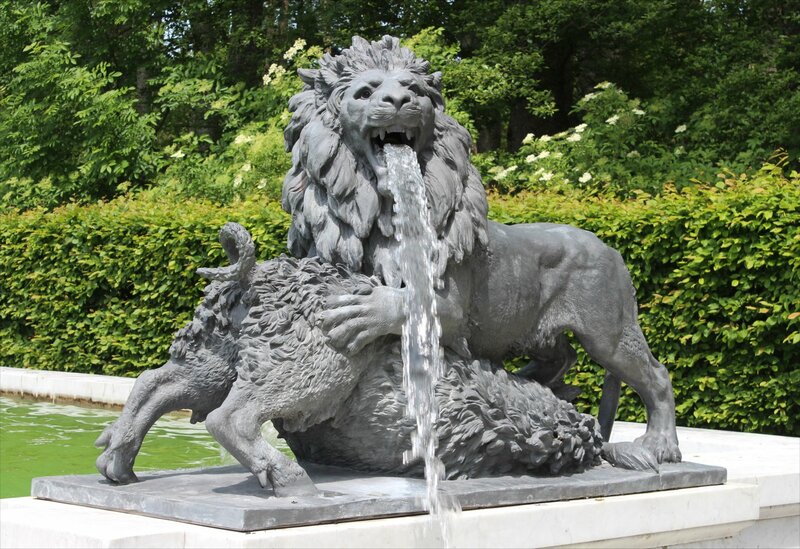 The city will be our base for the next five nights and whilst we will not spend much time here, it does have some delightful sights in its own right. 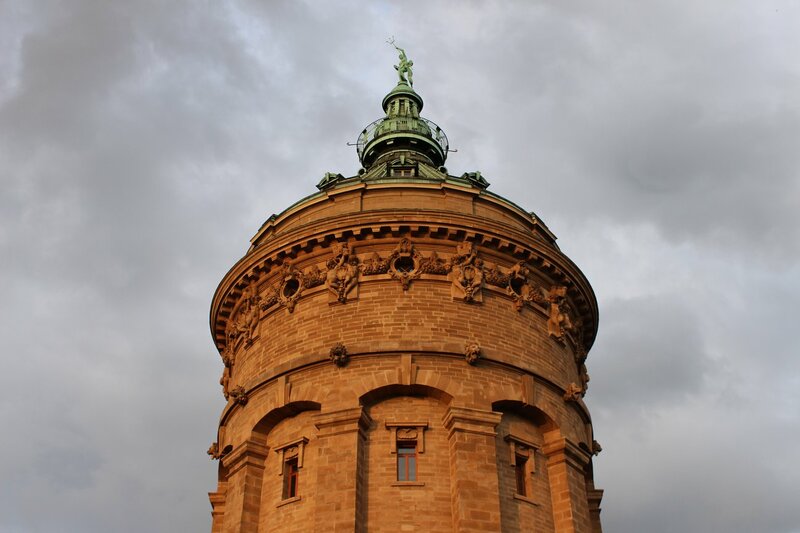 The Mannheimer Wasserturm is perhaps the most recognisable building associated with the city today. 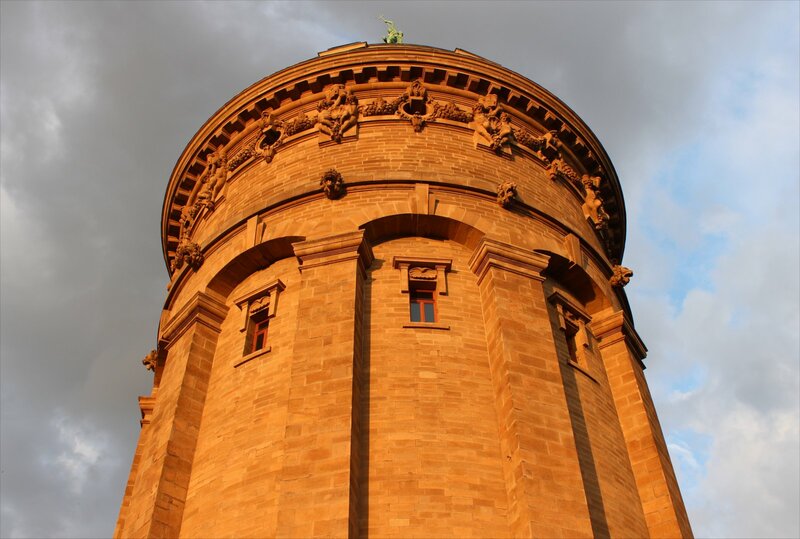 The water tower was the work of Gustav Halmhuber, a twenty three year old architect from Stuttgart, whose striking design stood out from around seventy entries into the competition and satisfied the jury’s requirement to deliver a design worthy of its prime location. 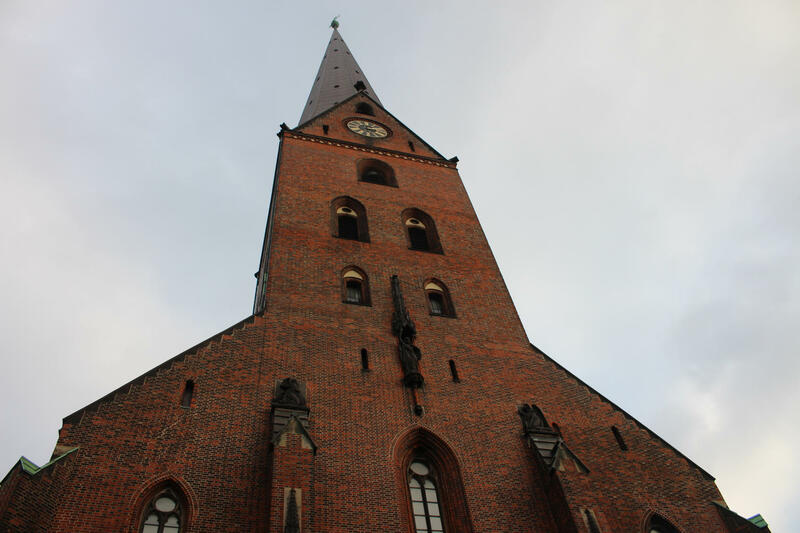 The tower was completed in 1889. 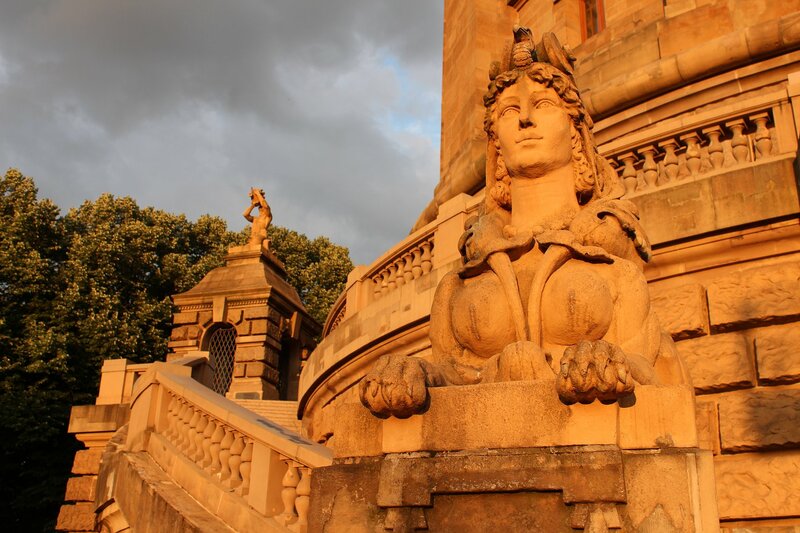 We turned up at the water tower in the lead up to sunset, with the evening sun giving the sandstone structure and its sphinx sculptures a quite remarkable golden glow against the black skies. 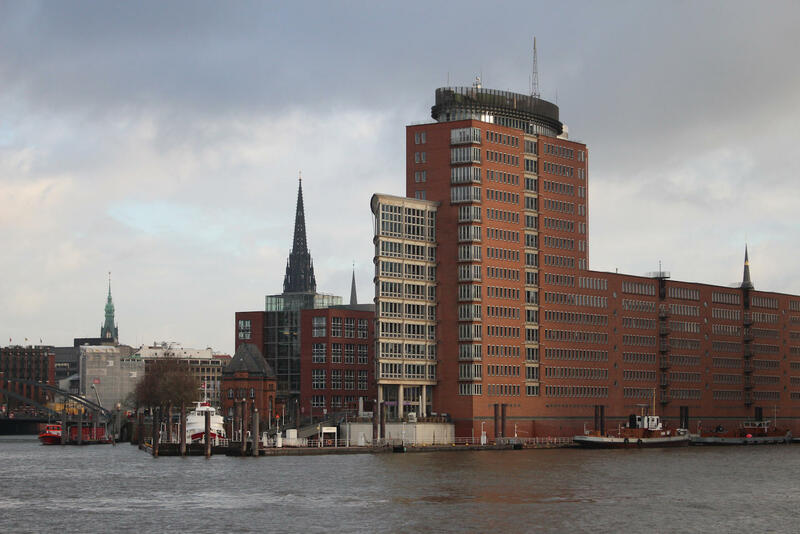 It is hard to believe that proposals to demolish this structure, in the mid twentieth century, were ever taken seriously. 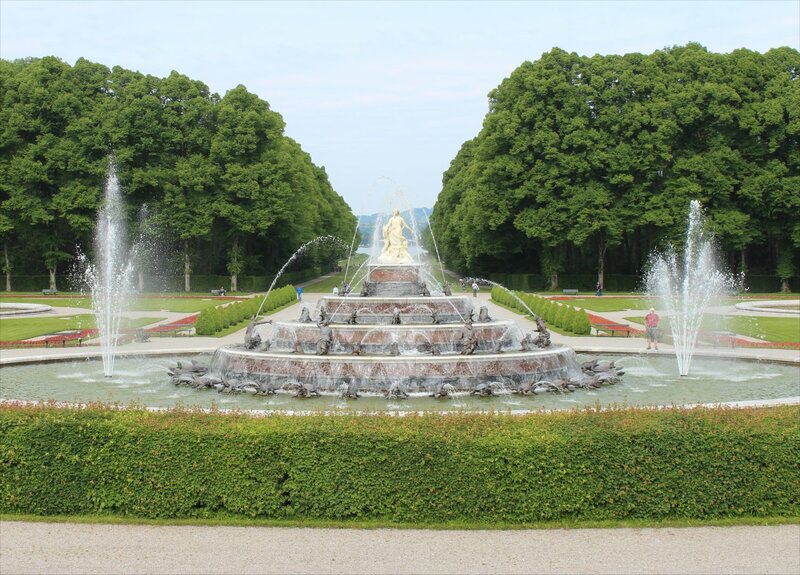 An afternoon visit to the gardens of Schwetzingen Palace proved to be something of an eye opener, having no real concept of just how extensive the grounds were nor the delights that they contained. 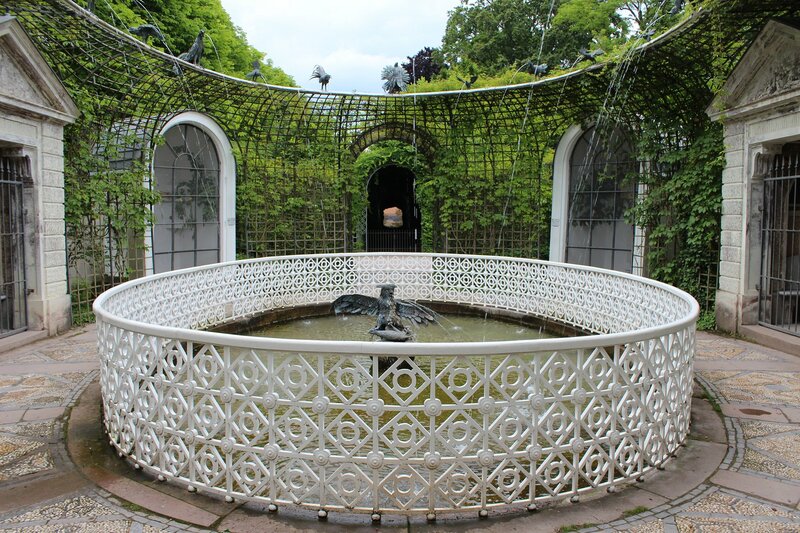 In fact it took us a good three hours of walking to do the gardens anywhere close to justice, yet we probably still gave some sights far too cursory a glance. 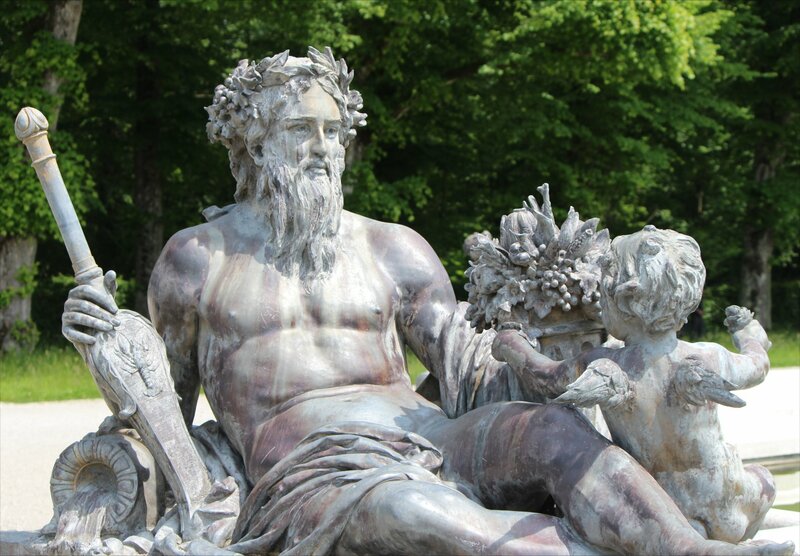 The history of the site goes back to the fourteenth century, when a moated castle was first built, but the gardens that we see today are primarily the creation of Prince Elector Carl Theodor (1724-1799) who determined that the gardens should be the central attraction of his newly enlarged summer residence. 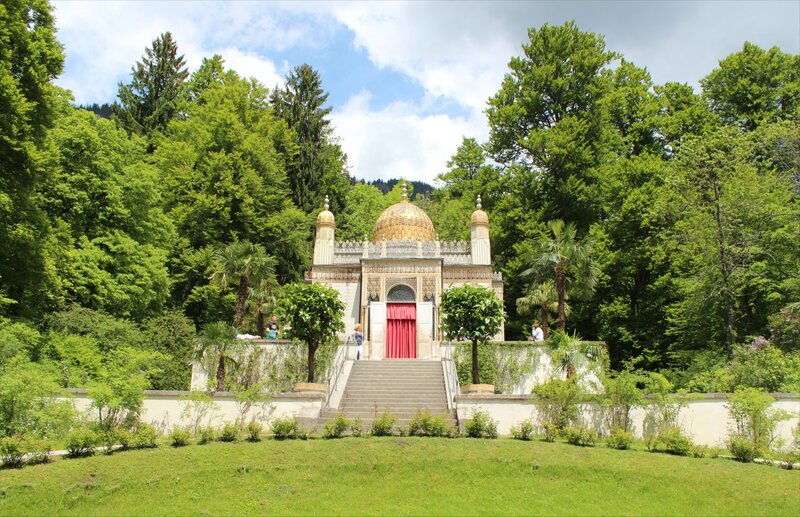 Amongst the remarkable structures commissioned for the gardens are a mosque, a bathhouse and an assortment of temples. 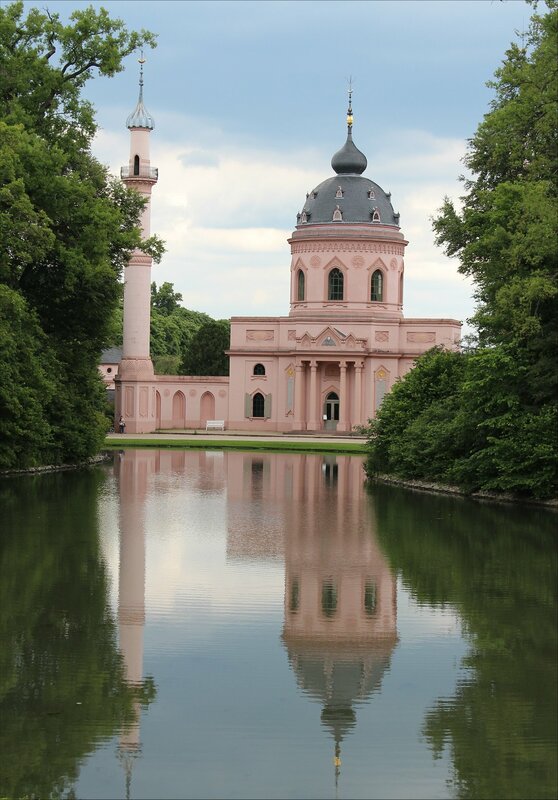 The mosque was constructed around 1779-1795 and is surrounded by a Turkish garden. 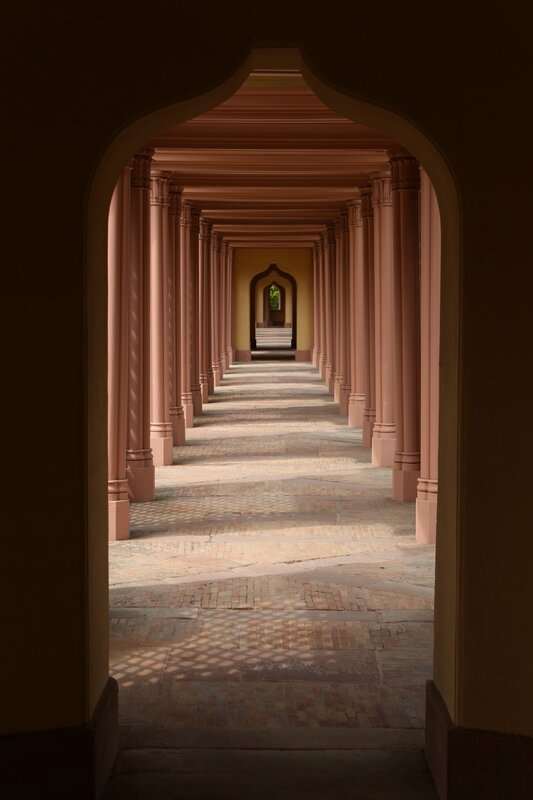 The arrangement of the colonnaded walkway is quite delightful, but it is the stunning interior that takes your breath away. 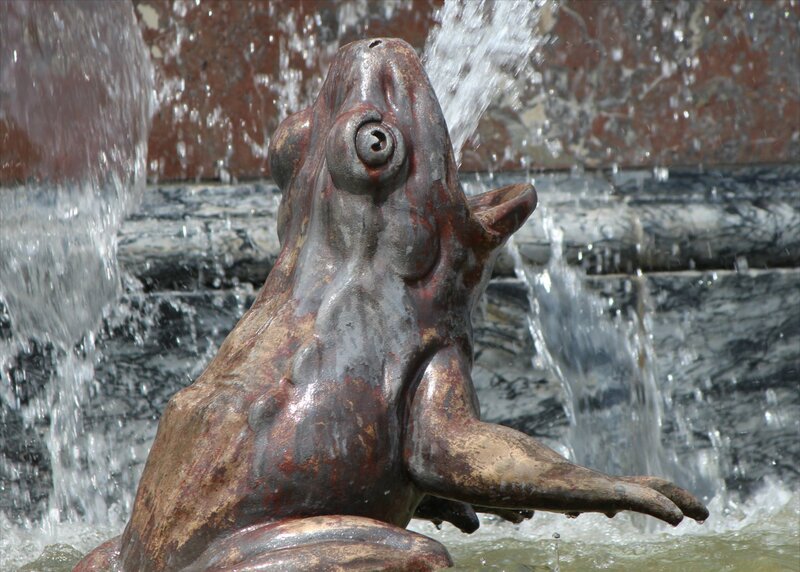 It is a reaction we soon found ourselves repeating on a visit to the bathhouse and in front of an astonishing fountain with water-spouting birds that is located nearby. 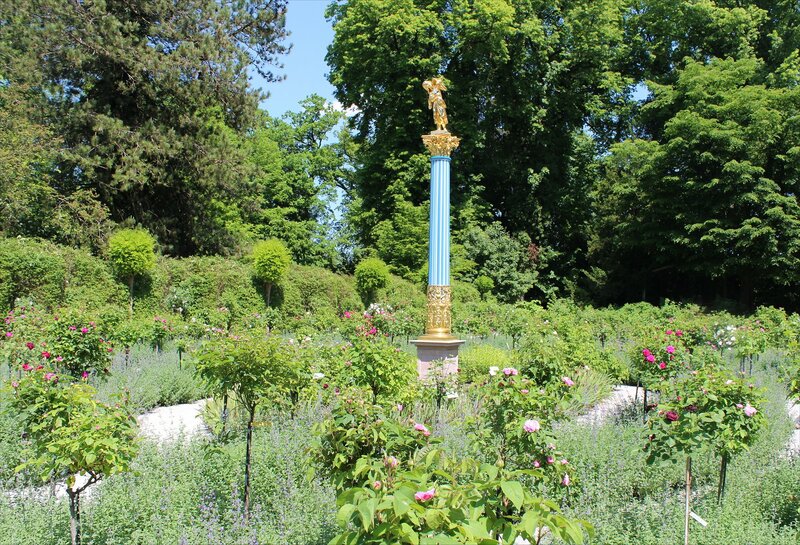 The gardens are truly marvellous and complemented by a quite superb restaurant/micro-brewery in front of the castle, the Schwetzinger Brauhaus zum Ritter, which served us up some stunning beer as a reward for our labours! 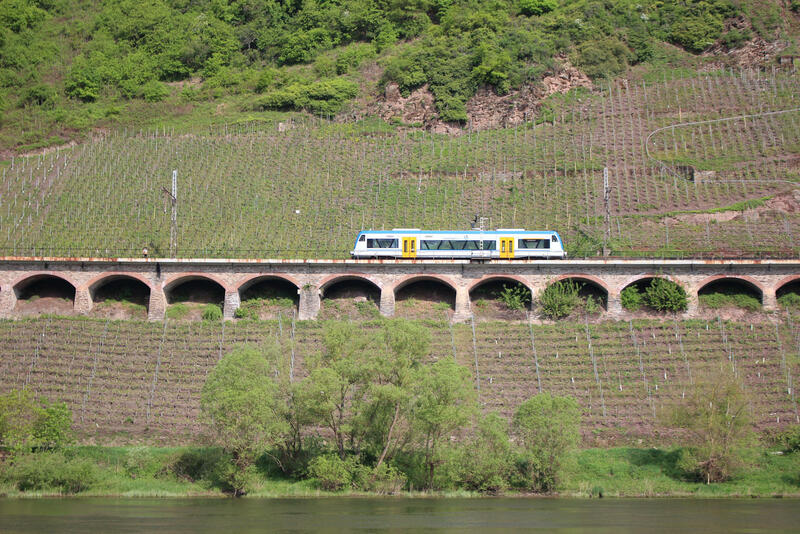 A side benefit of a trip to the Rhein valley is the presence of railway lines along the left and right banks of the river. 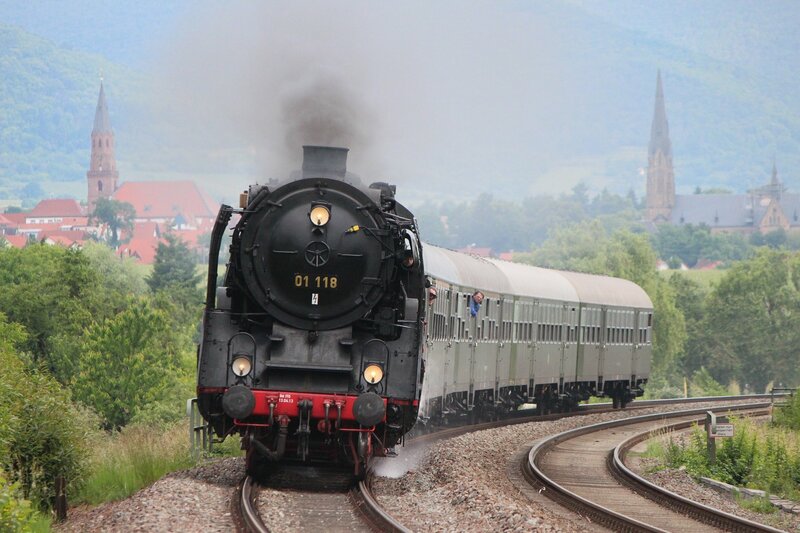 I thought this might provide the occasional opportunity for some rail photography amongst the sightseeing, but hadn’t bargained for quite how busy the lines turned out to be. 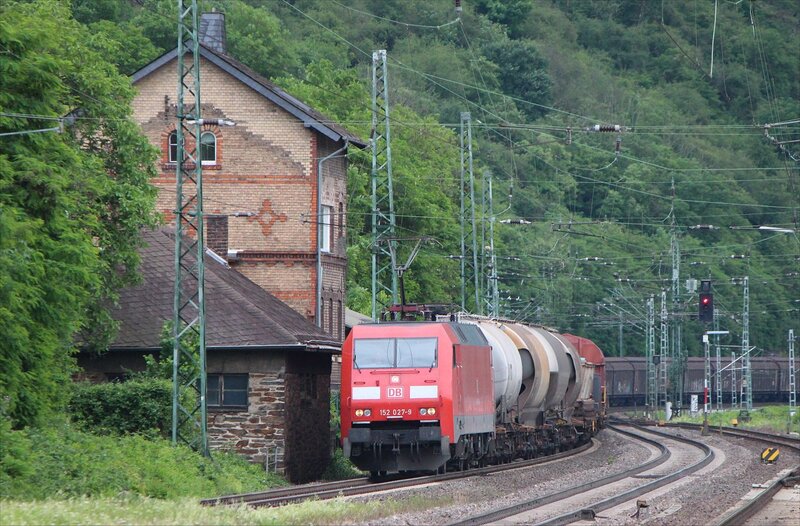 At times it seemed like there was a freight train running down the right bank every few minutes. 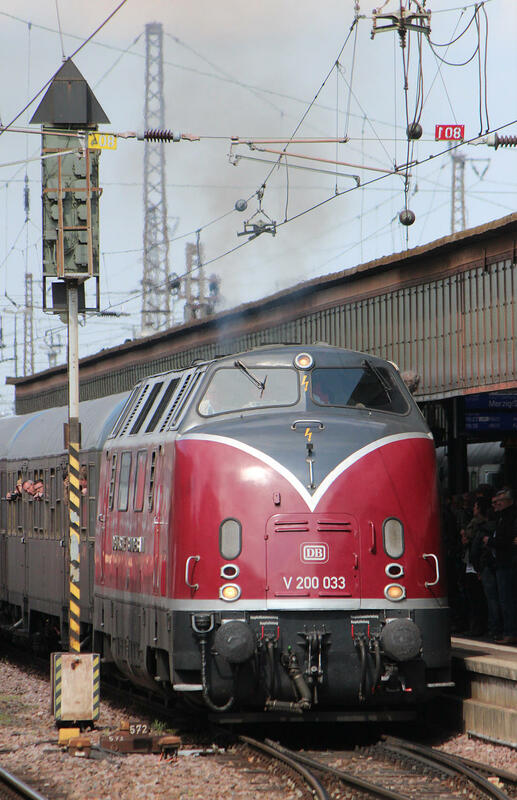 The rail geek in me was also delighted by the incredible variety of locomotives on offer. 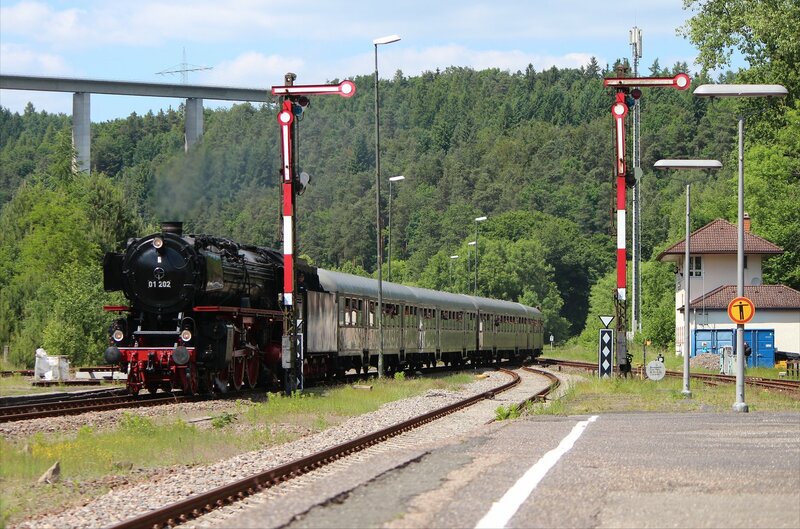 In just a day or two of sightseeing here we saw freight and passenger services hauled by classes 101, 103, 111, 120, 140, 143, 151, 152, 155, 185 and 218. It felt like anything could turn up, at any time – not a feeling that you would ever experience in the UK today. 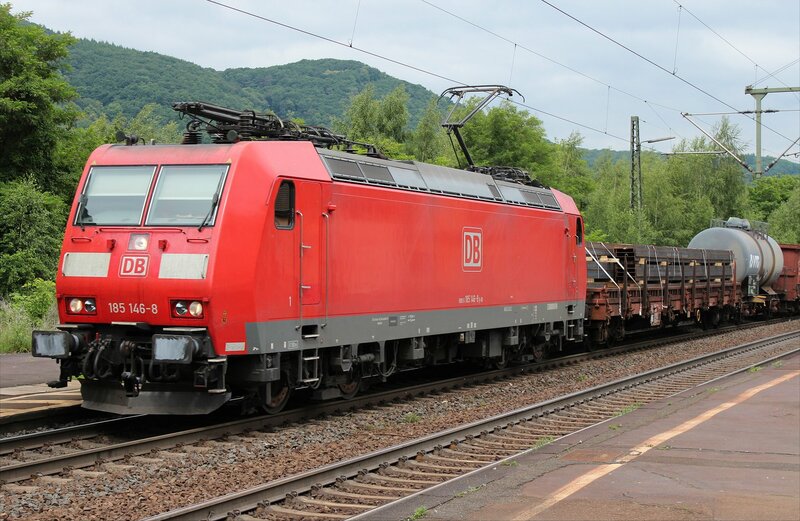 Try as I might, I couldn’t photograph everything (the 218 hauling freight down the right bank was one that eluded me) but I made sure to do my homework for the class 103 hauled services. Our evening trip down the left bank was carefully timed to ensure that we would be in the right place, at the right time and ready to get a good shot. 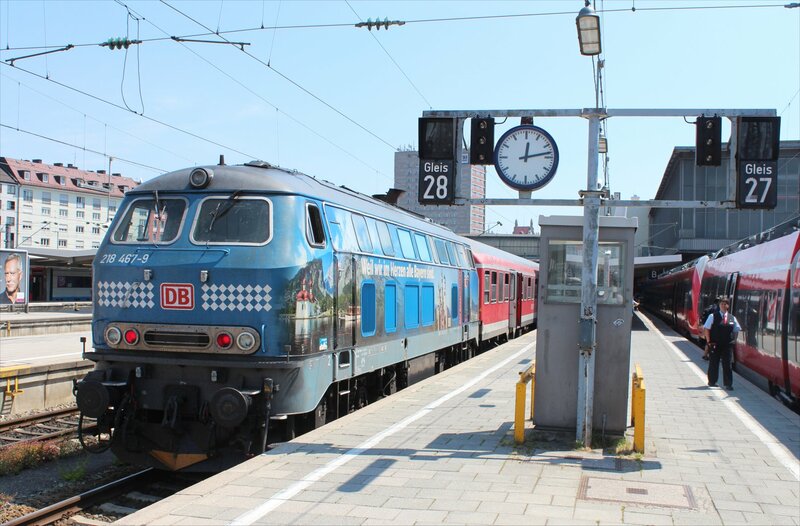 The class 103 electric locomotive was the rather glamourous flagship of the Deutsche Bundesbahn fleet when I was growing up and held a particular fascination for me. 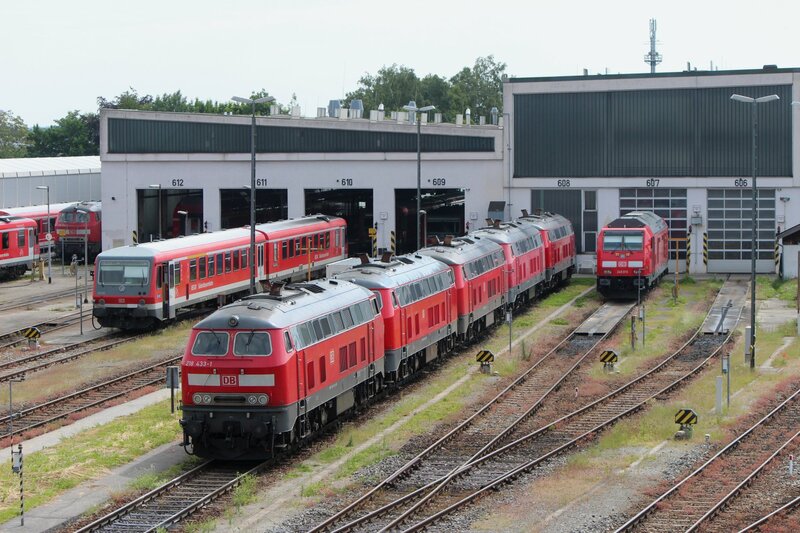 The last remaining locomotives in the class were retired from active service in 2003 but a few members of the class made a surprise return in 2013. 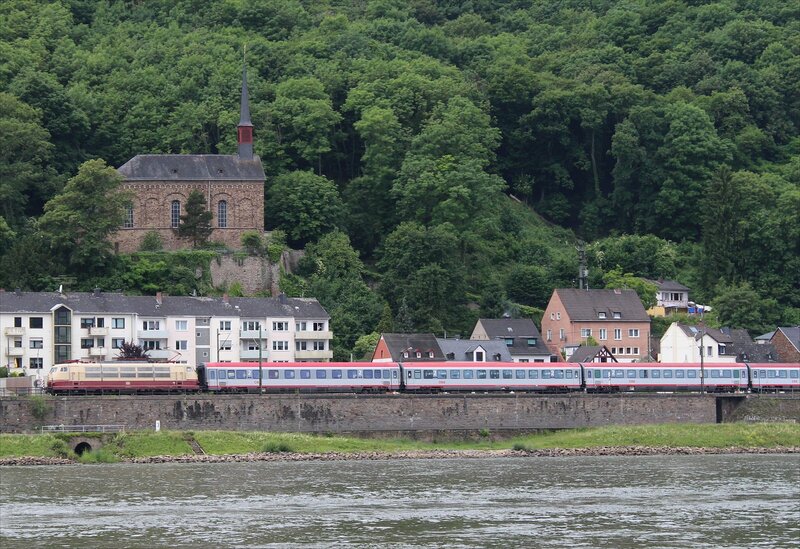 On our trip we saw 103 113-7 running through Oberwesel one evening whilst en route from Stuttgart Hbf to Münster (Westfalen) Hbf and passing Schloss Stolzenfels on the way back the next morning. It was marvellous to see once again and I am sure my younger self would have given a vote of approval.